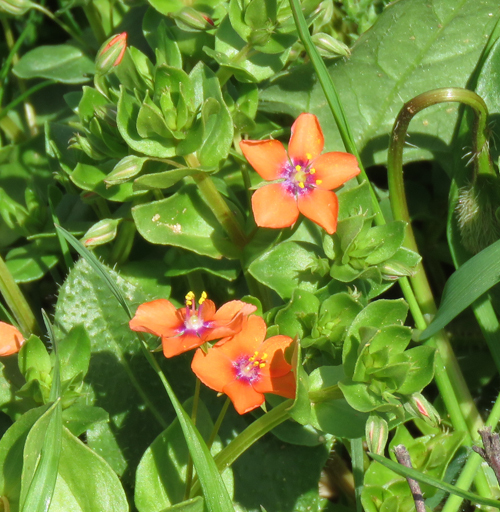 The common Red form of Scarlet Pimpernel. 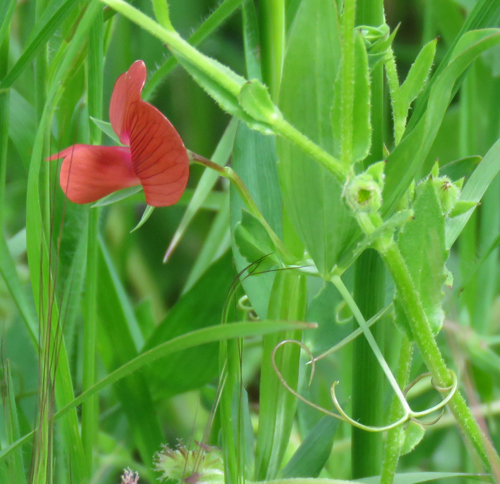 Red and blue forms growing together. 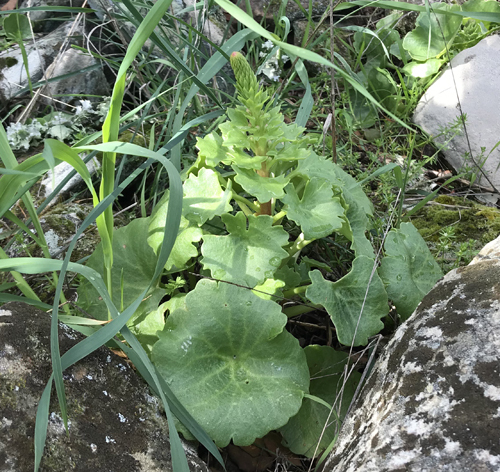 The English common name used here is based on one of the many Portuguese common names, Alface dos calcários, which means Limestone Lettuce. 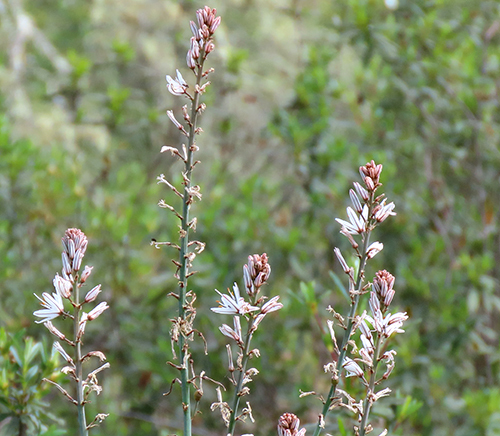 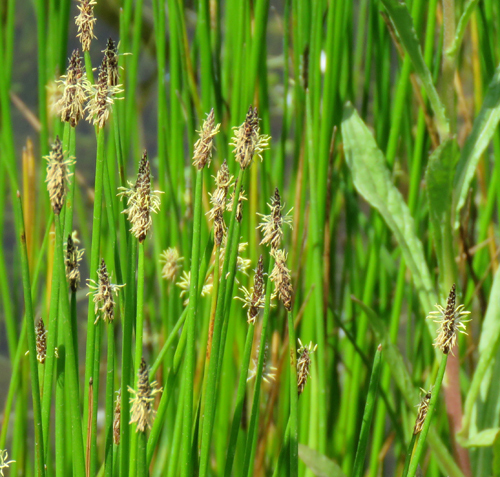 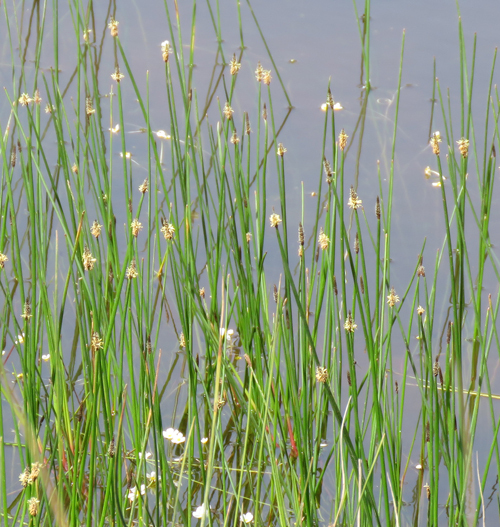 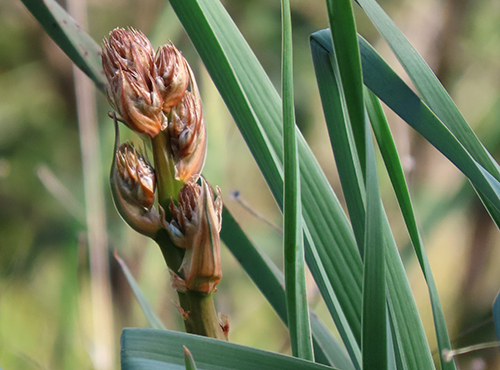 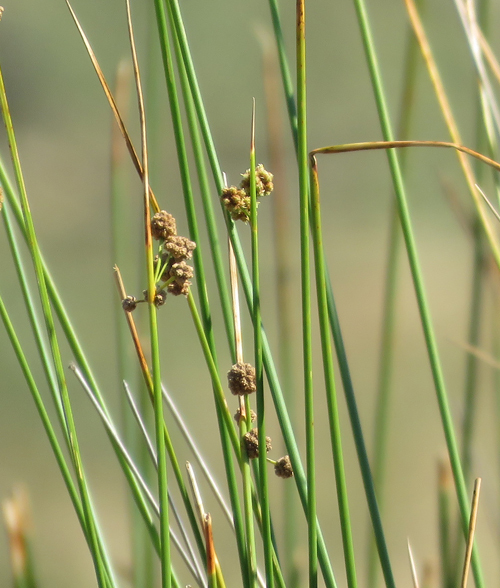 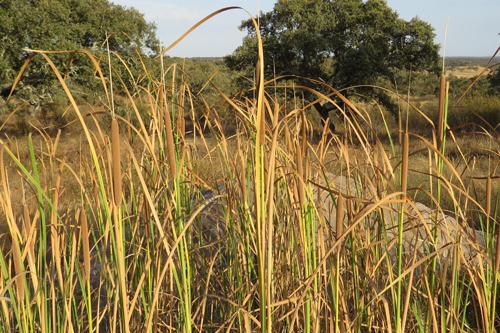 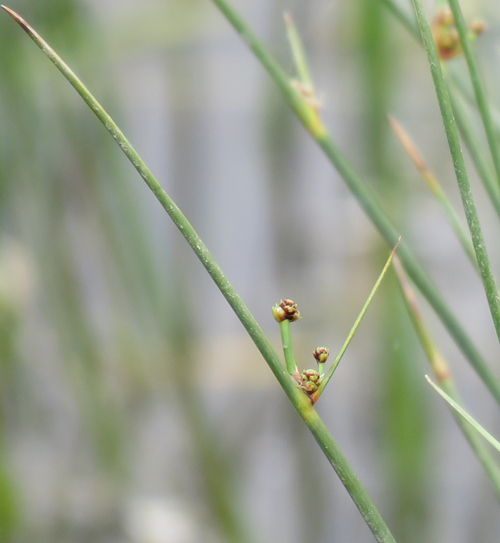 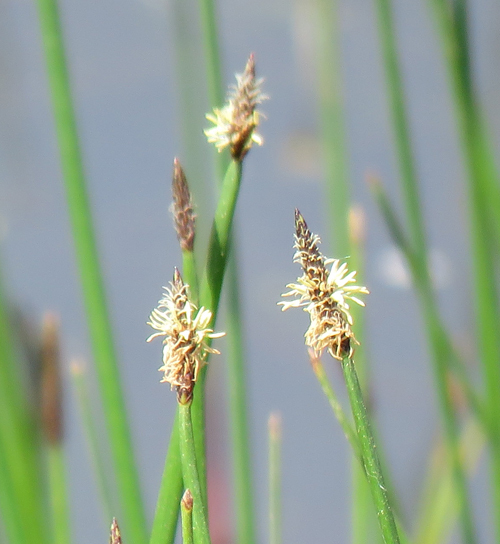 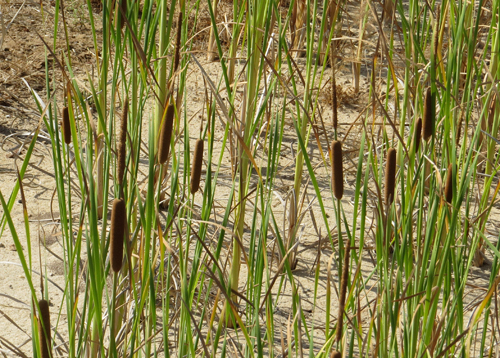 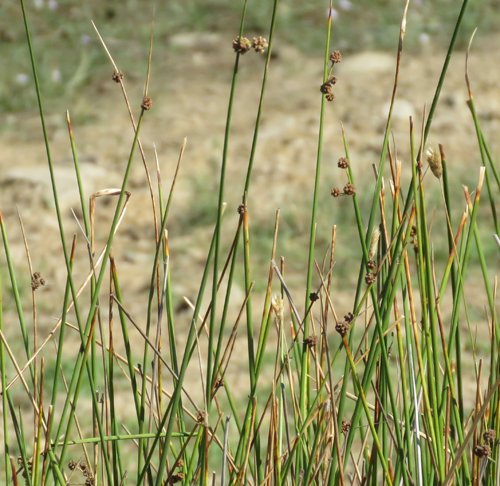 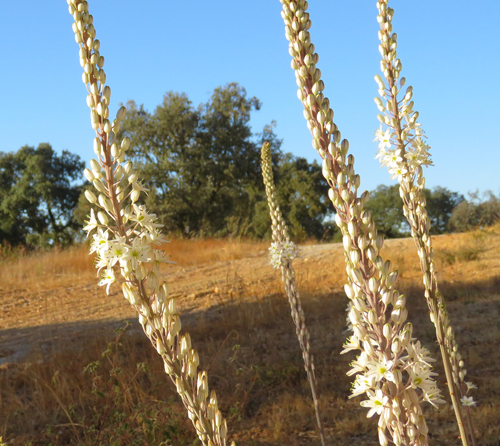 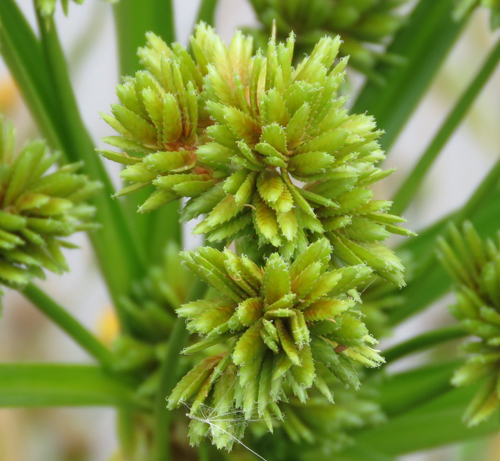 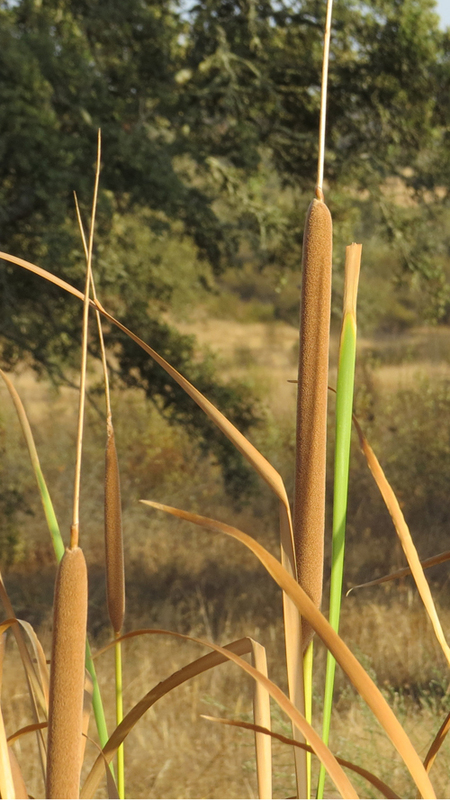 The Giant reed is an exotic species that has been introduced to Portugal. 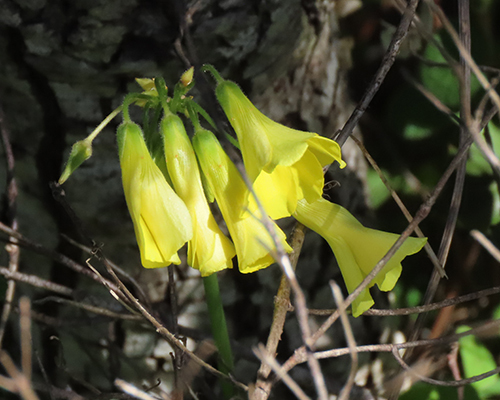 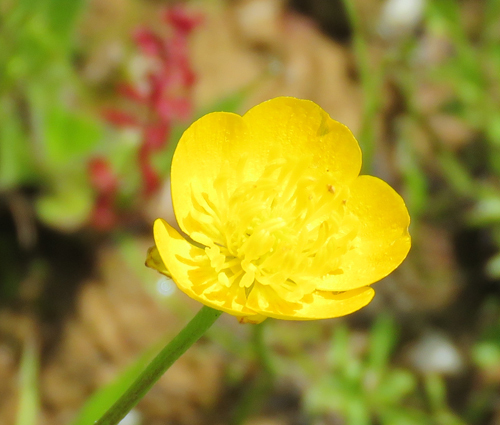 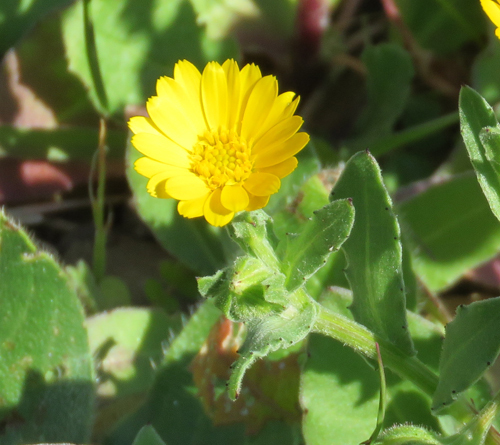 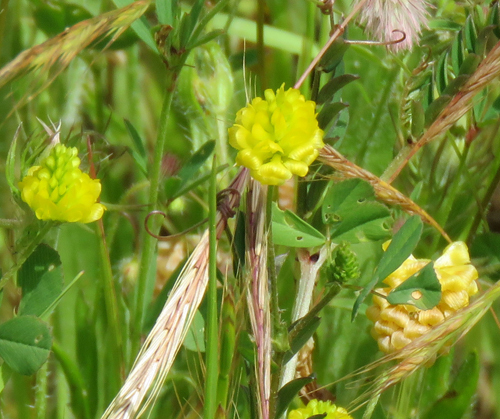 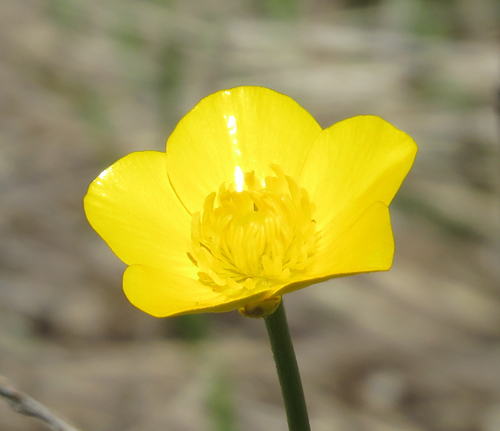 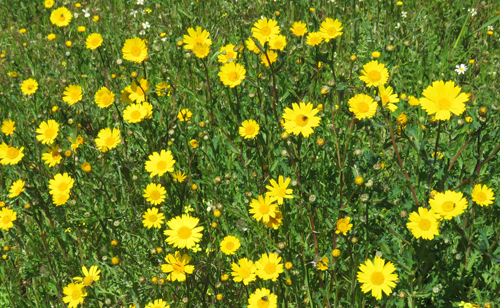 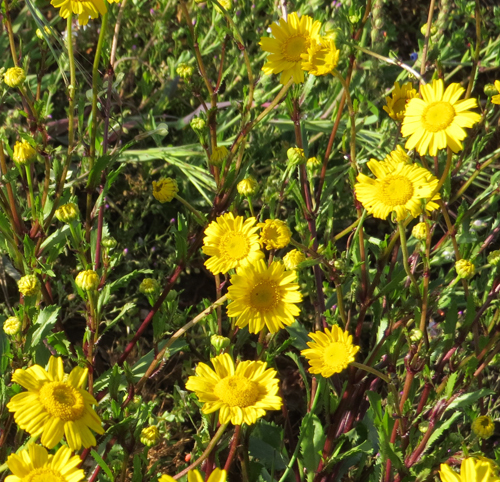 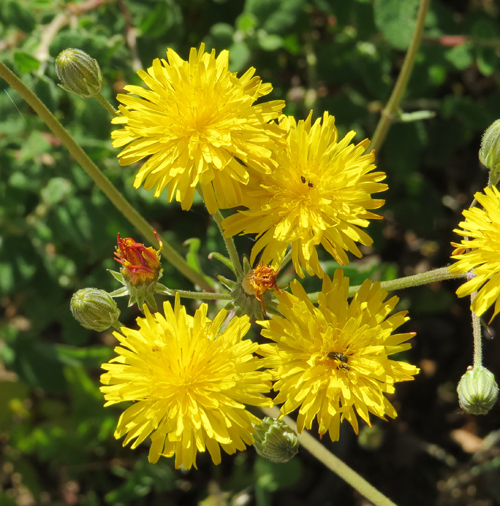 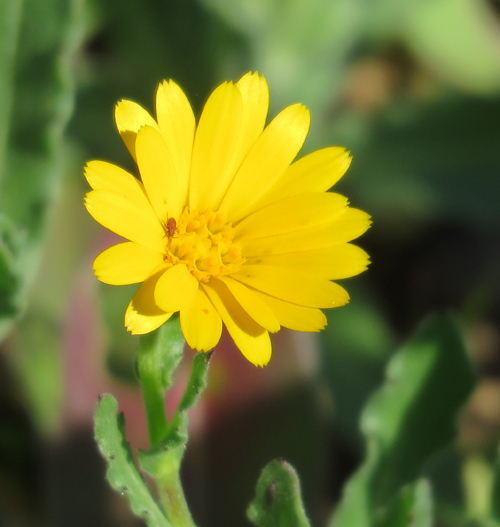 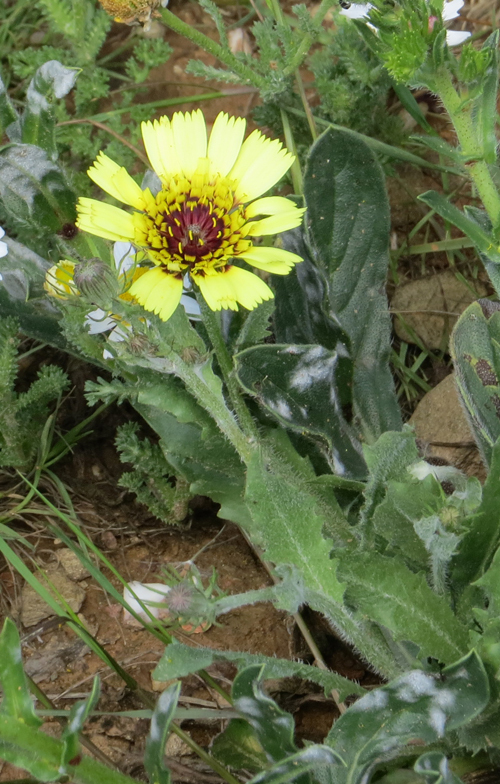 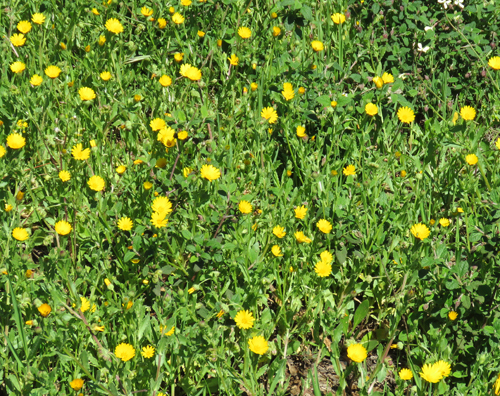 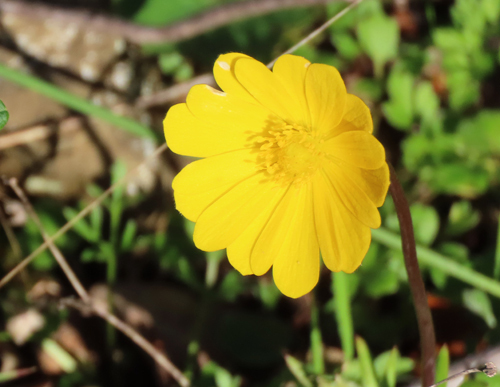 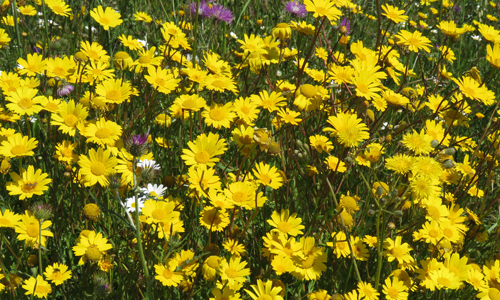 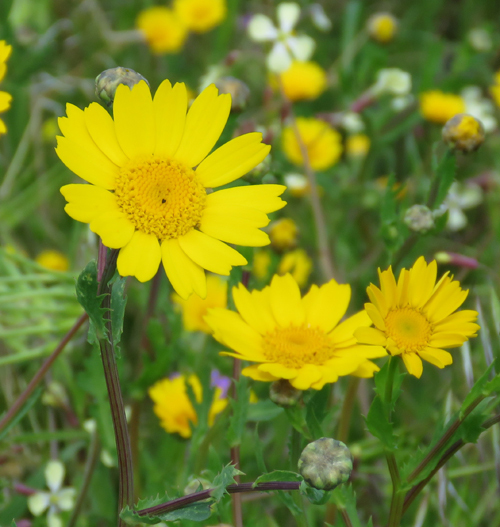 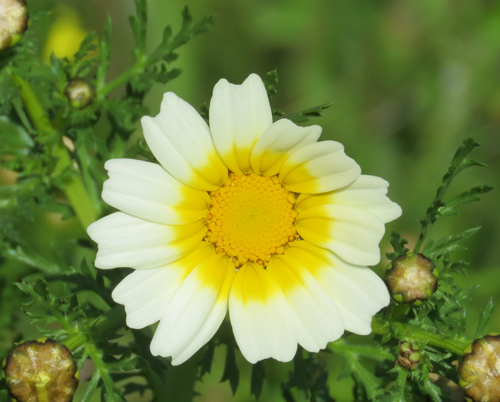 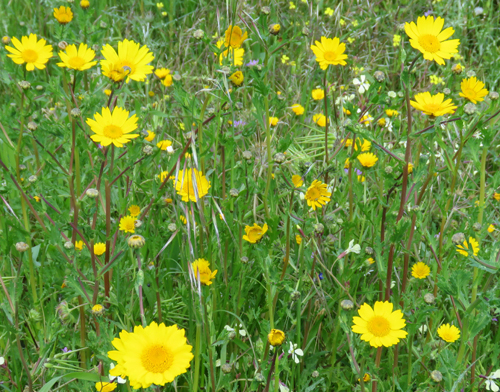 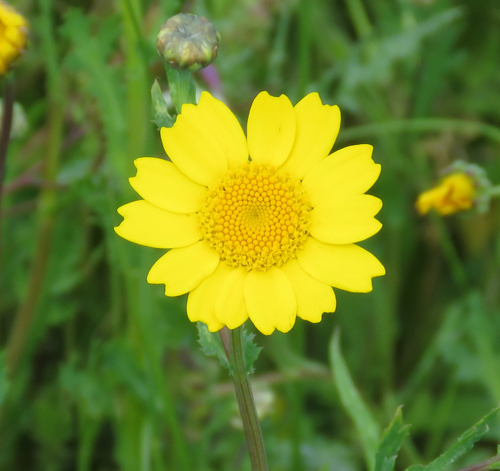 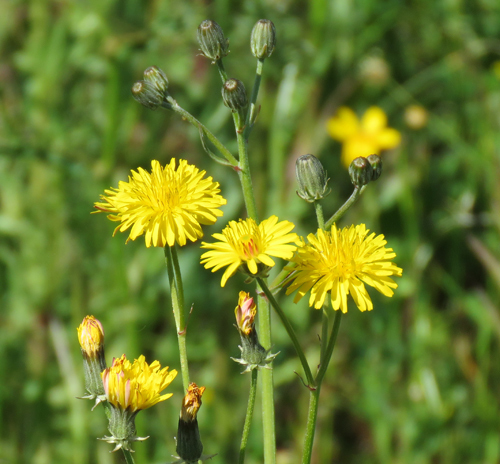 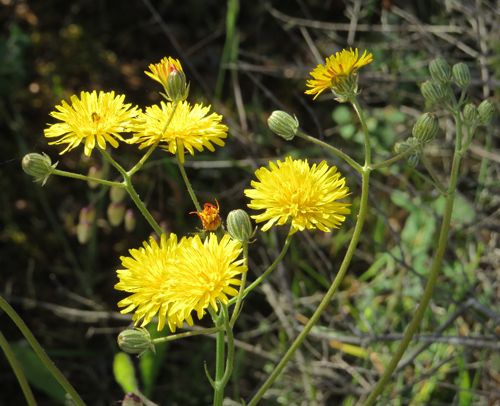 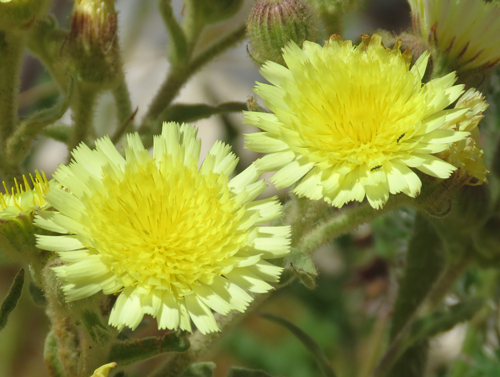 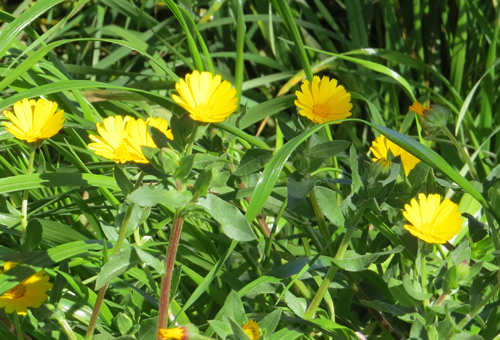 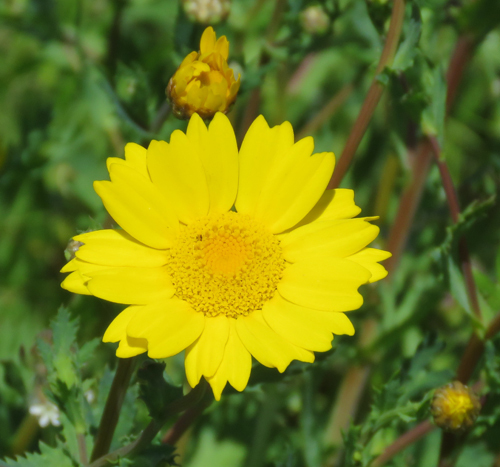 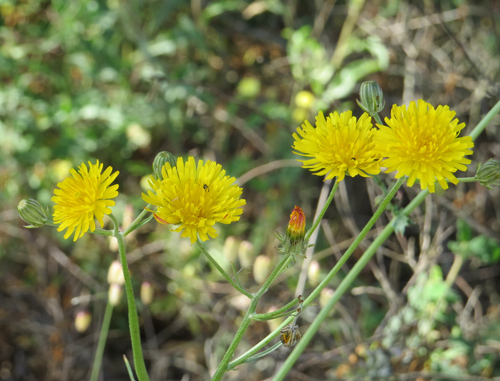 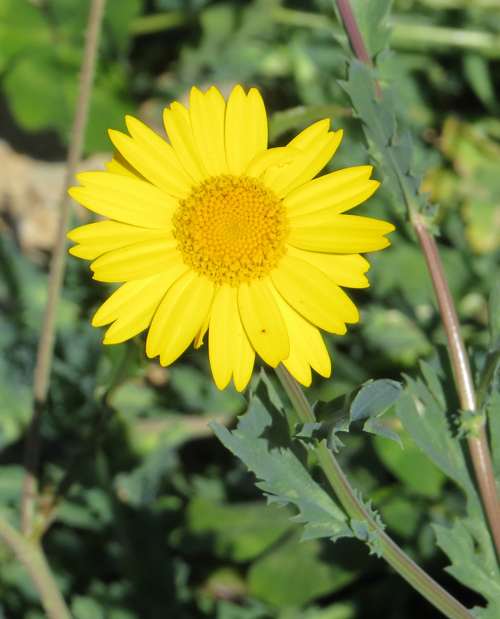 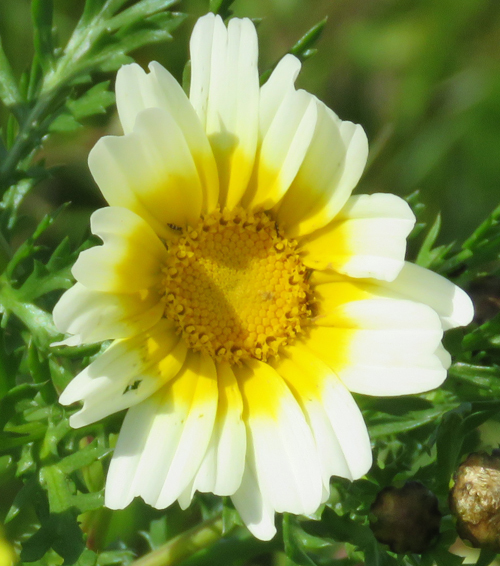 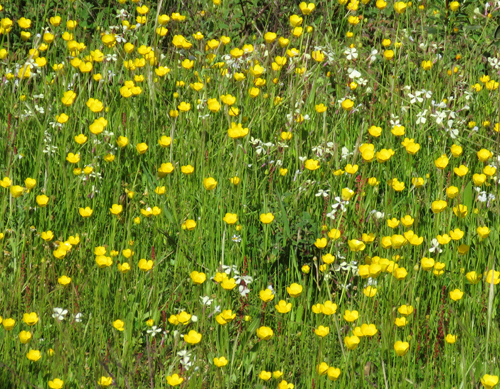 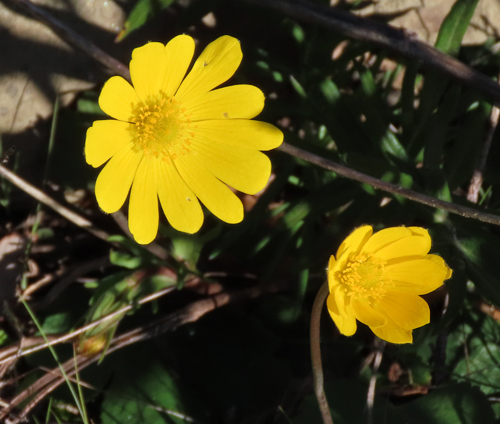 The flowers can also be yellow. 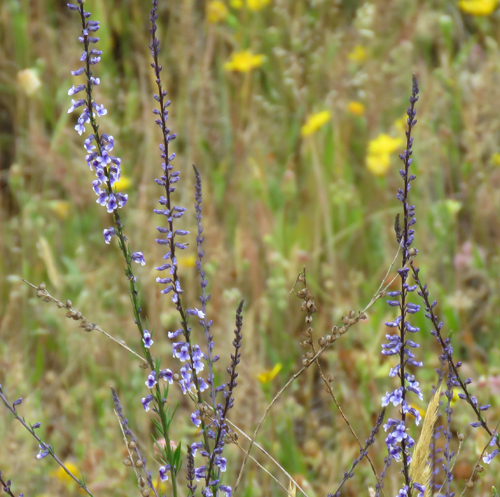 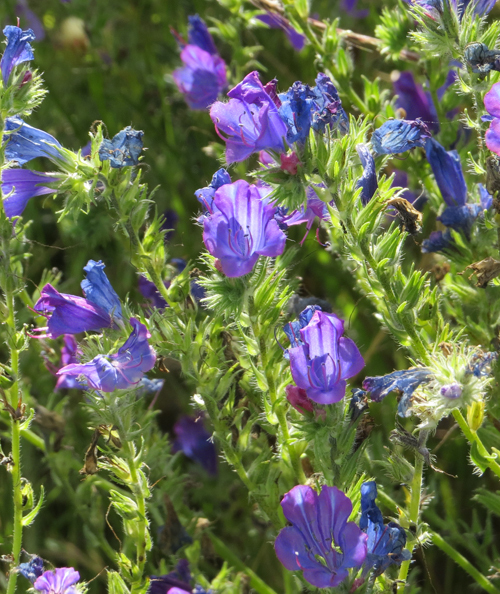 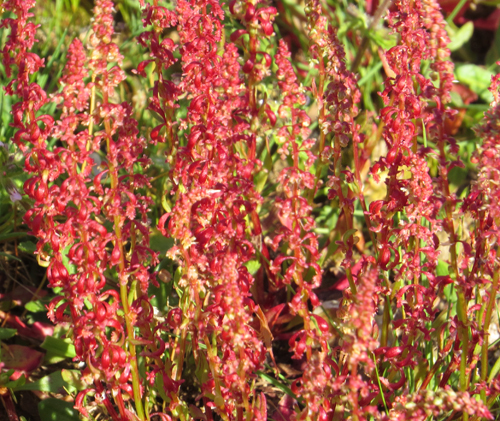 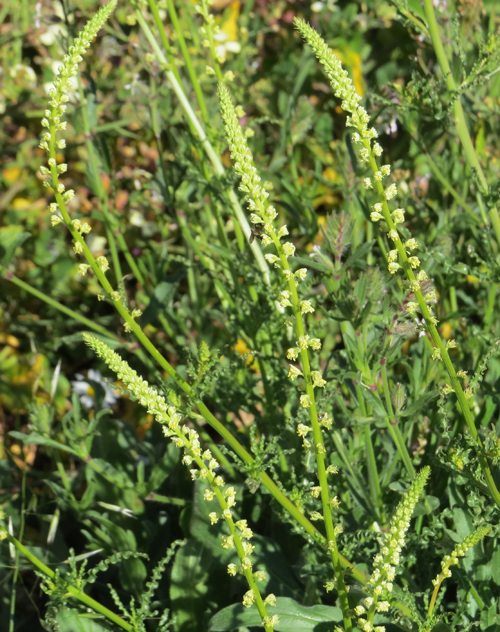 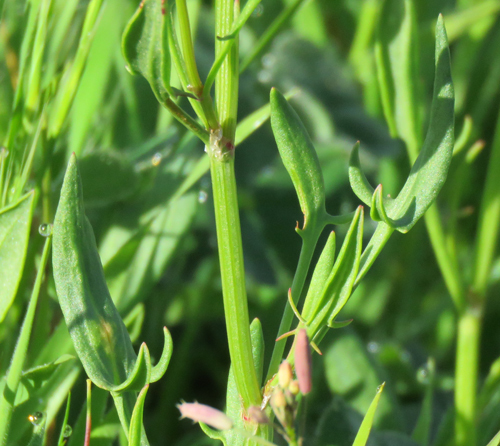 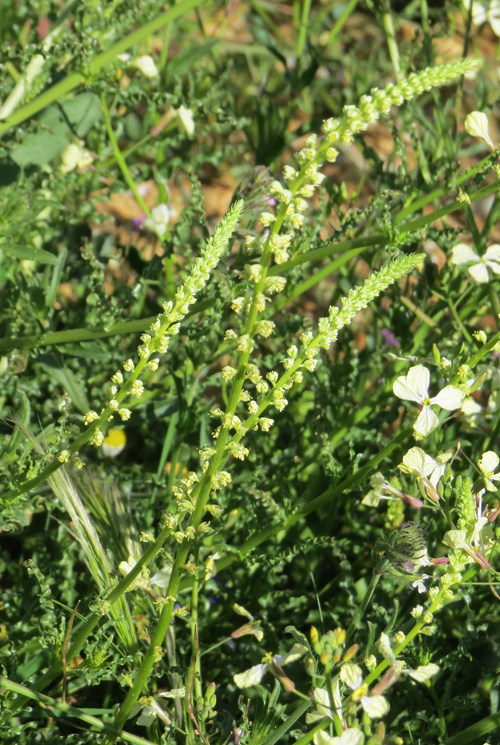 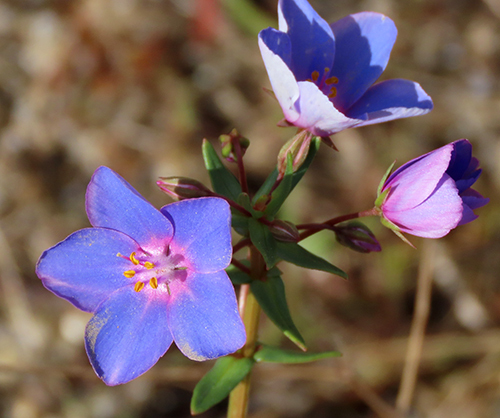 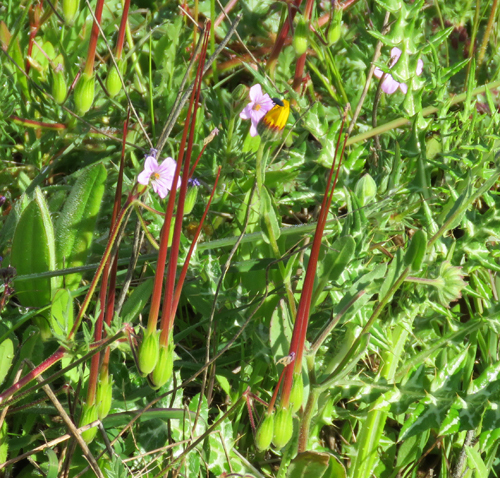 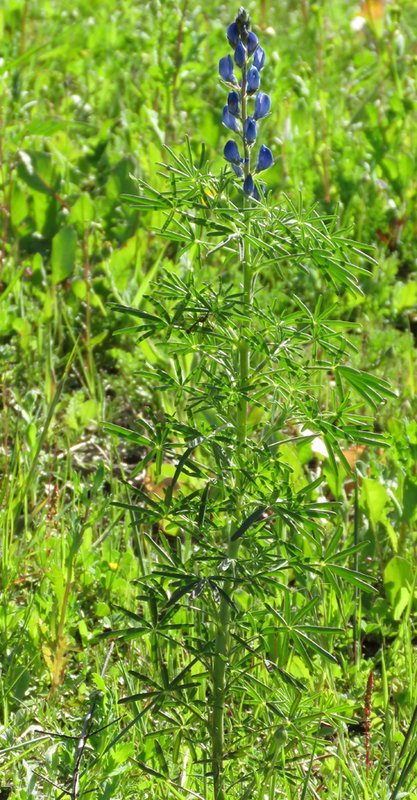 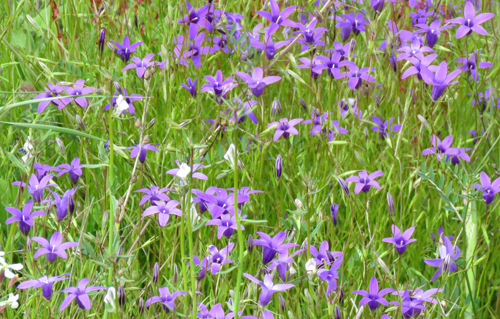 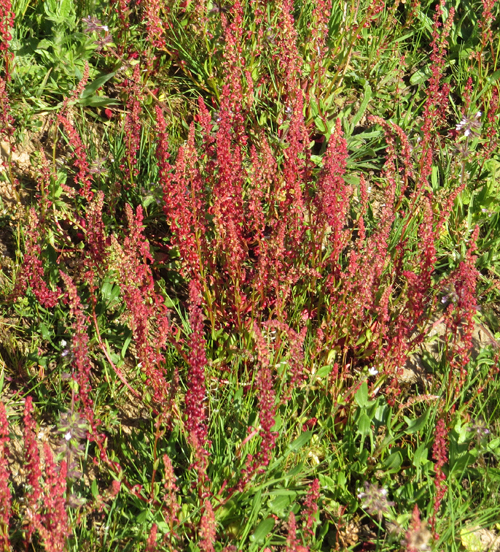 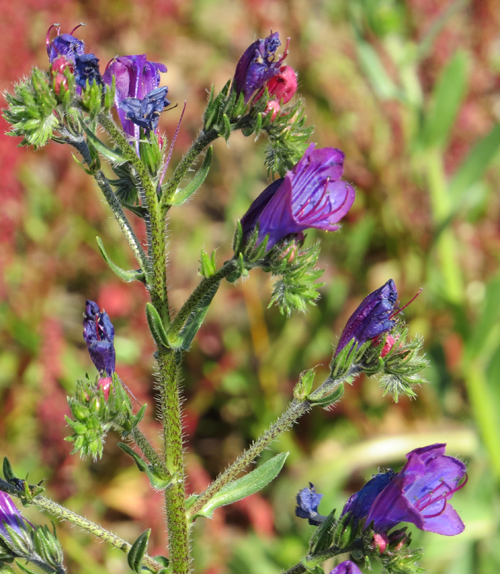 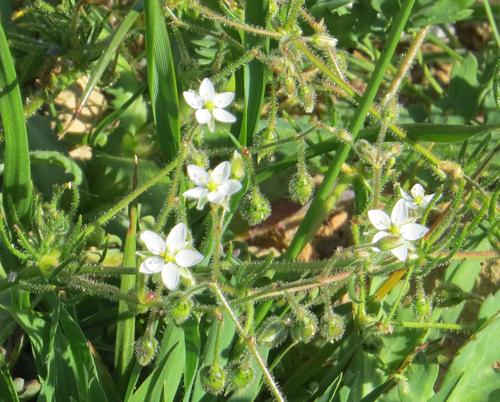 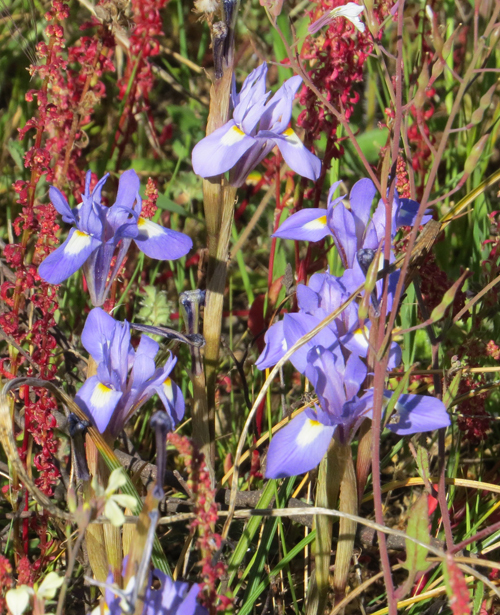 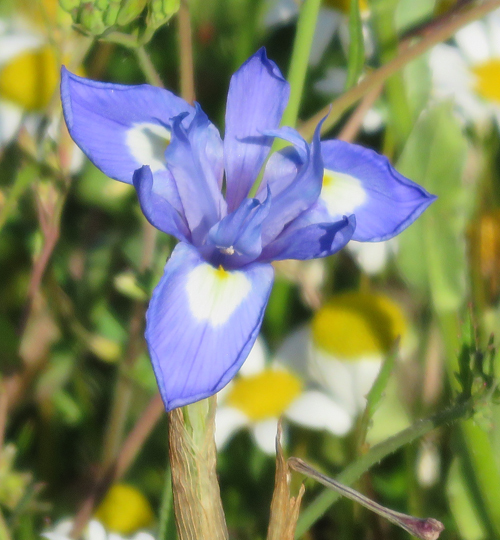 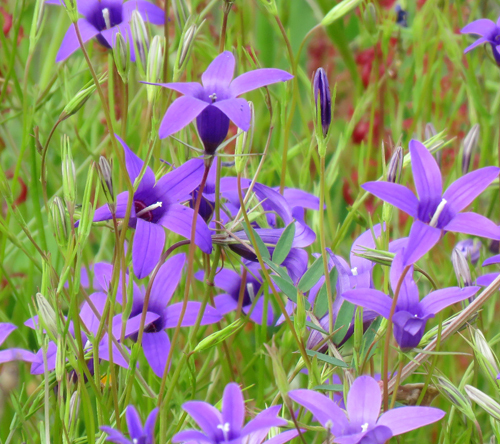 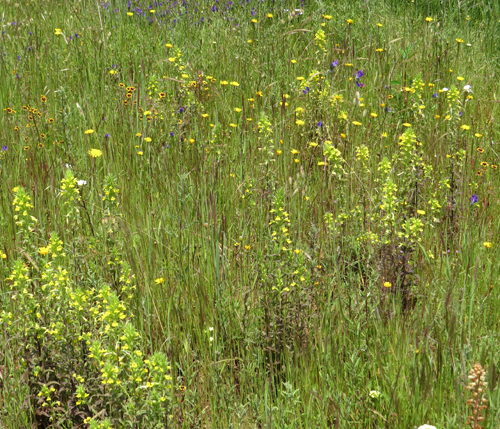 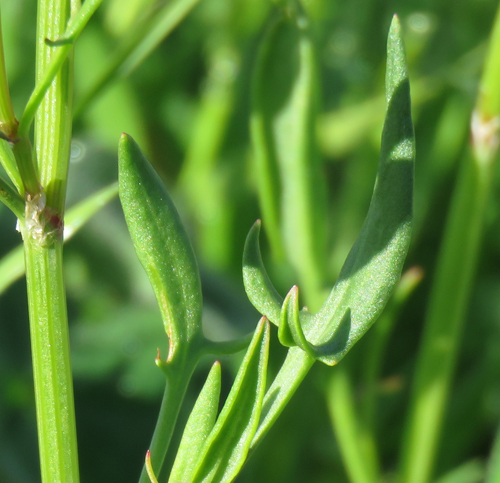 Mediterranean Linseed is a semi-parasitic plant. 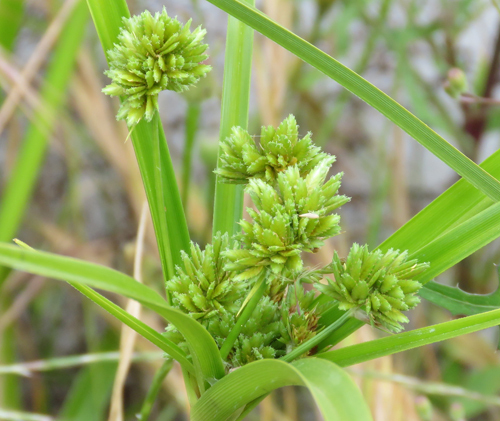 It can obtain water nutrients from the roots of other species of plant, especially various grasses. 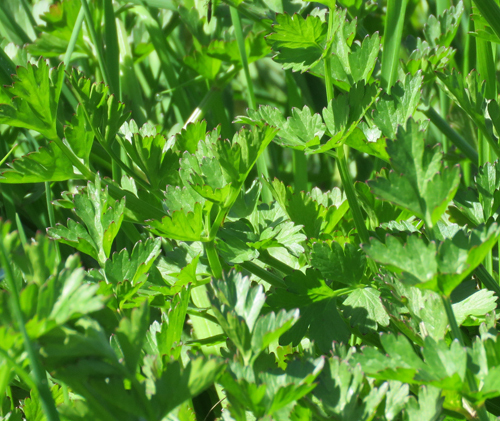 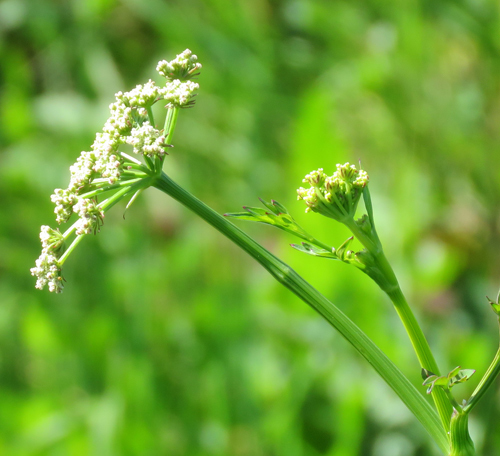 As it is a green plant with chlorophyll, it is also able to make its own food using photosynthesis. 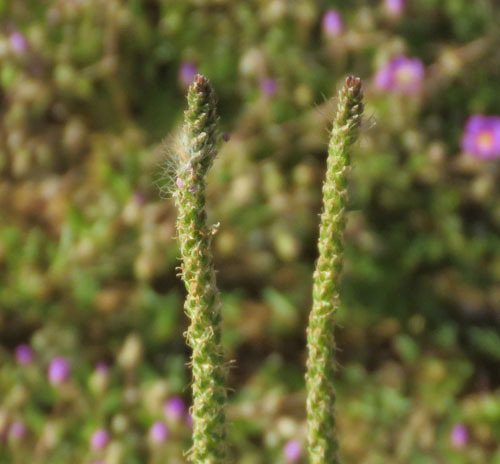 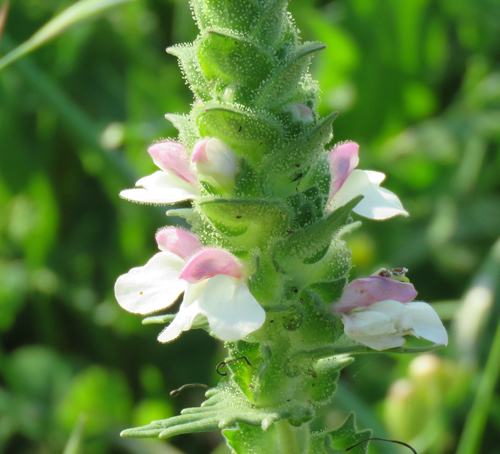 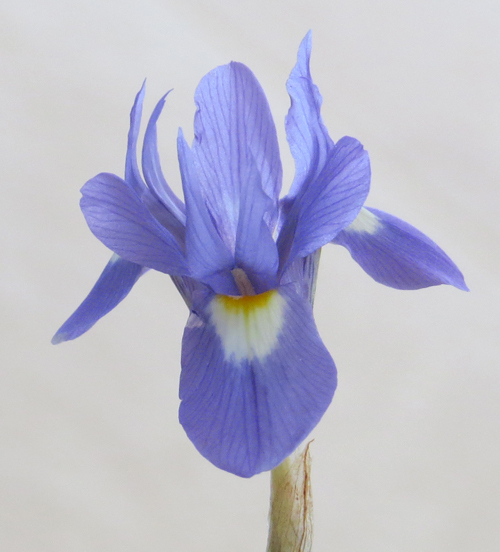 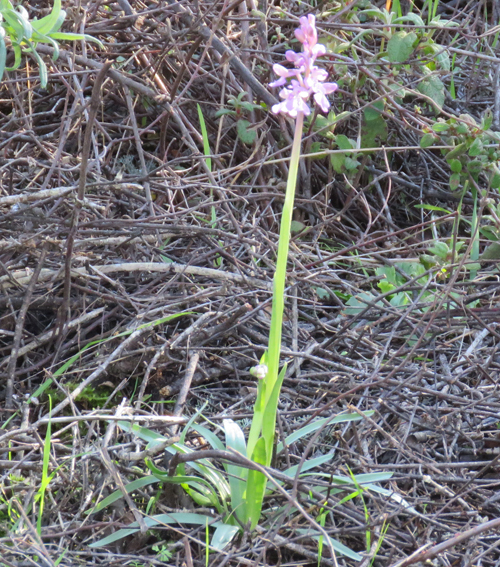 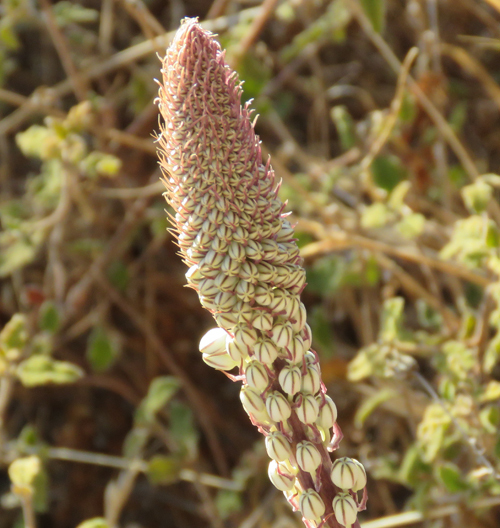 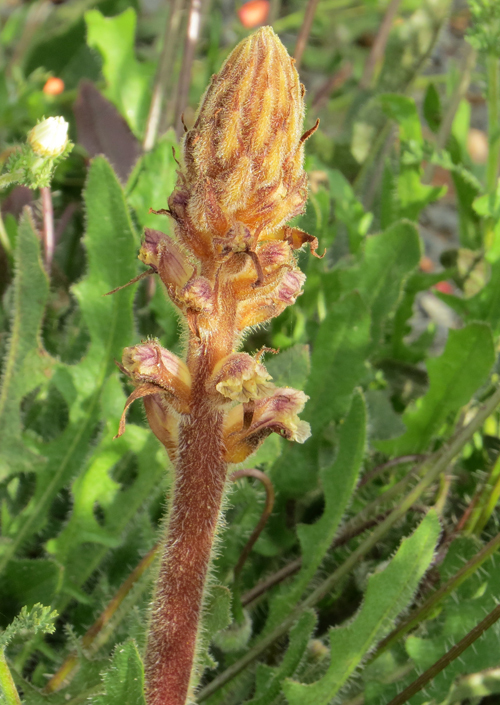 It is a member of the broomrape family. 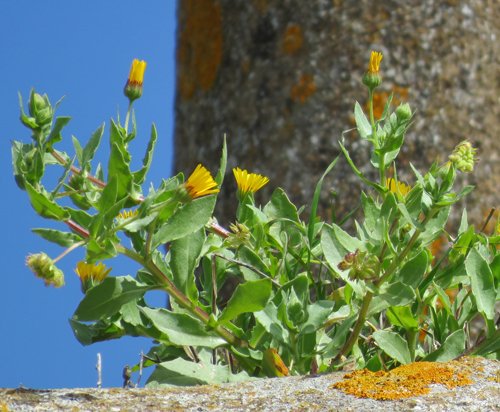 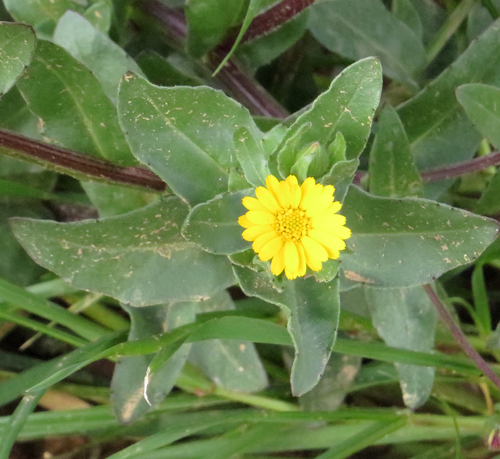 Field Marigold growing on top of Windmill Ruin. 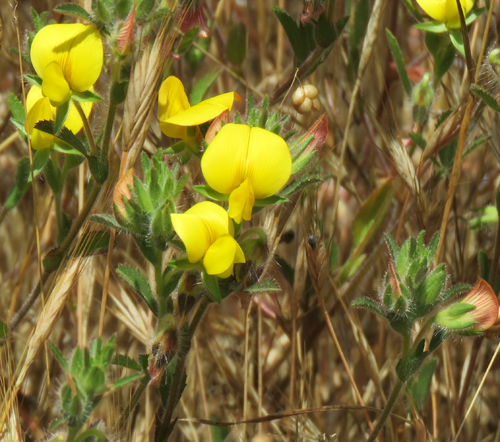 This is an exotic species that was introduced to Portugal. 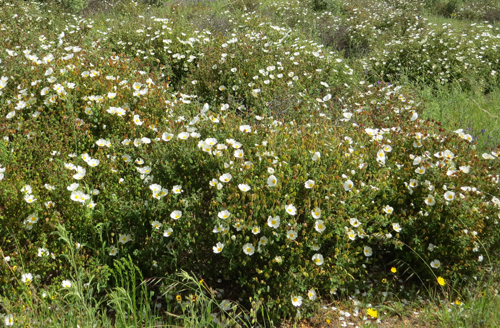 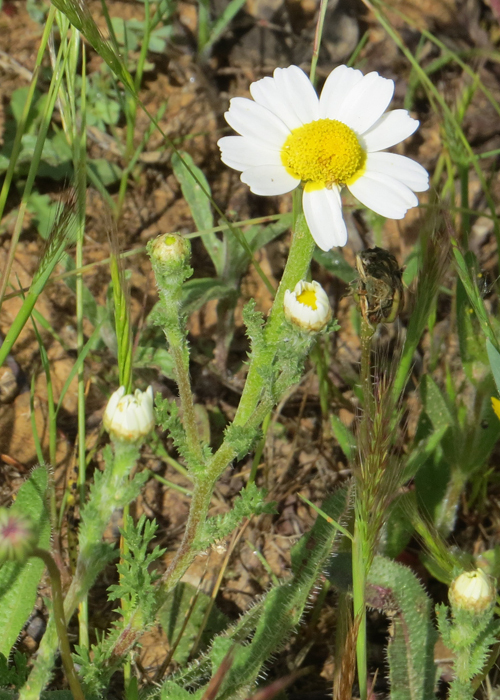 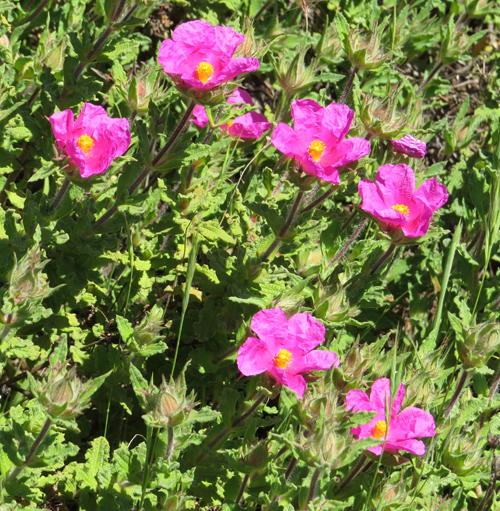 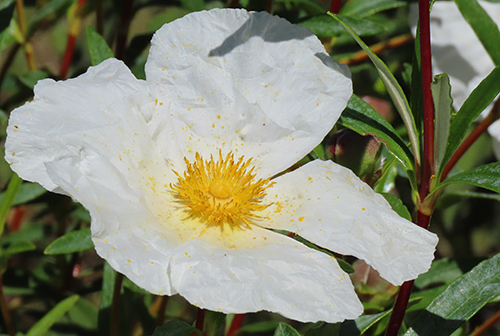 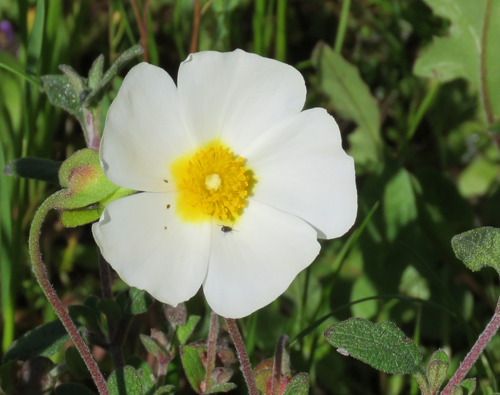 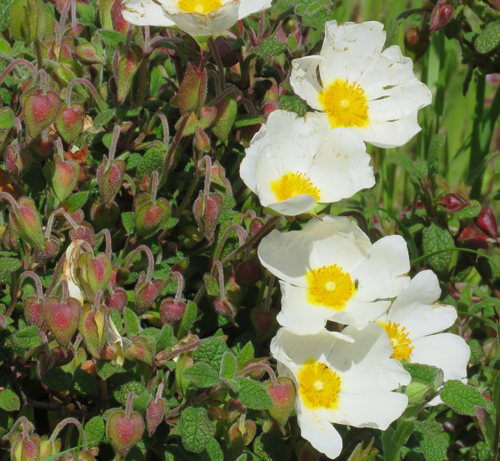 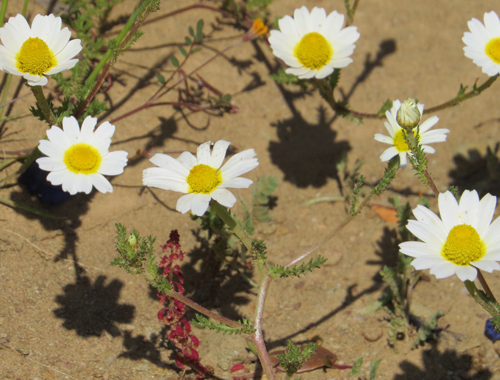 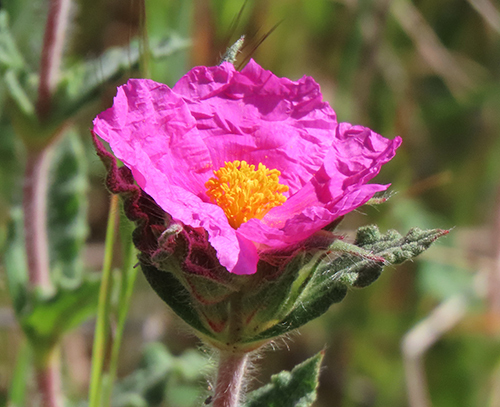 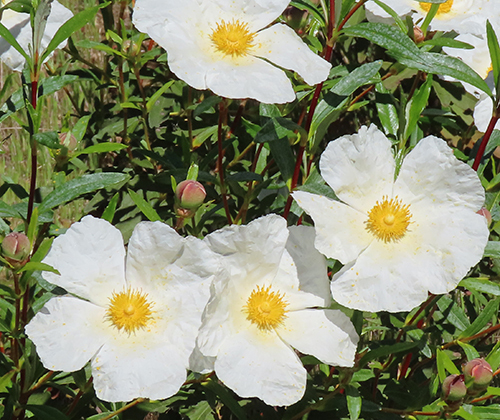 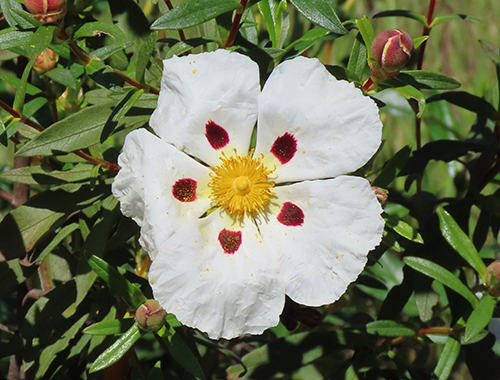 A few Gum Cistus plants on the reserve lack the crimson spots at the base of the petals that the majority of the Gum Cistus flowers have. 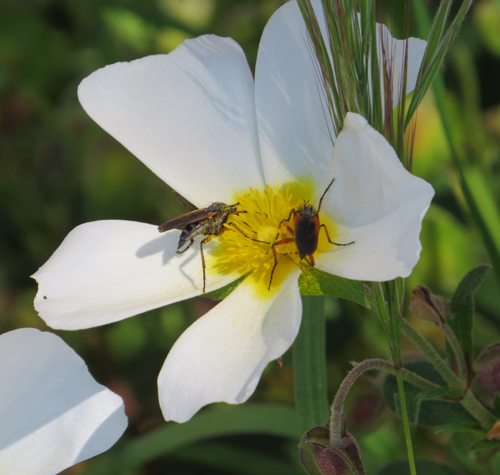 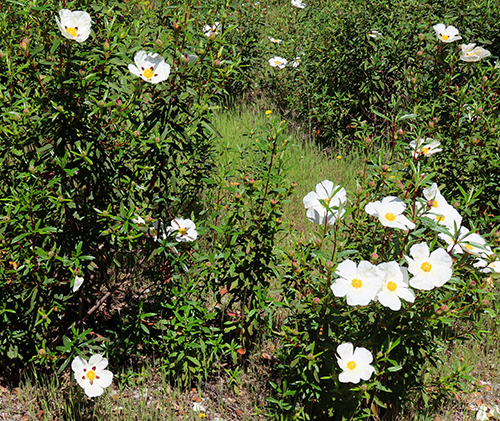 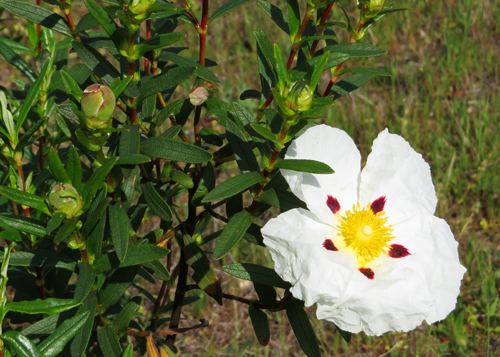 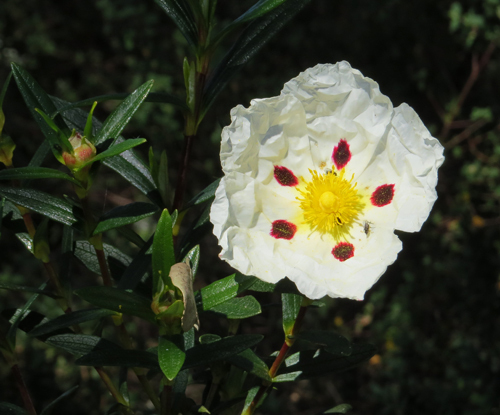 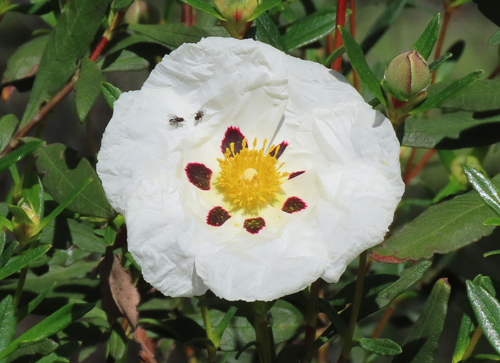 A crimson-sptted Gum Cistus growing next to an all white Gum Cistus. 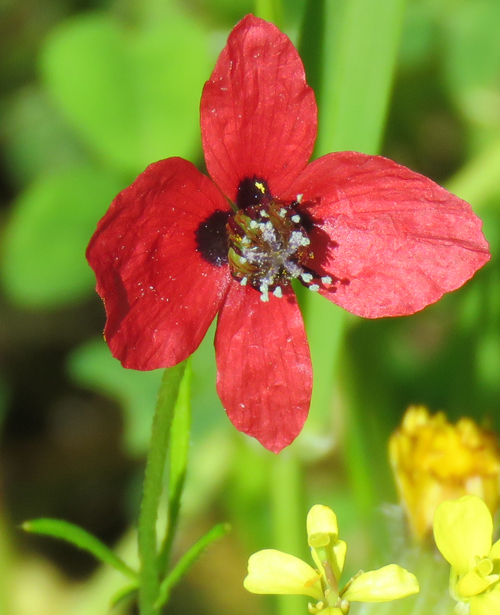 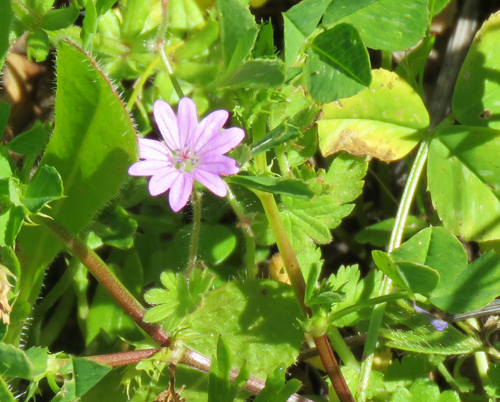 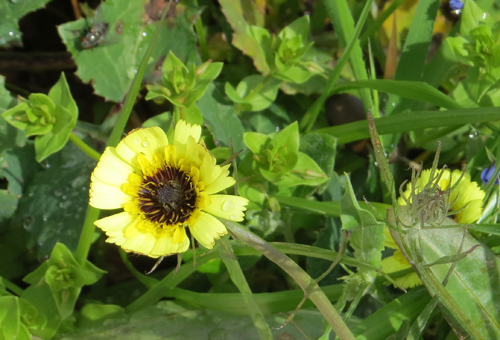 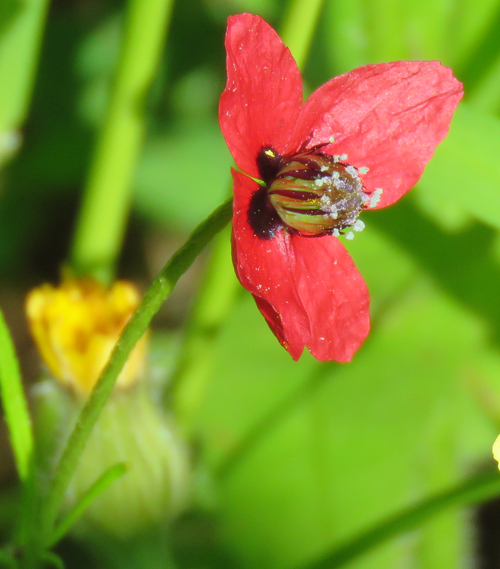 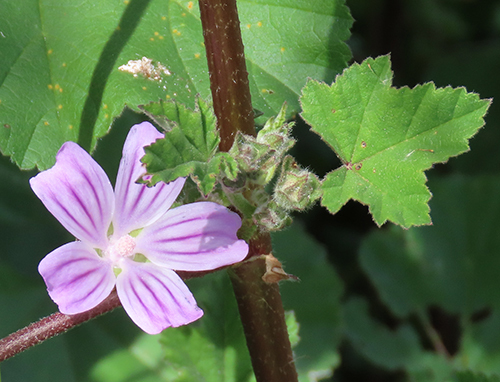 Note the Red Velvet Mite on the flower. 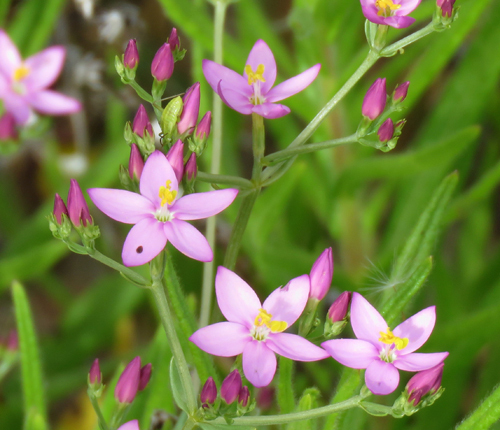 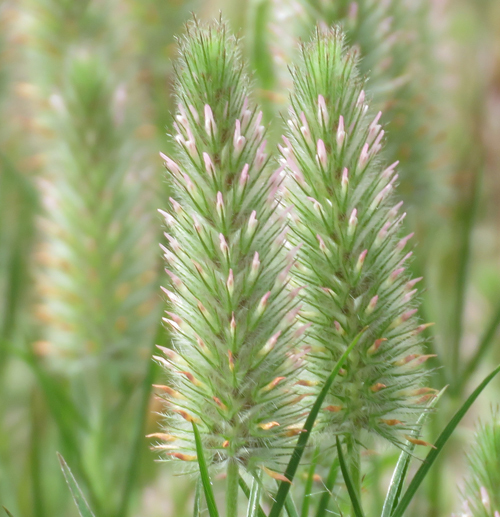 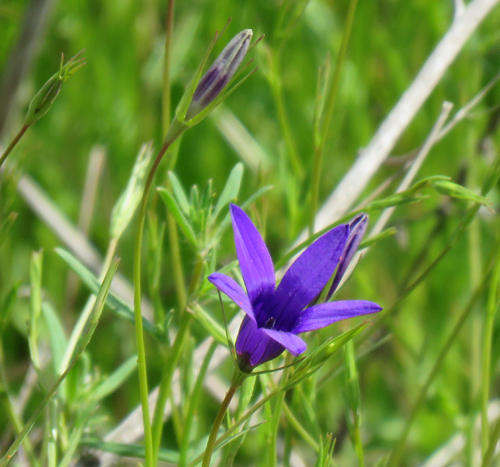 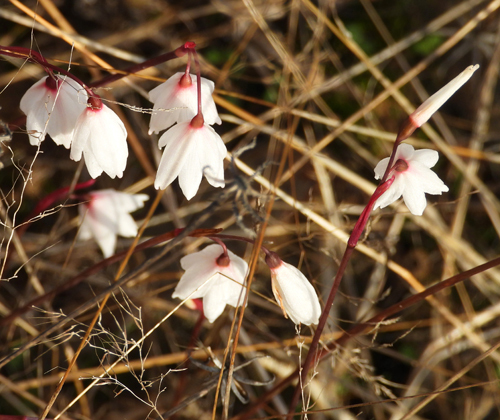 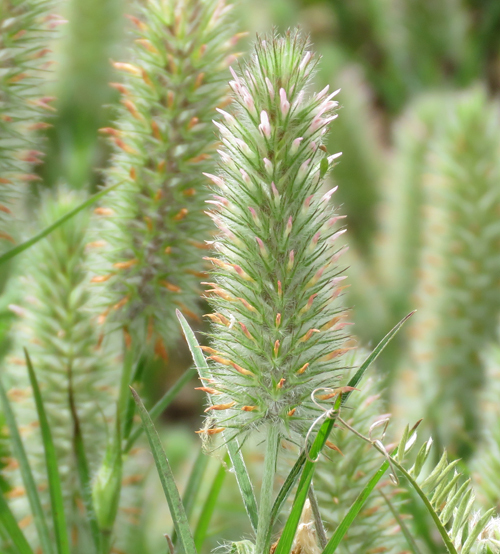 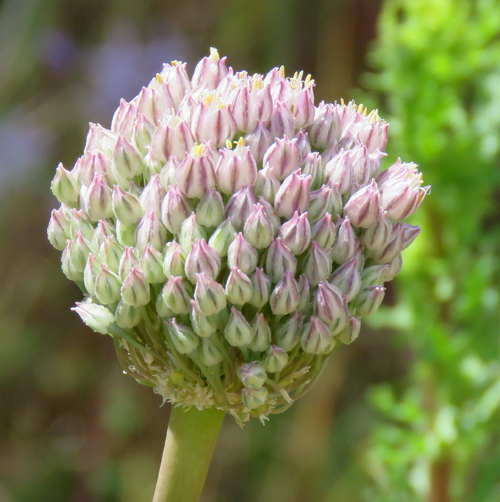 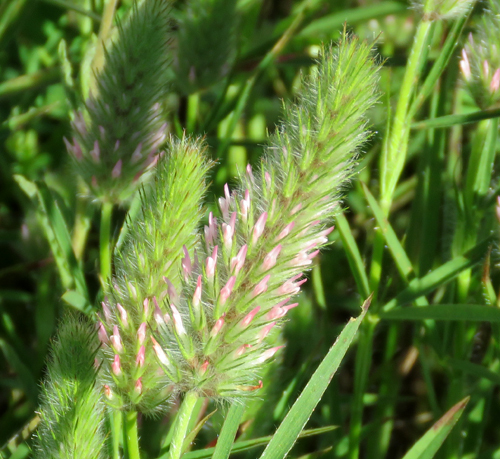 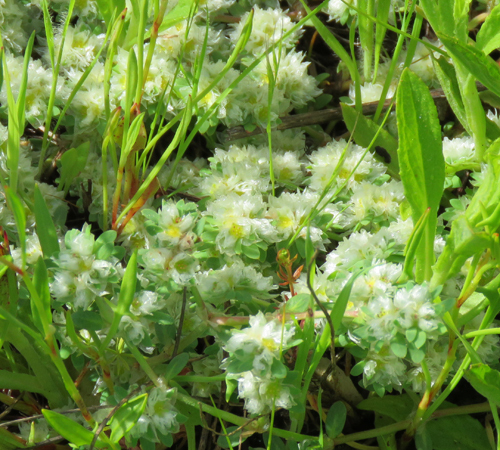 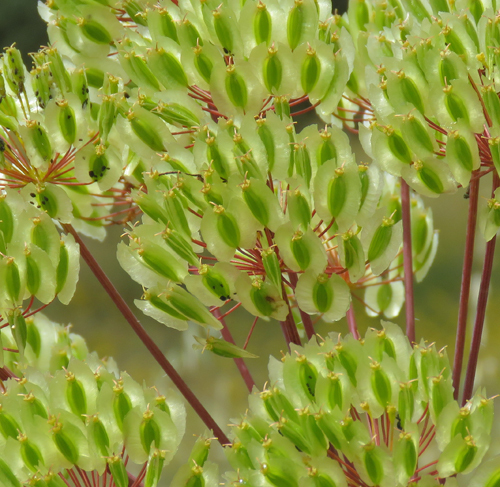 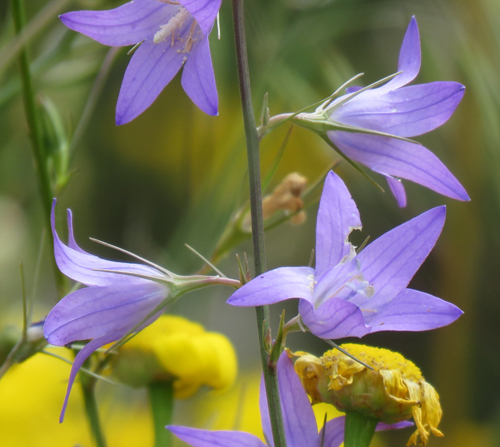 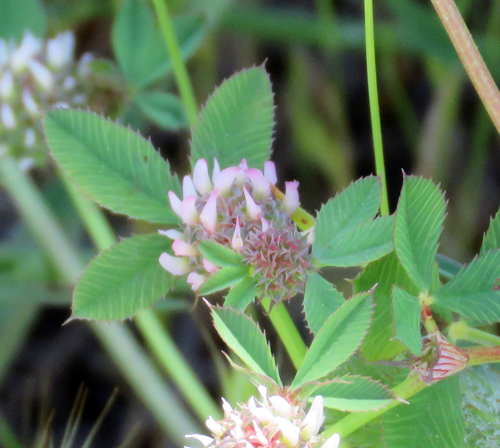 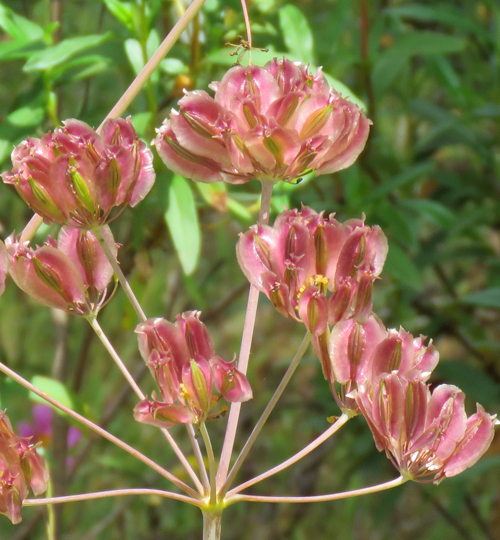 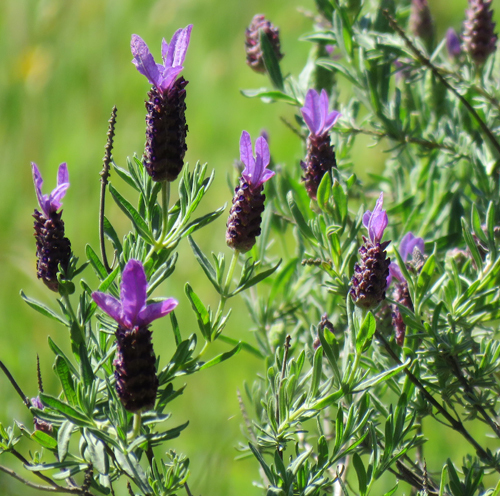 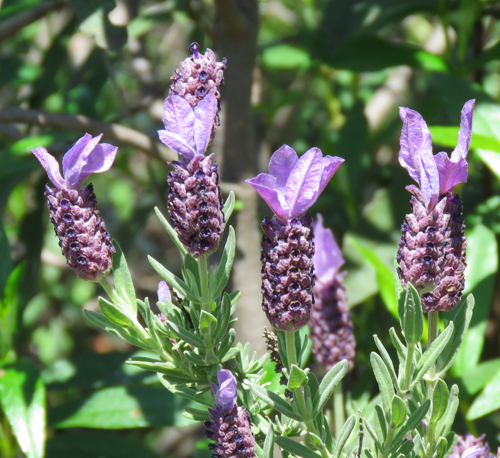 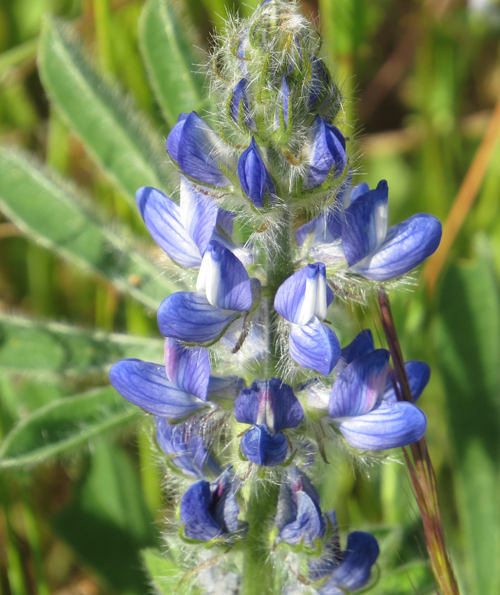 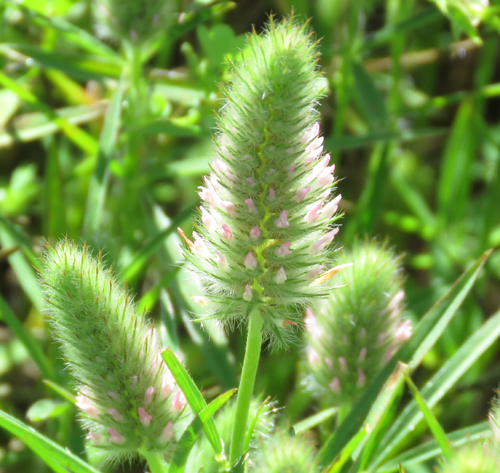 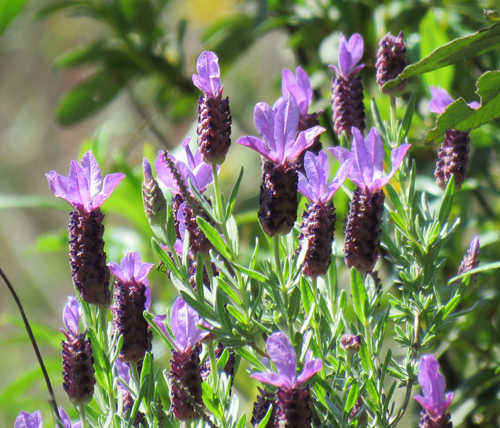 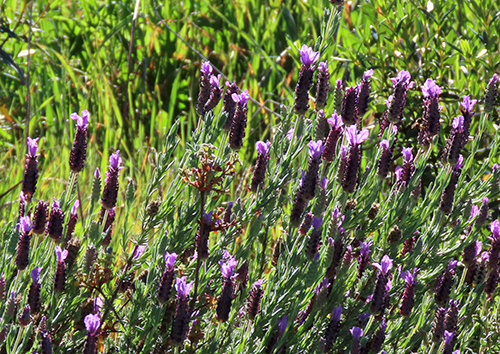 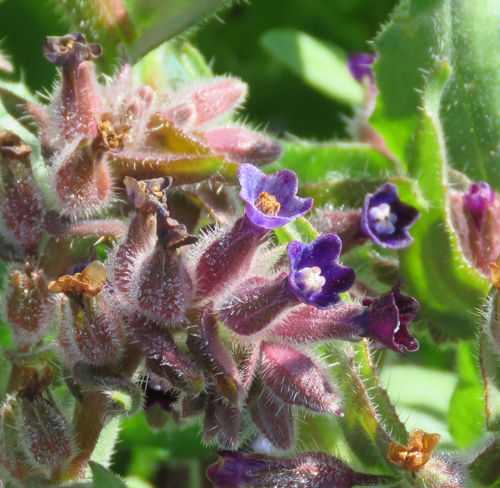 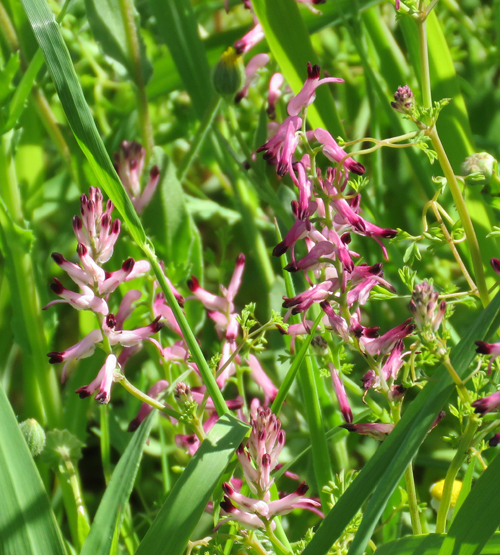 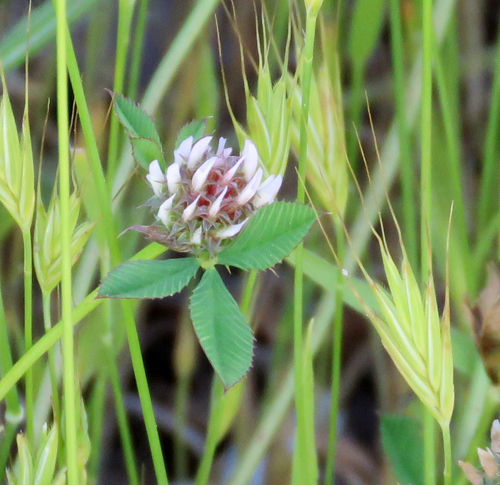 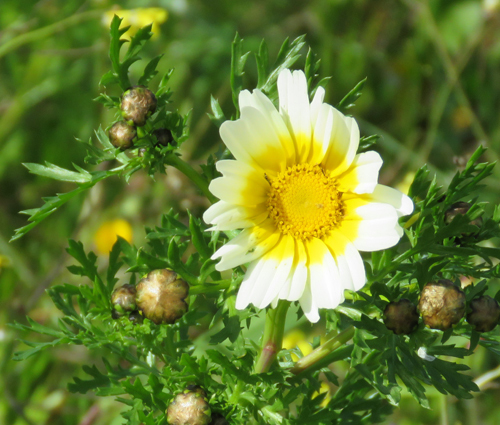 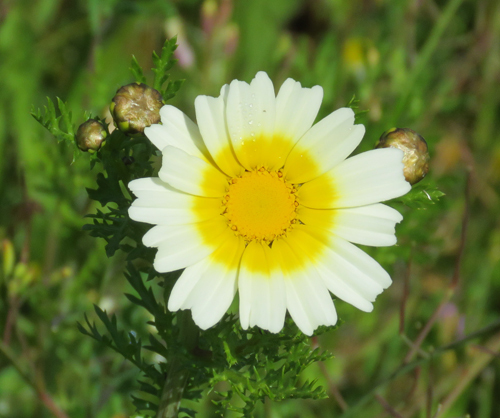 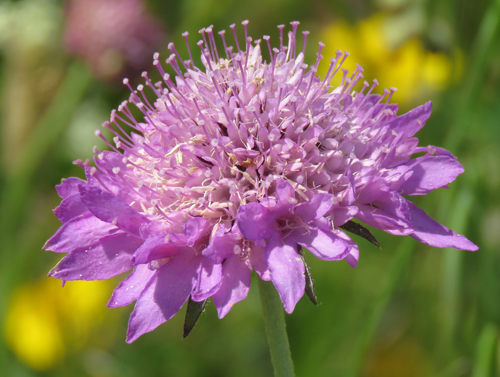 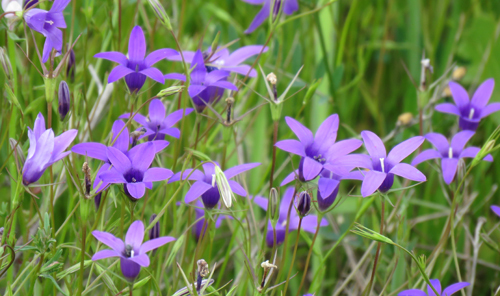 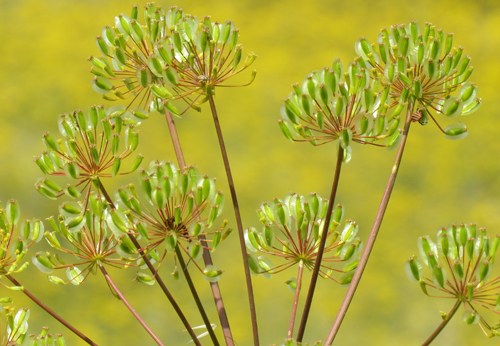 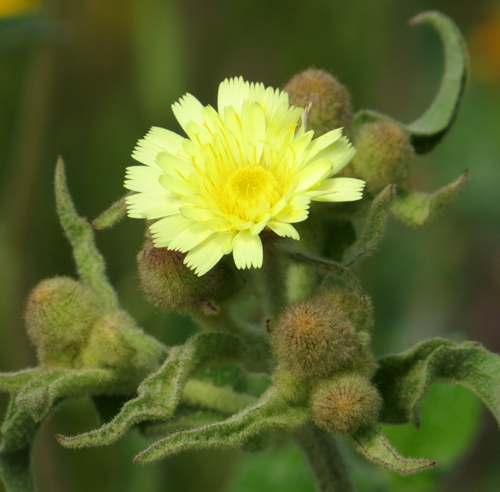 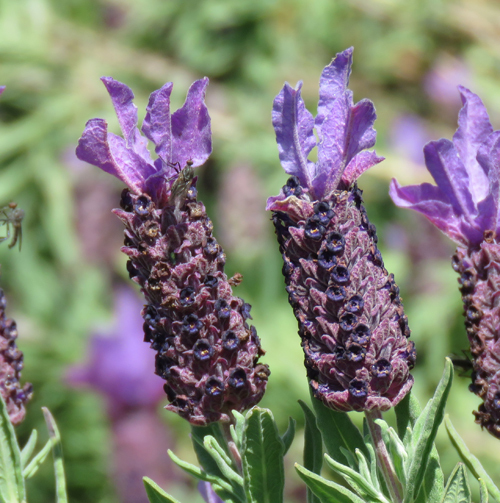 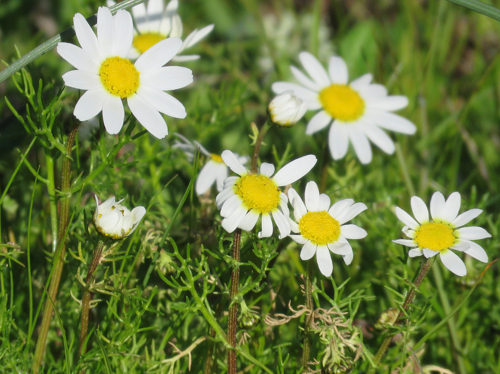 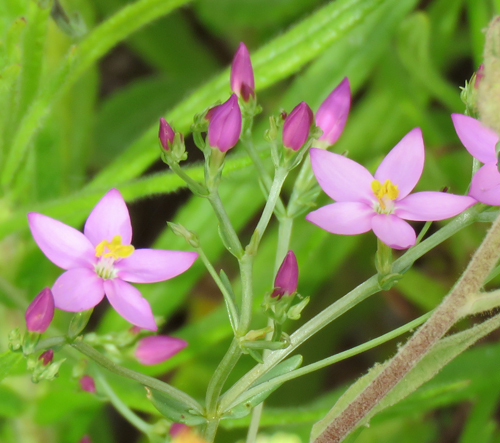 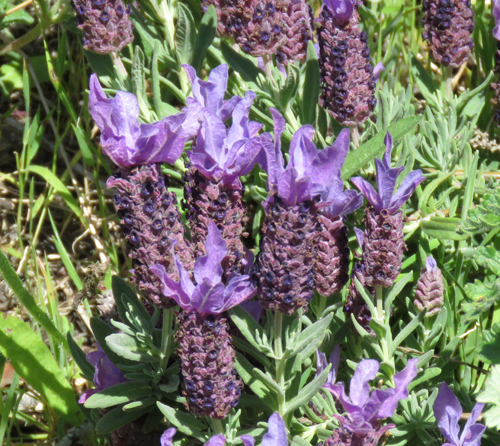 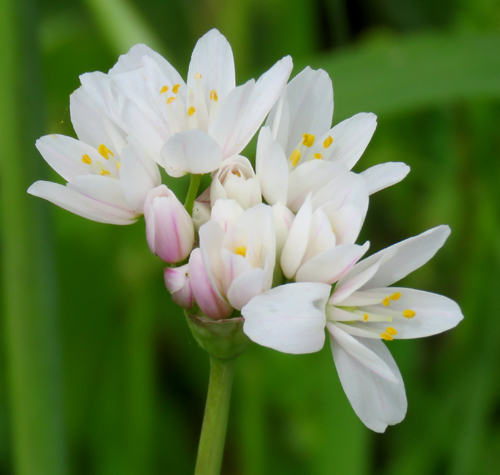 This plant, native to Europe and Asia, was introduced to America in around 1739. 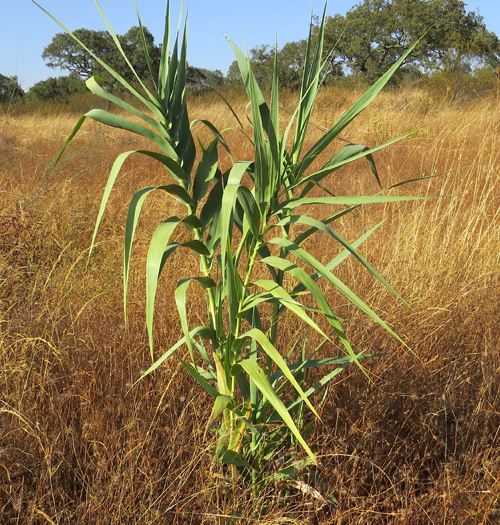 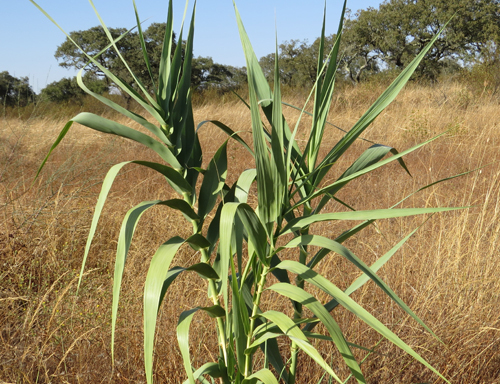 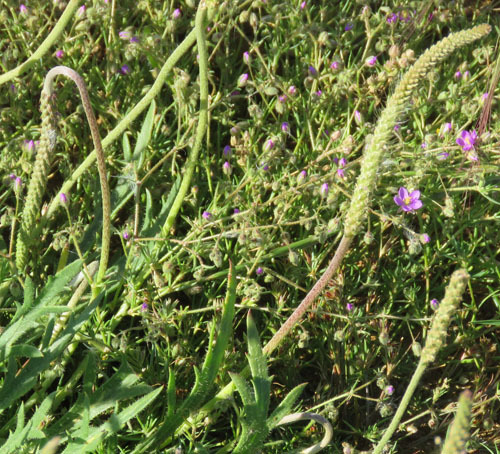 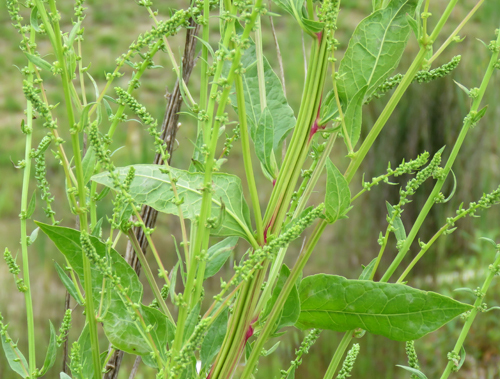 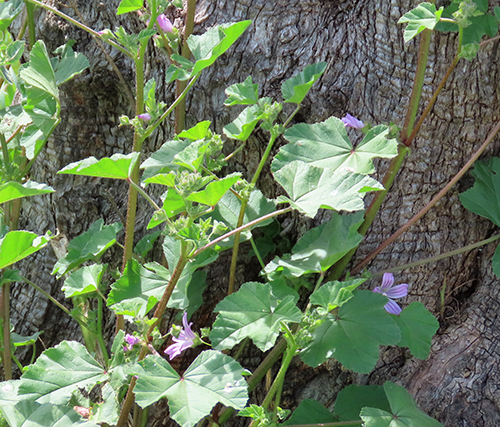 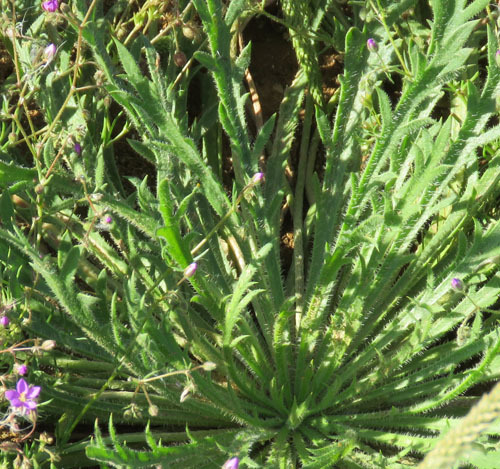 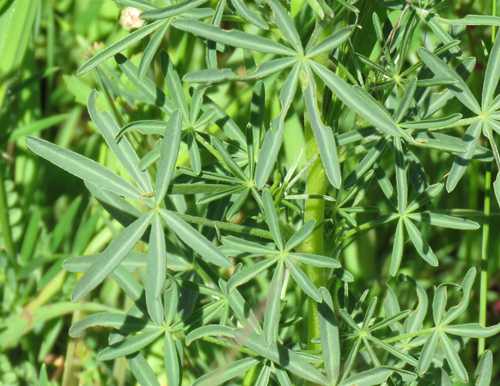 It has since become a significant alien invasive plant that causes substantial crop losses to farmers there. 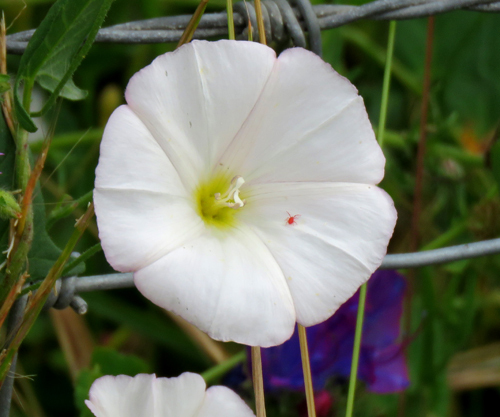 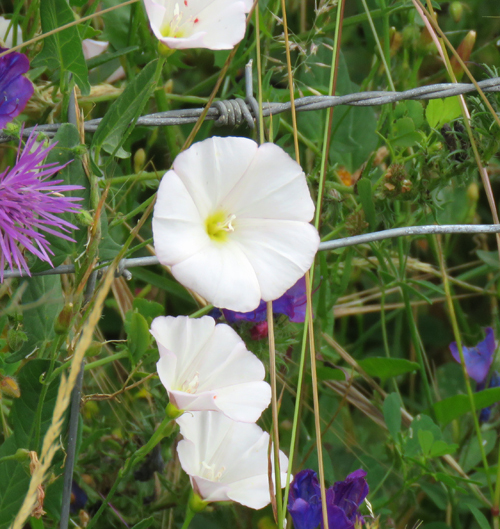 Also known as a Morning Glory it is a climbing or creeping herbaceous perennial. 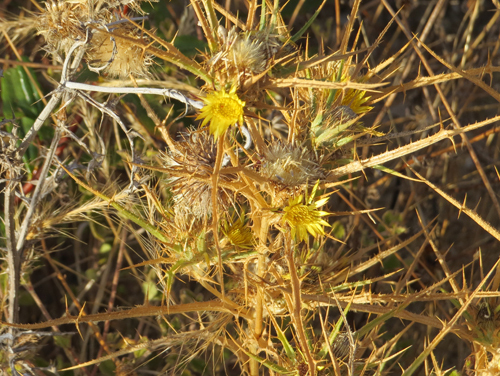 Dessicated flower head (fallen horizontal). 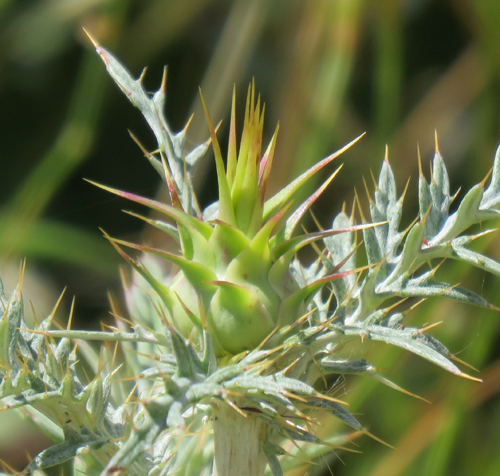 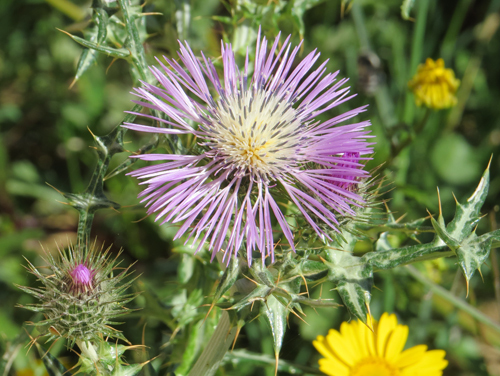 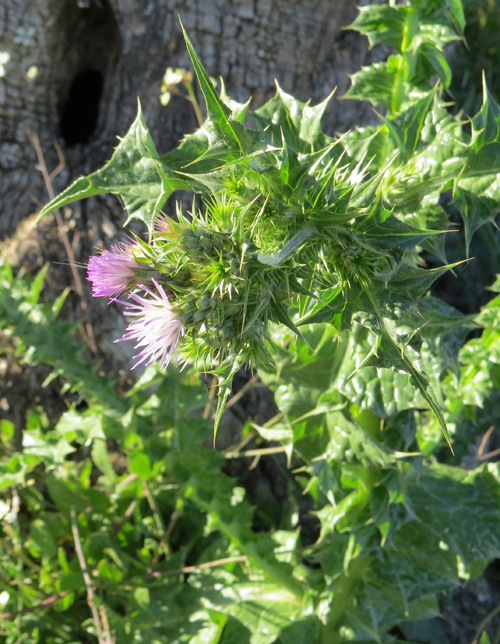 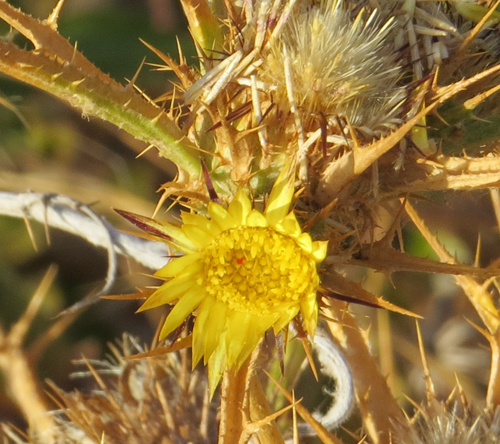 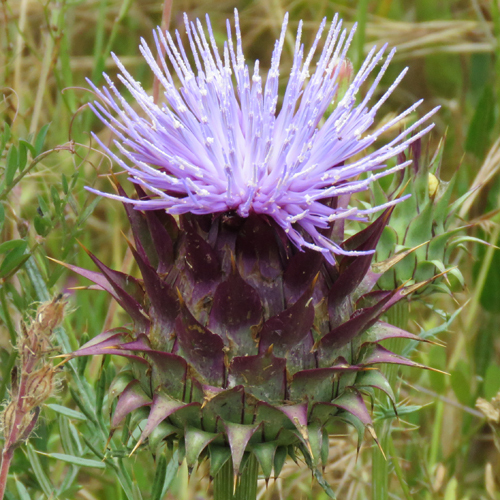 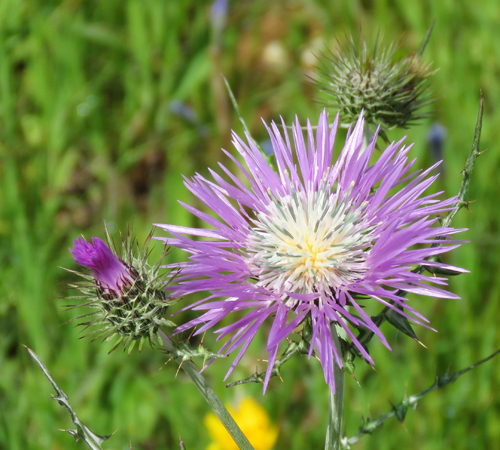 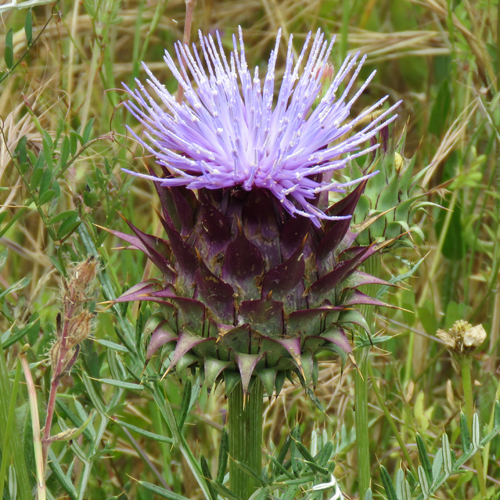 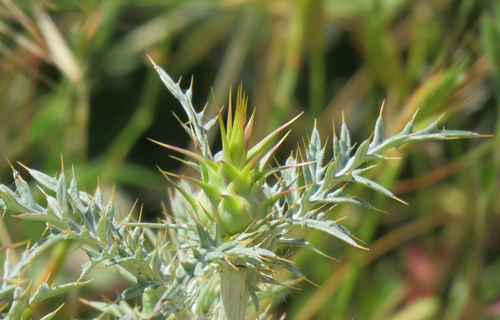 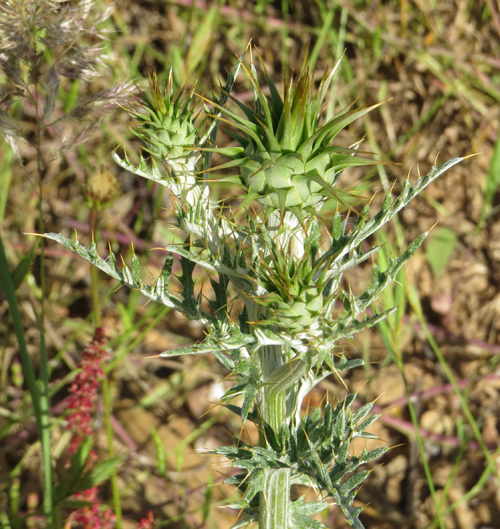 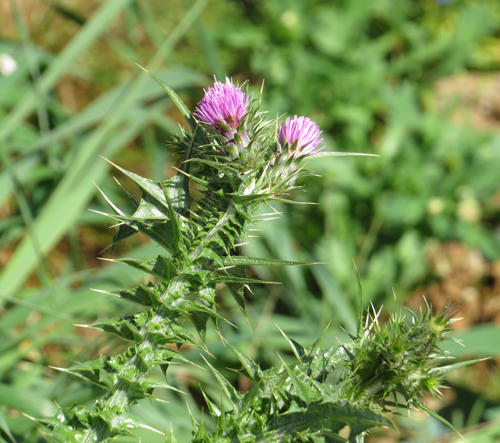 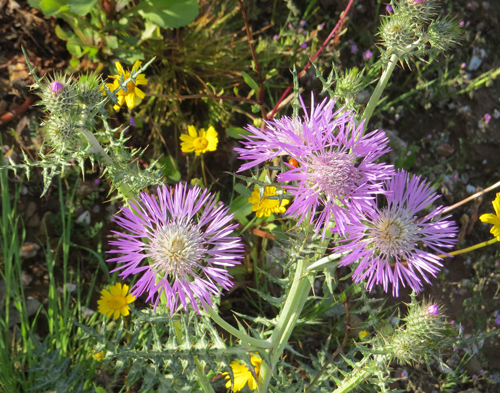 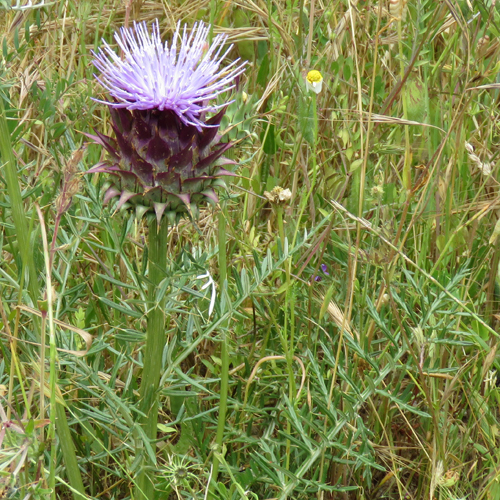 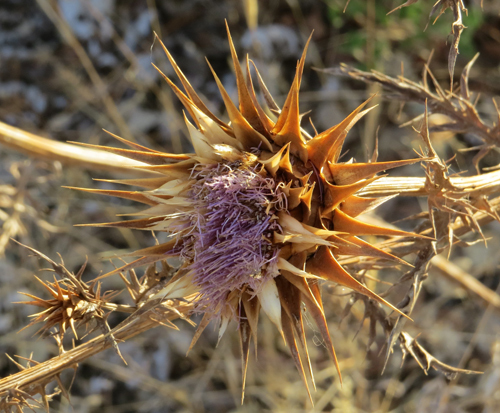 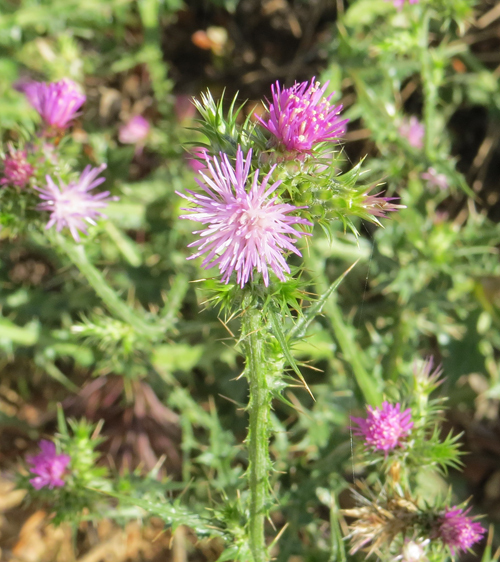 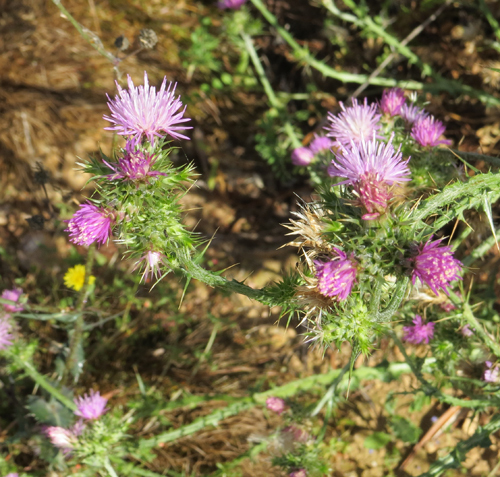 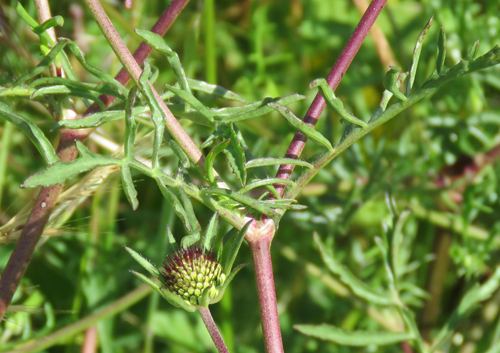 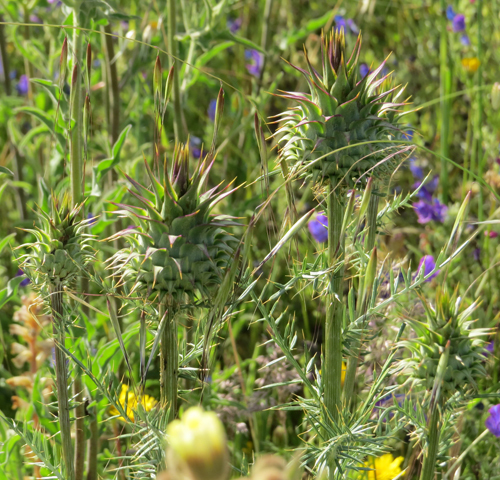 Developing flower spikes of this thistle species. 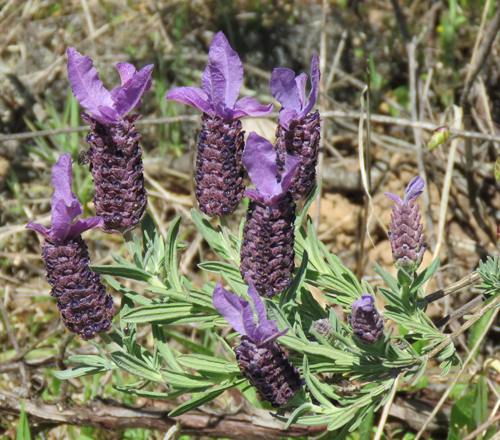 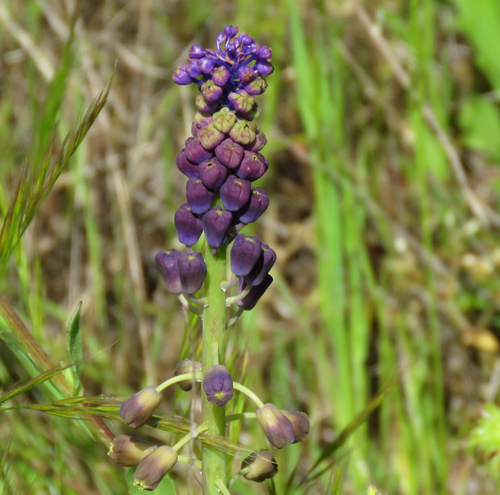 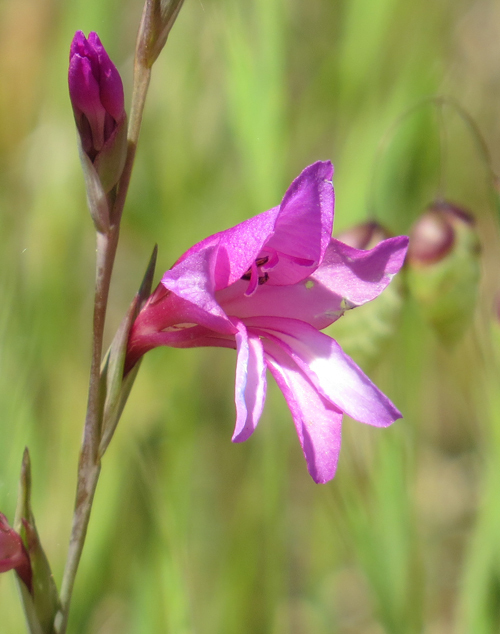 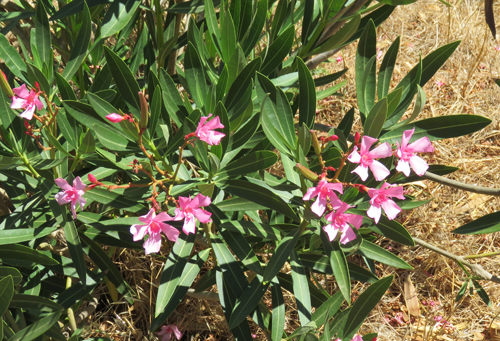 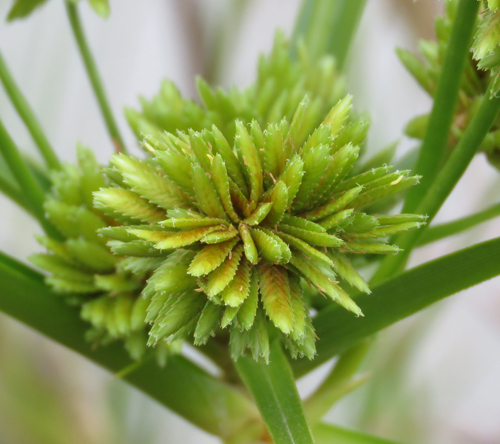 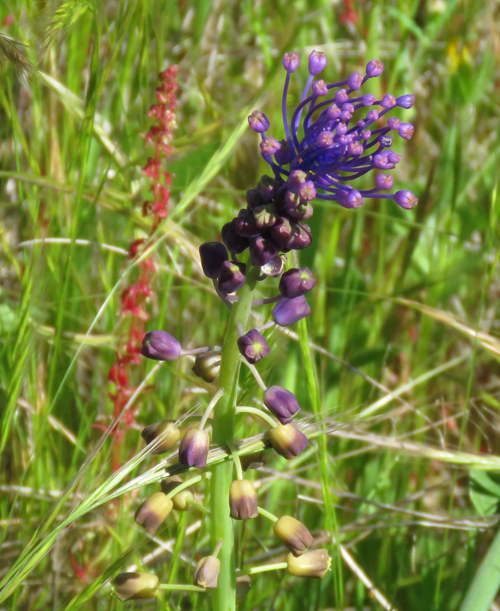 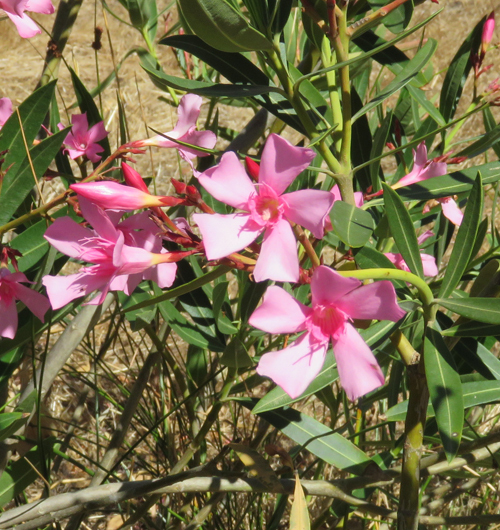 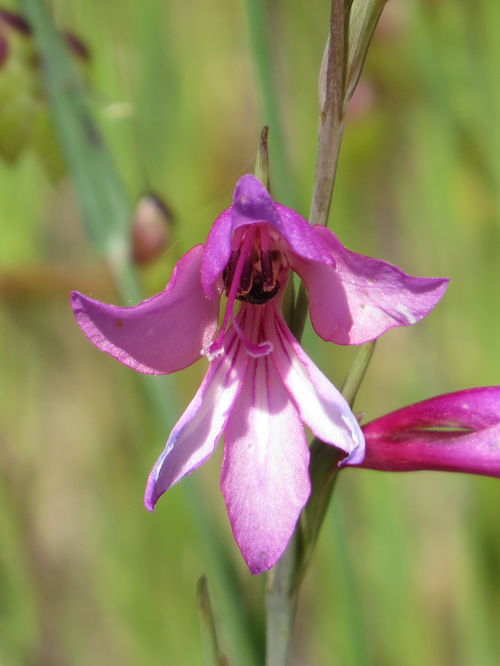 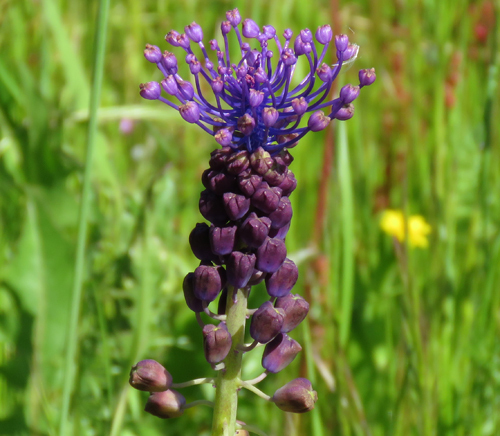 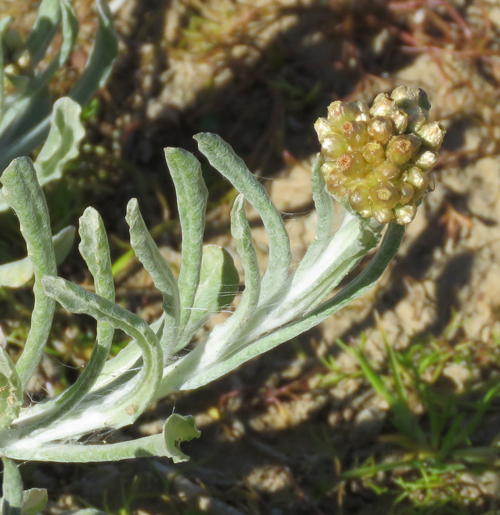 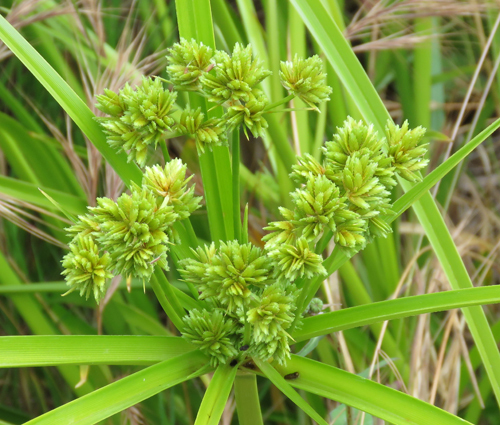 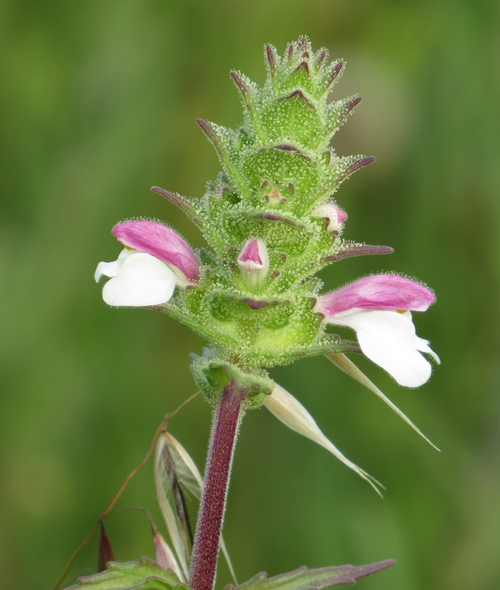 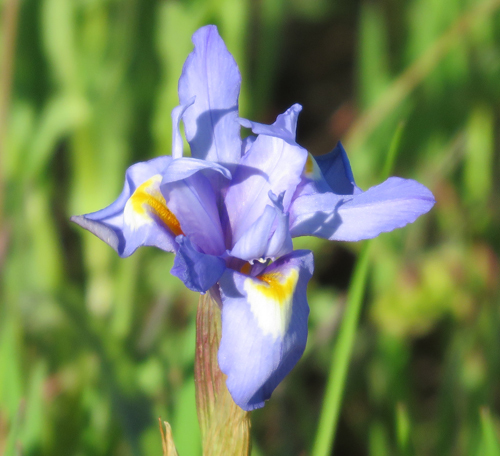 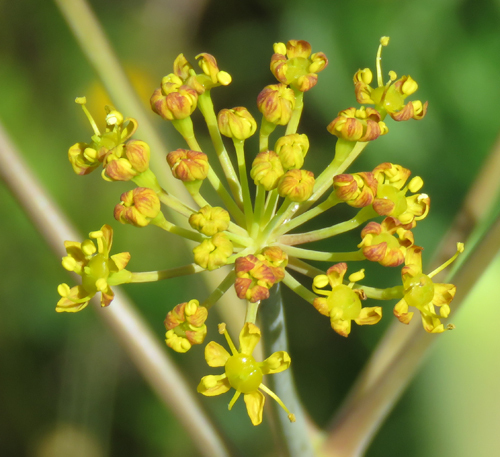 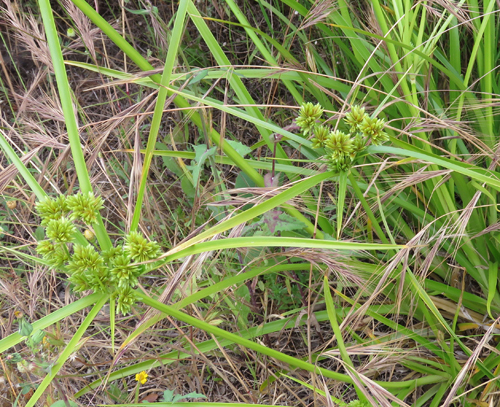 An Exotic species originally from the U.S.A. As such we will monitor the plant to ensure it does not become invasive. 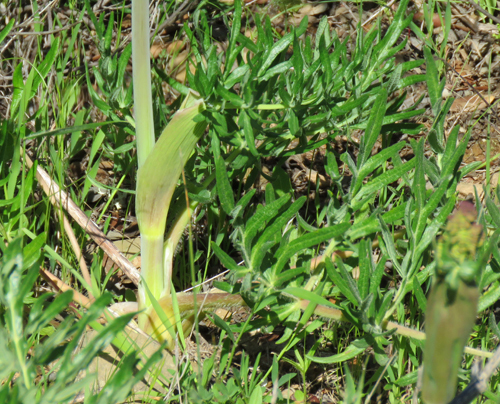 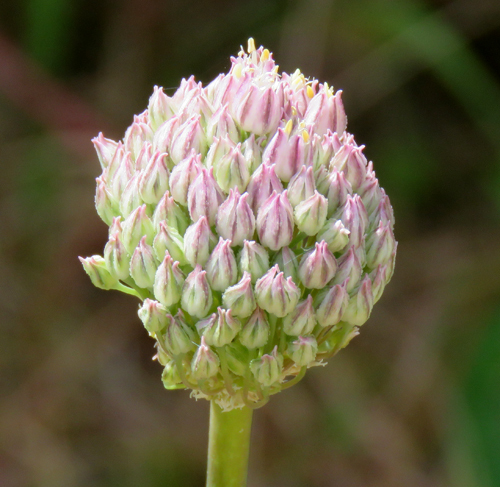 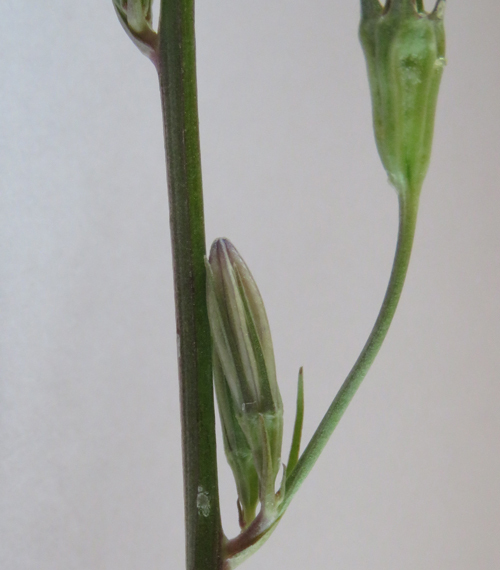 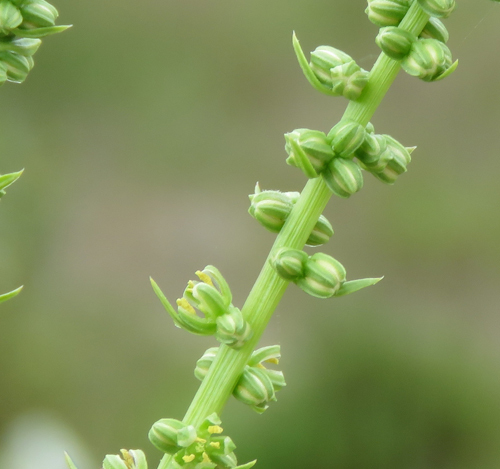 Flower spike before flowers have opened. 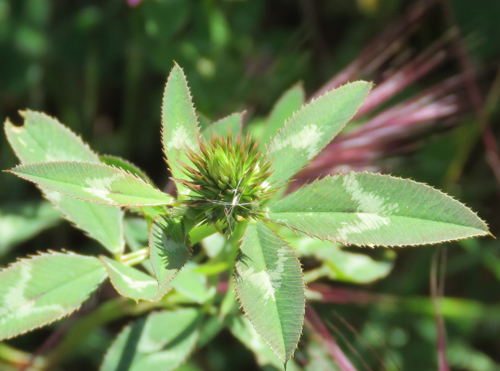 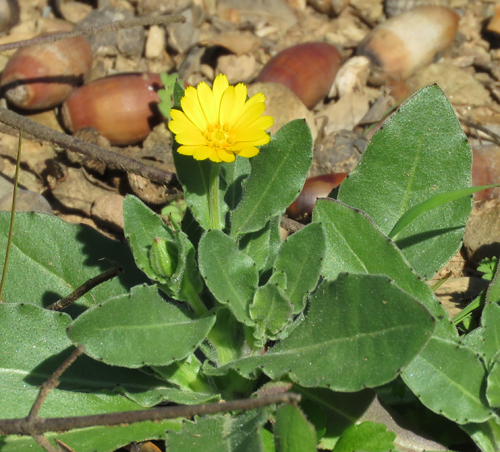 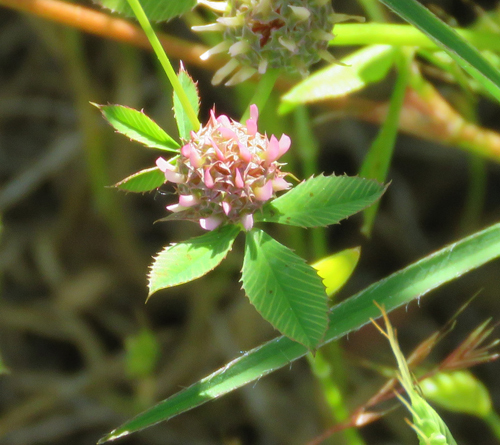 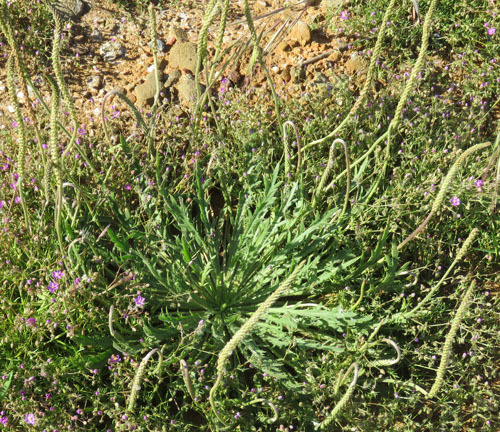 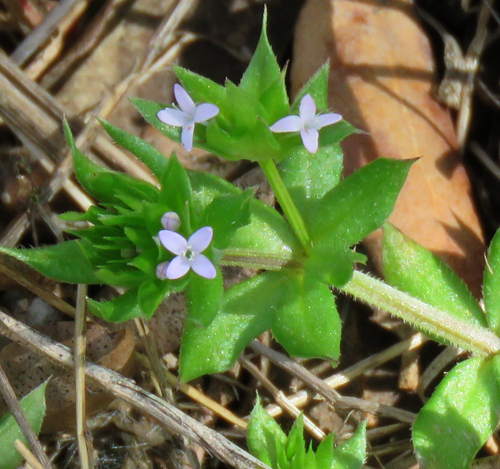 Showing characteristically lobed, but not pinnately lobed, leaves. 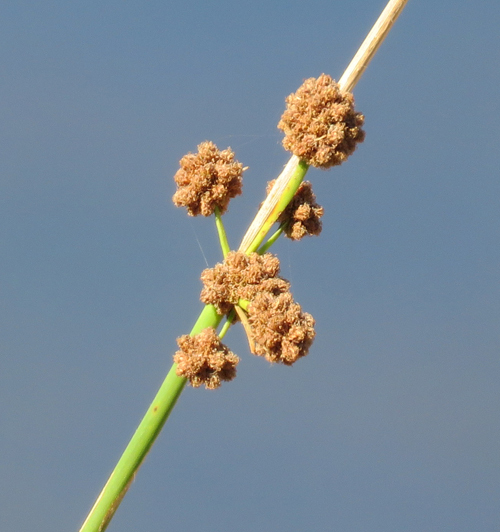 Showing very long fruits - the "Stork's Bills". 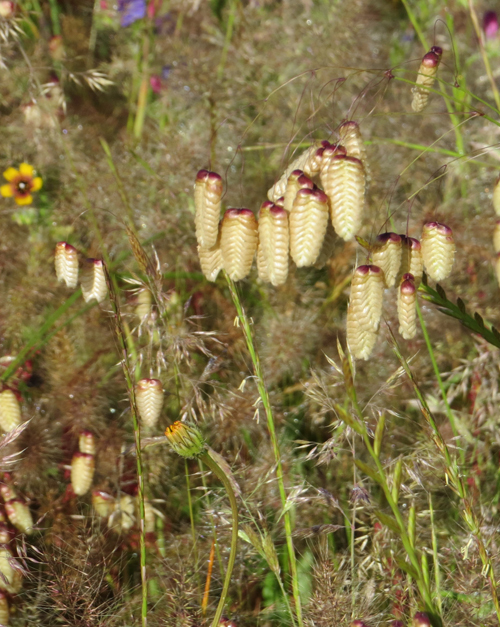 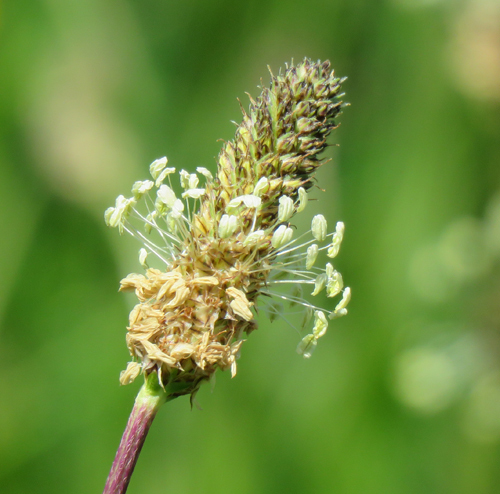 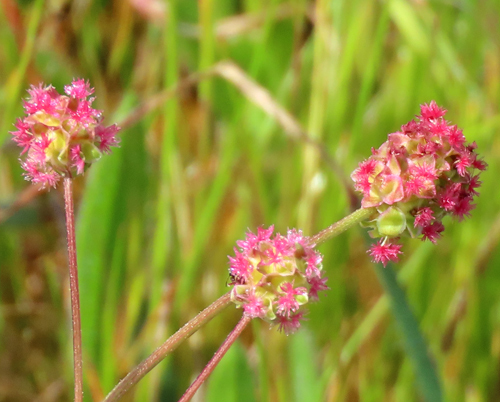 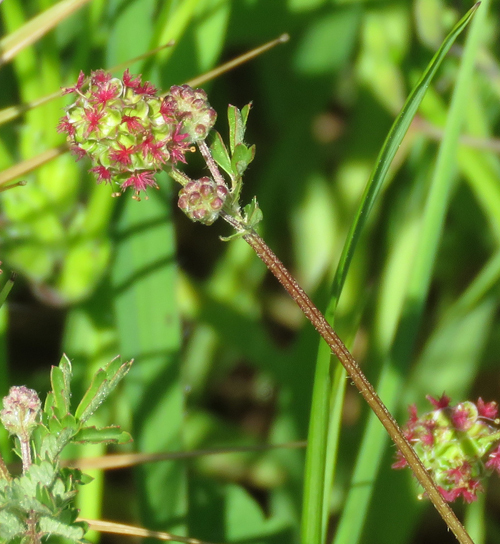 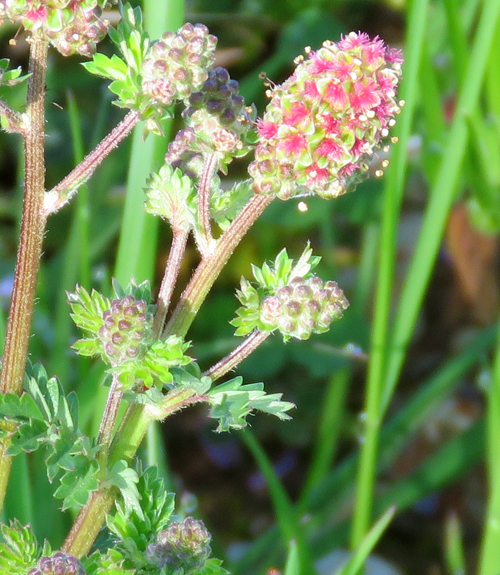 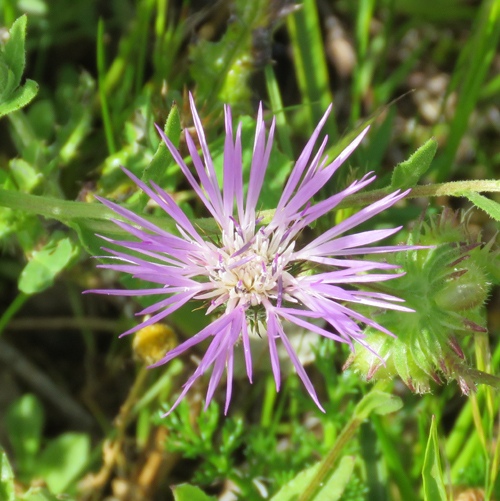 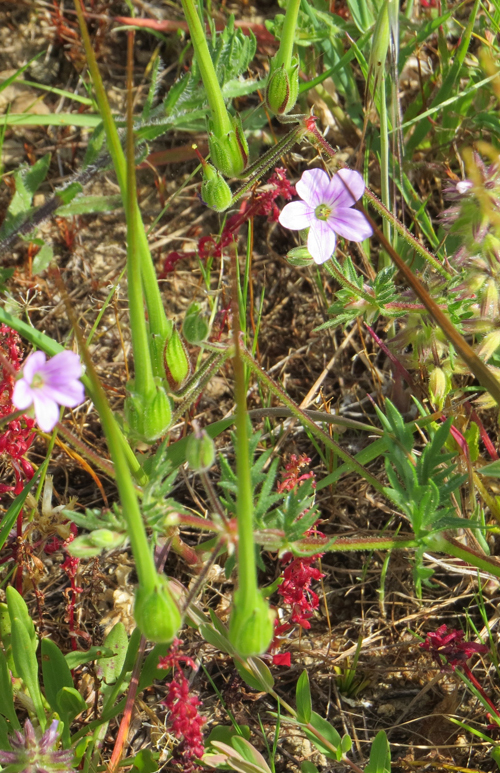 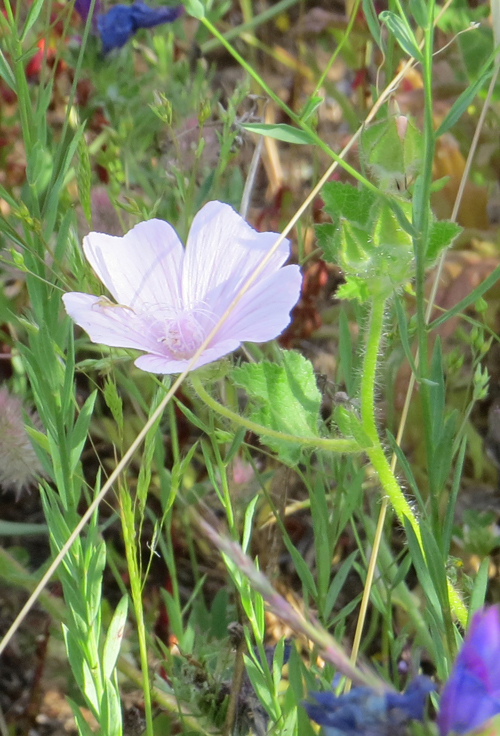 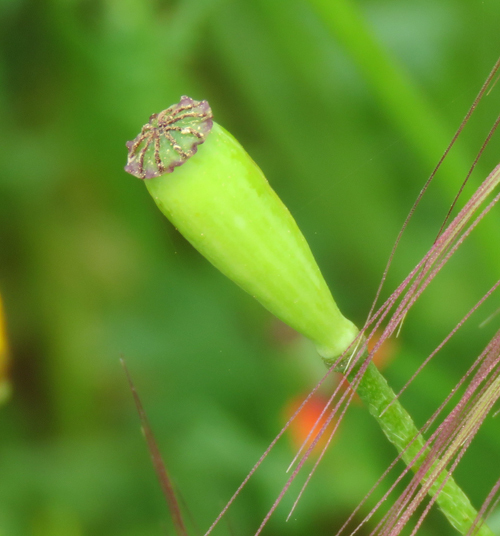 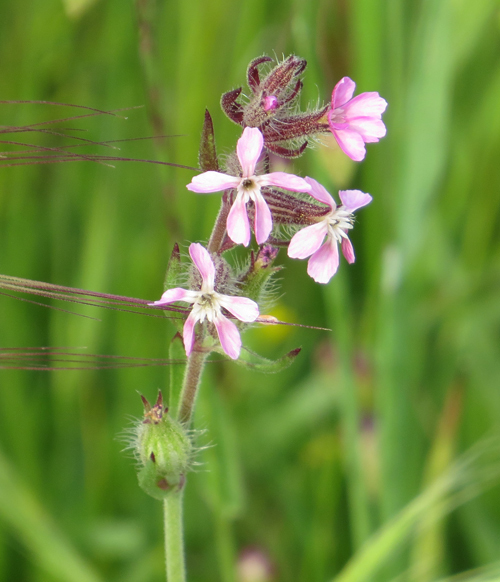 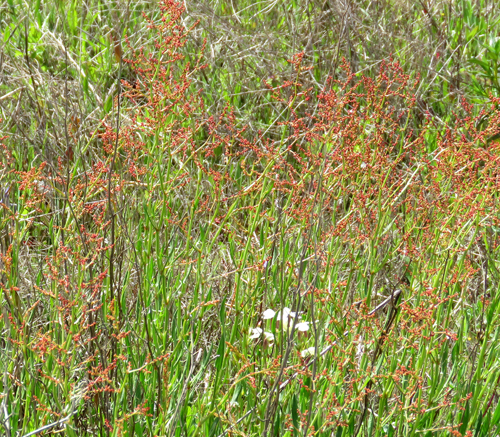 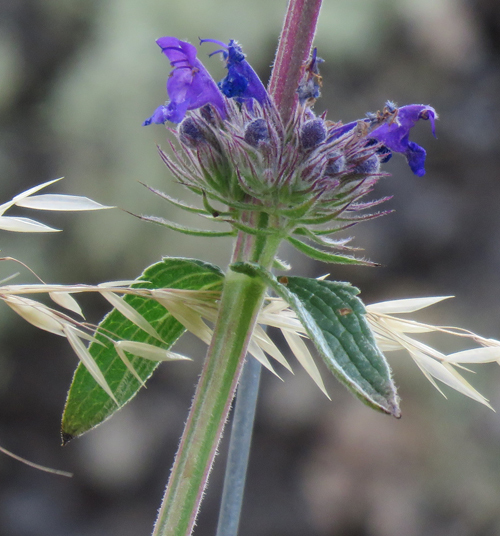 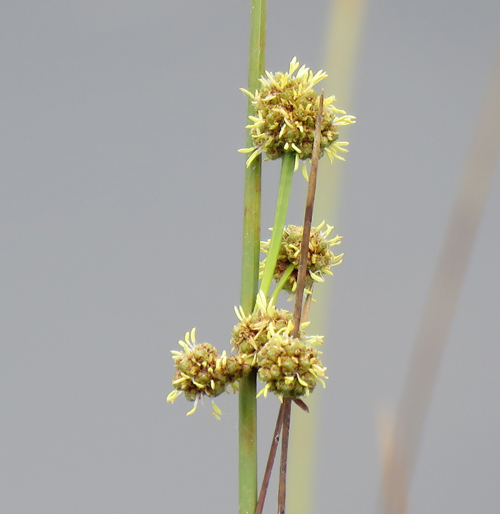 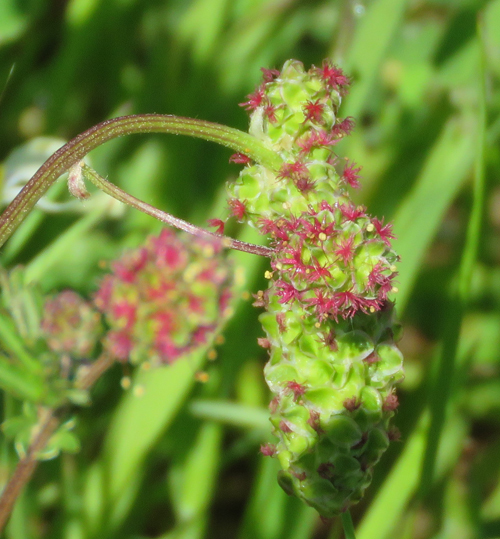 Showing flowers and Stork's bill-shaped seed heads. 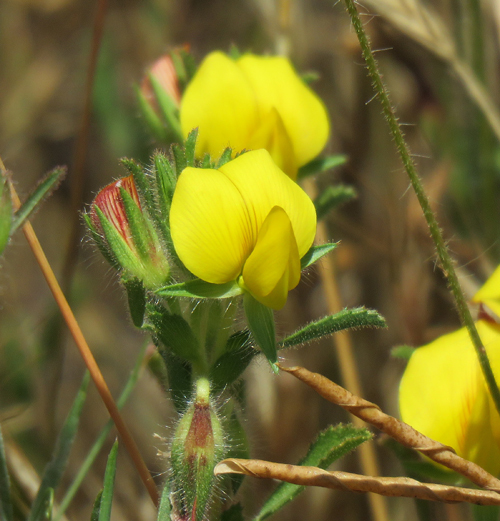 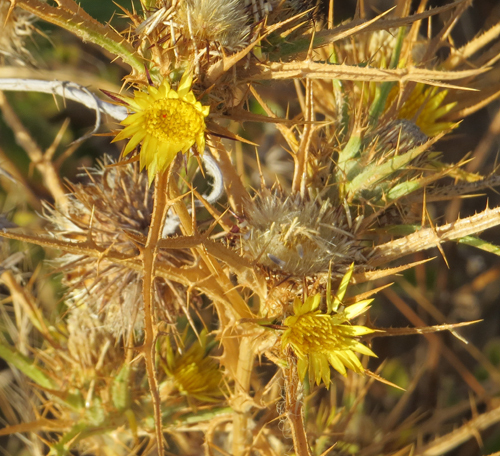 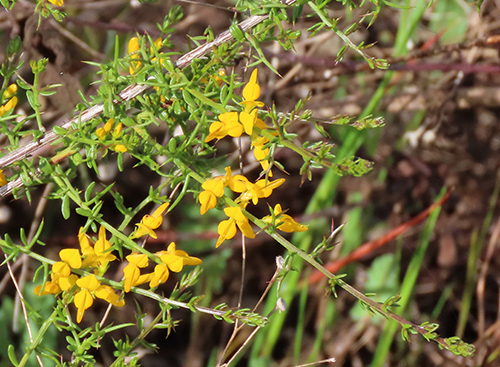 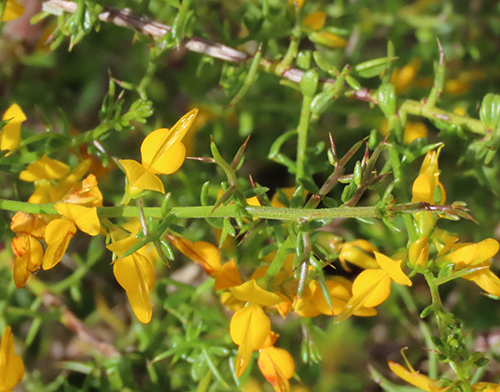 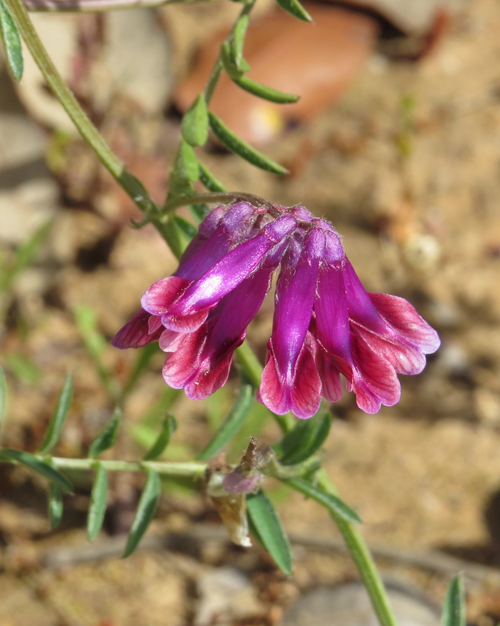 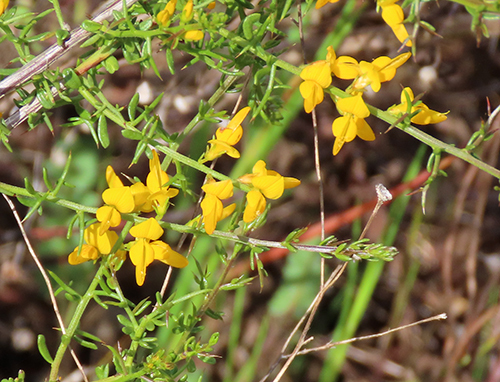 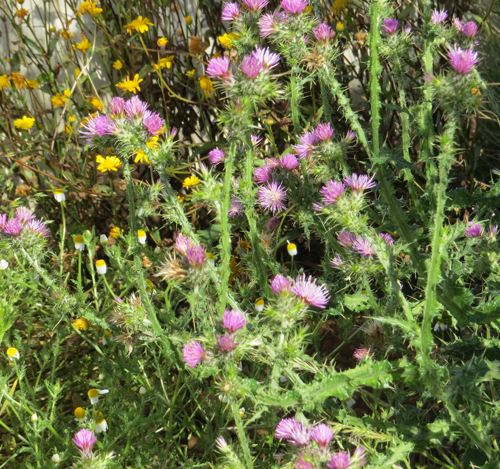 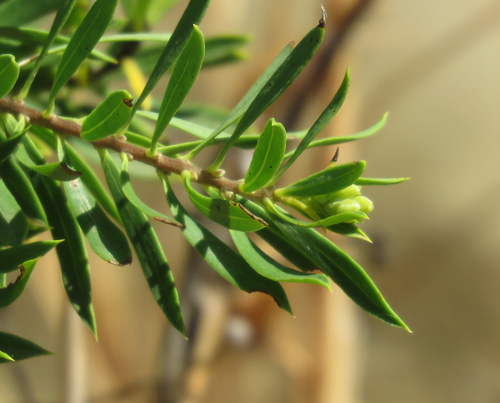 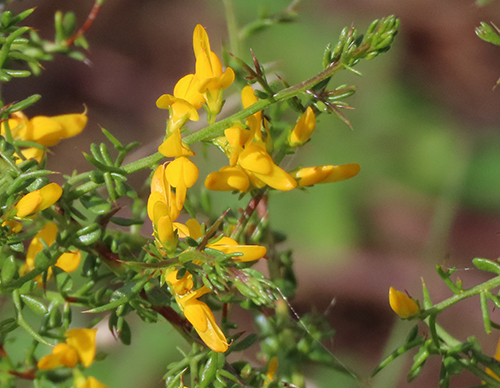 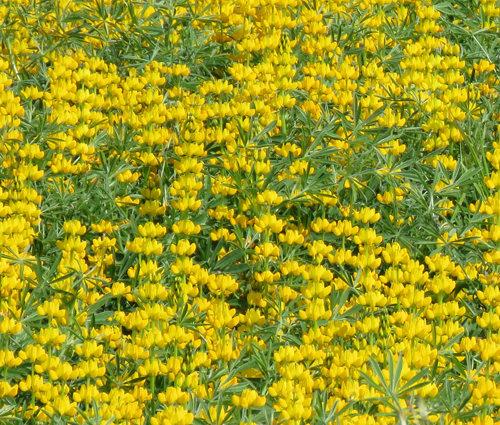 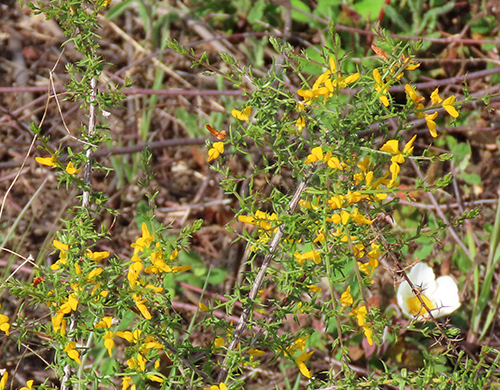 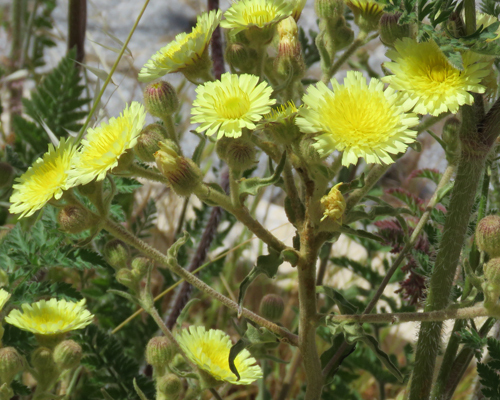 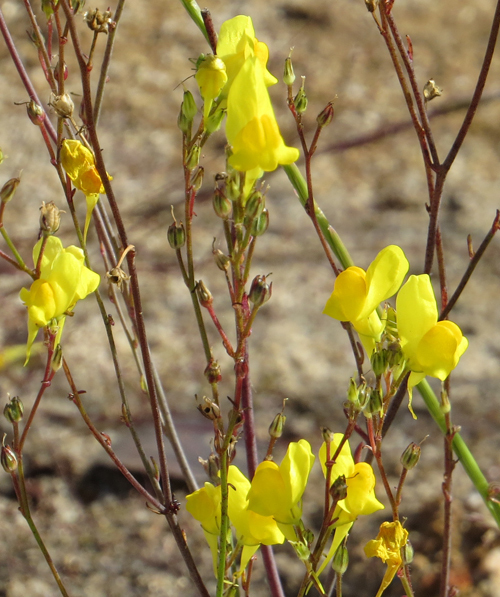 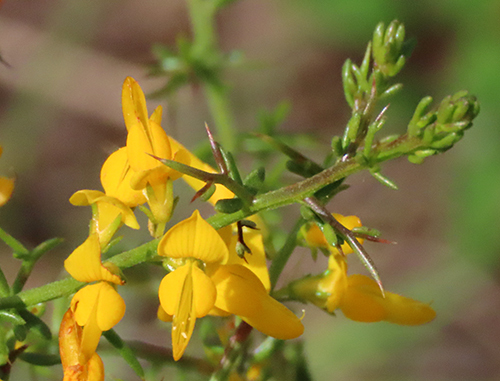 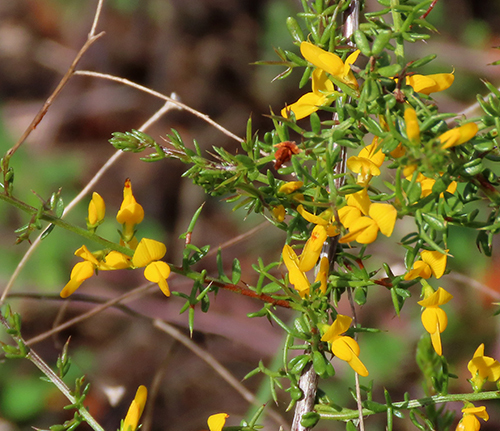 The Lesser Gorse (a type of Broom) is Endemic to Iberia and North-West Morocco. 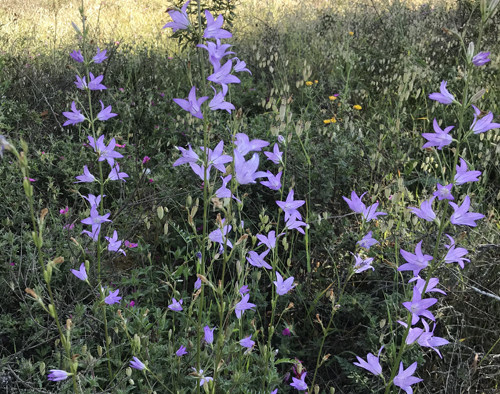 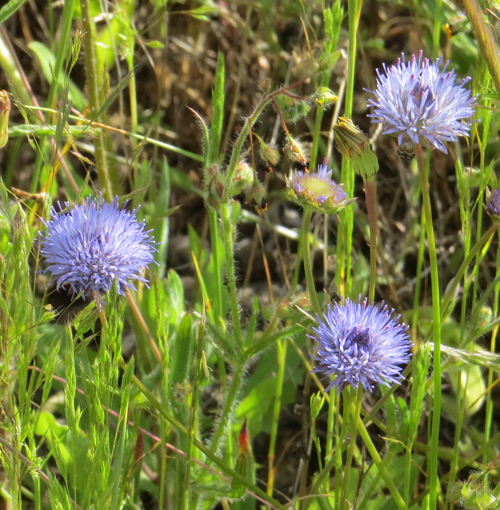 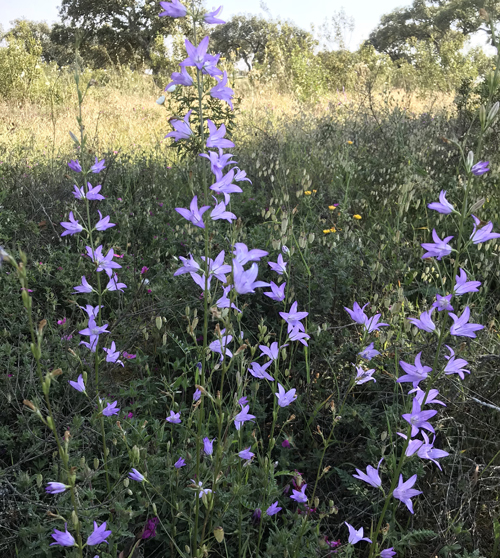 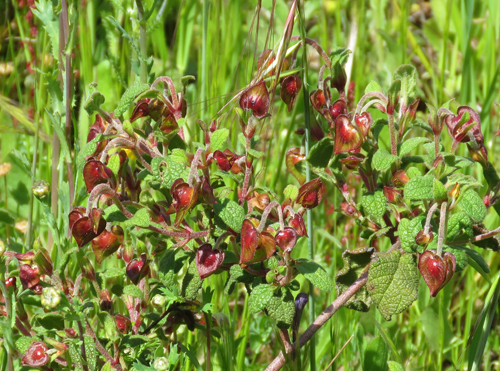 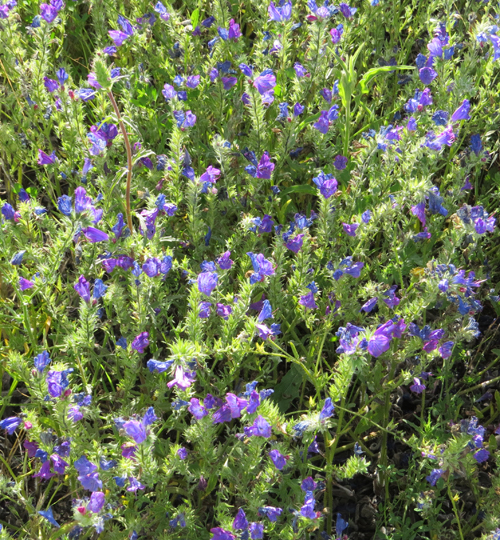 This small shrub is typically found in areas with Cork and Iberian Holm Oaks/Montado. 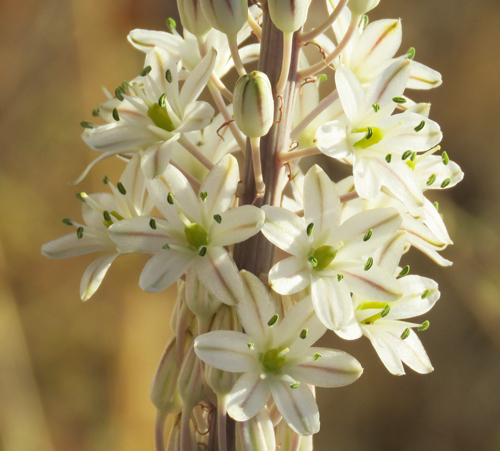 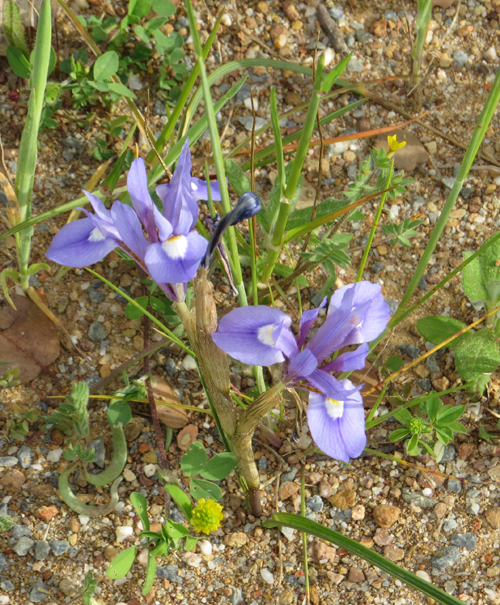 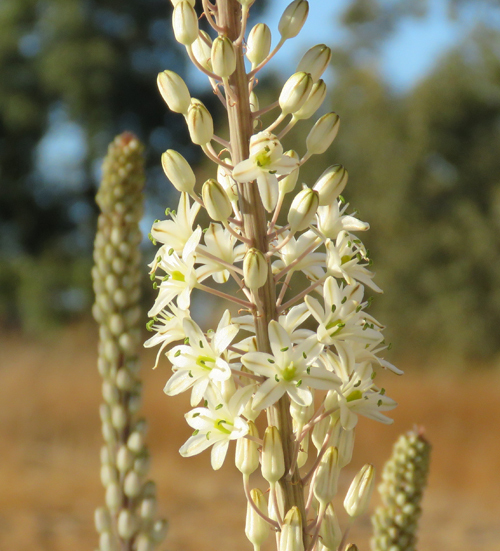 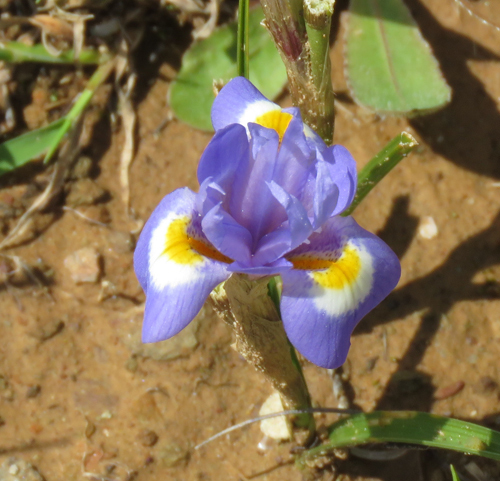 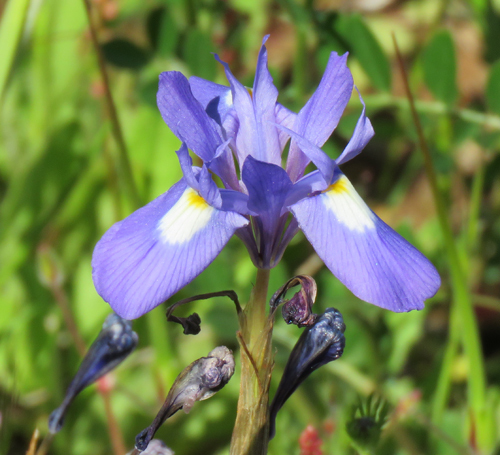 The flowers of the Barbary Nut only open late in the morning. 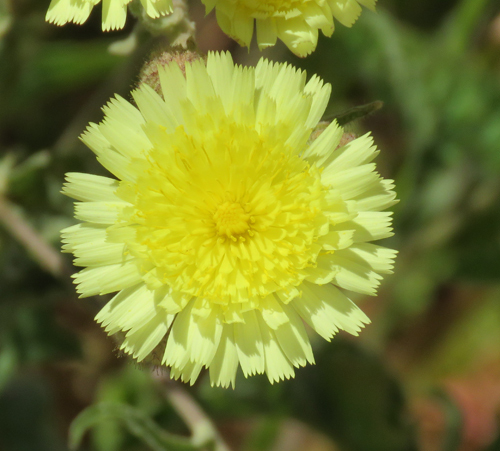 The English common name used here is based on the Portuguese common name, Patinha de osga, meaning Gecko-Foot (small gecko foot). 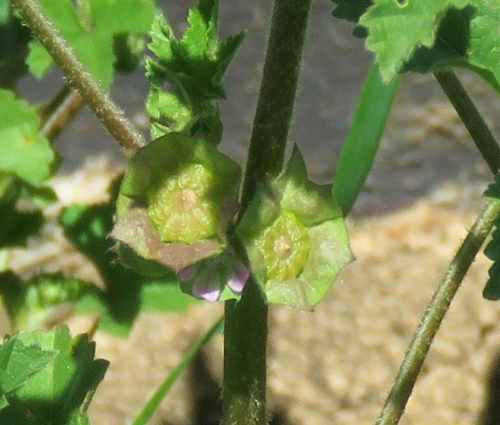 The sepals have stalked black glands. 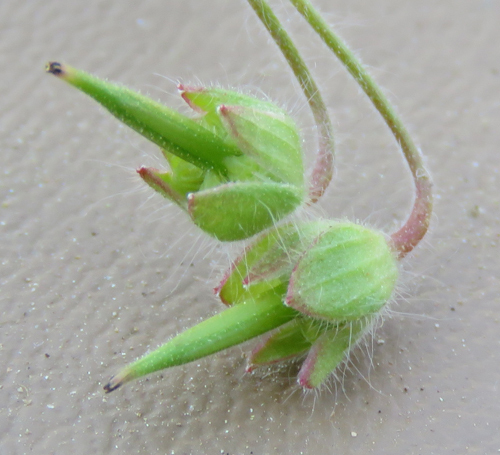 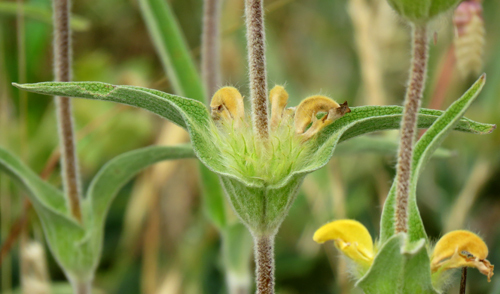 Sepals are individual segments of the calyx. 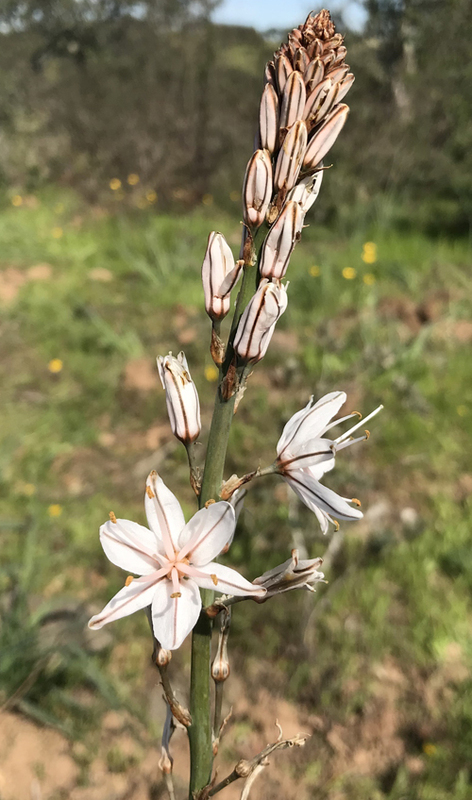 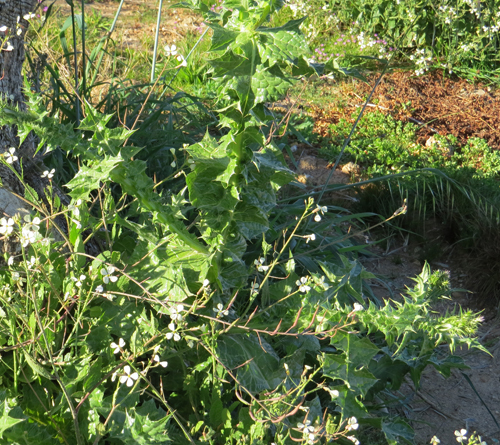 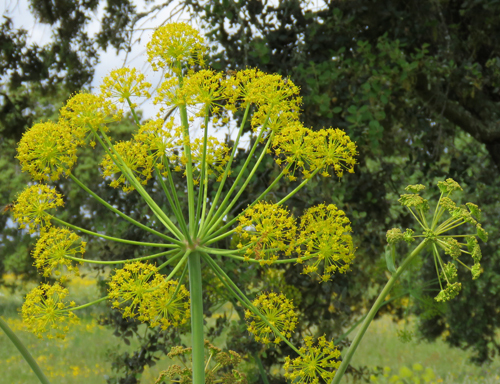 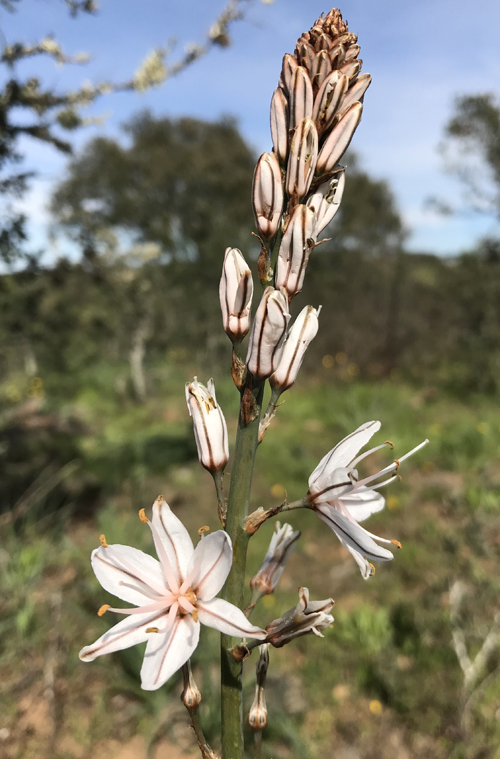 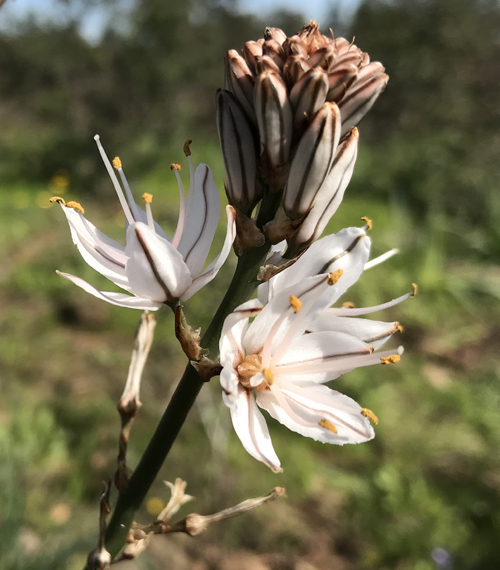 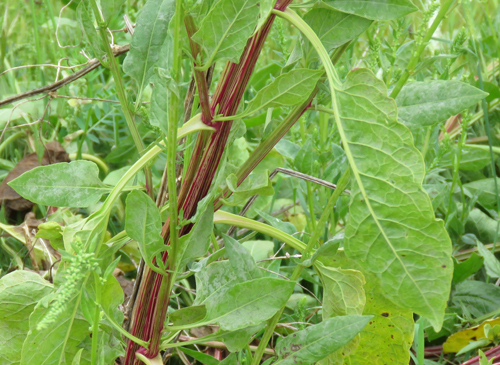 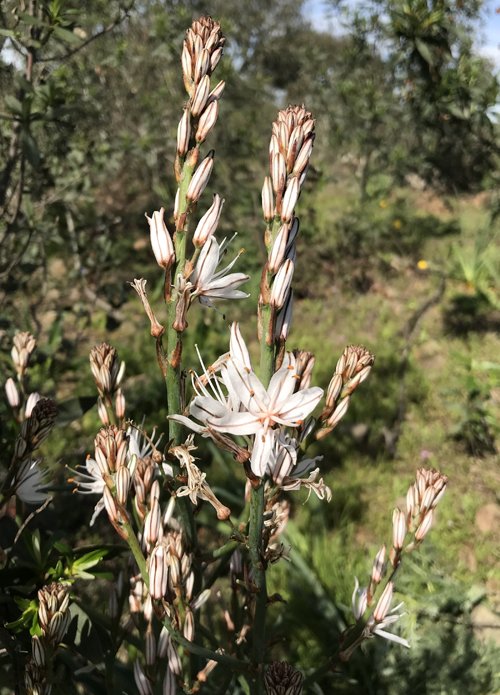 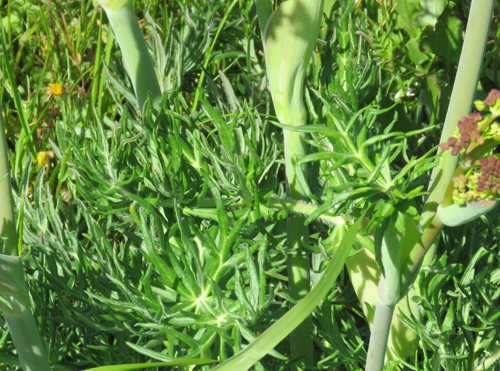 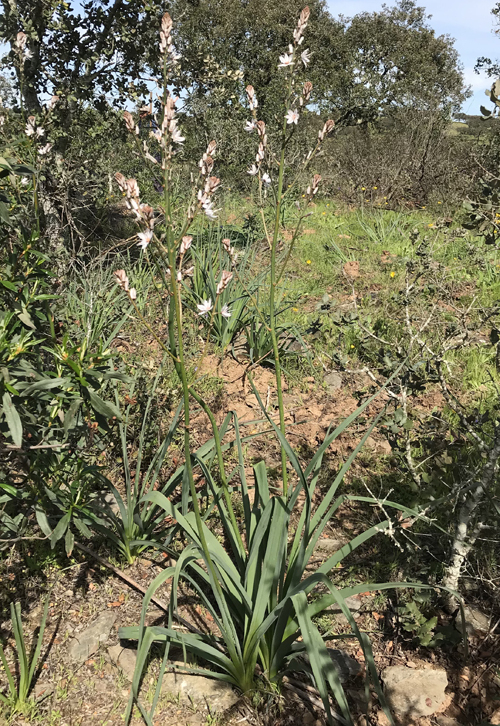 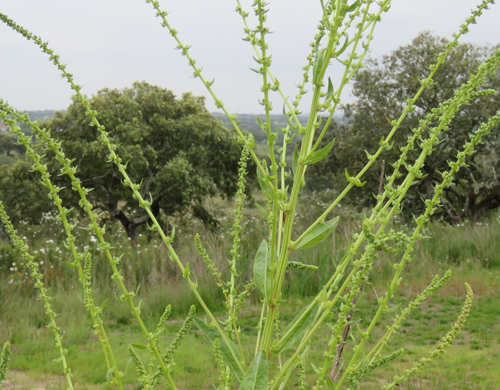 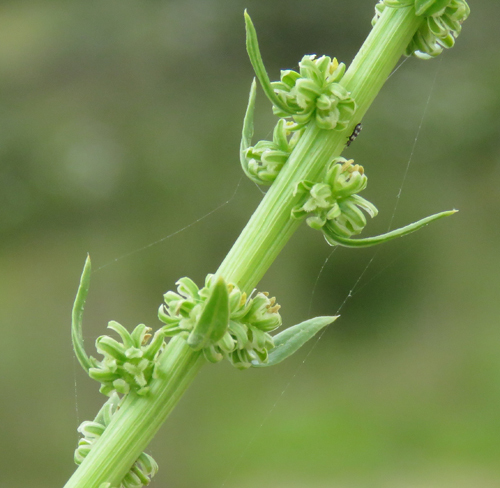 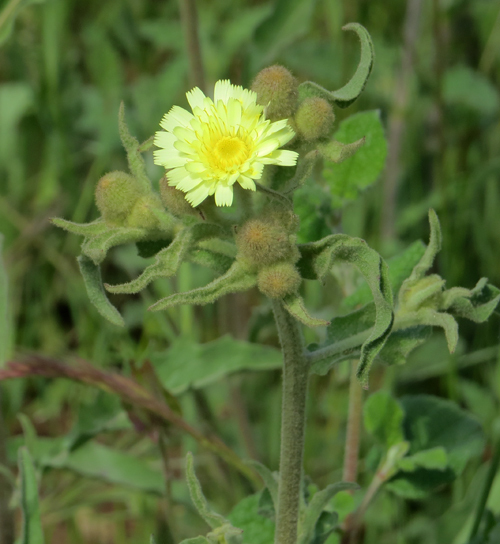 Amazingly this plant, which can grow to 2m tall and has large spines on its leaf veins, is the ancestor of our humble supermarket lettuce (Lactuca sativa) ! 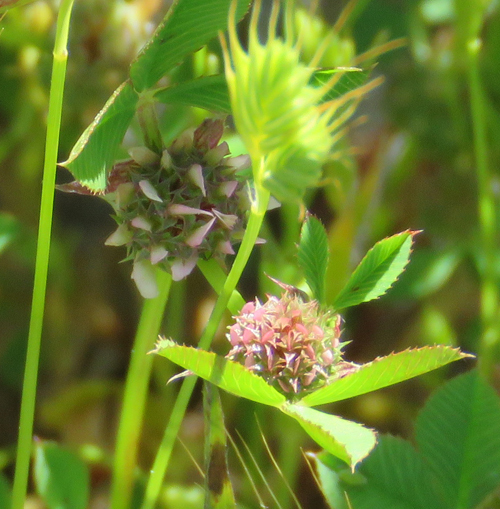 Note the large seed pod on the right. 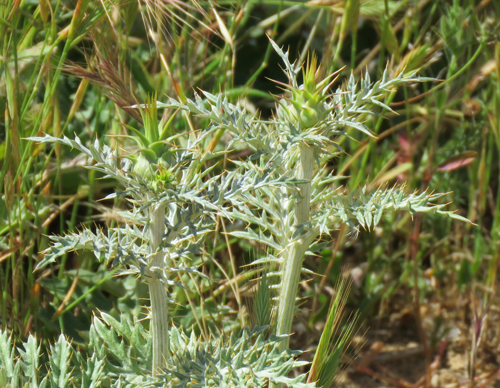 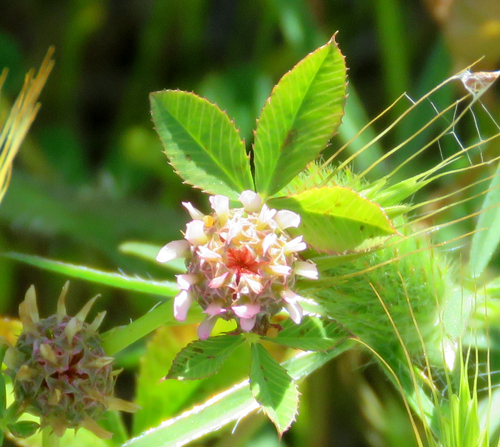 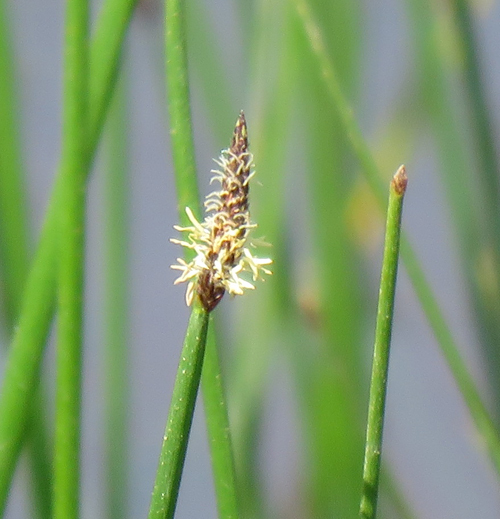 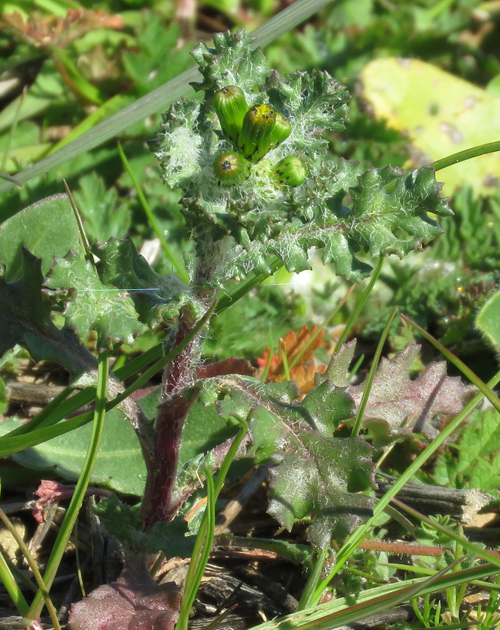 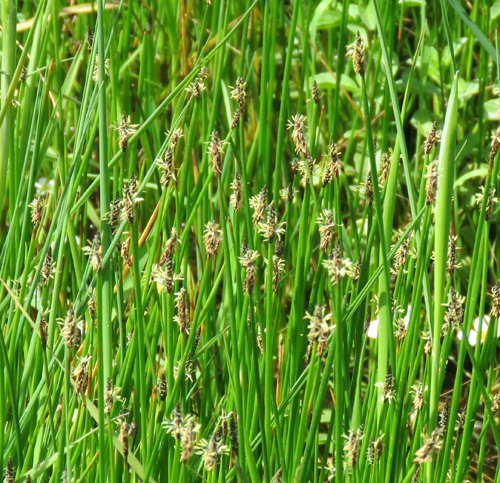 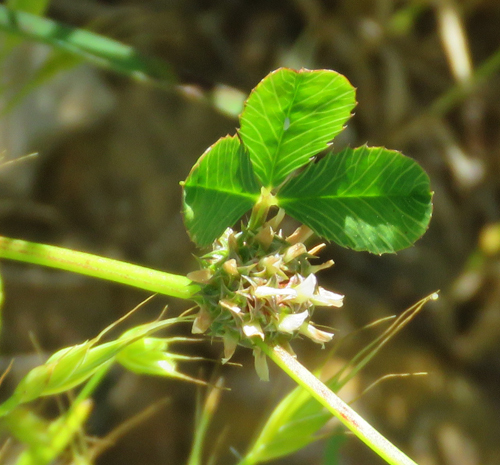 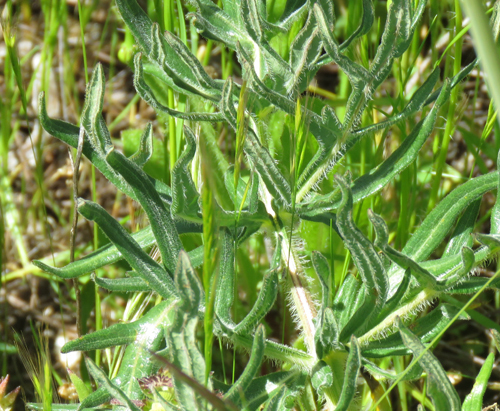 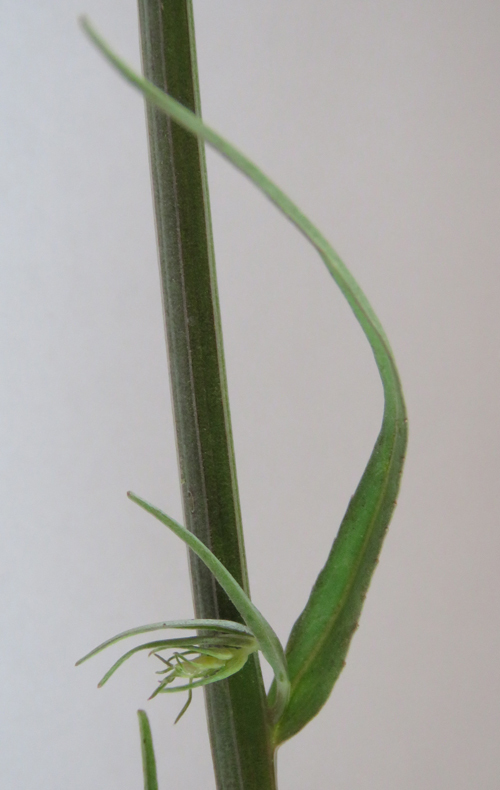 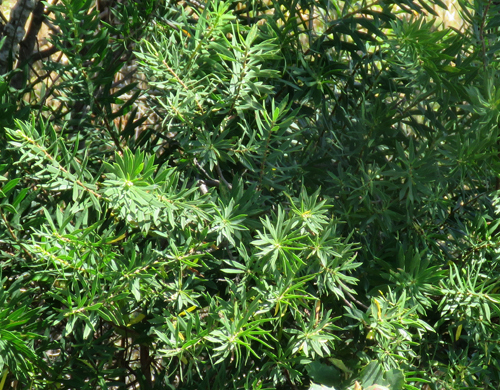 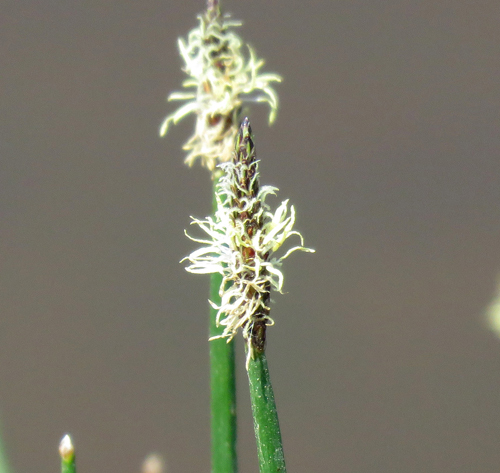 Note the pairs of lanceolate leaflets and branched tendrils. 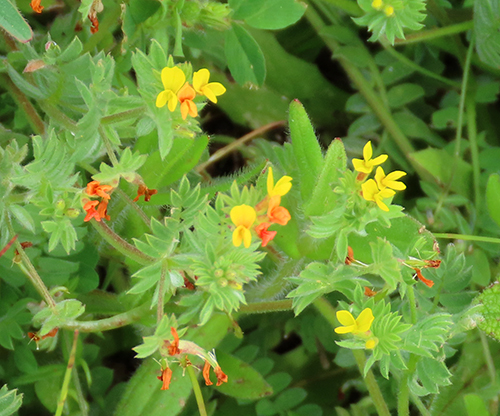 Some plants have Orange flowers. 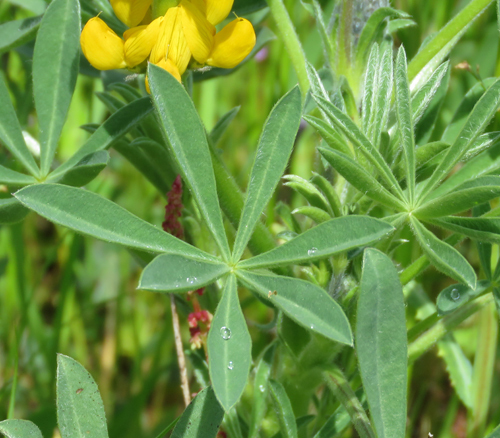 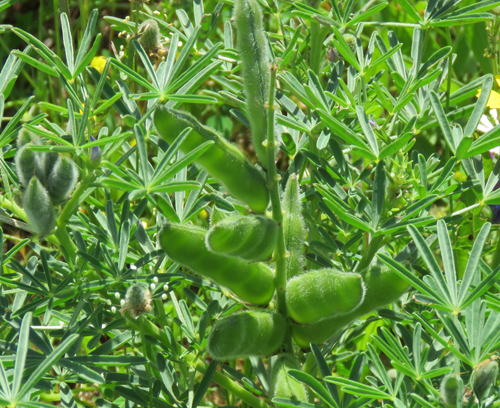 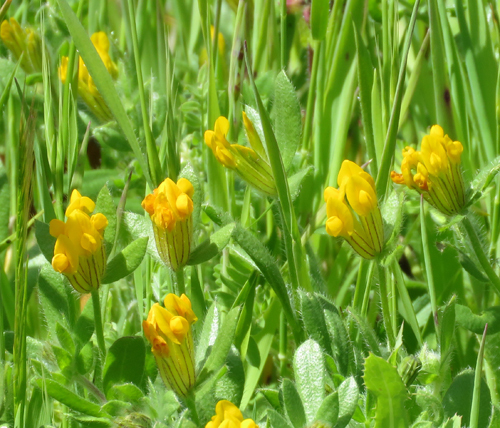 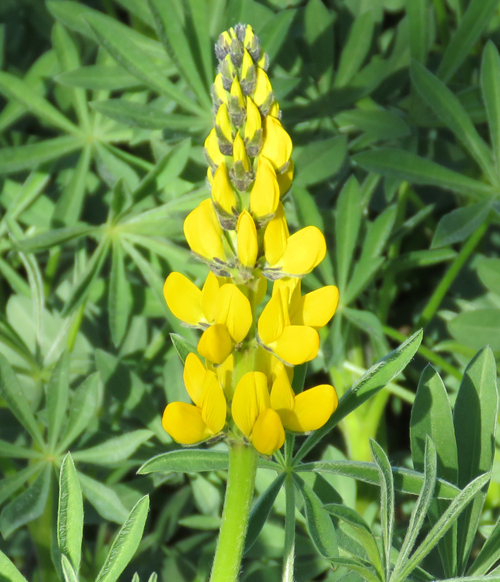 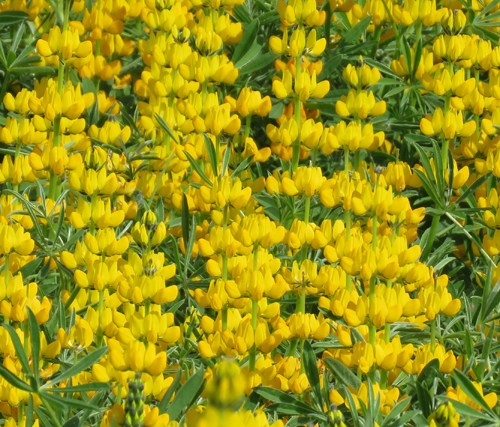 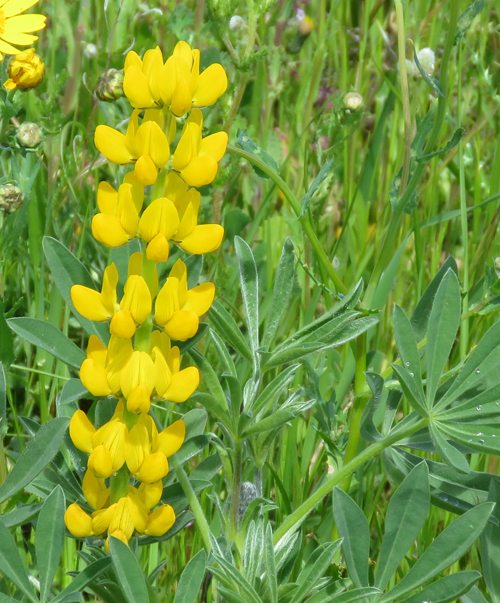 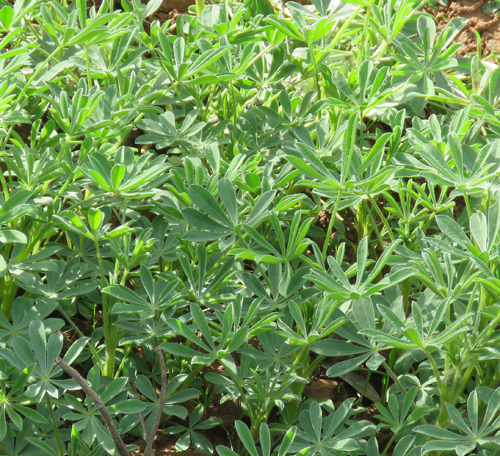 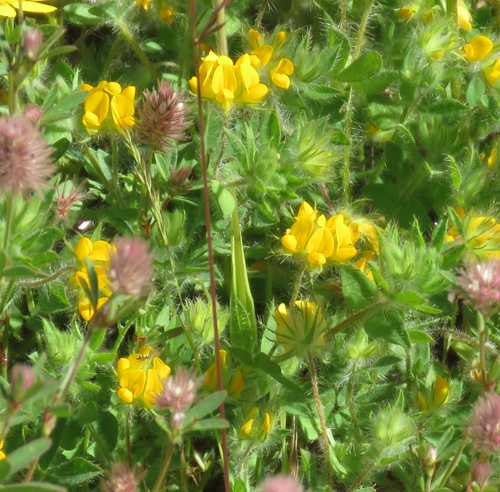 Yellow Lupin plants sown as seeds in our Olive Grove to provide a green manure. 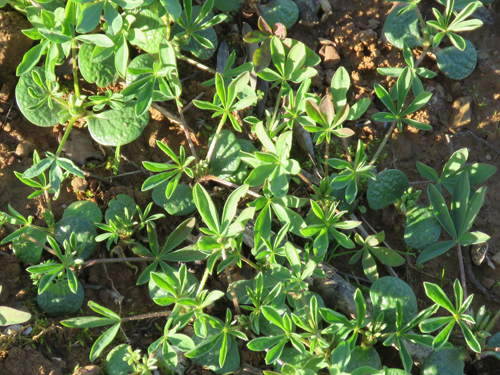 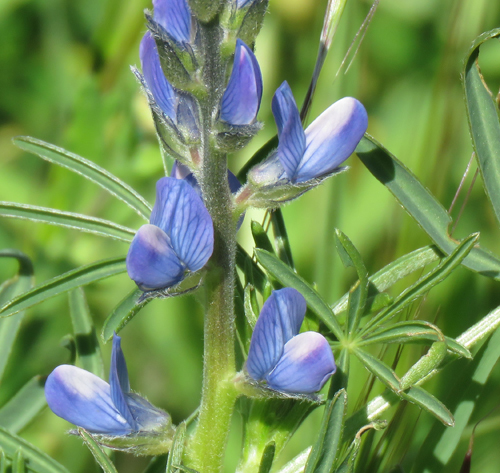 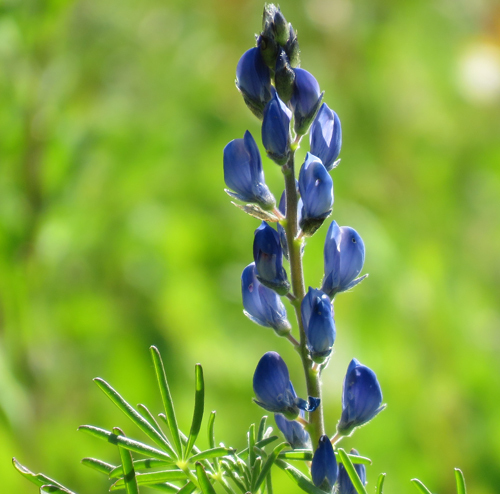 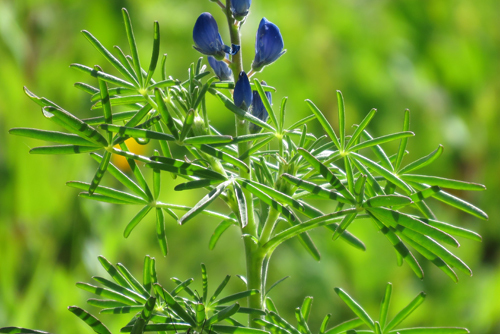 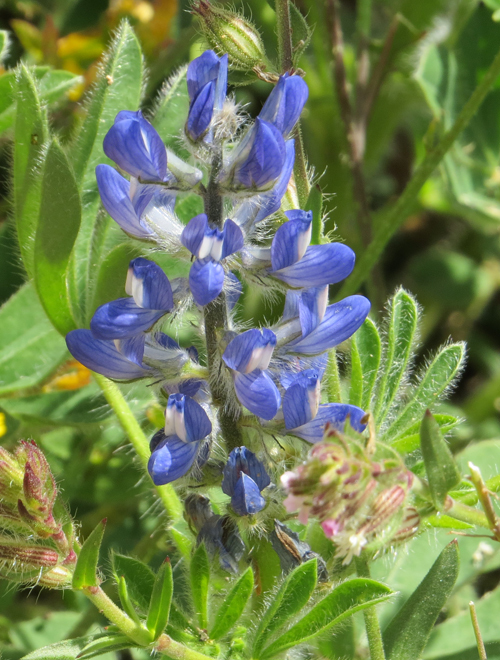 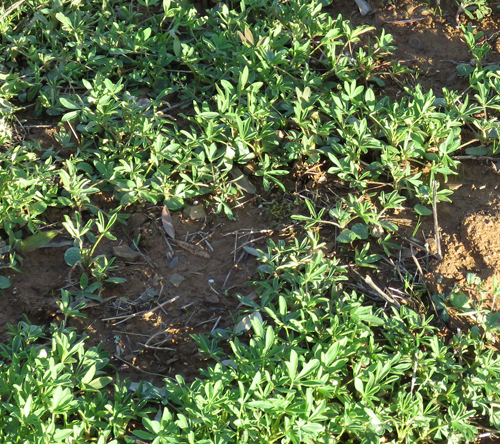 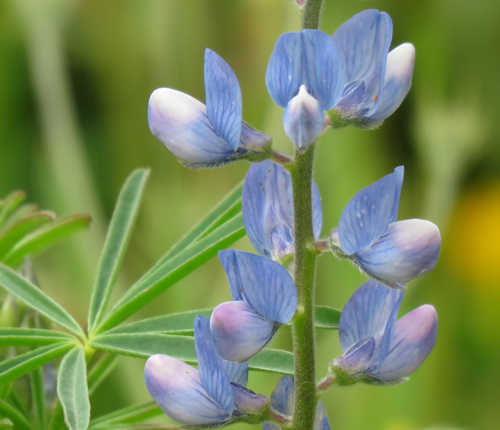 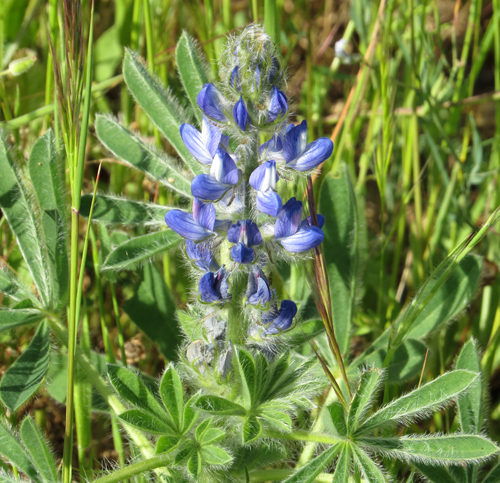 Lupins have nitrogen-fixing bacteria in their root nodules, a trait typical to pea family species. 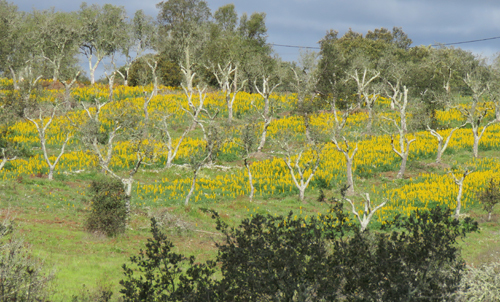 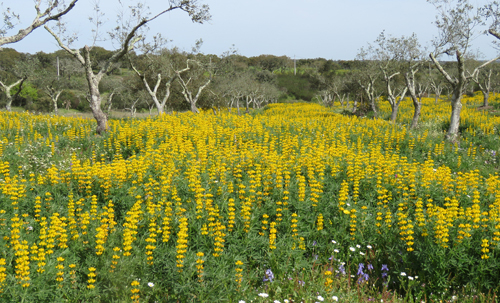 Yellow Lupins in flower in the Olive Grove. 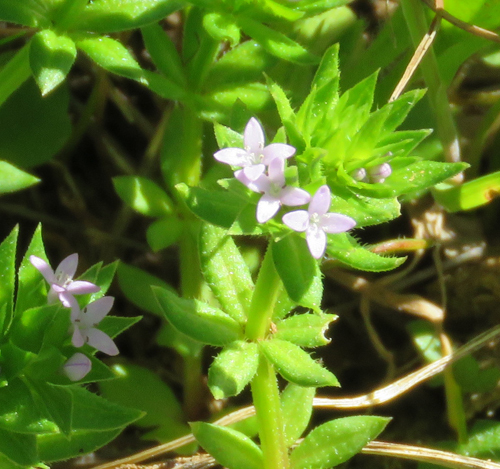 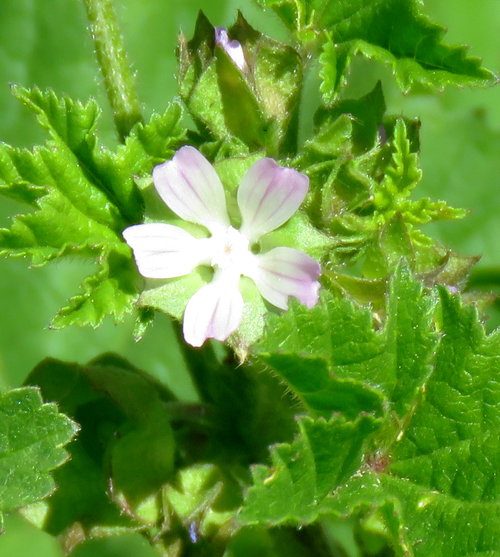 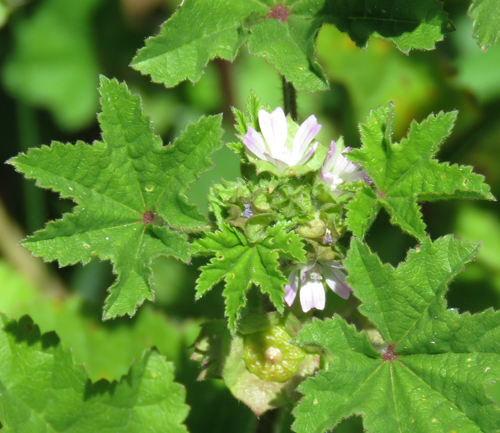 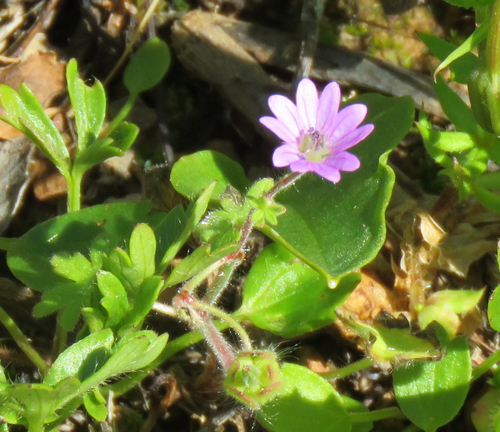 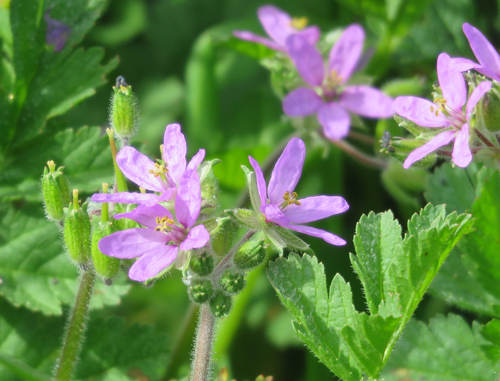 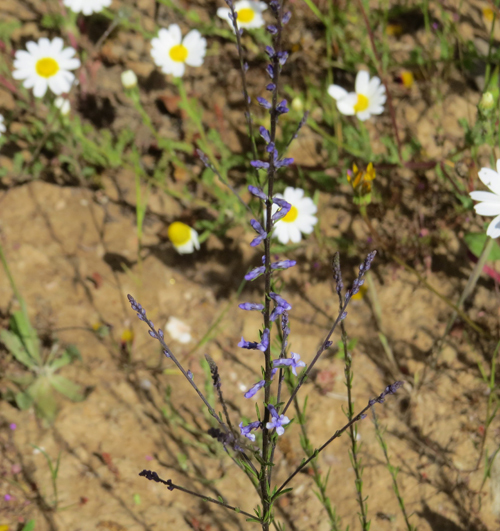 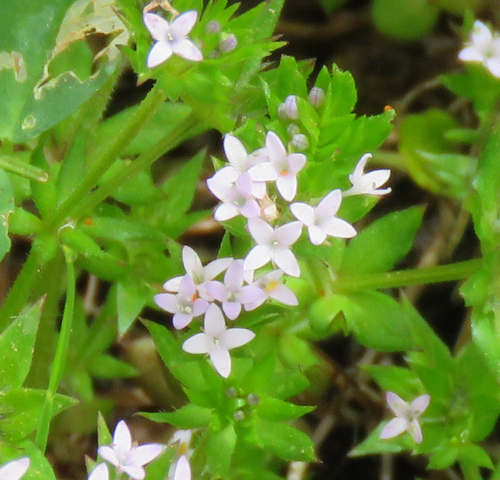 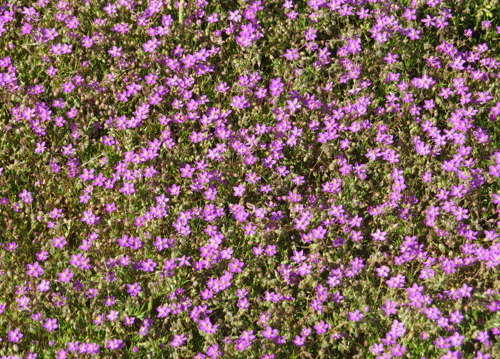 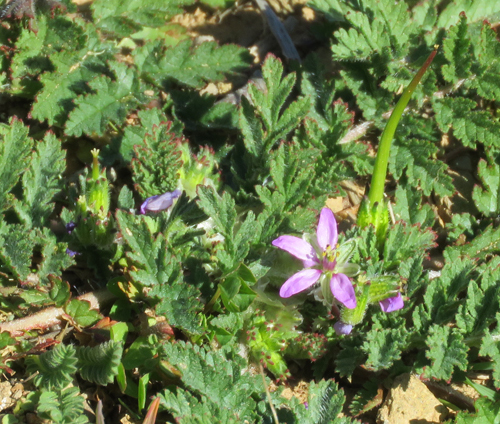 The flowers are very small compared to the rather vigorous foliage. 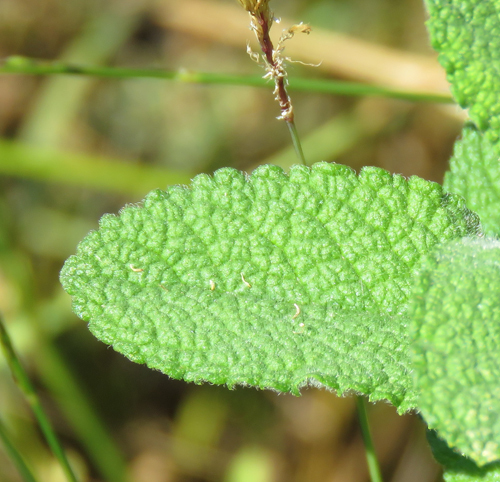 Note the wrinkled leaf surface, typical of this species. 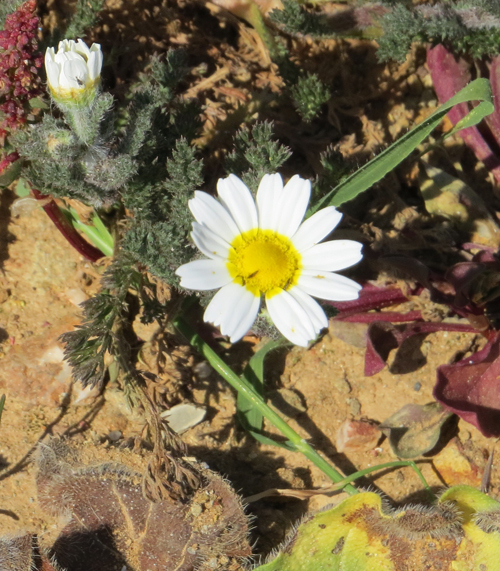 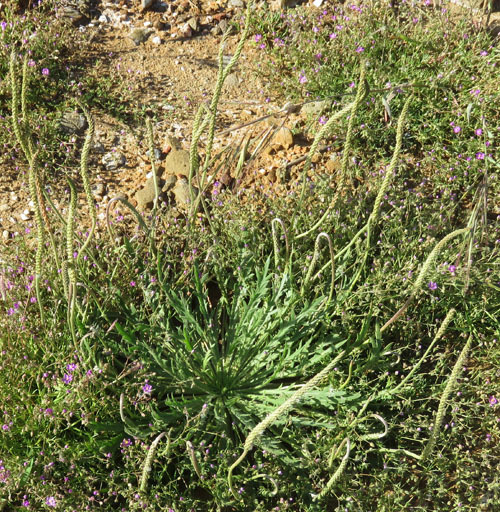 Minuartia geniculata Peak Flowering Period: March to ? 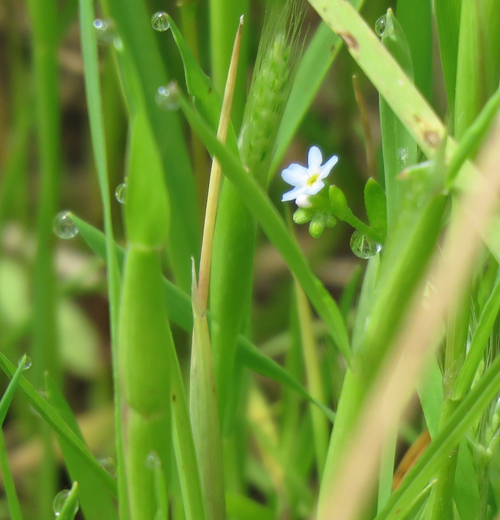 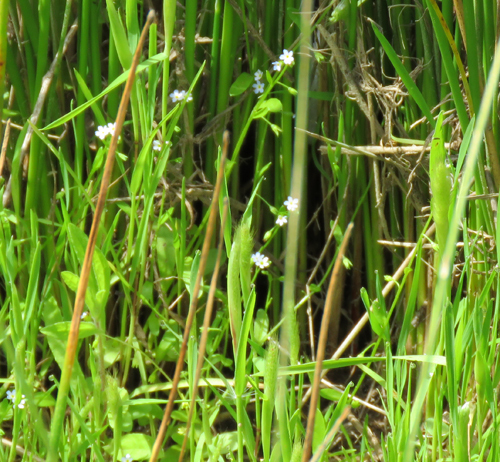 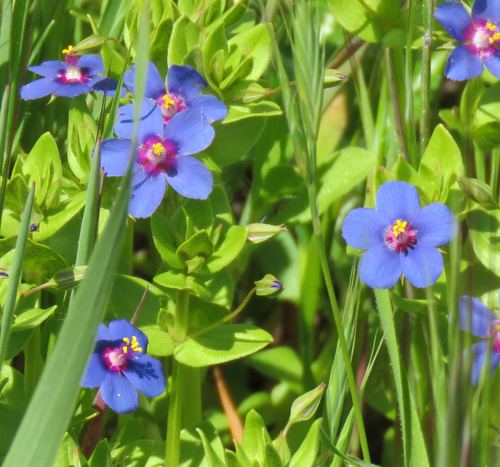 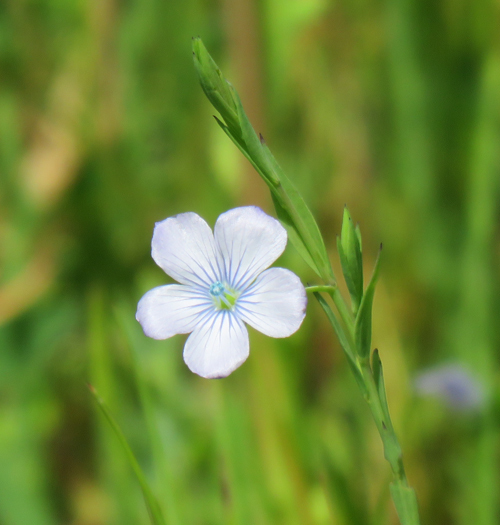 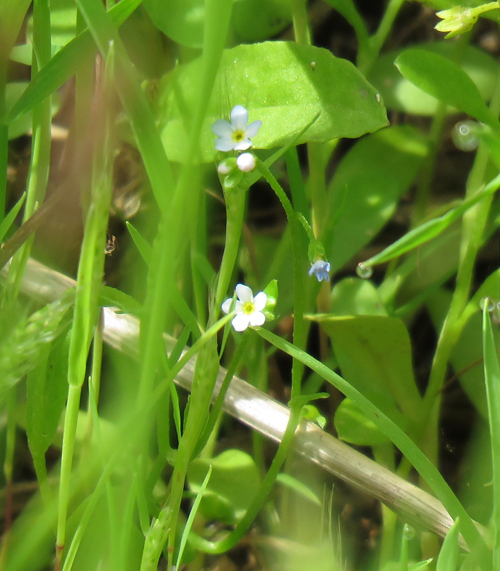 The Jersey Forget-me-not grows in wet meadows, river banks, pond edges and temporary pools. 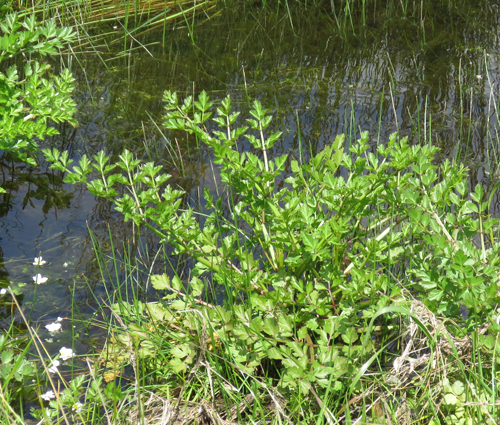 A water-loving plant. 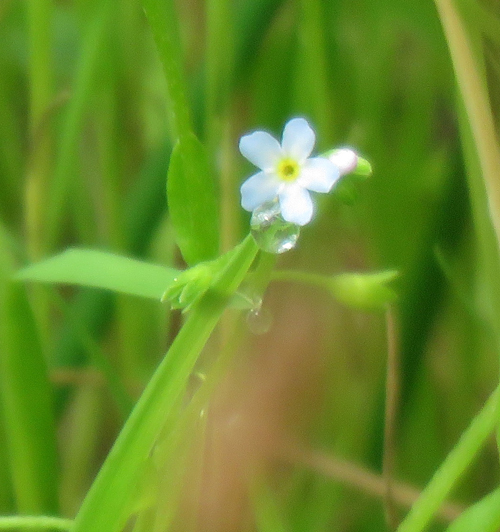 The flowers of this Forget-me-not are tiny. 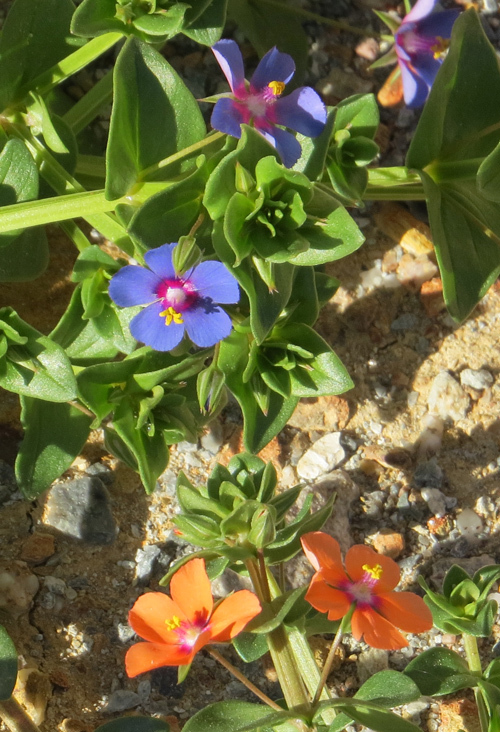 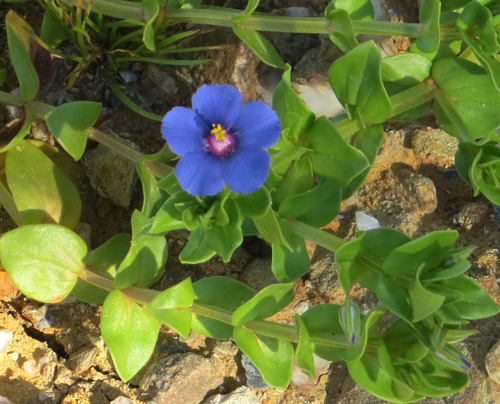 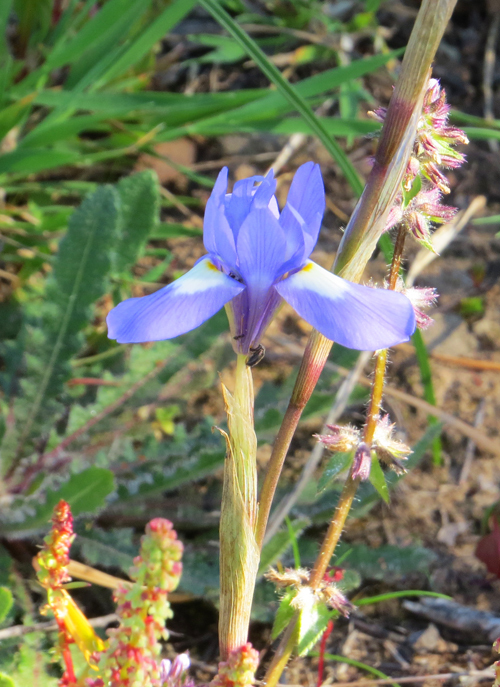 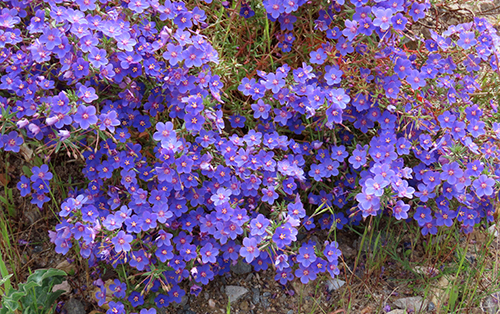 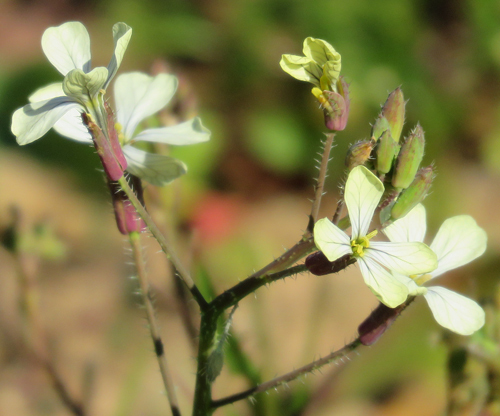 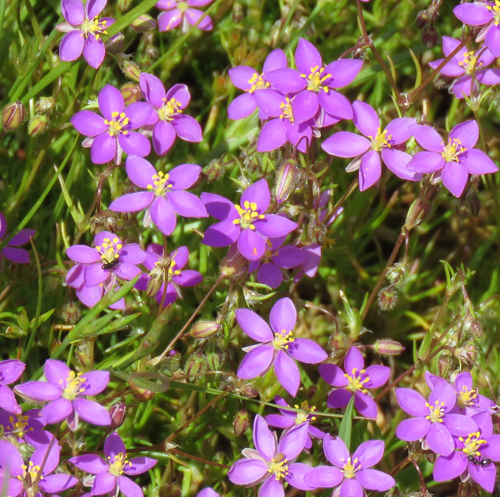 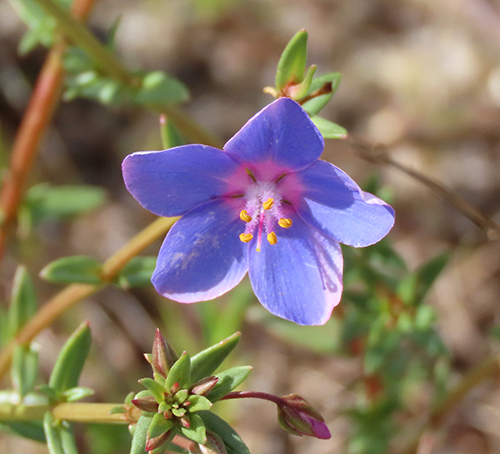 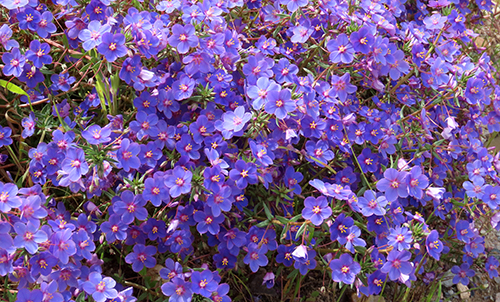 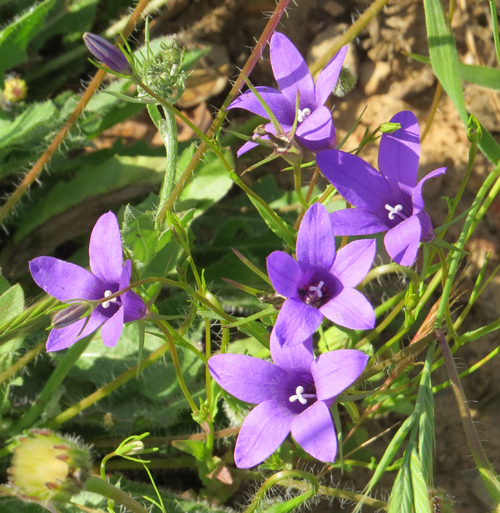 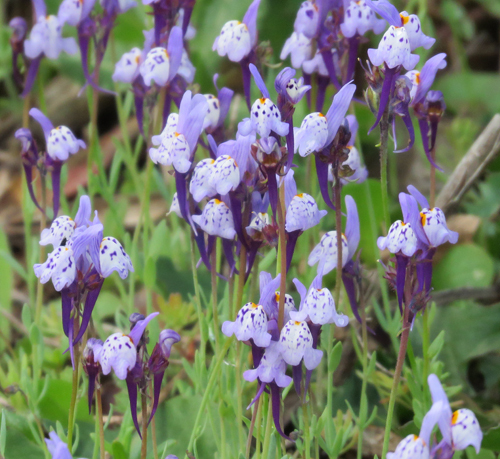 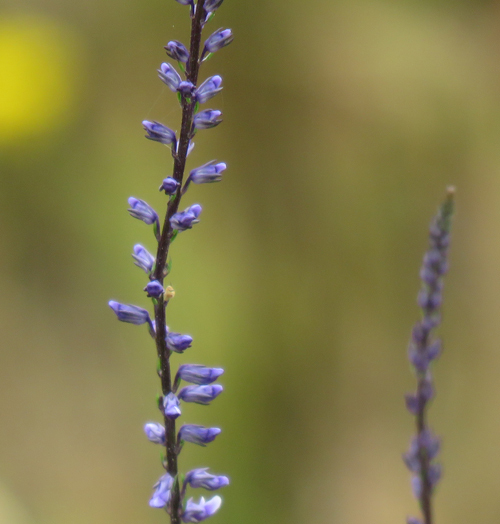 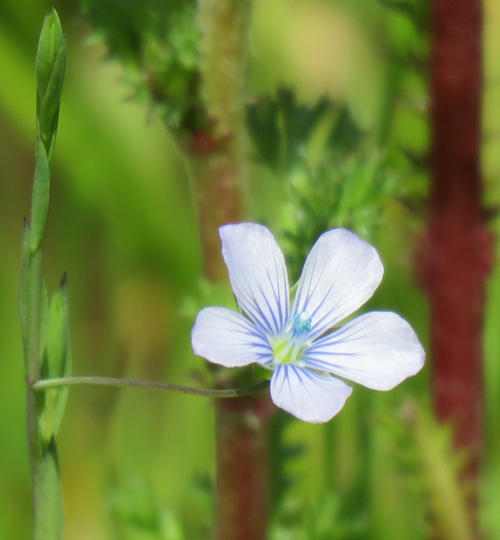 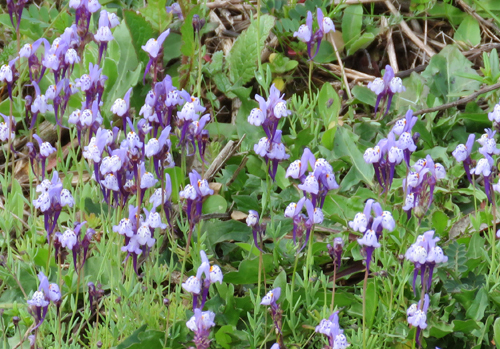 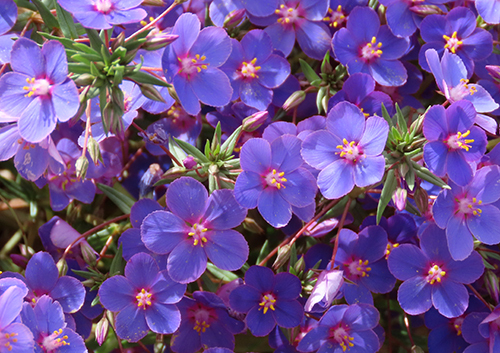 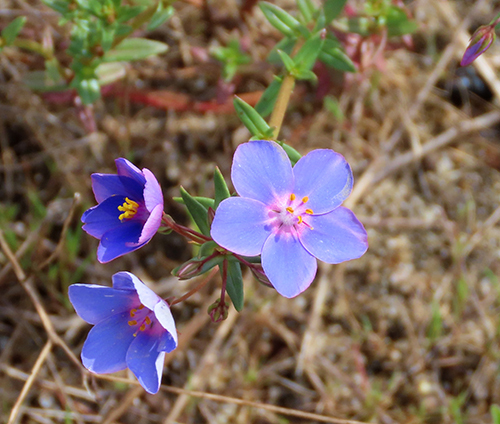 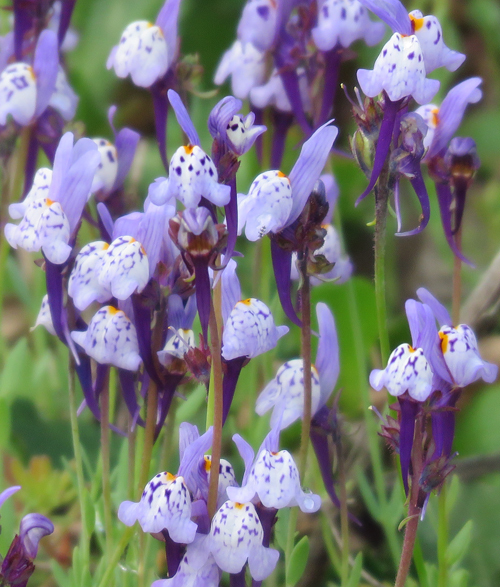 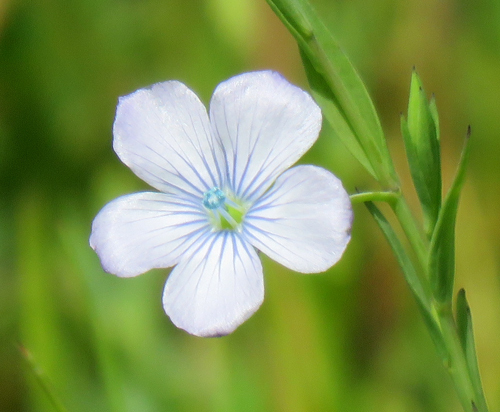 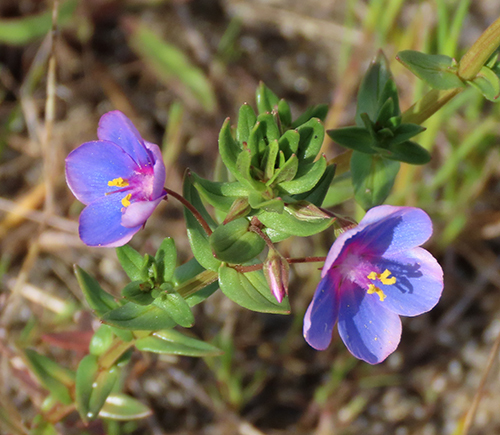 The Jersey Forget-me-not is endemic to the Mediterranean basin. 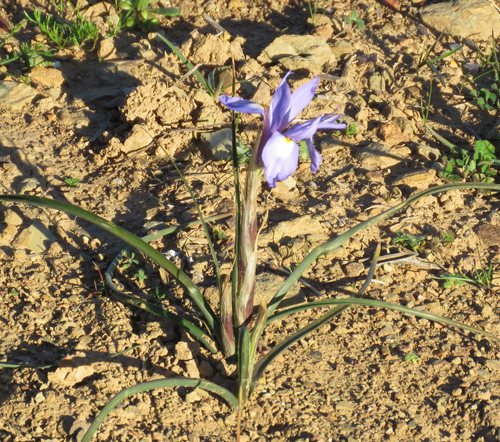 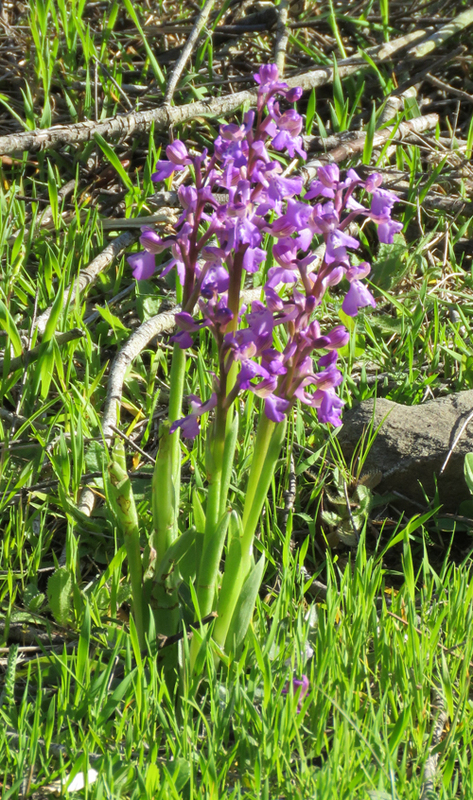 It is found in Portugal, Spain, Morocco and Algeria. 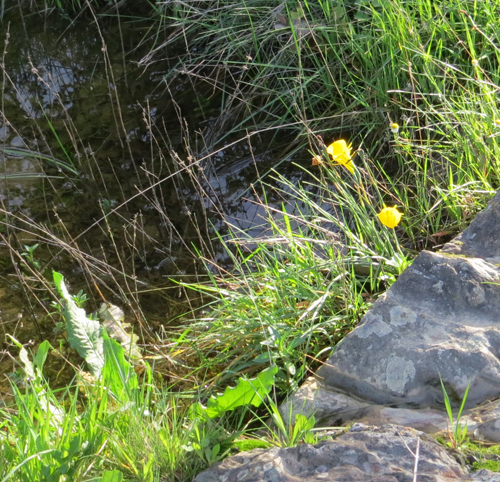 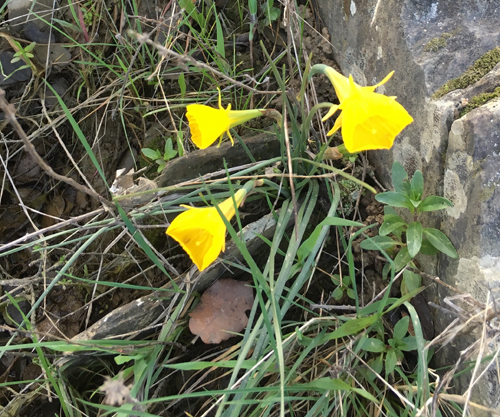 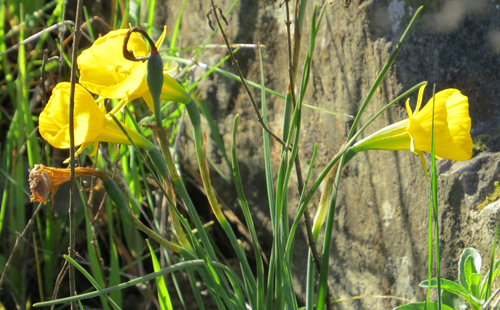 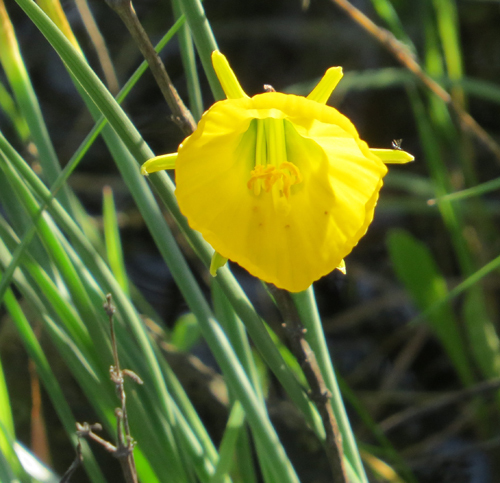 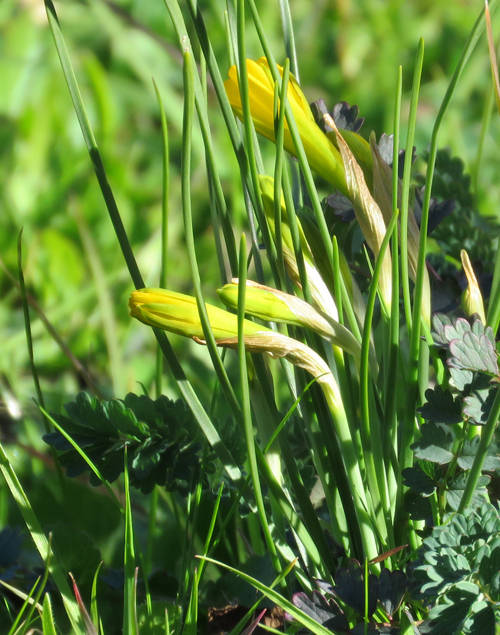 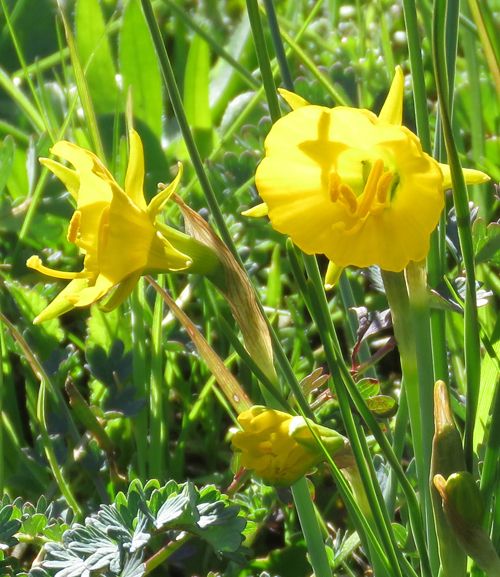 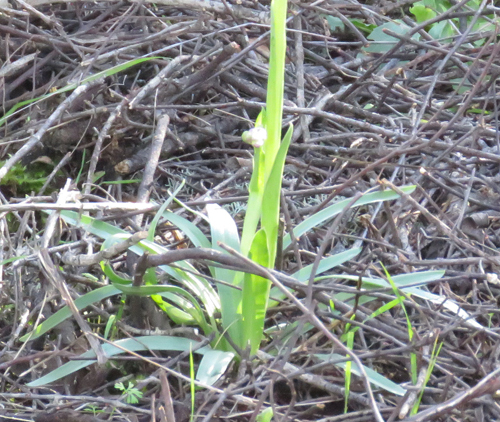 Photo showing the Narcissus growing in winterbourne stream. 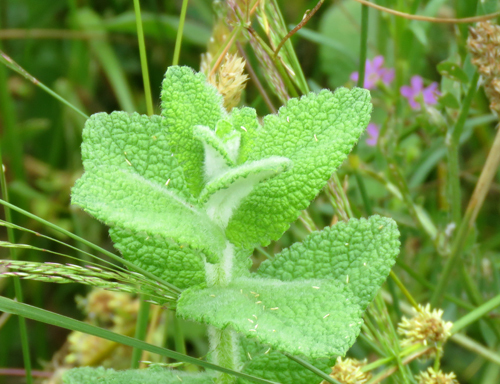 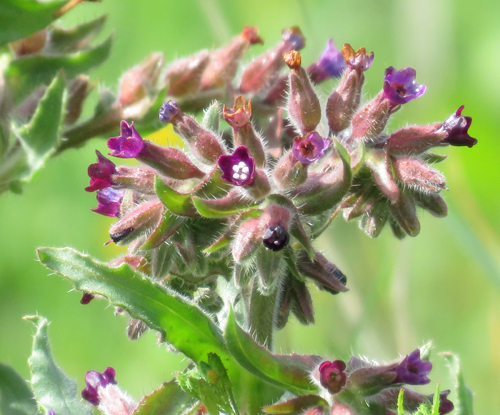 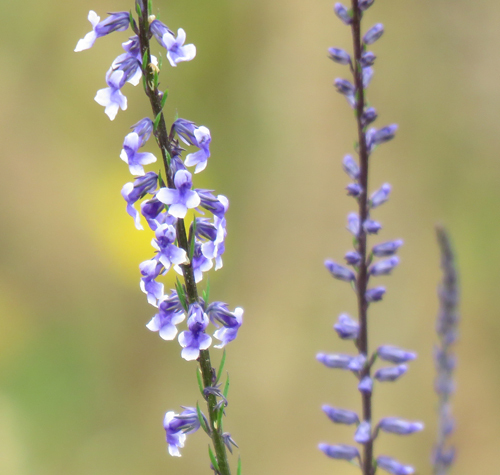 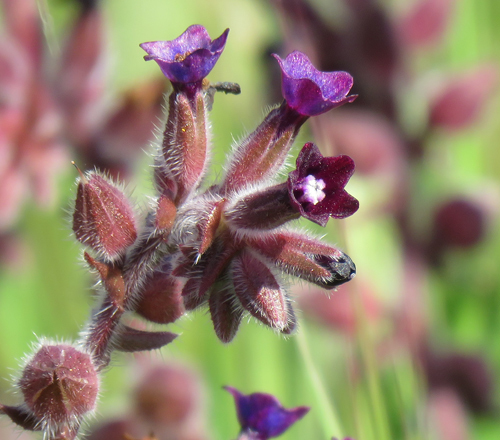 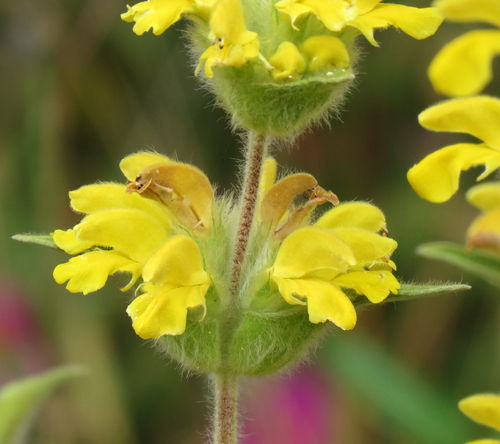 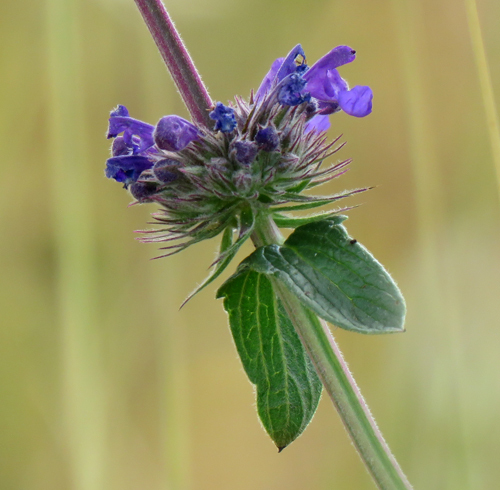 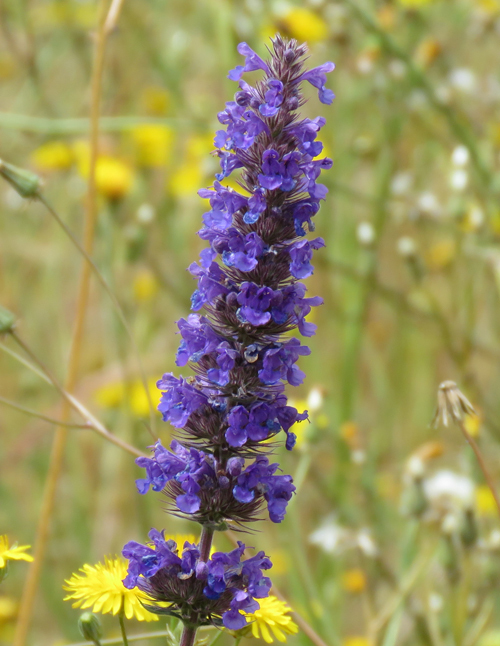 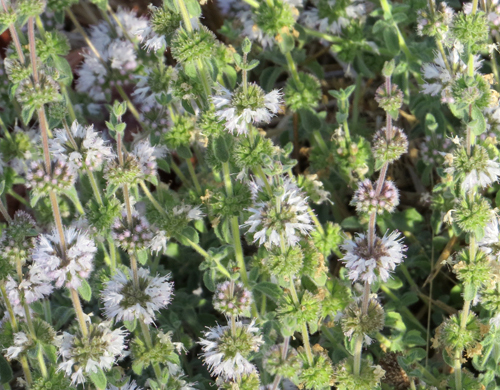 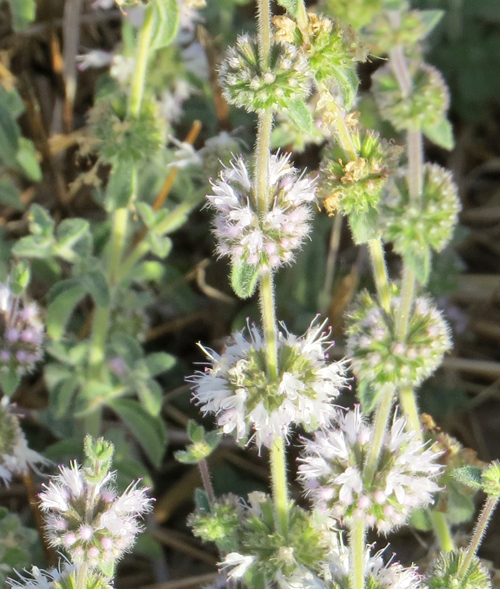 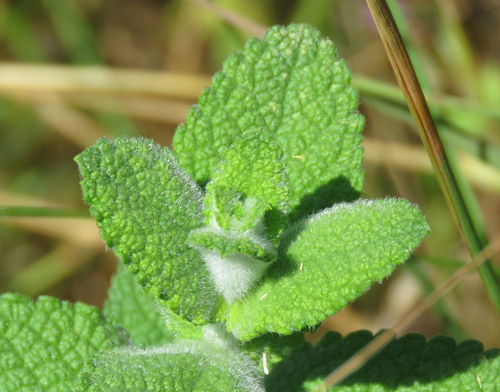 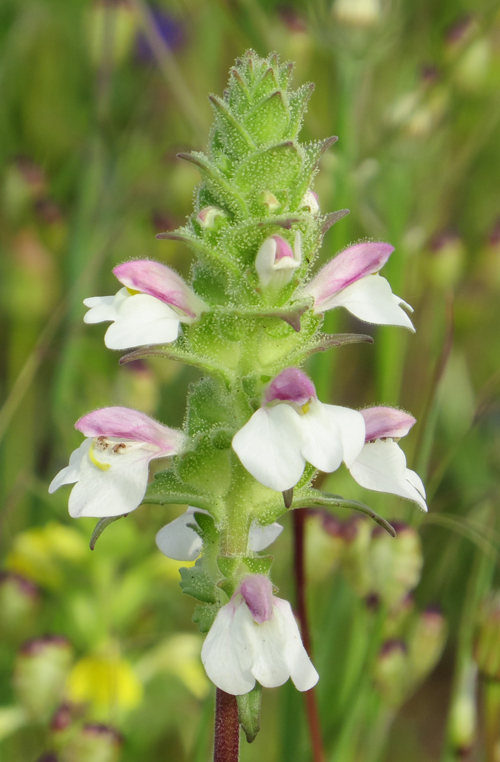 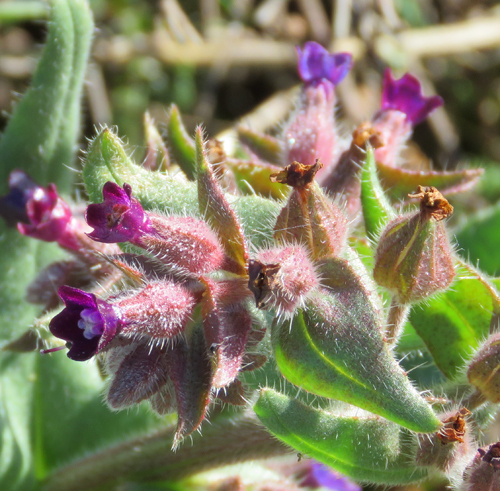 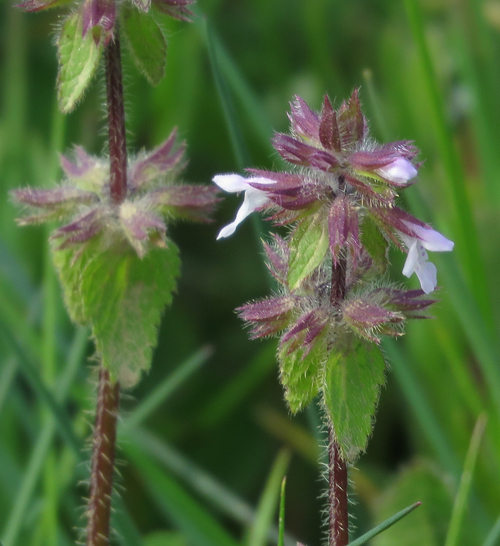 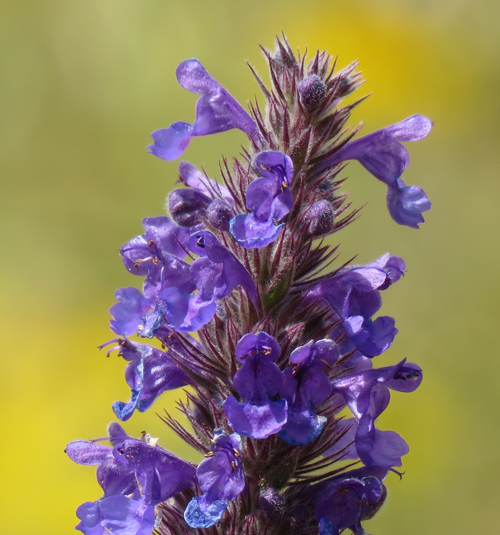 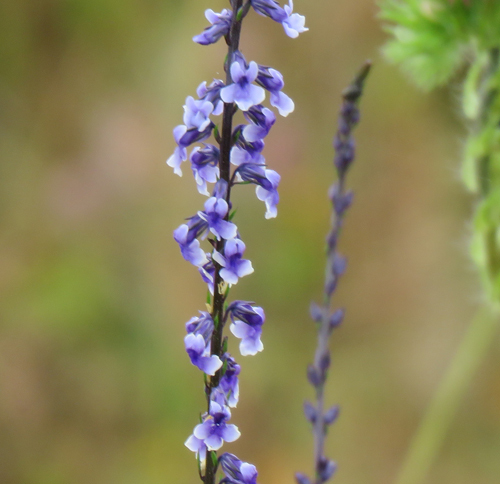 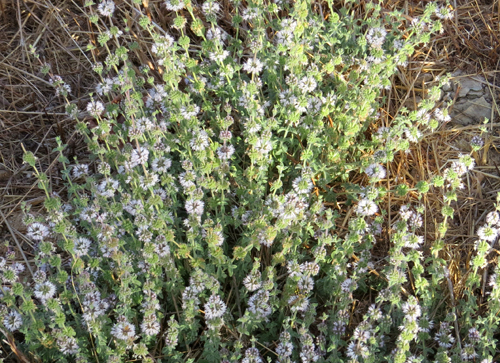 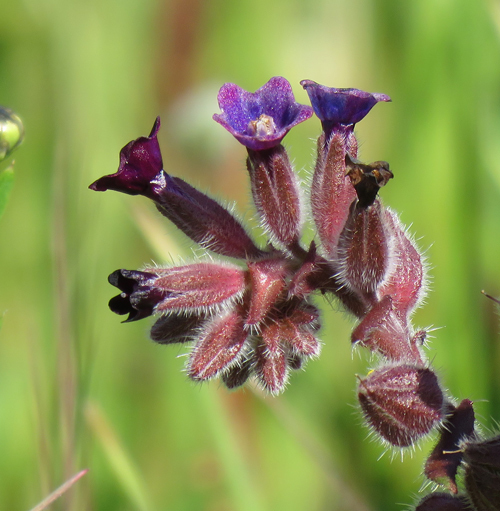 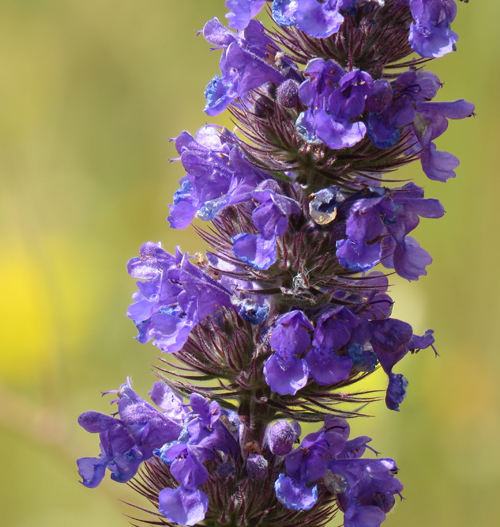 The English common name used here is a translation of an alternate (synonym) Latin binomial name, Nepeta lusitanica, meaning Portuguese Catmint. 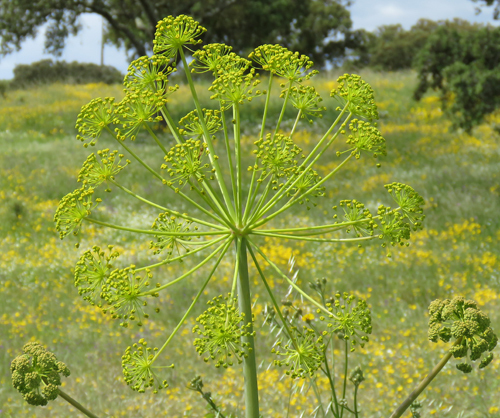 Lusitanica was the Roman name for Portugal. 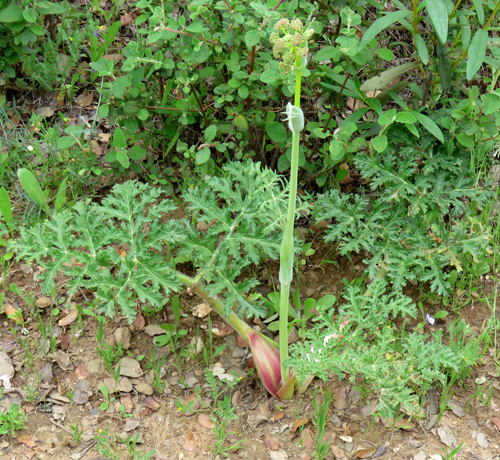 This species also occurs in Spain, Morocco and Algeria. 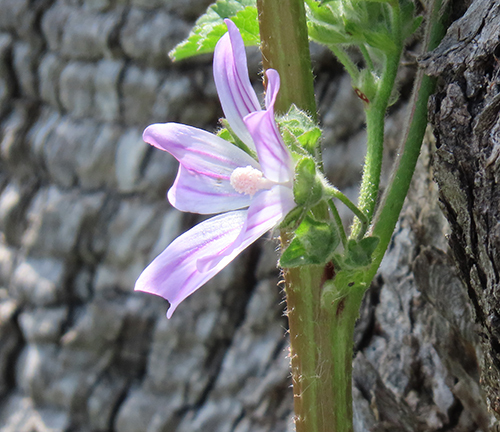 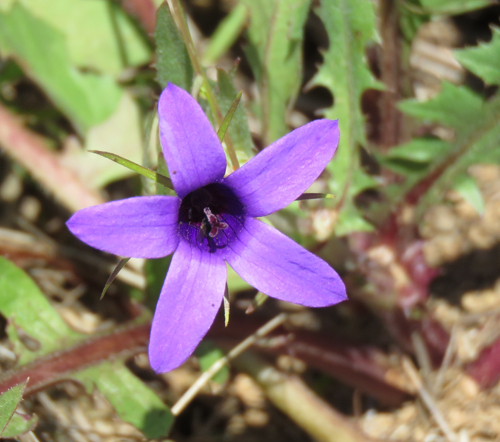 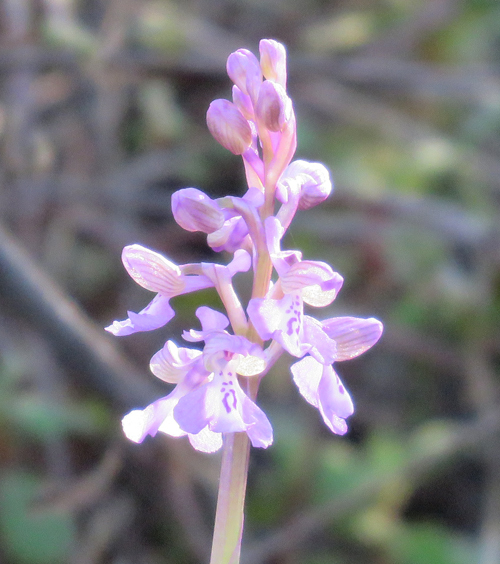 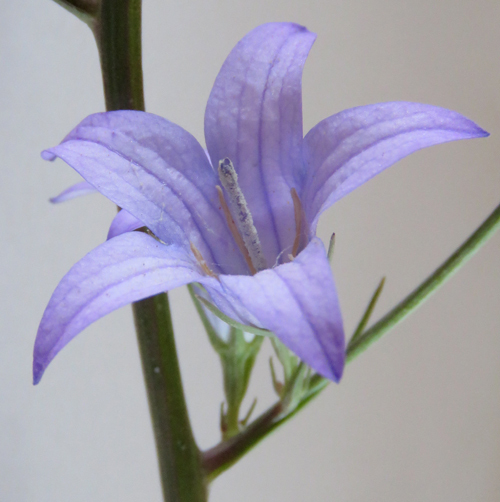 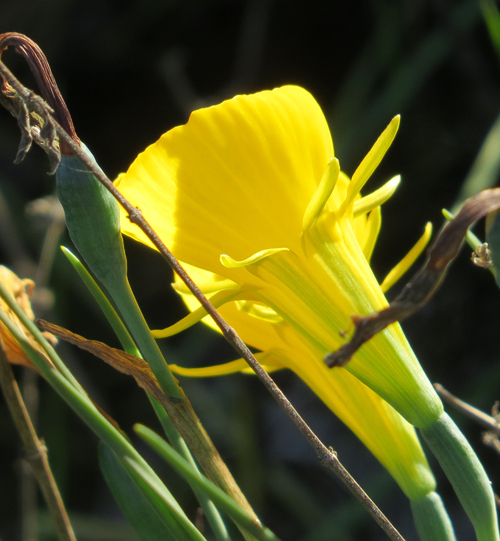 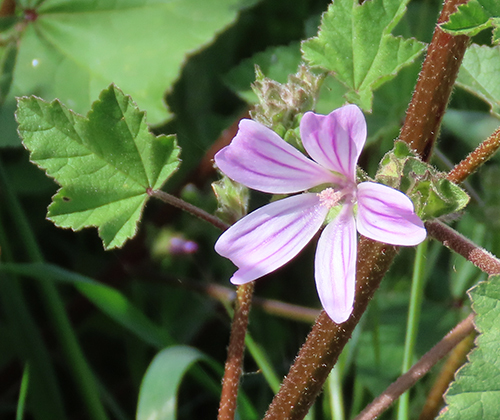 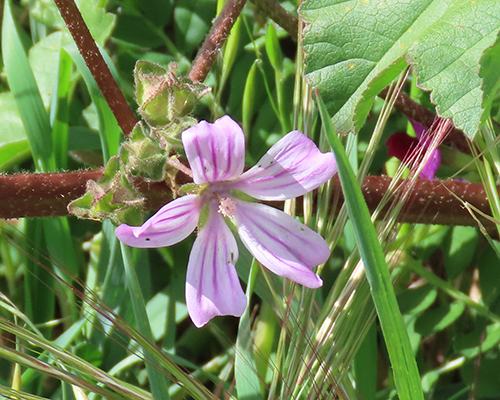 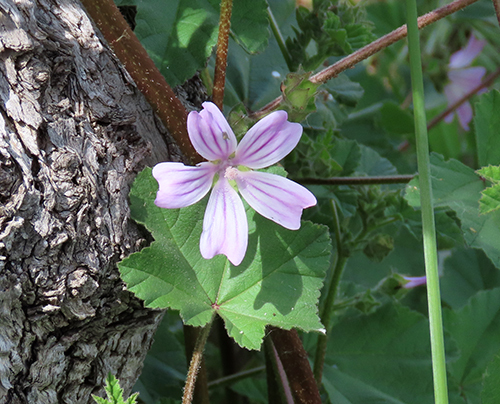 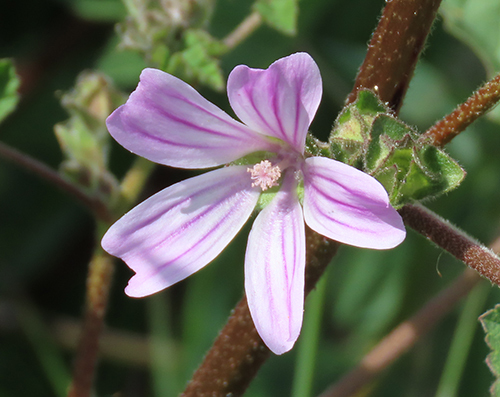 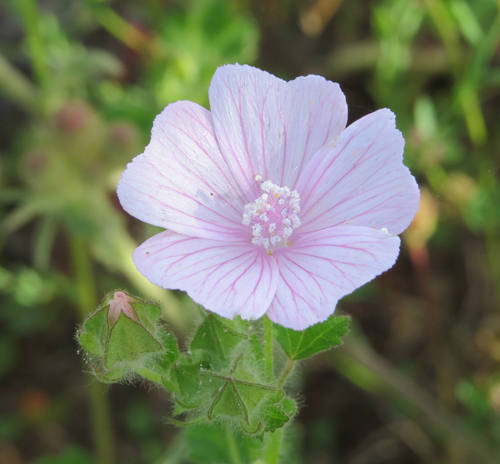 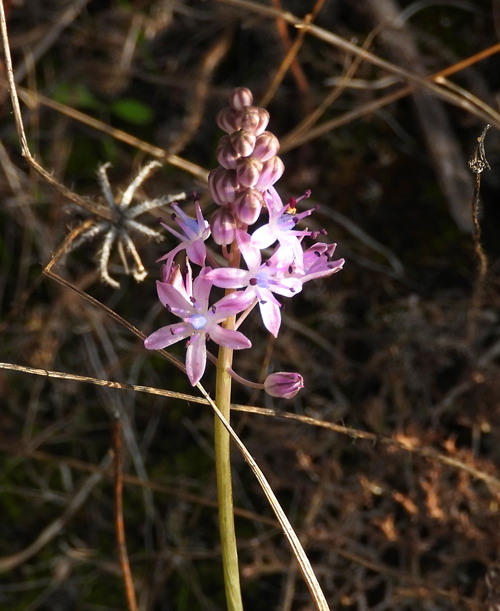 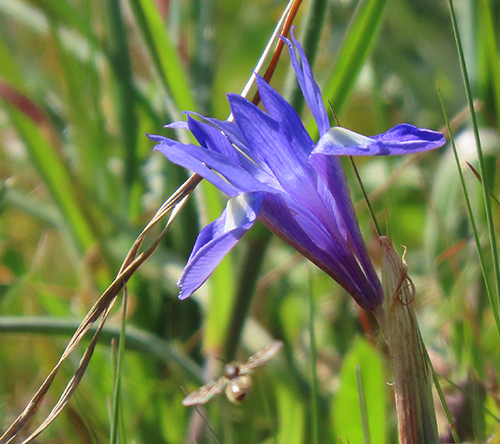 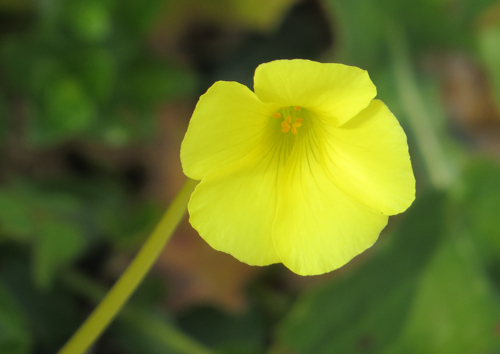 The Latin binomial name refers to the many flower bracts. 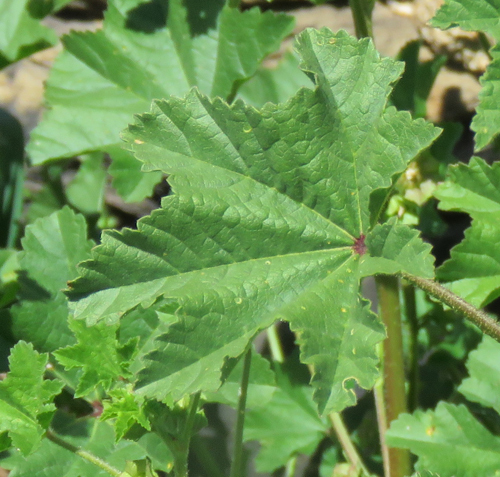 Luxuriant and vigorous leaf growth. 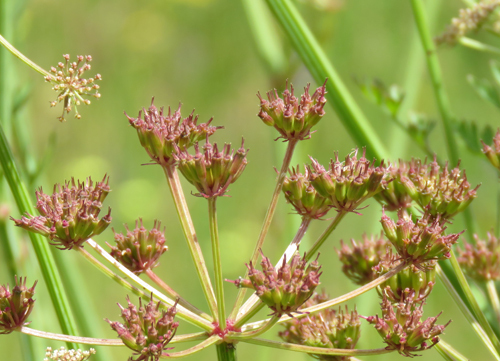 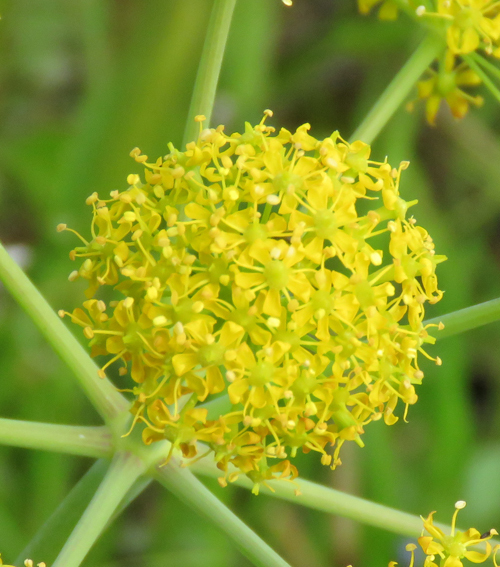 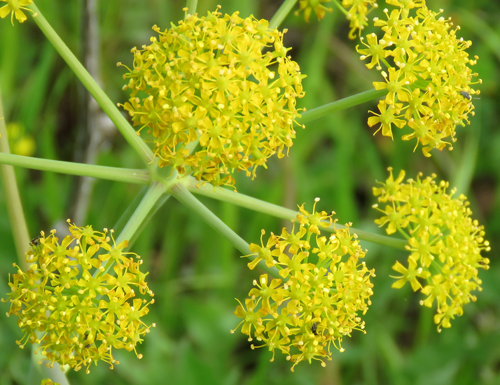 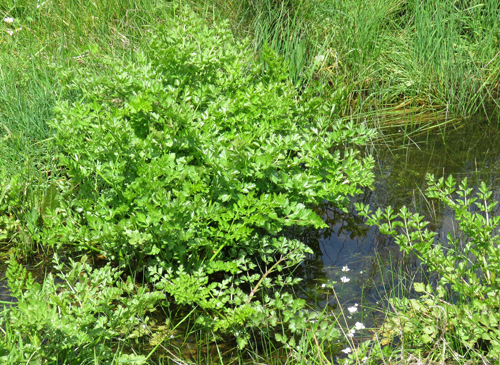 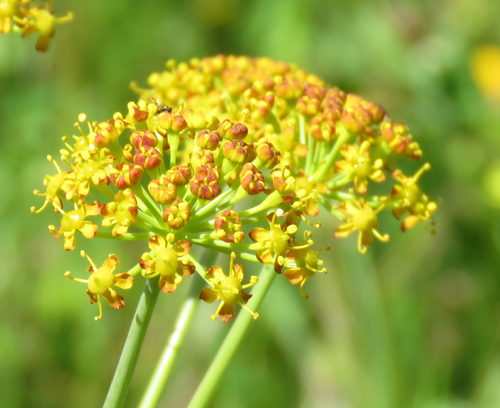 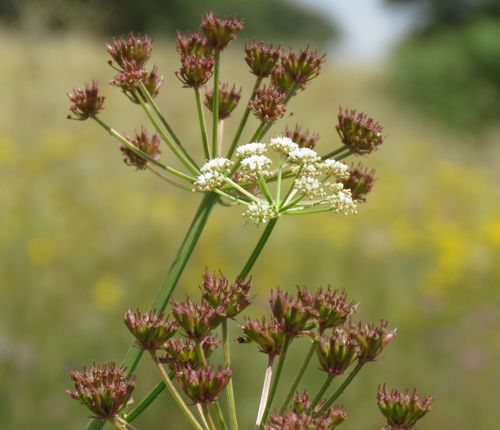 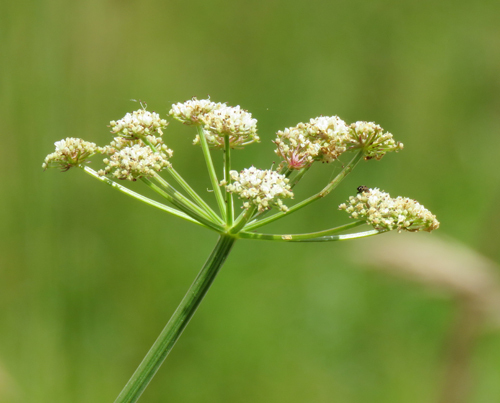 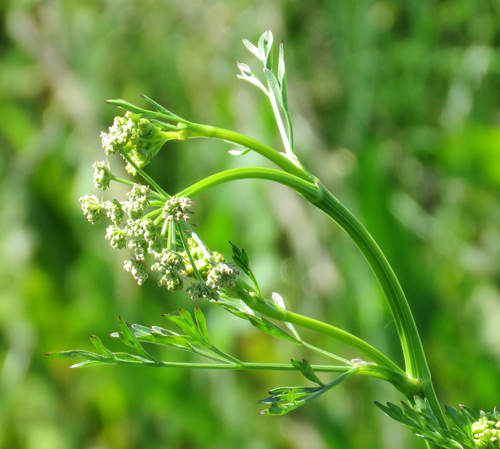 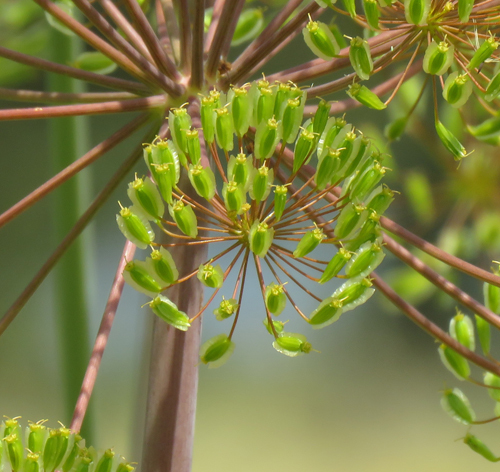 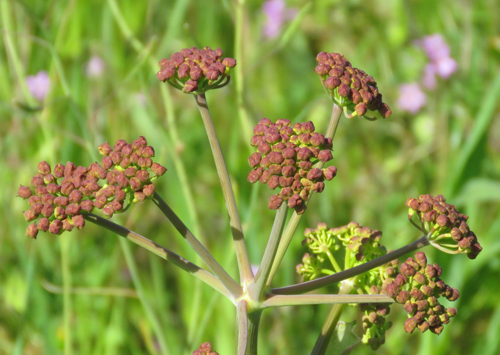 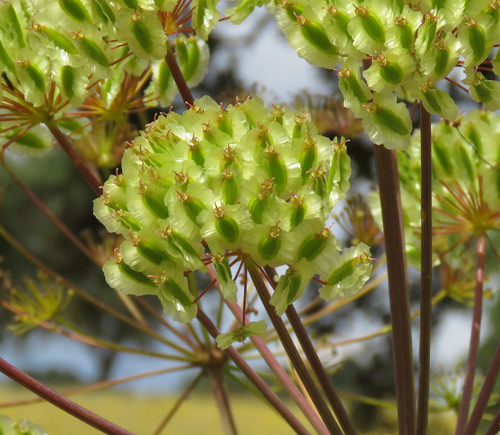 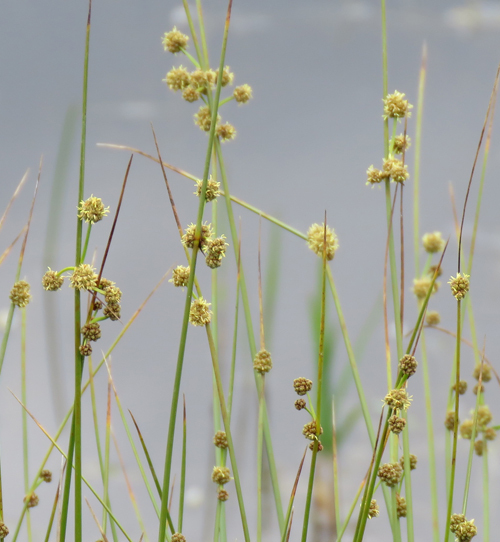 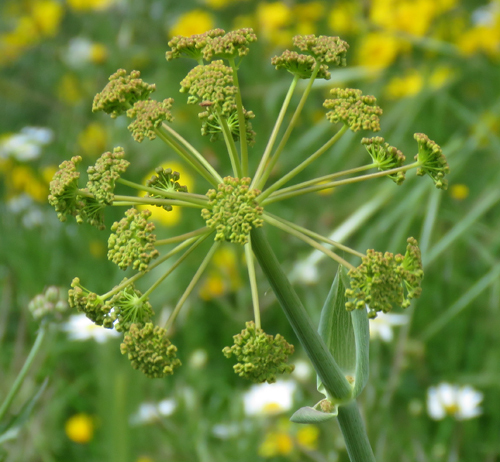 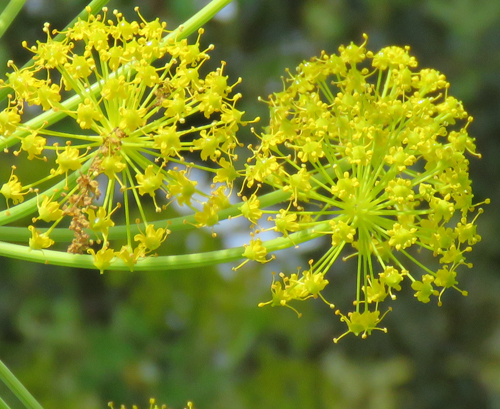 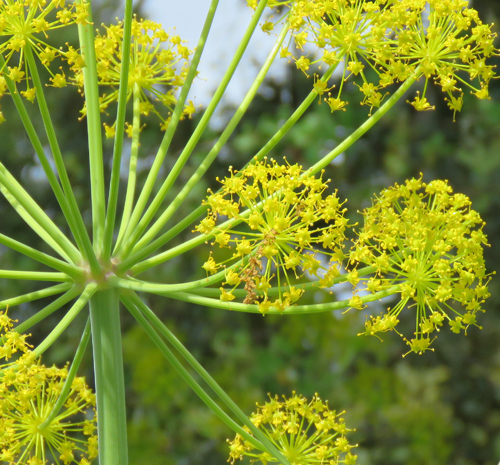 This species of umbellifer is water-loving and lives in our river. 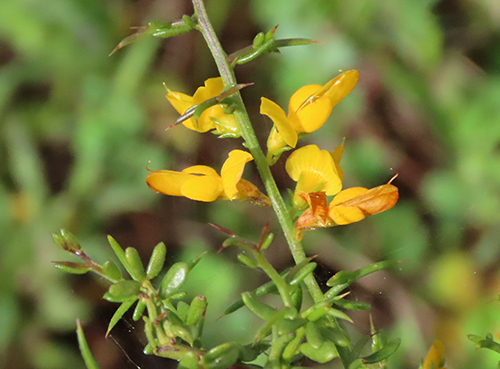 The common English name used here is a translation of one of the Portuguese common names, Unha gata, which means Cat Claw. 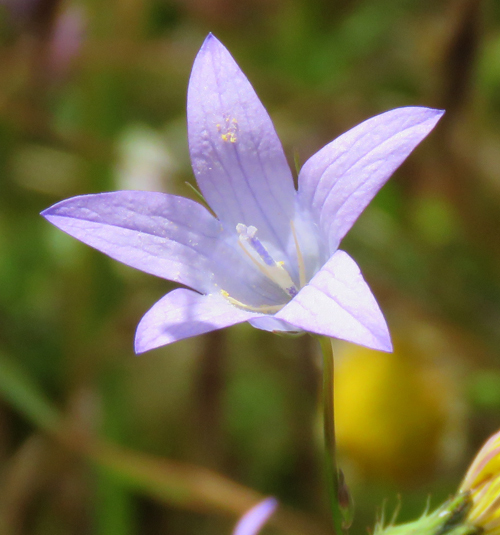 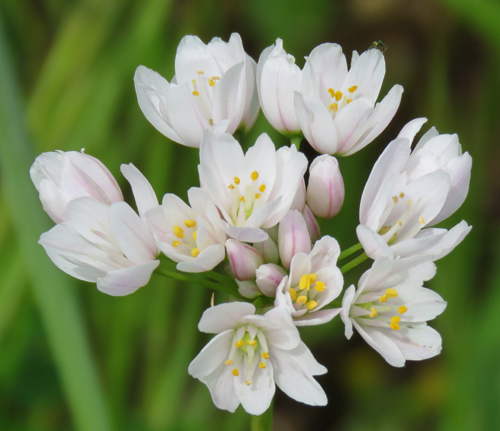 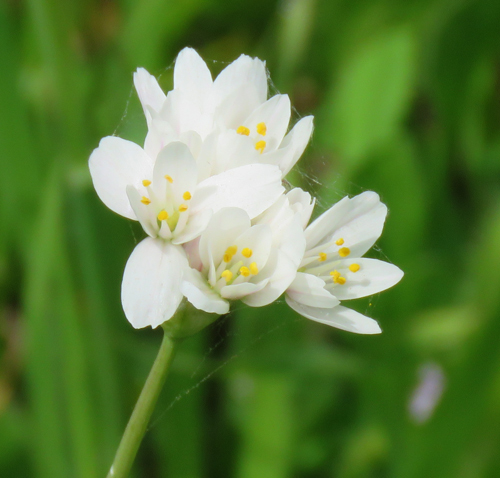 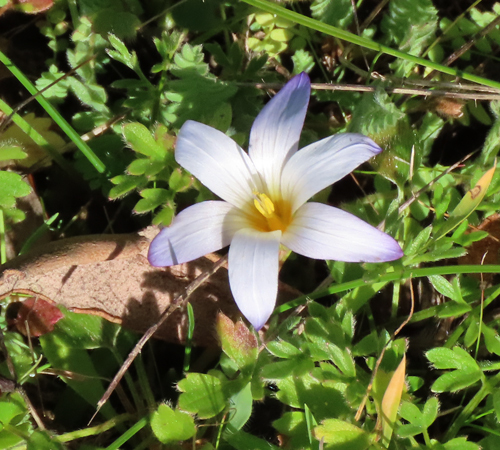 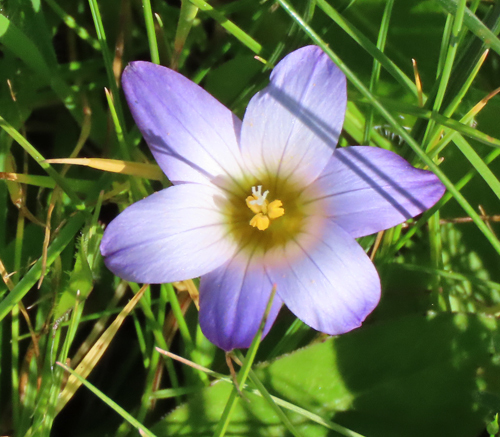 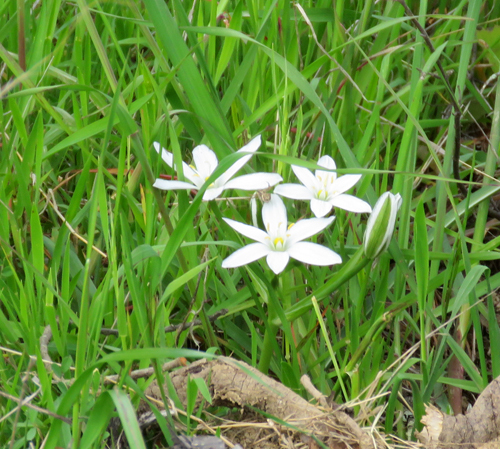 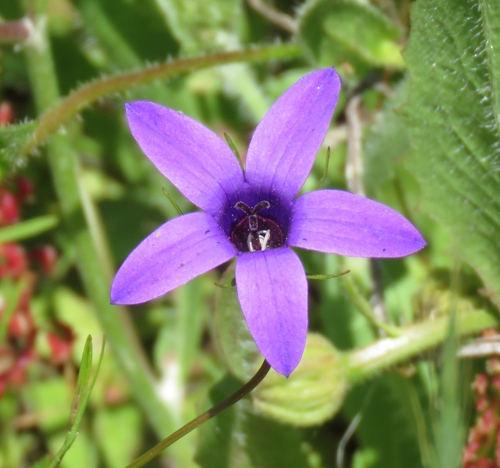 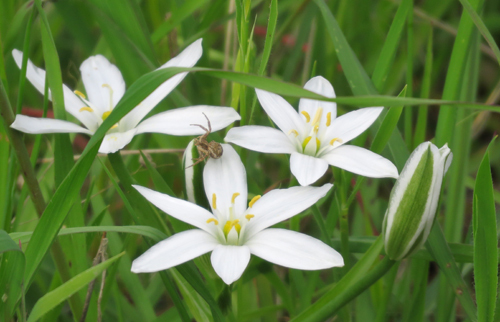 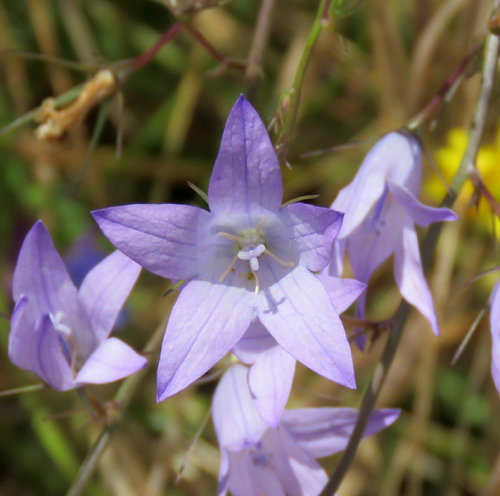 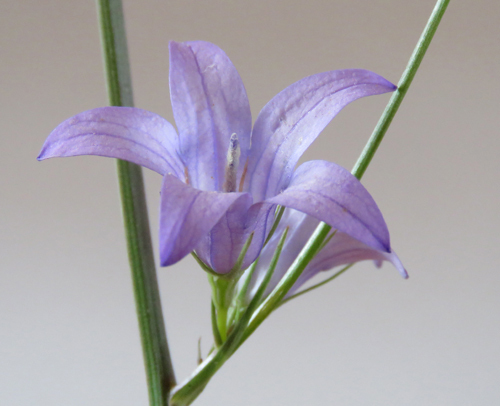 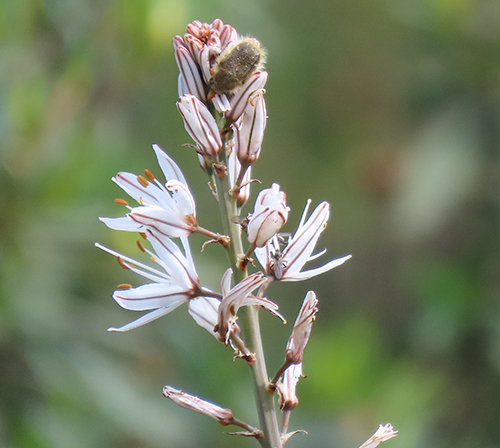 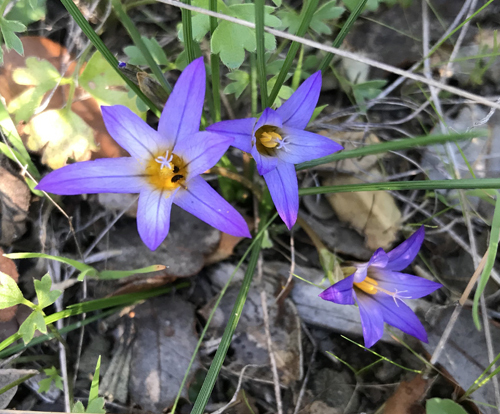 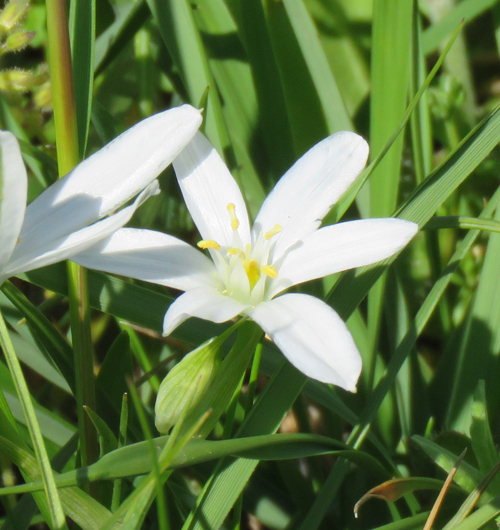 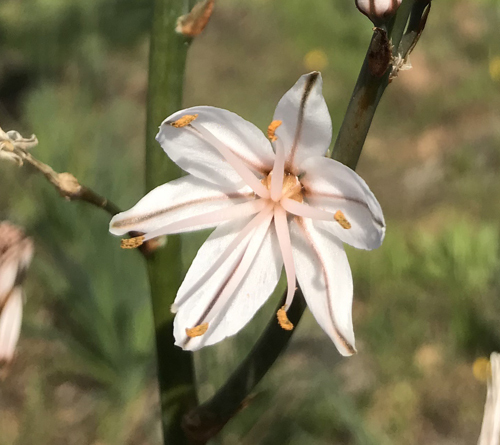 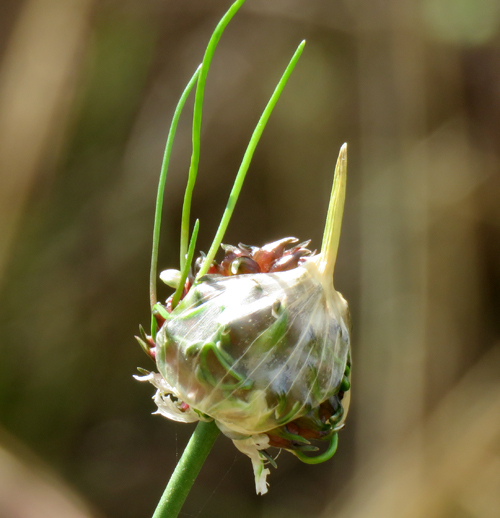 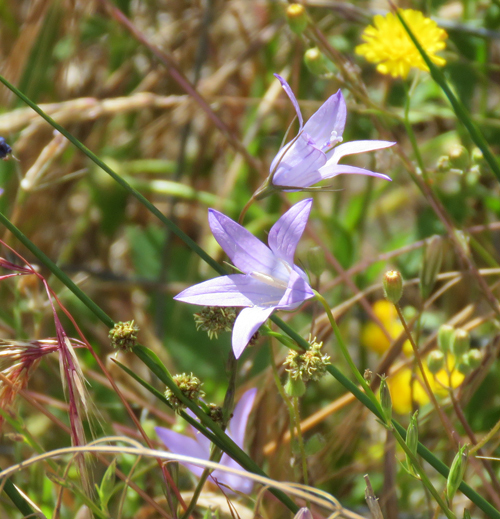 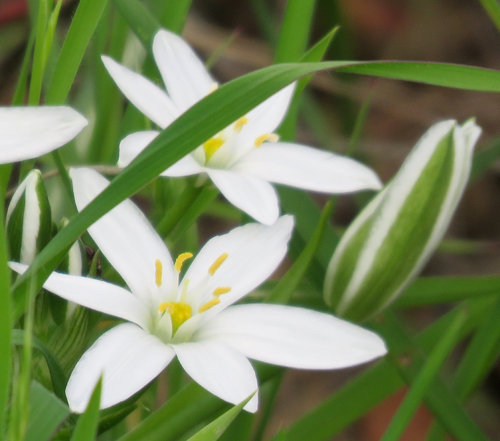 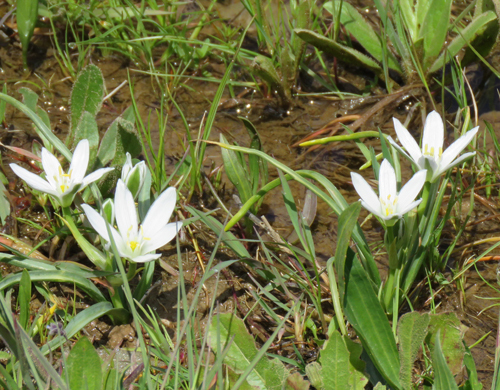 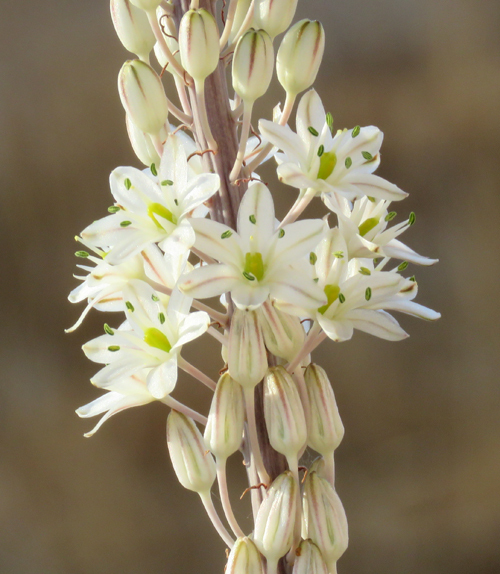 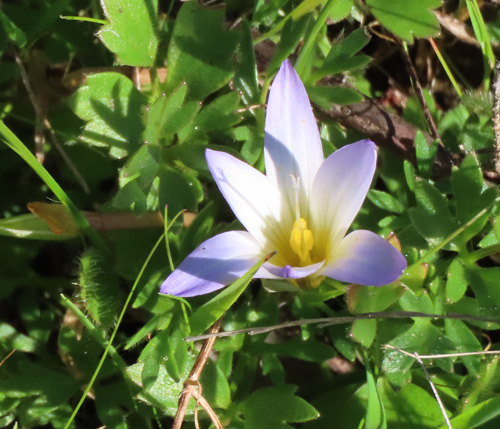 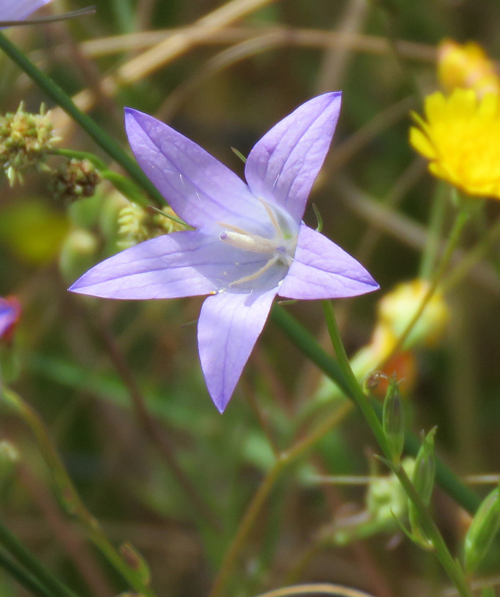 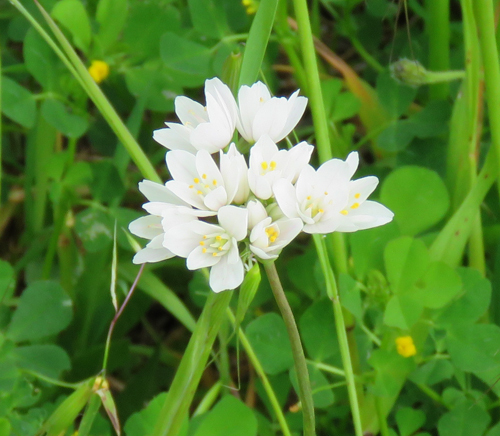 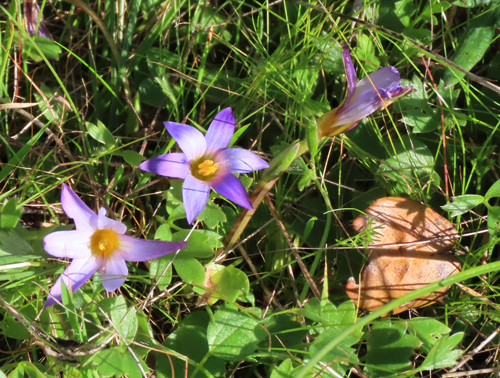 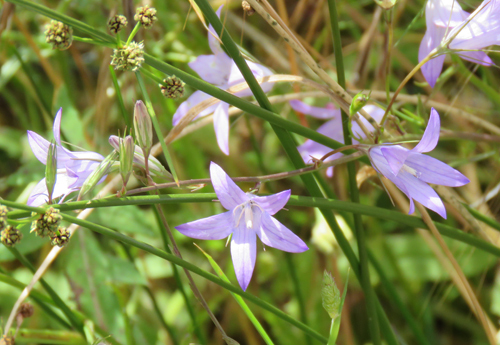 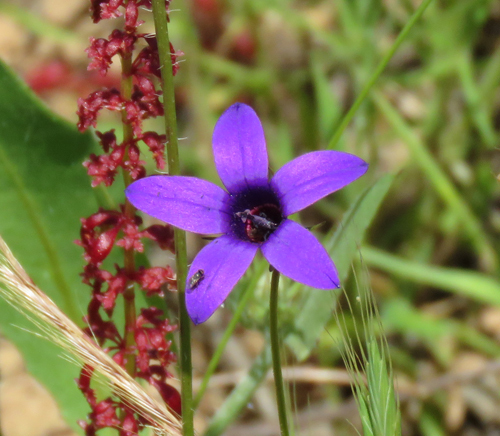 Star of Bethlehem flowers with a Crab Spider. 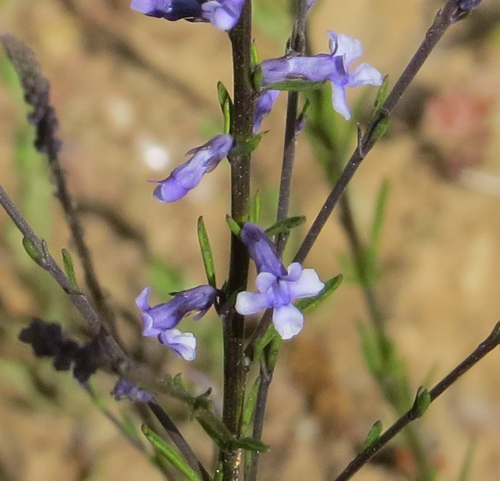 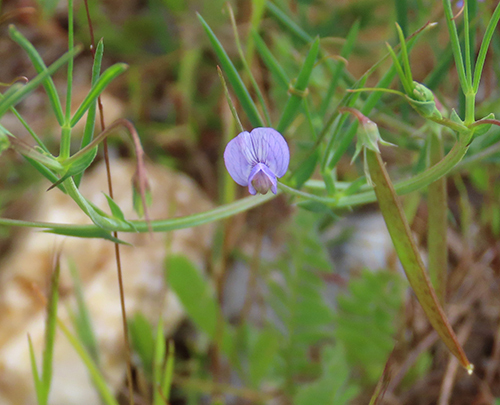 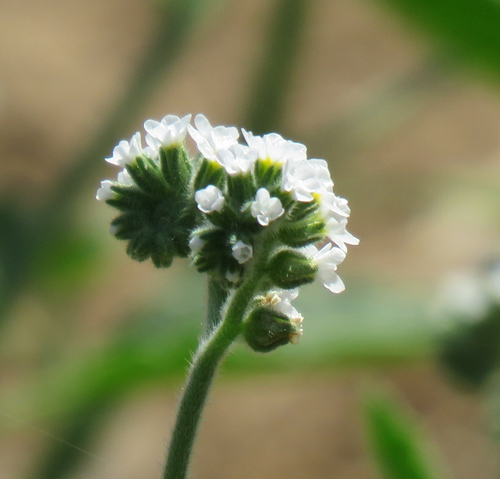 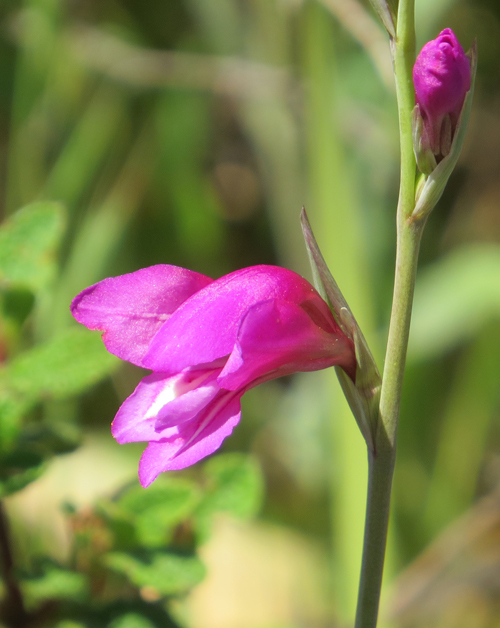 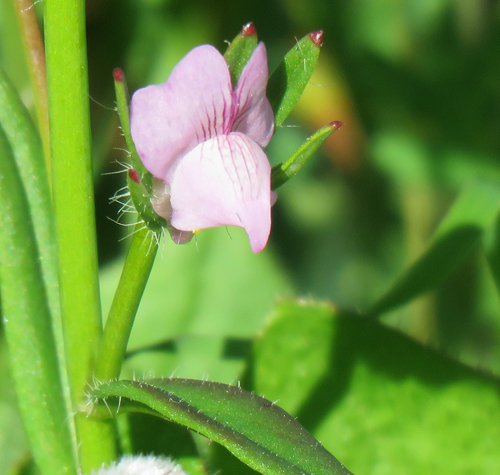 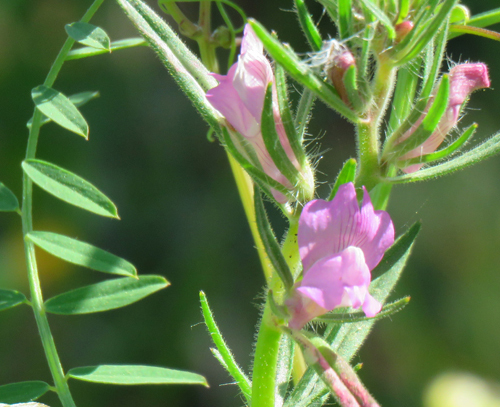 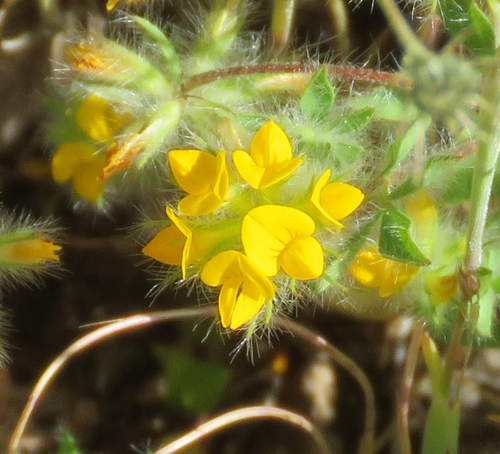 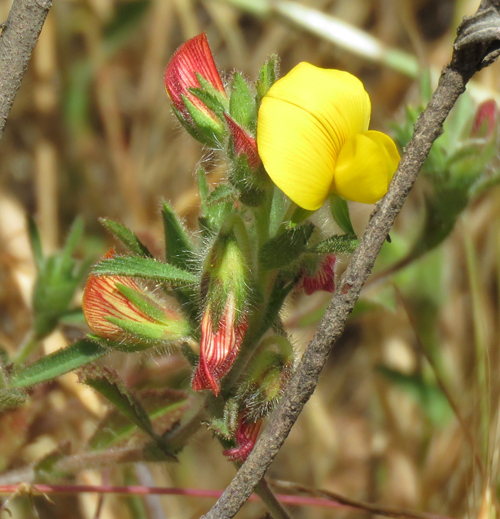 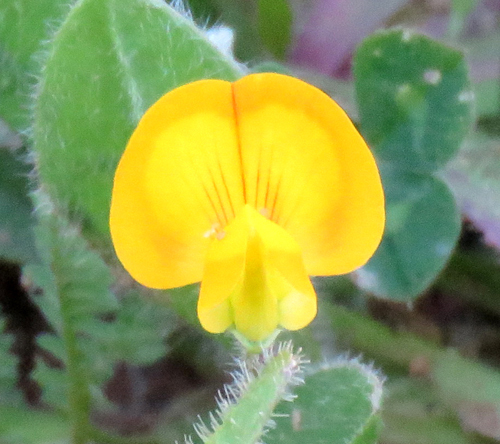 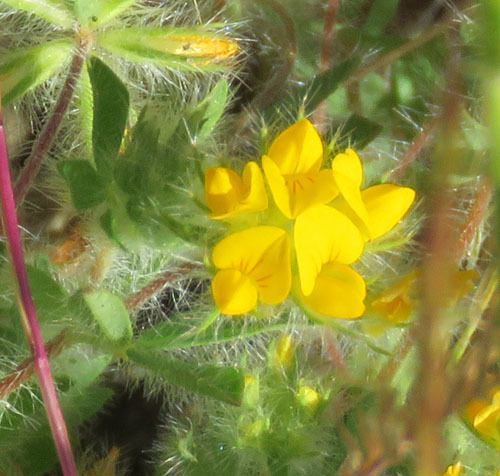 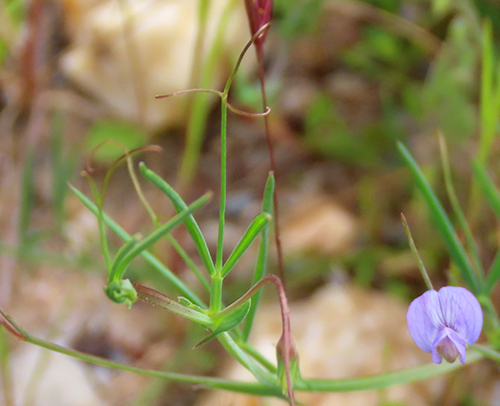 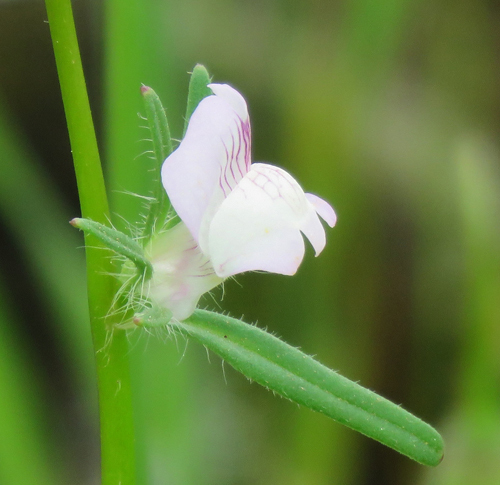 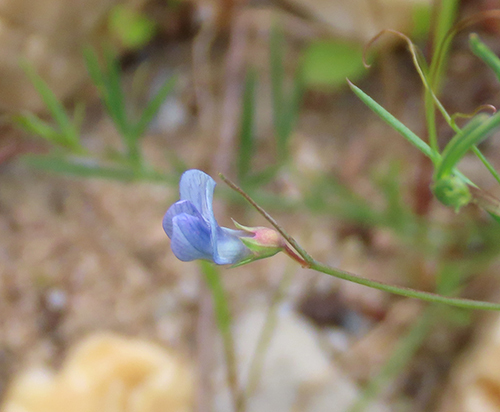 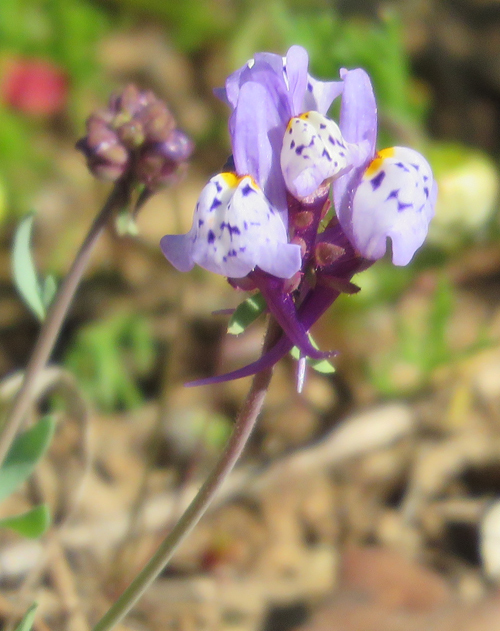 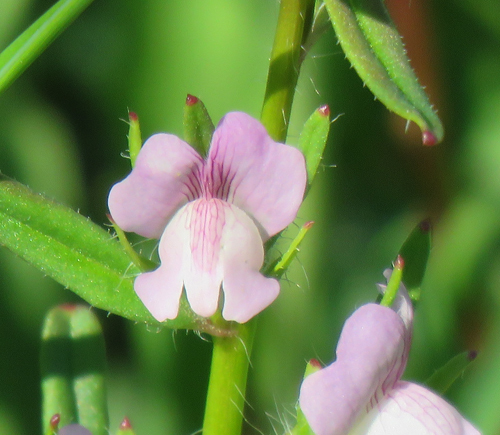 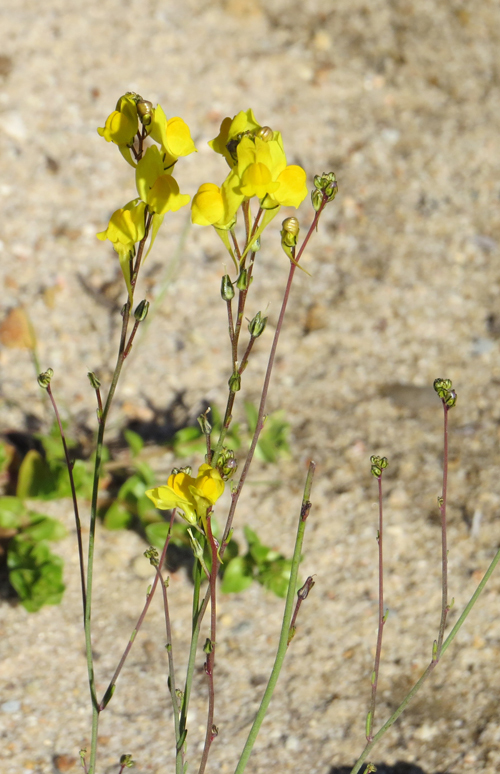 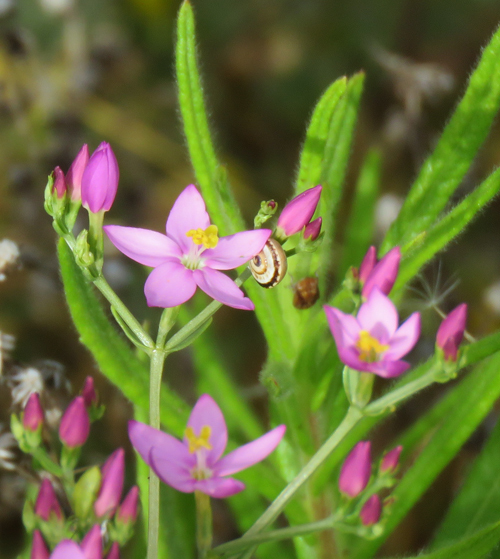 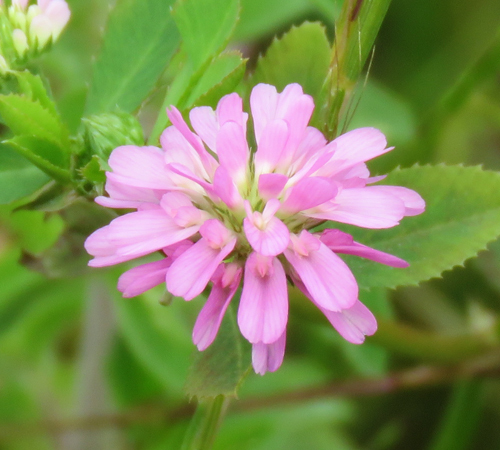 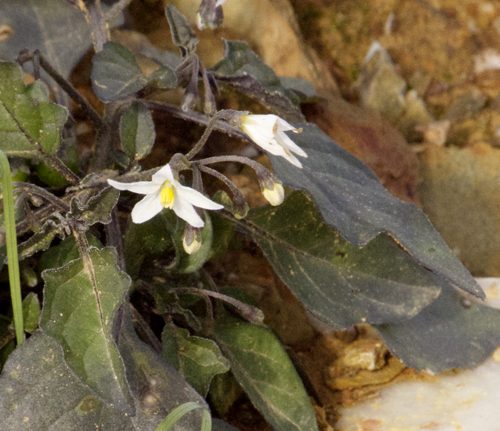 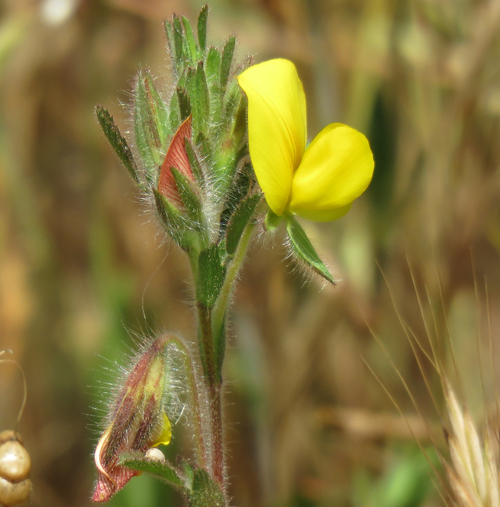 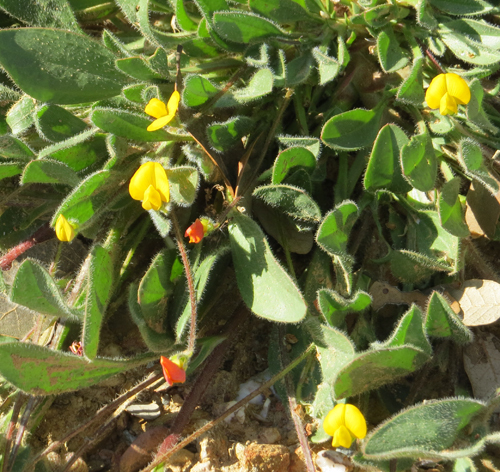 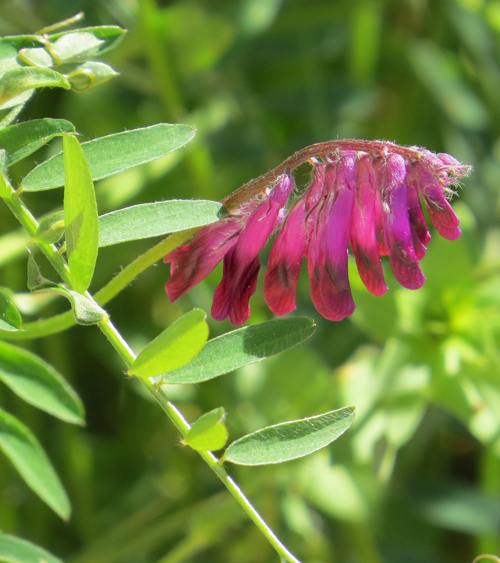 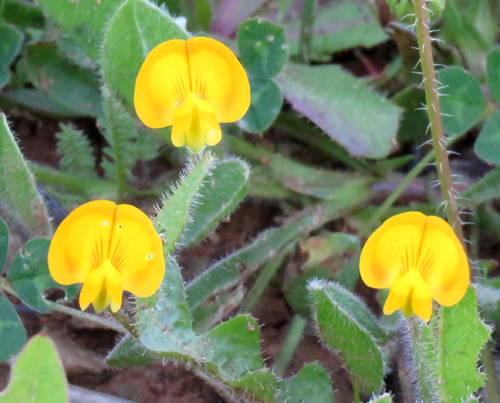 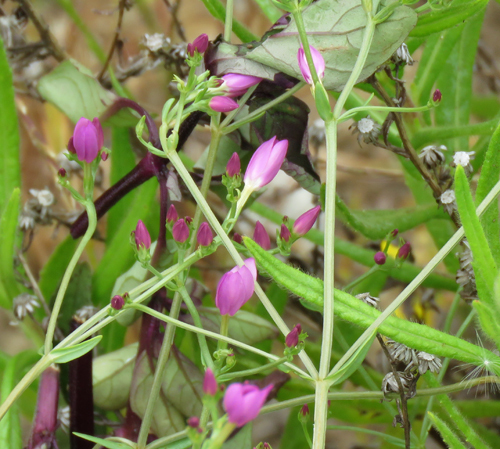 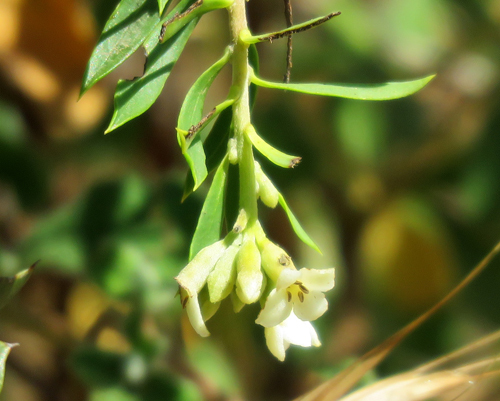 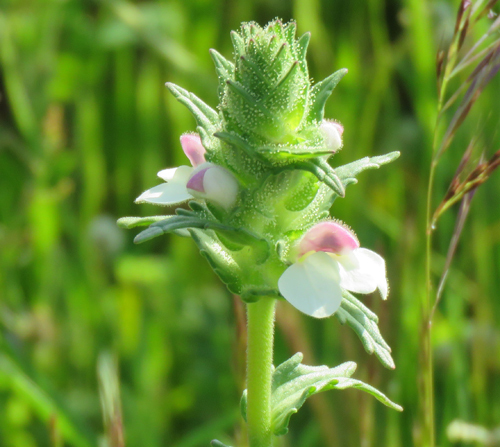 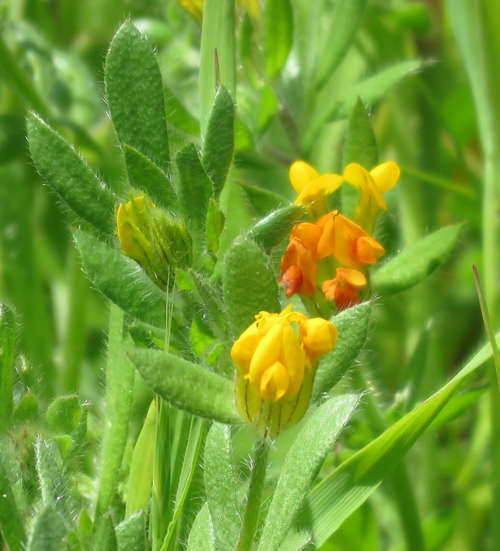 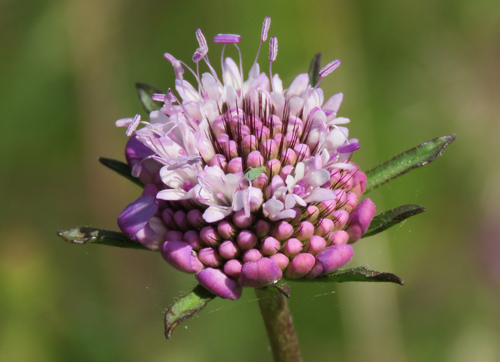 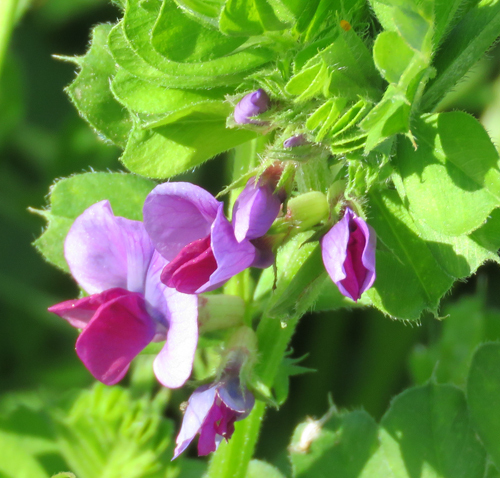 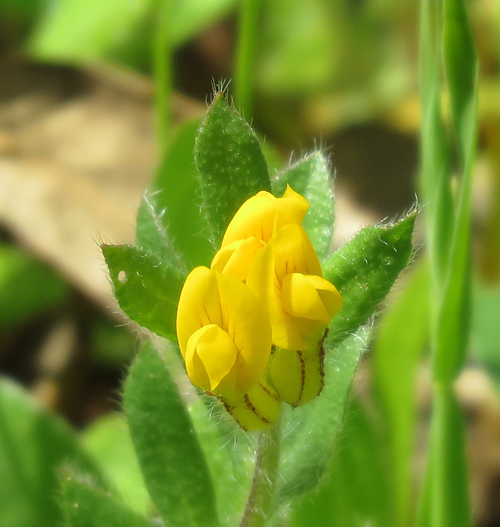 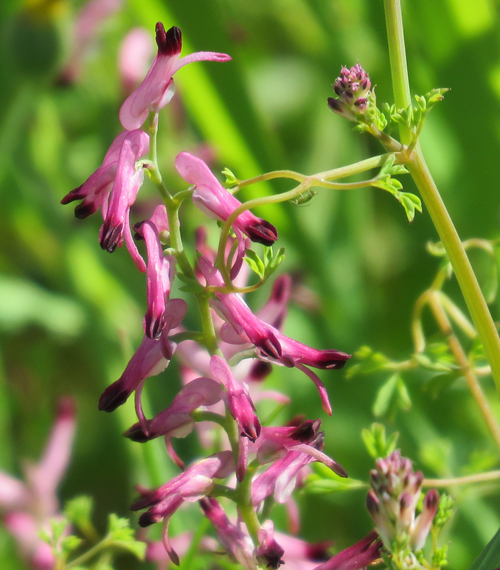 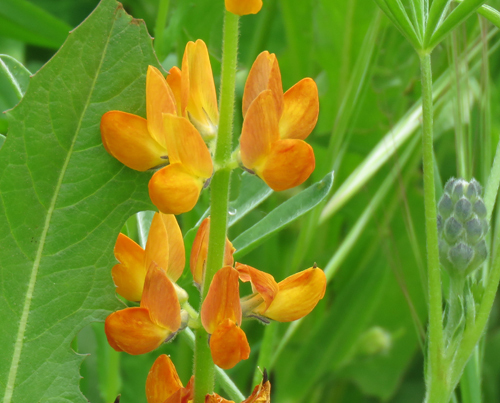 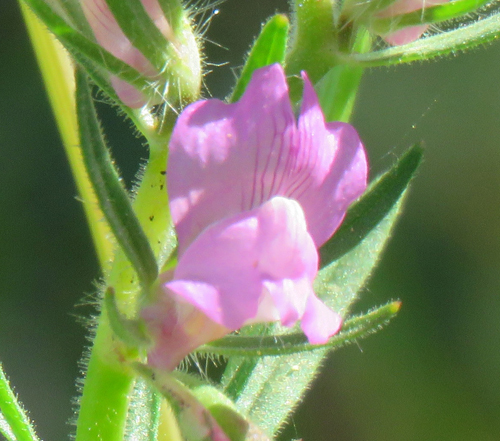 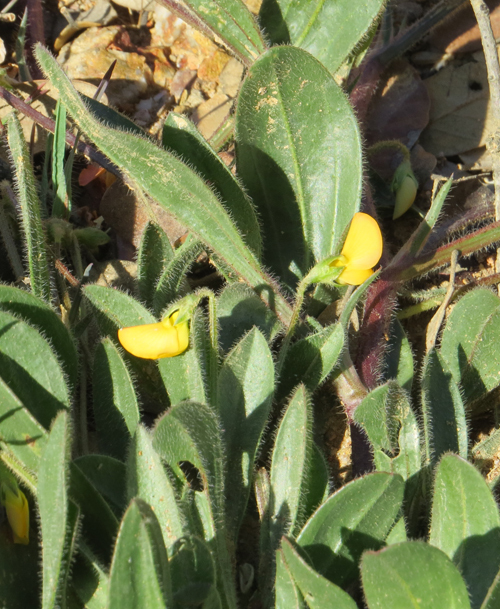 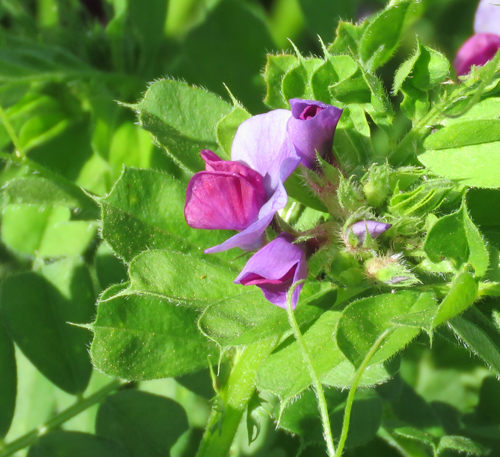 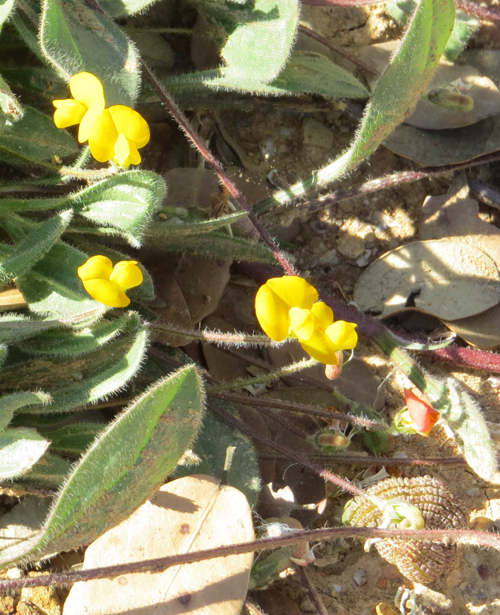 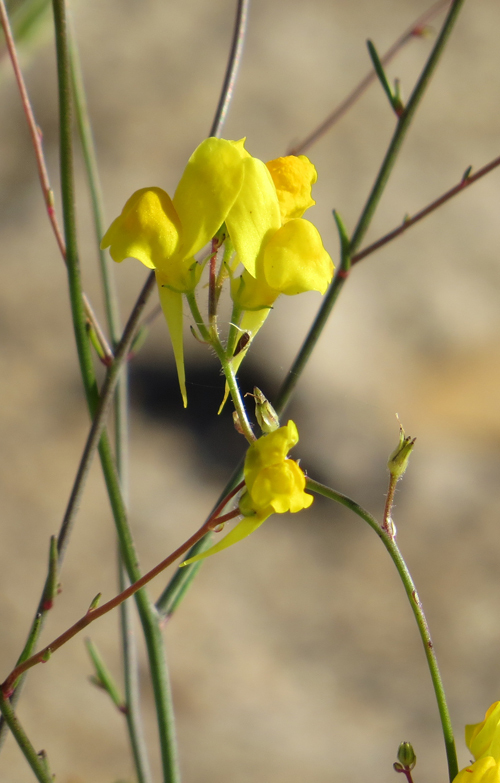 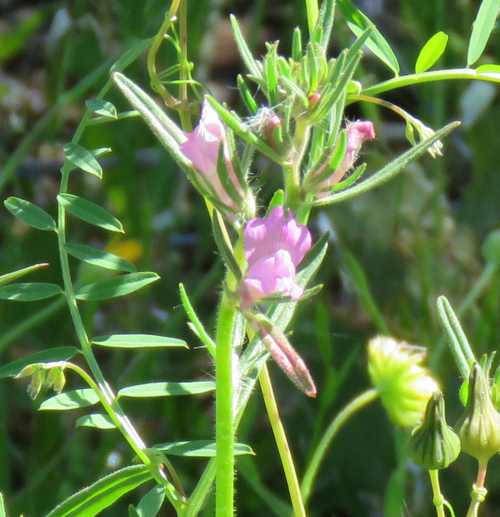 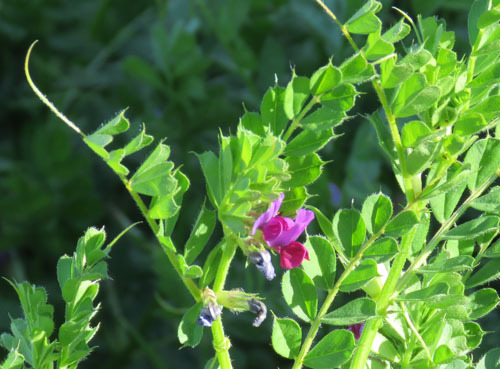 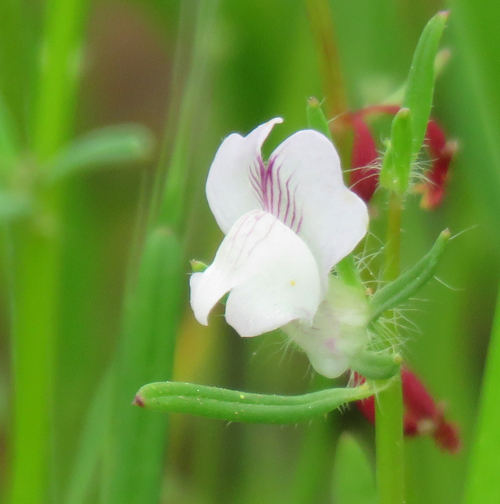 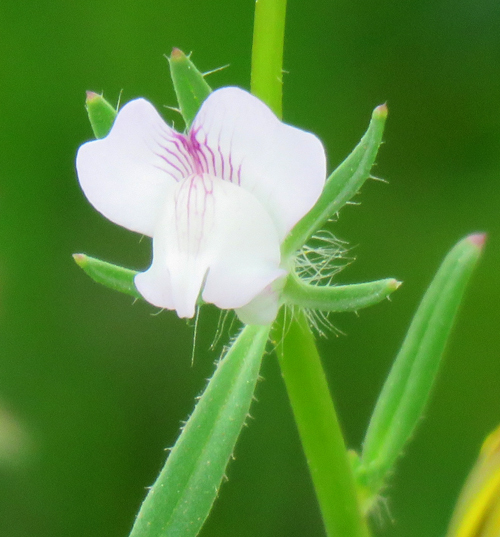 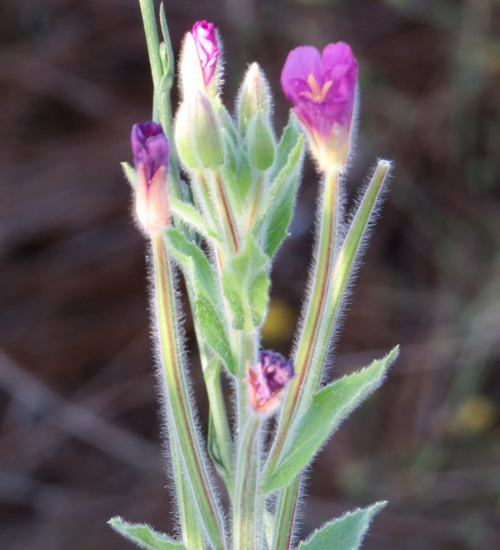 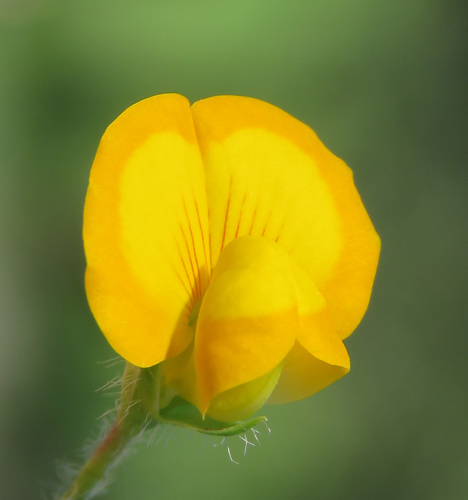 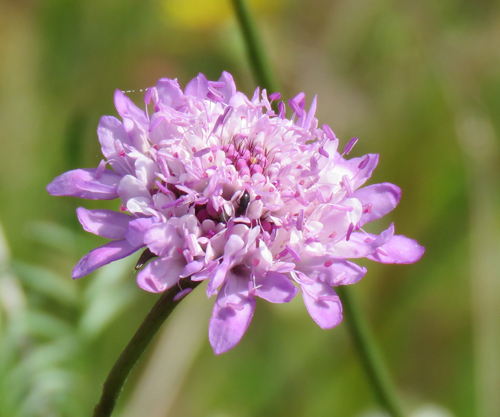 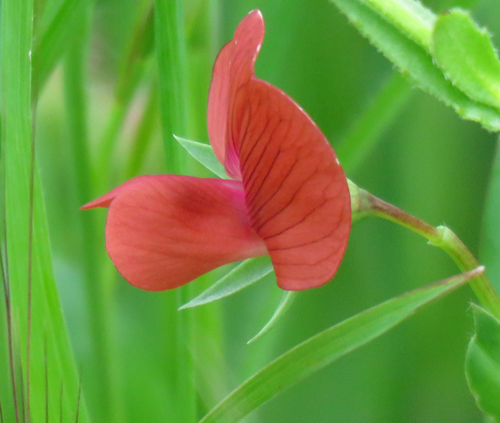 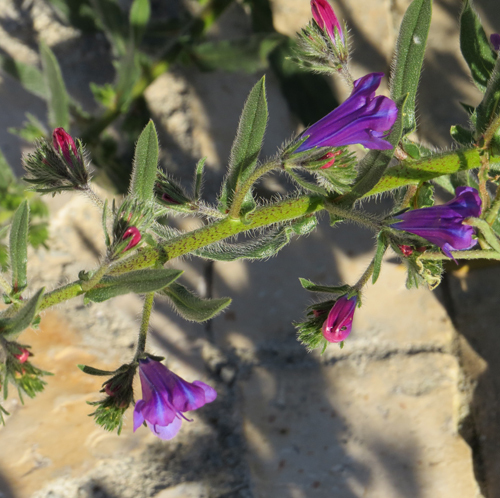 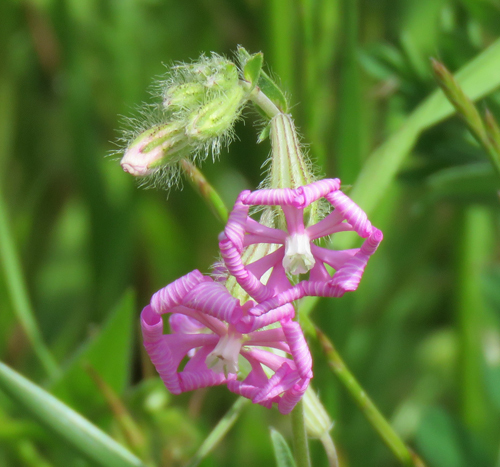 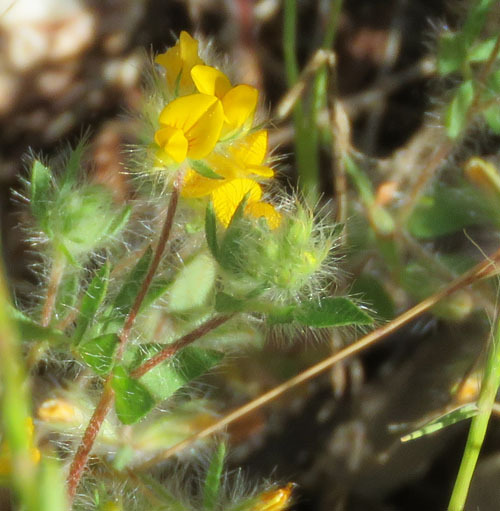 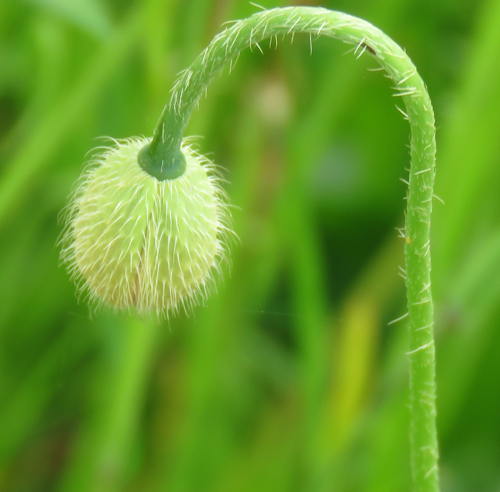 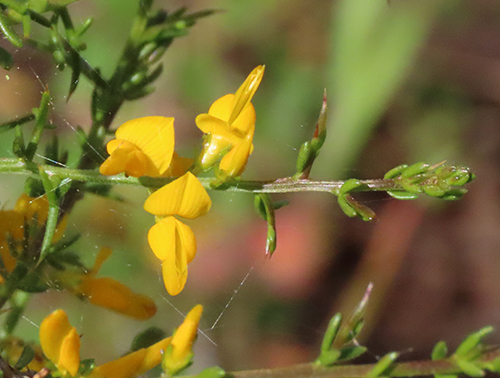 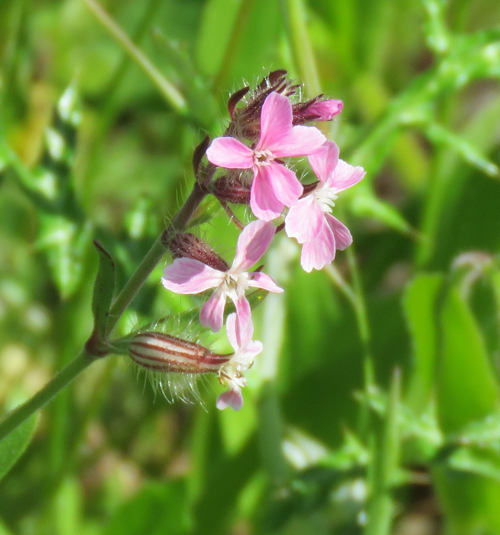 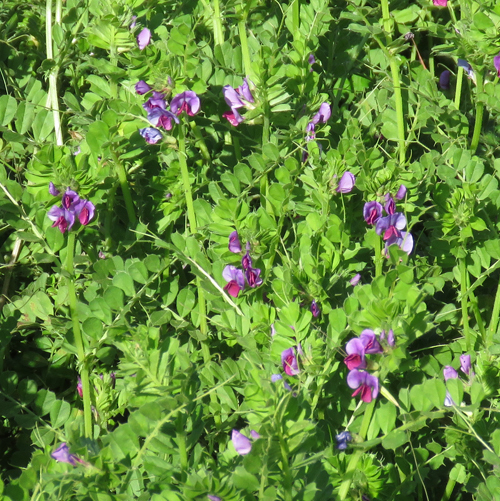 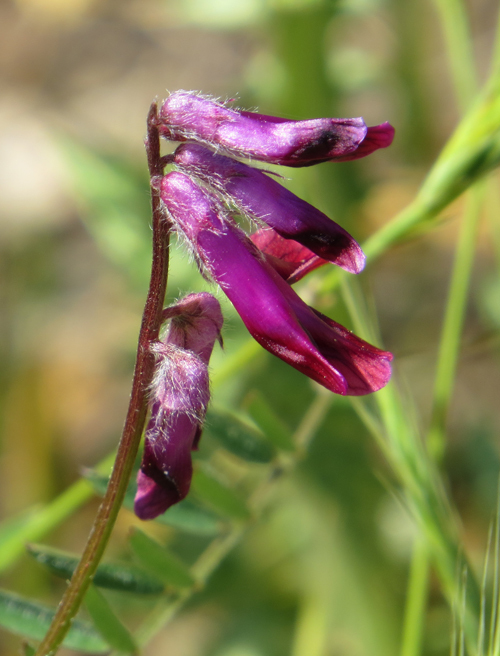 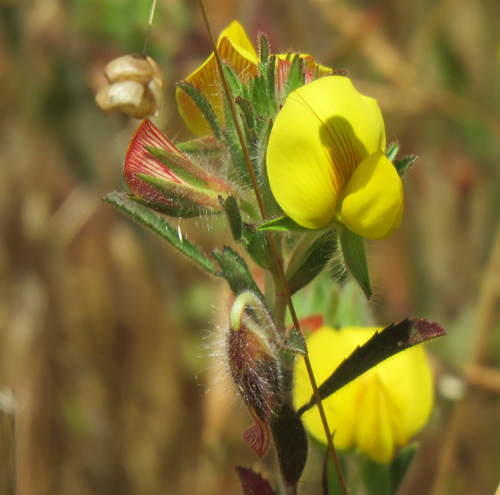 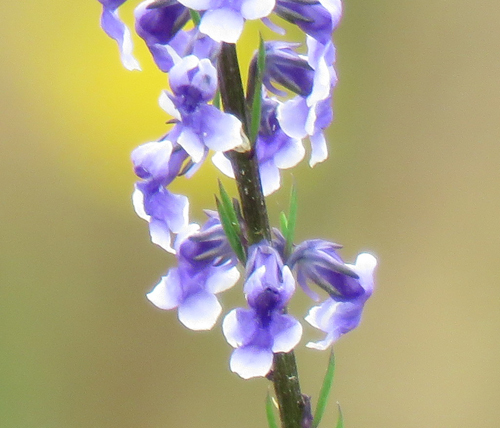 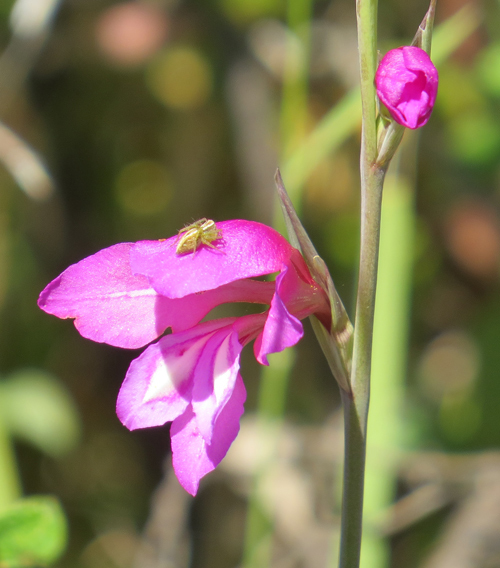 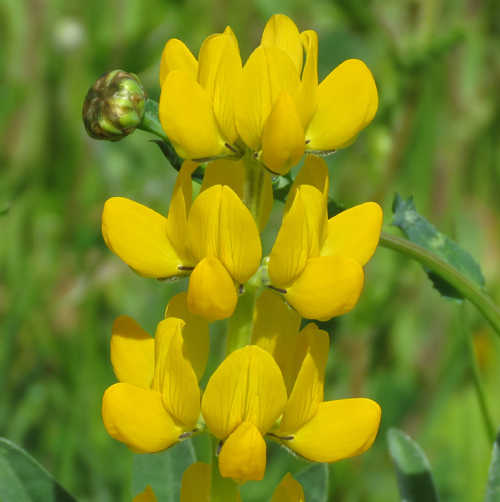 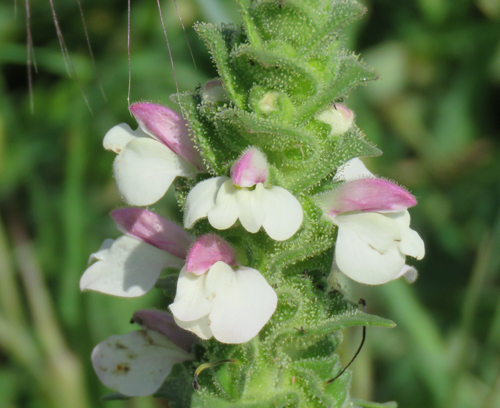 The flowers of this member of the Pea family are very small. 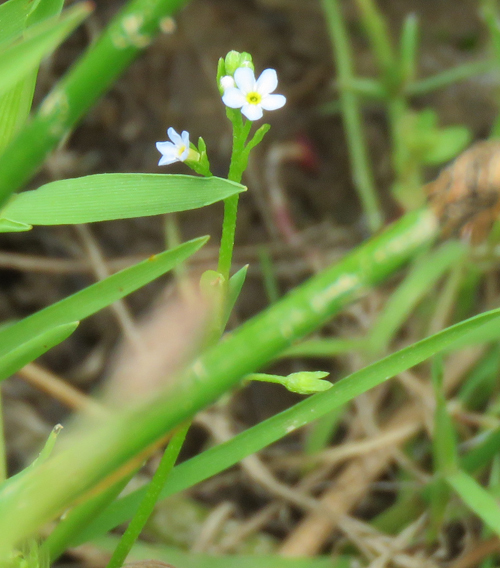 Just 5-8mm. 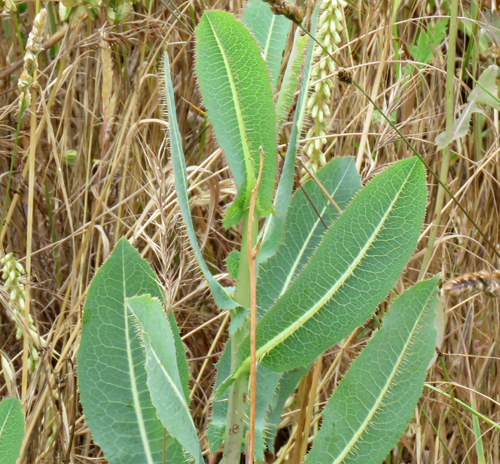 The leaves are produced in 7-18 pairs of leaflets. 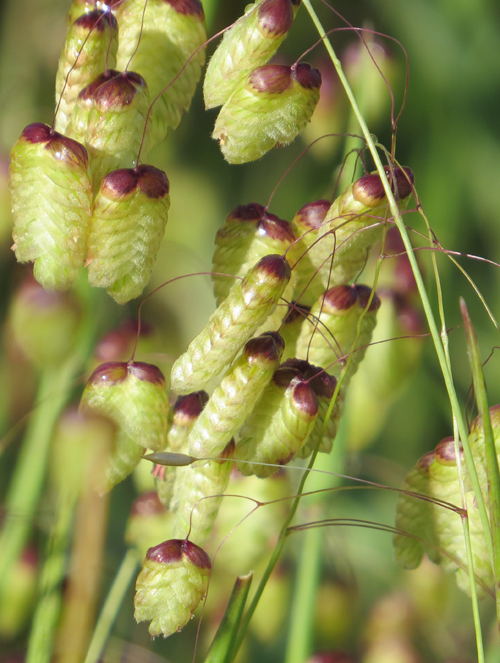 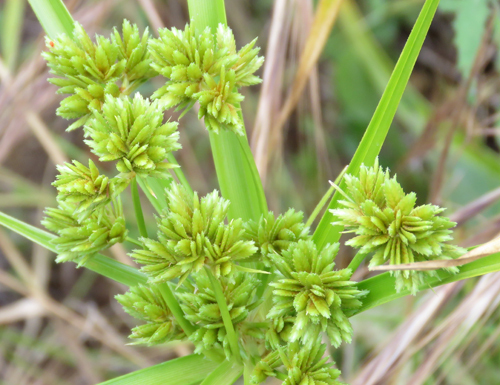 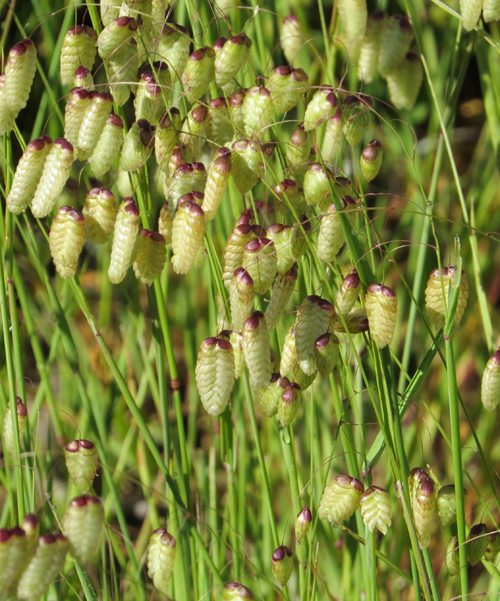 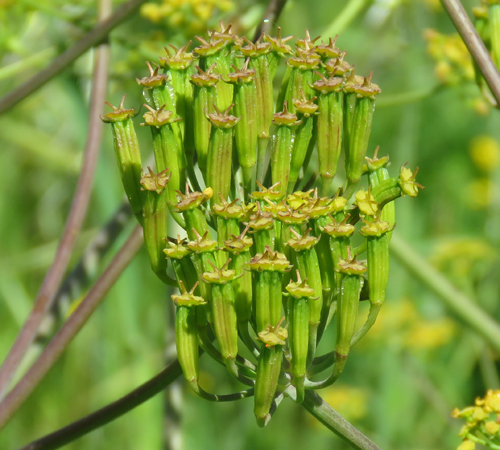 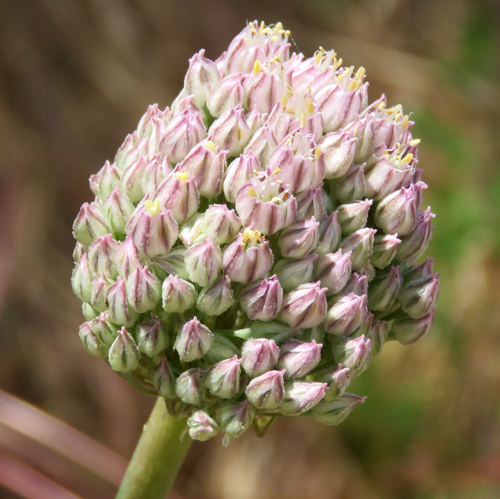 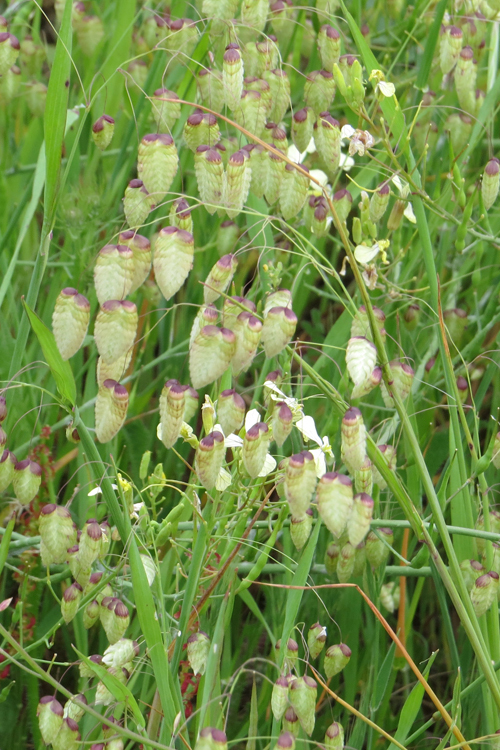 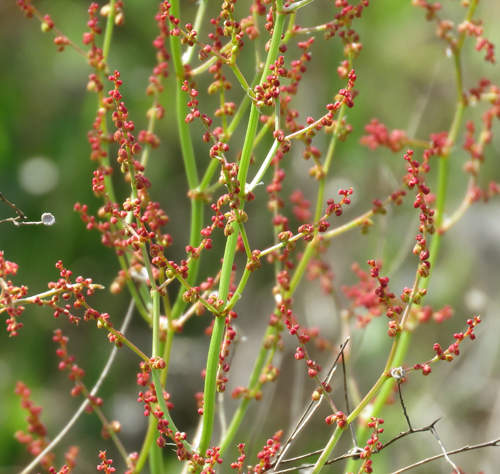 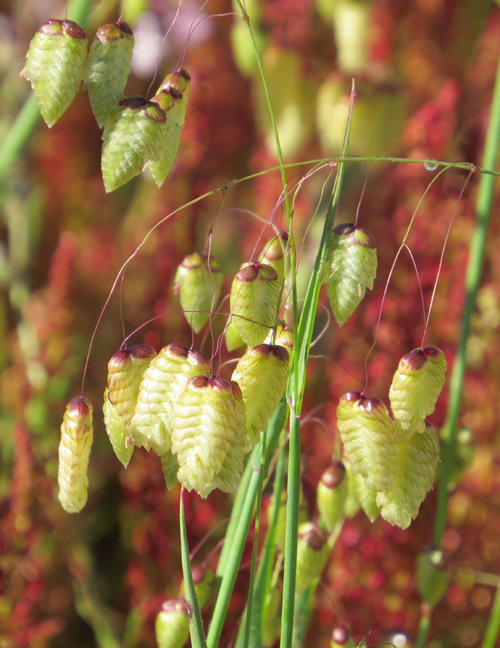 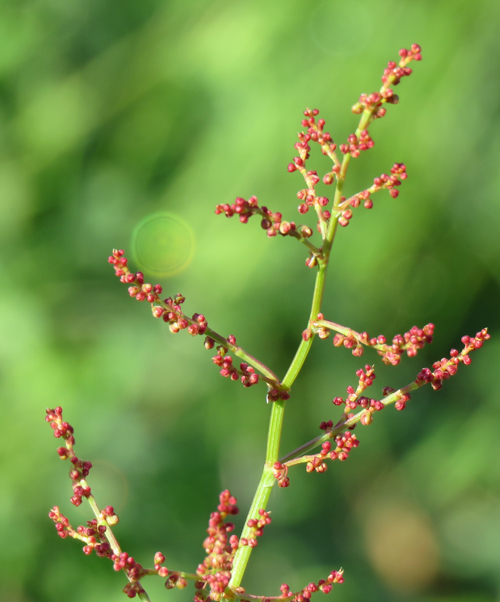 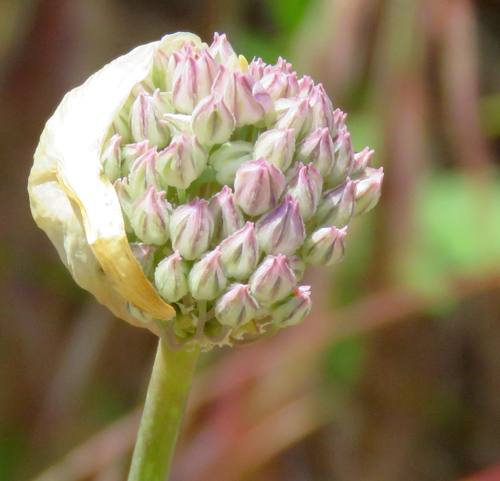 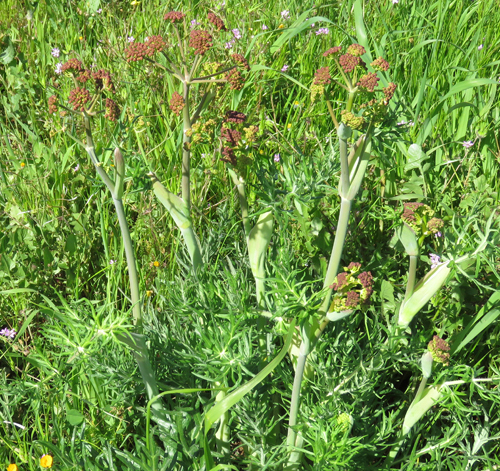 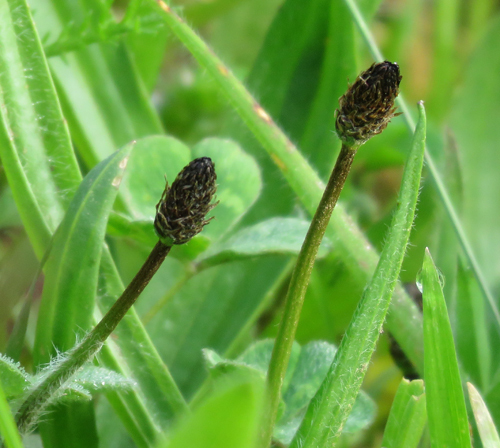 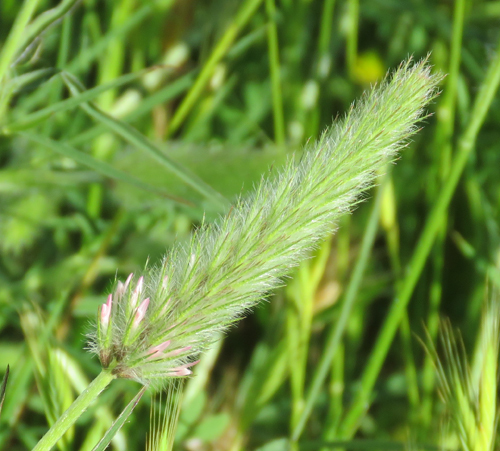 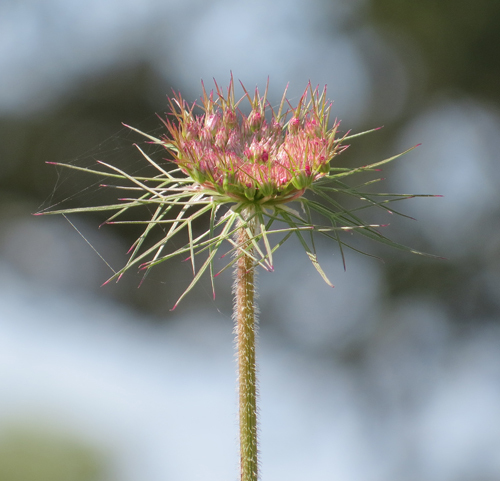 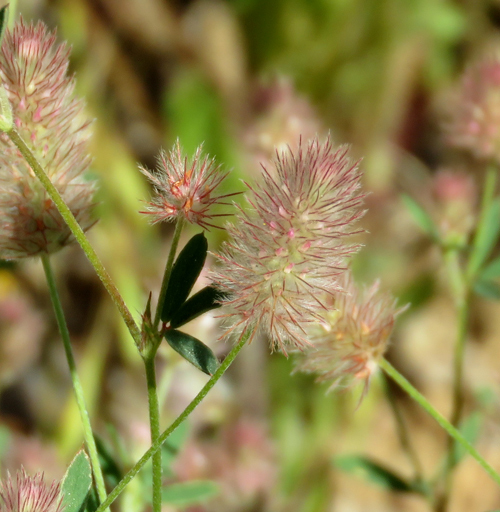 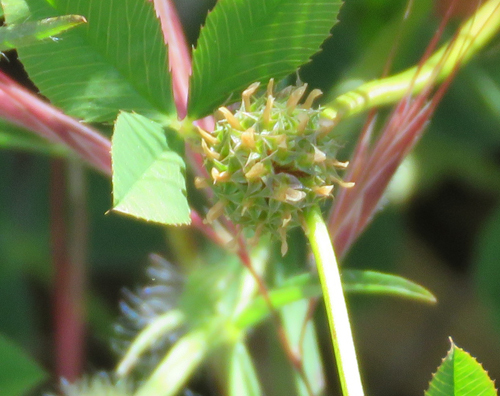 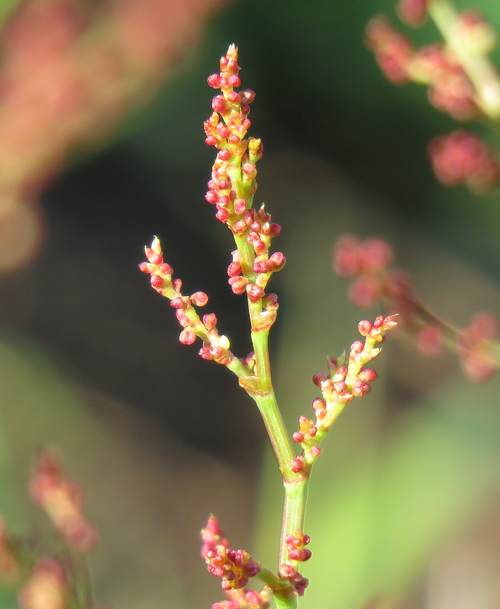 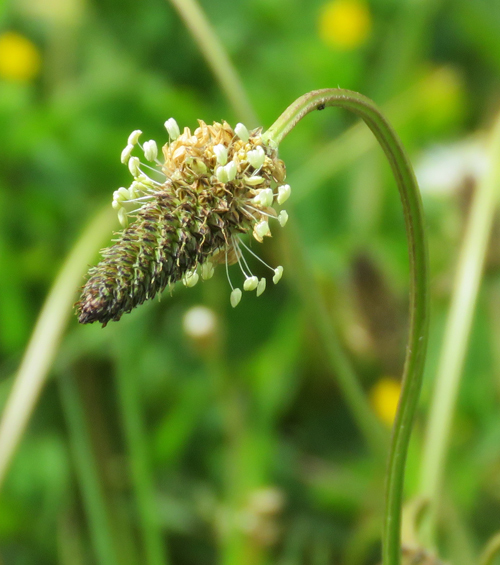 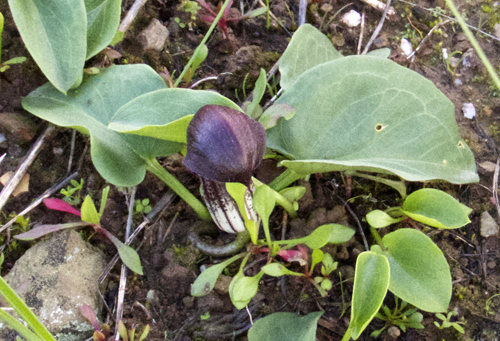 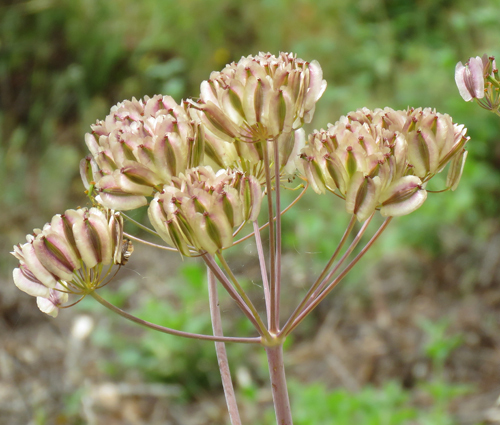 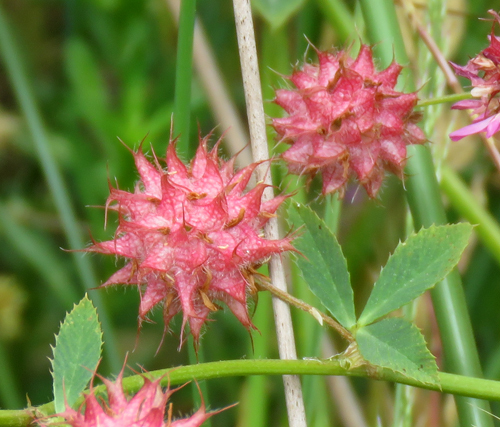 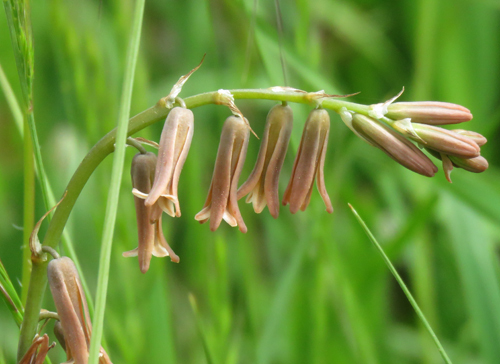 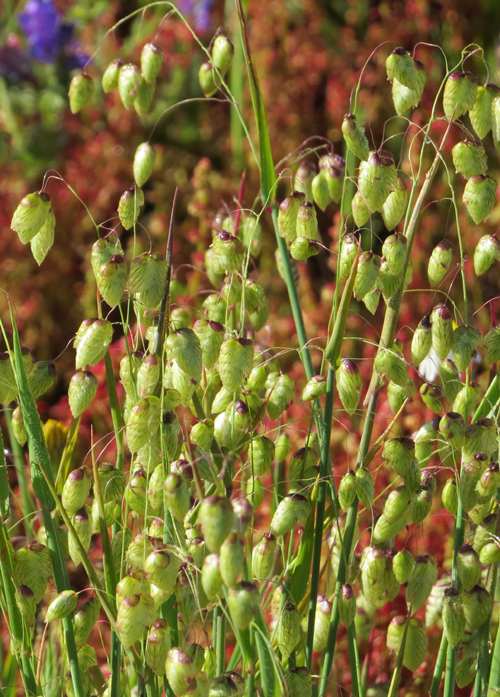 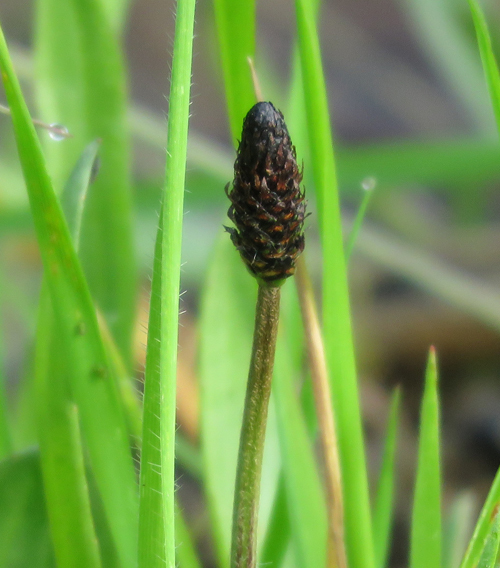 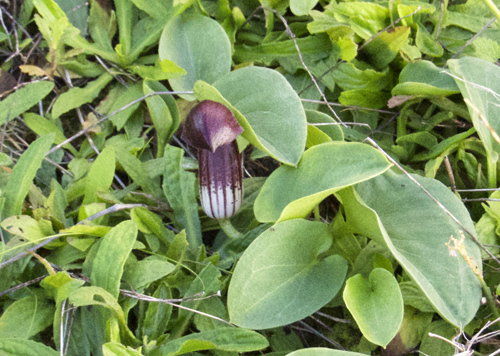 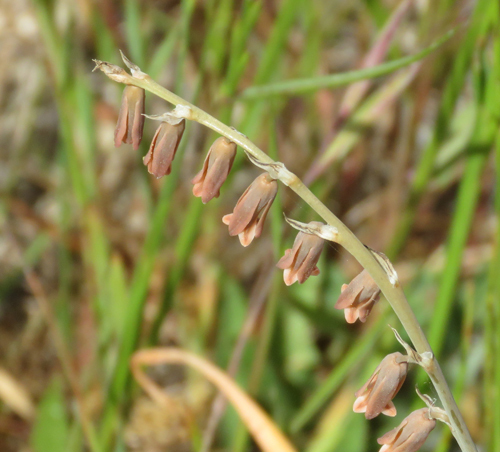 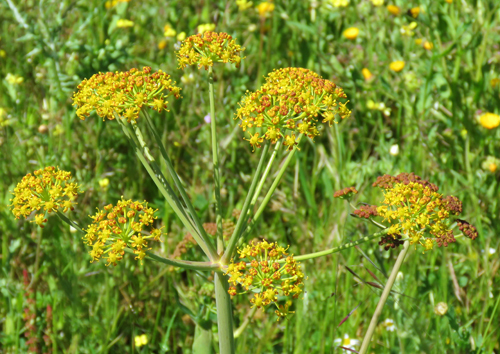 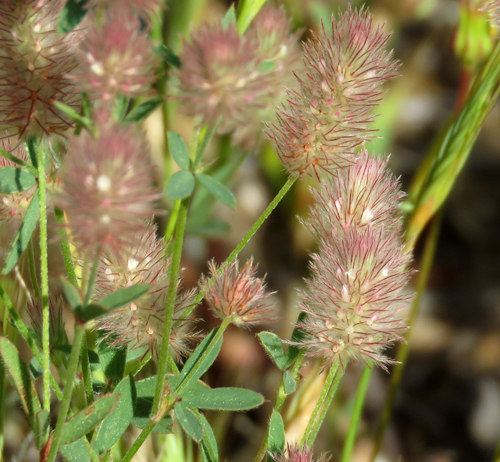 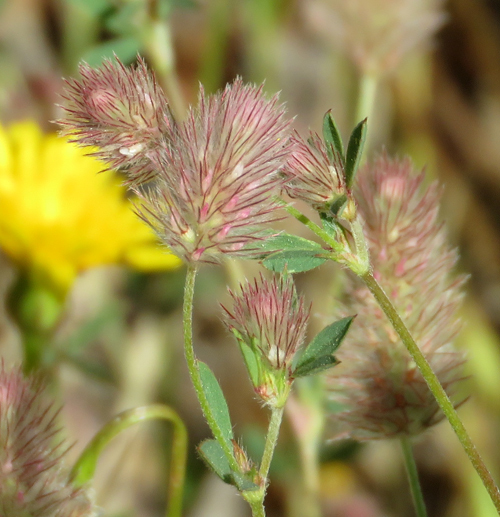 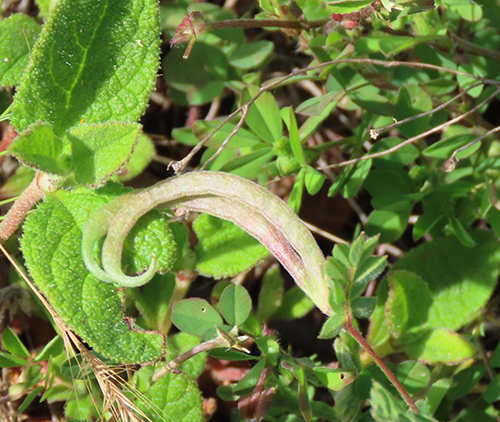 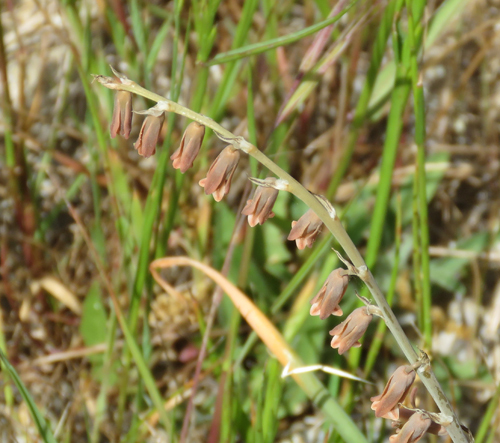 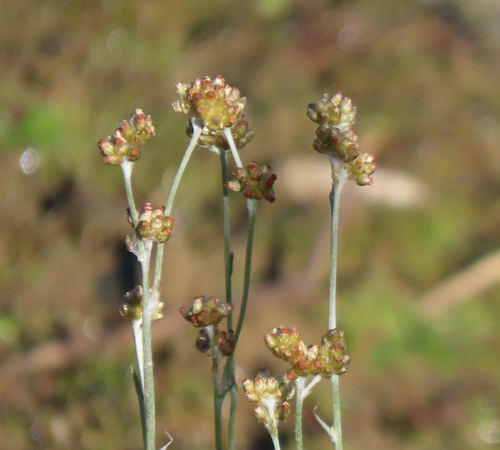 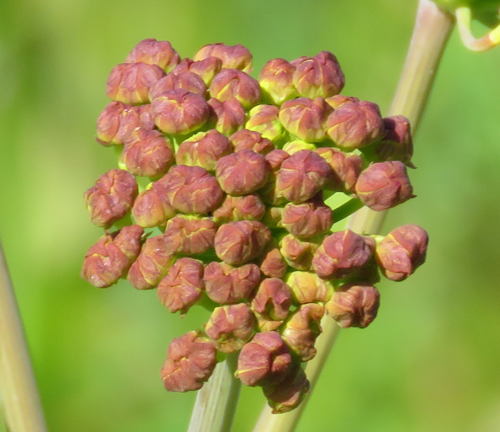 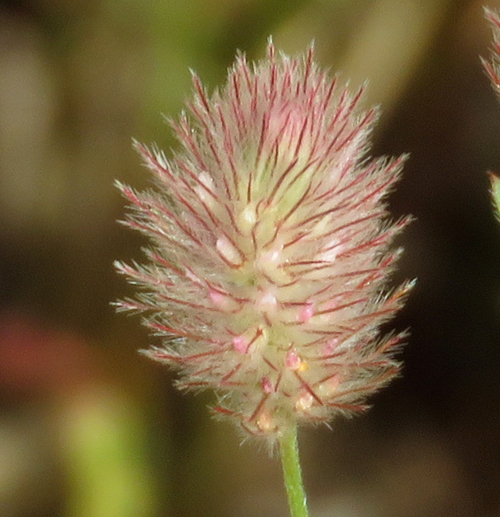 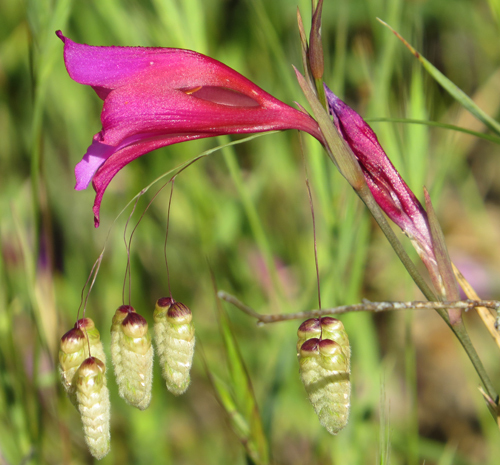 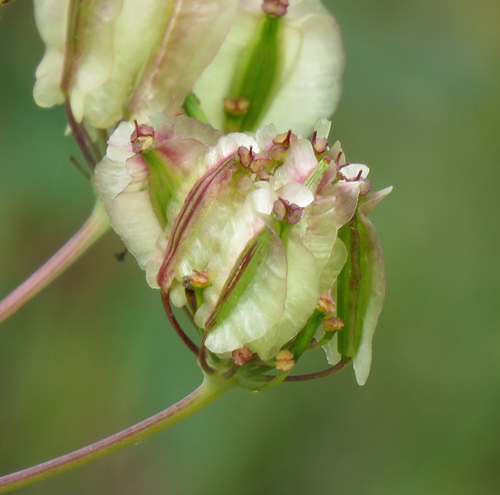 The seed pods have a characteristic curved shape and are much larger than the flowers. 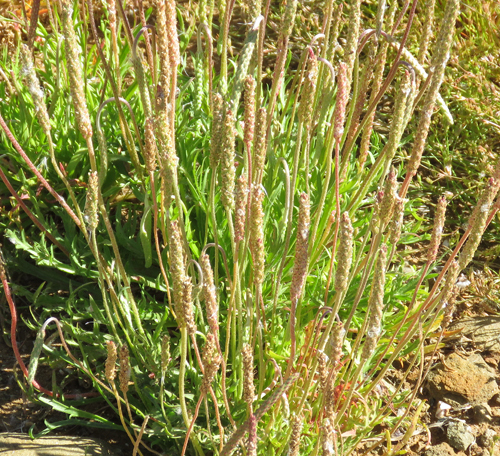 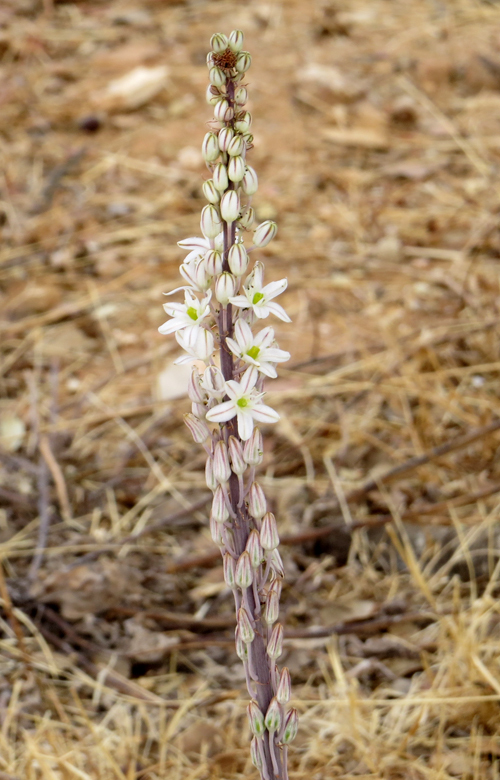 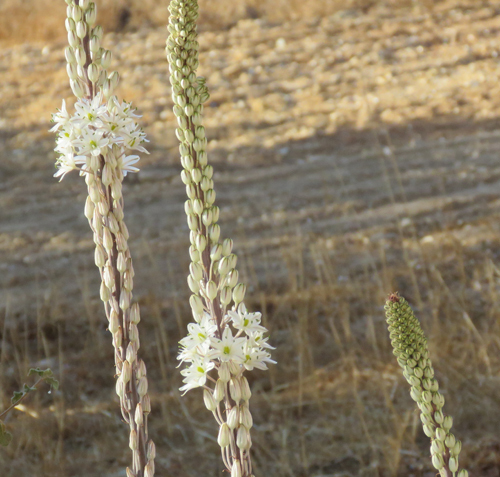 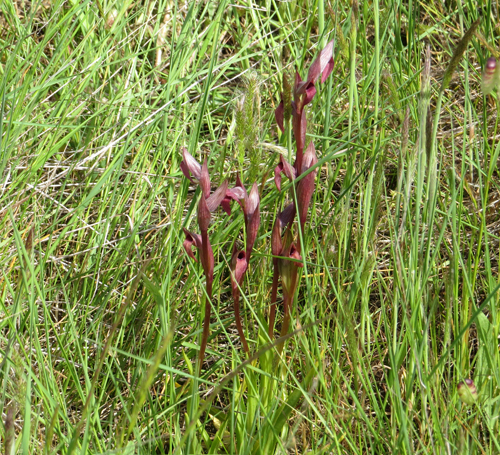 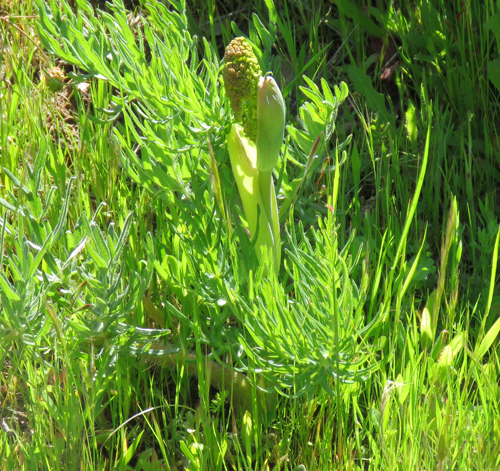 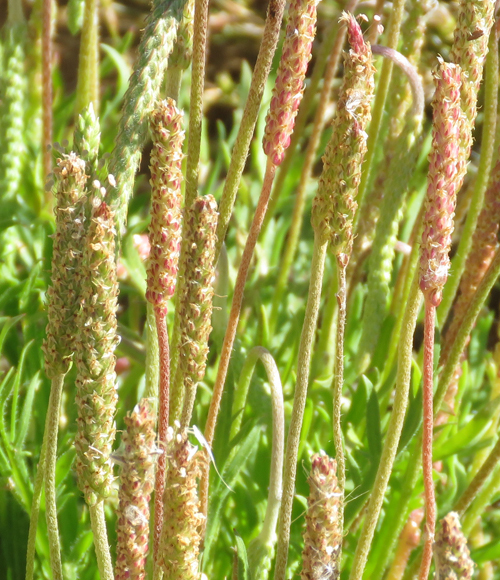 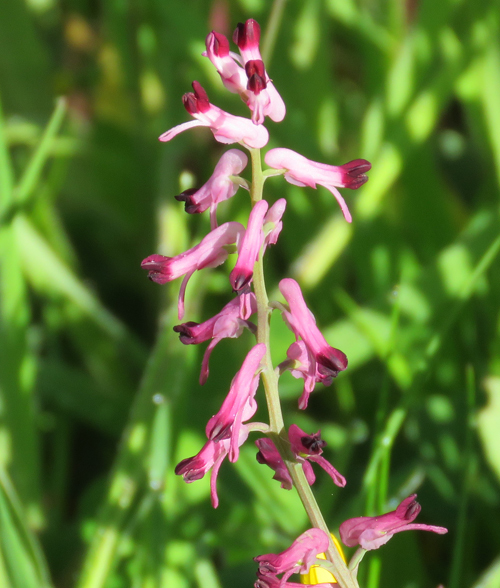 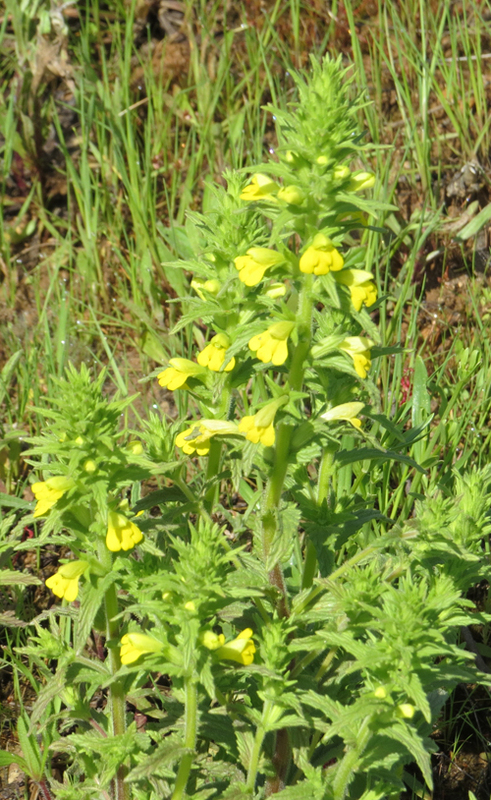 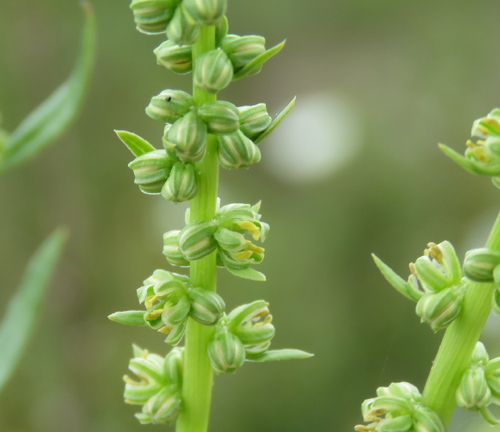 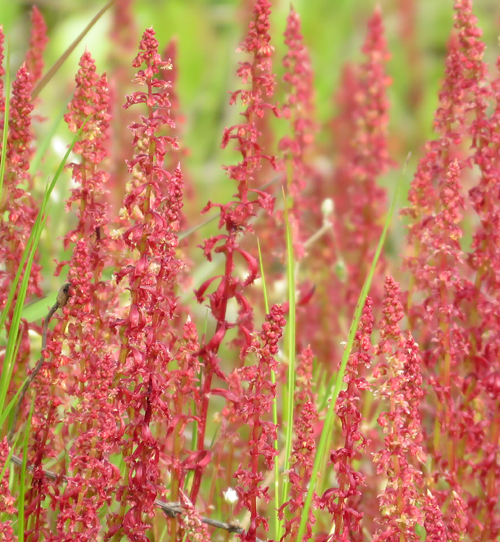 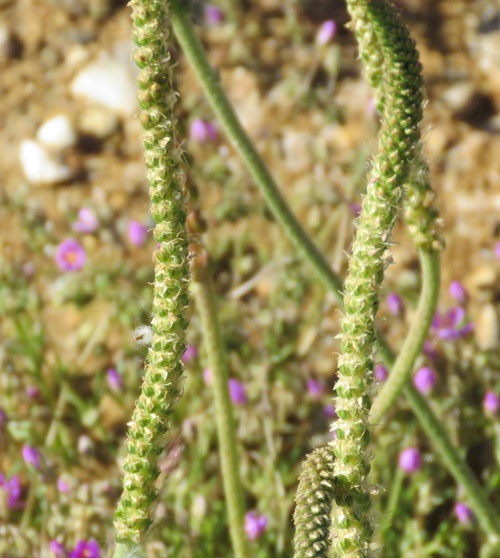 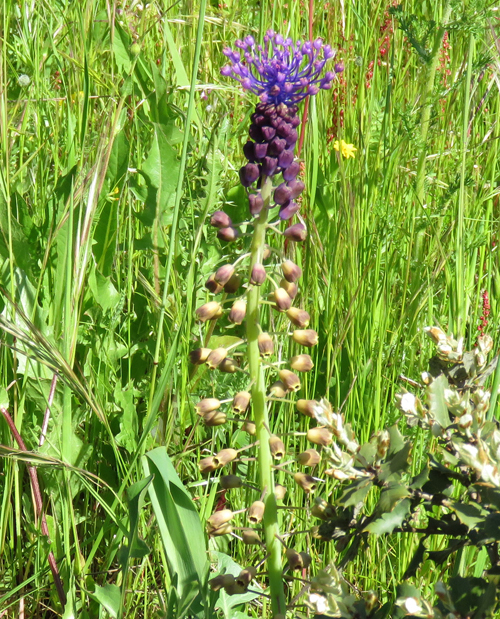 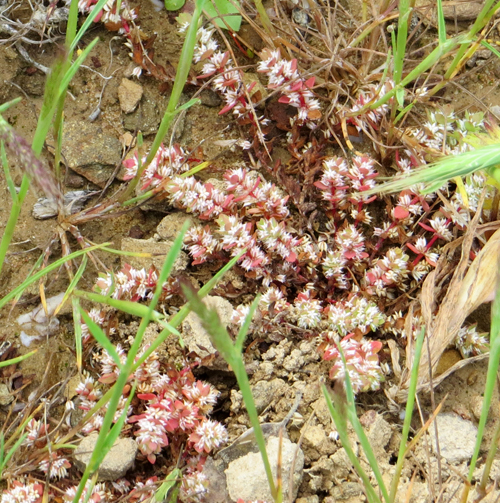 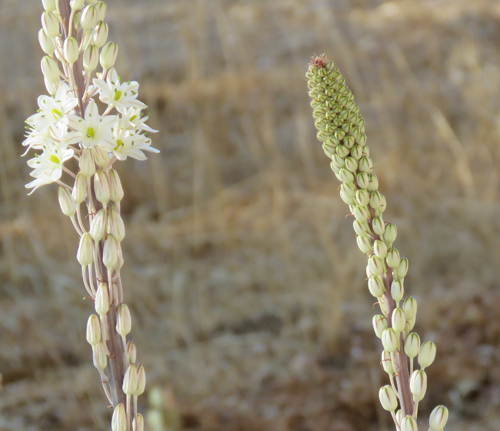 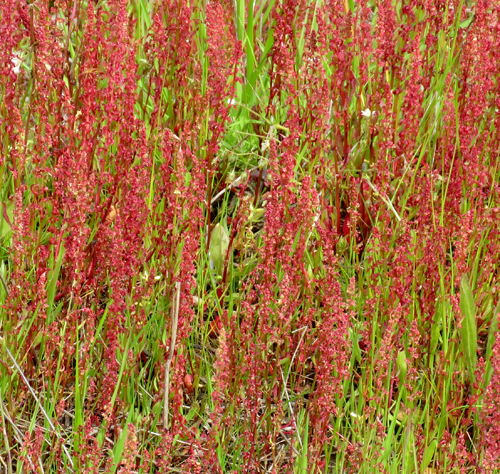 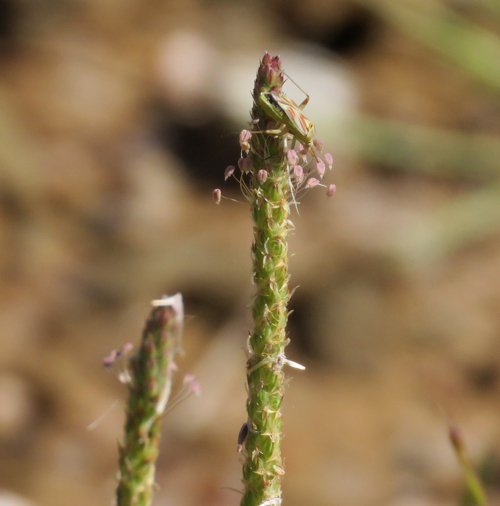 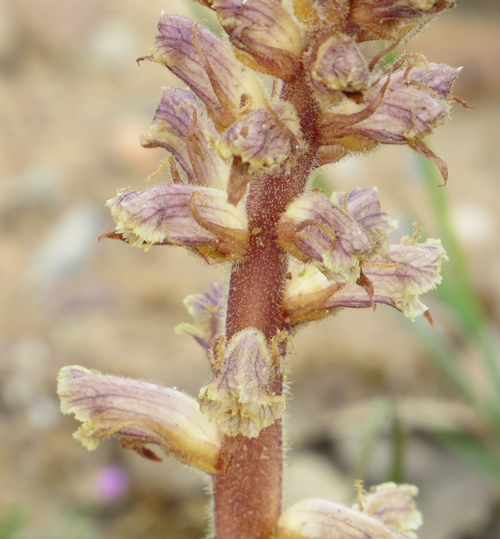 The Broomrapes are parasitic on the roots of other plants. 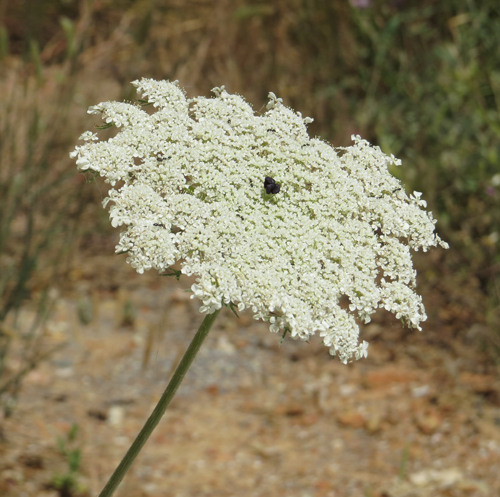 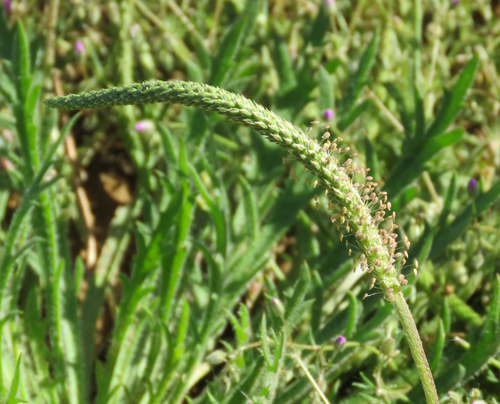 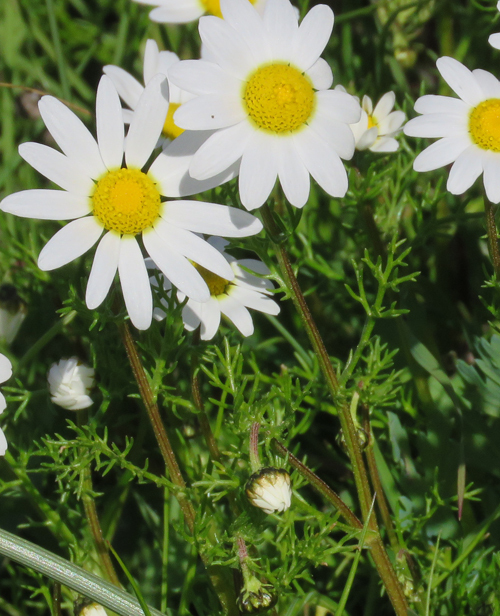 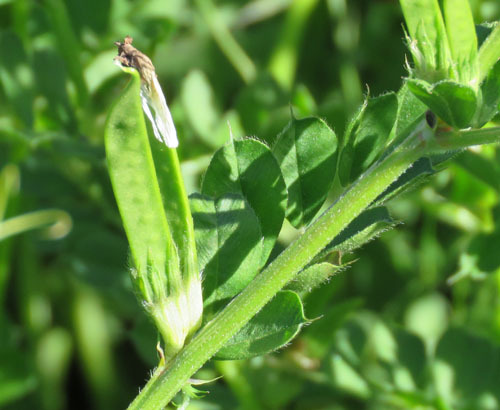 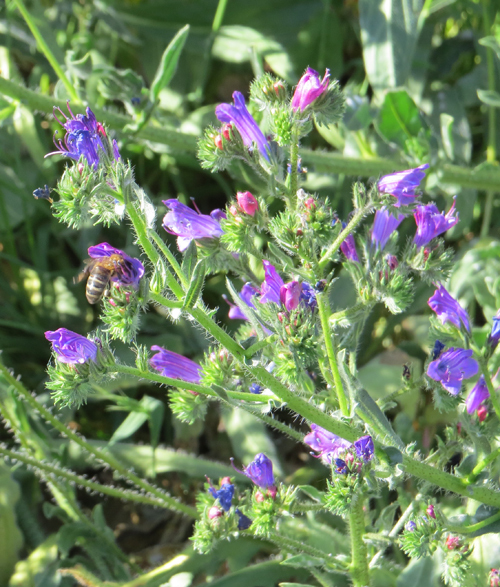 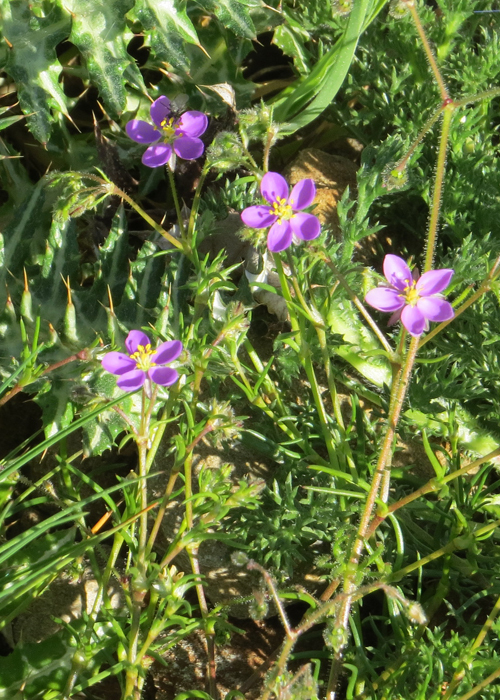 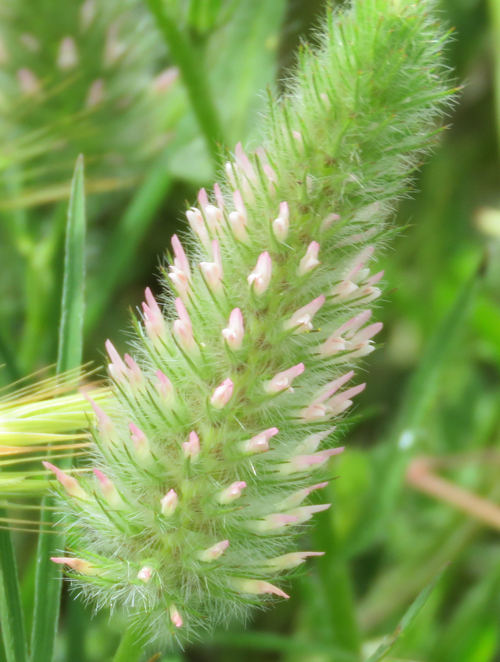 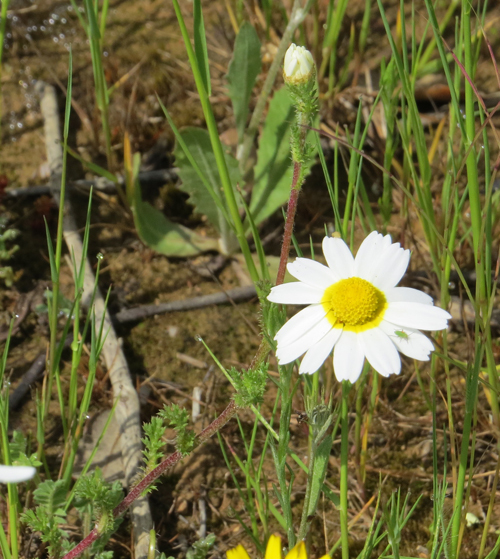 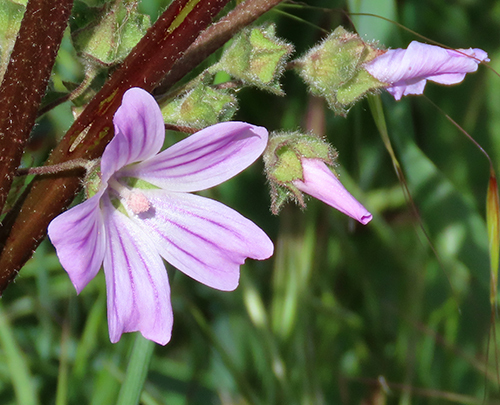 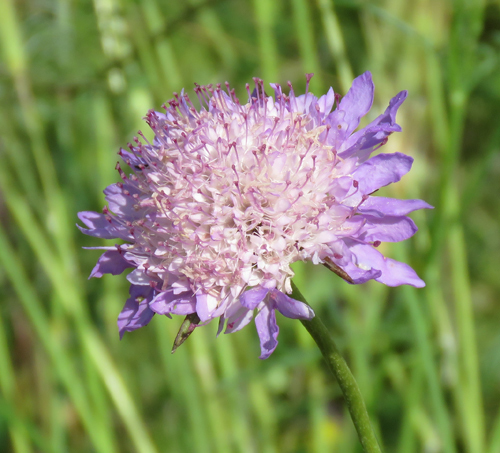 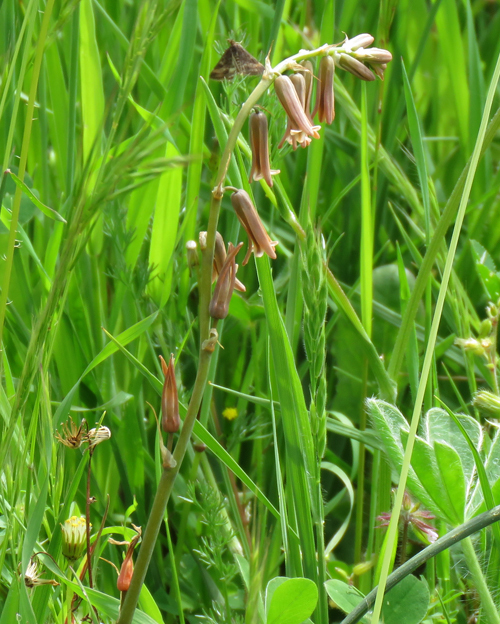 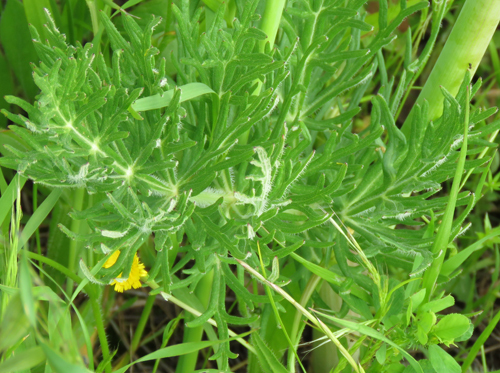 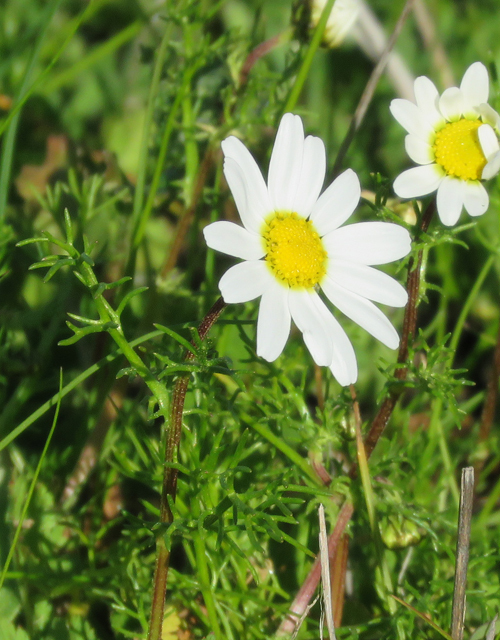 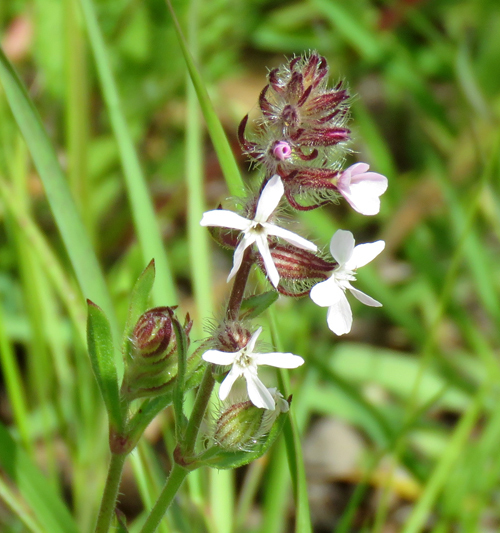 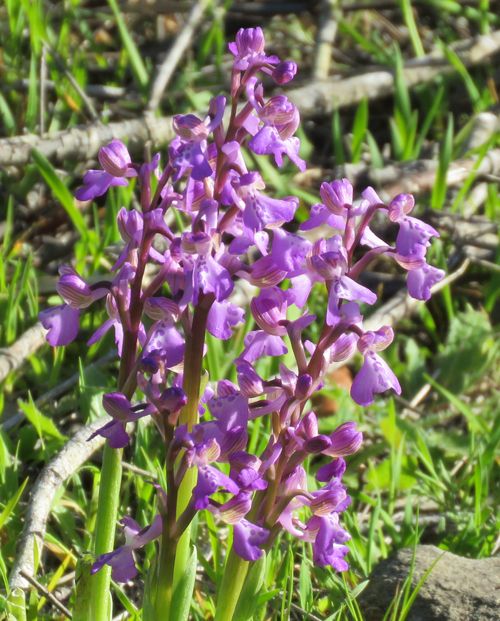 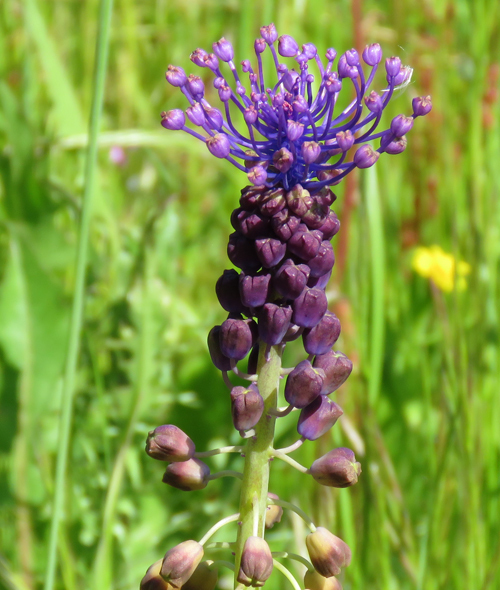 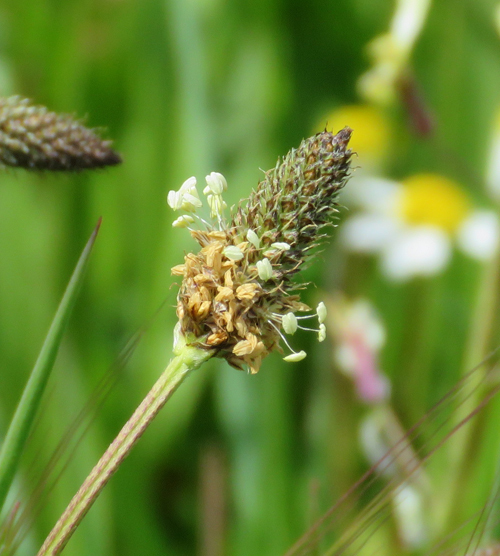 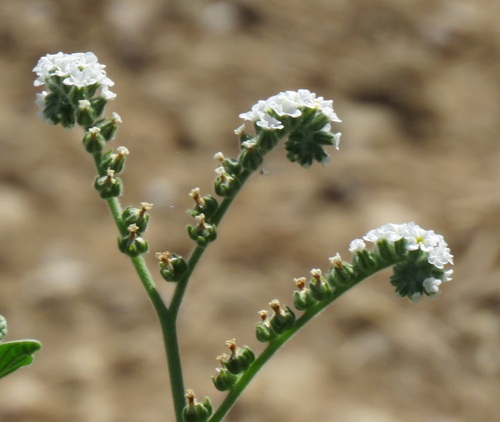 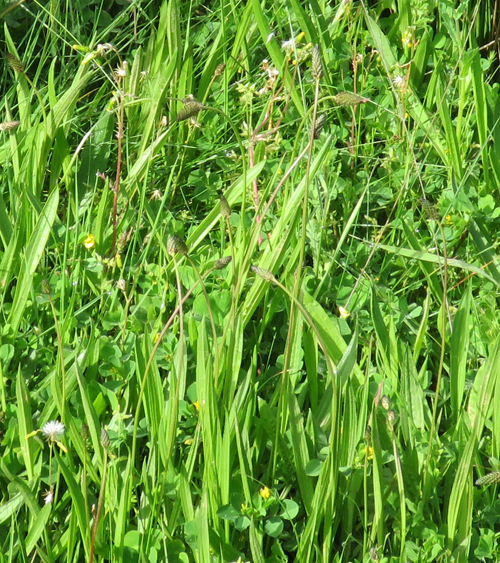 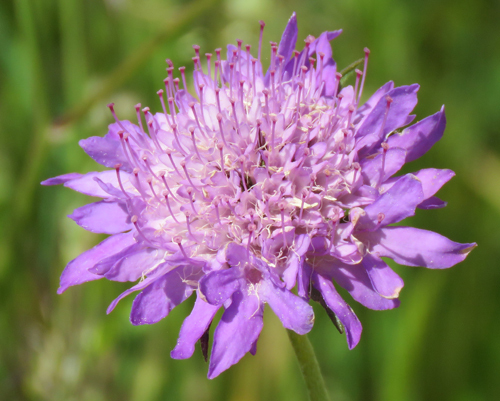 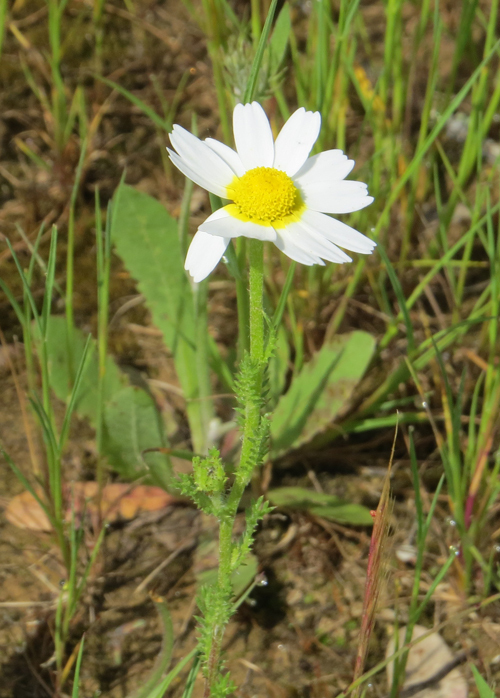 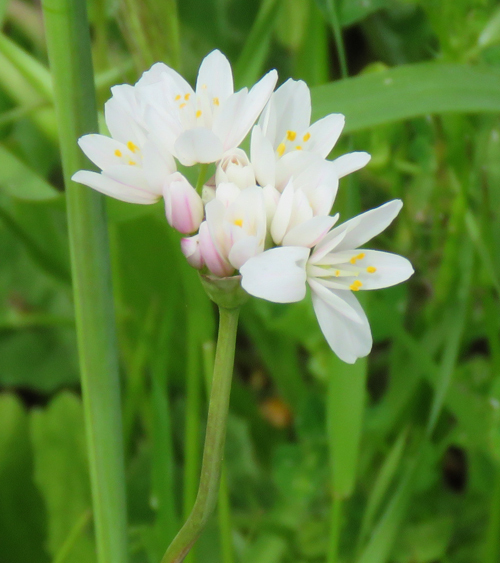 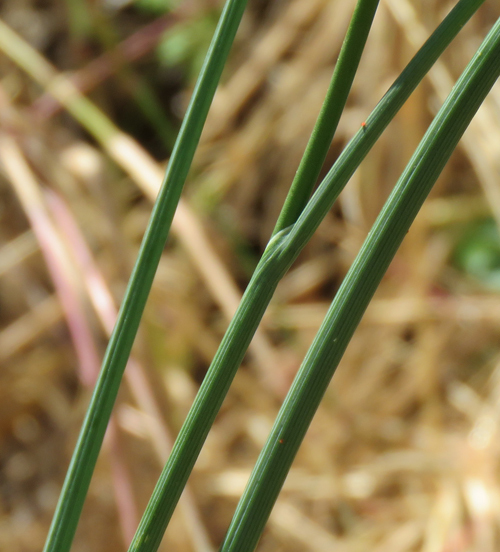 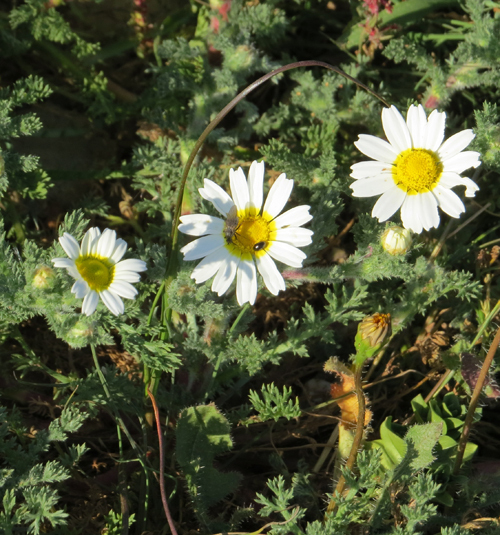 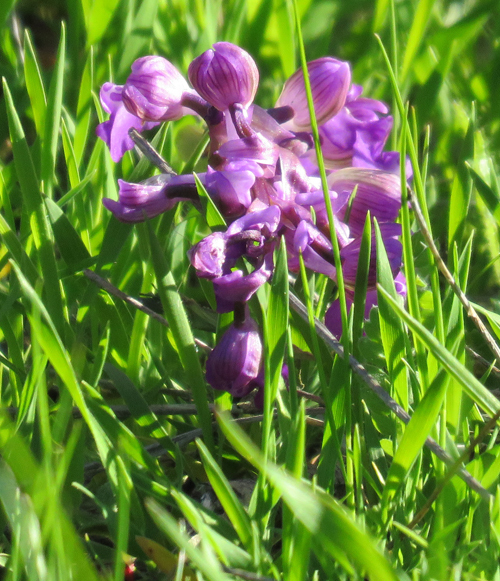 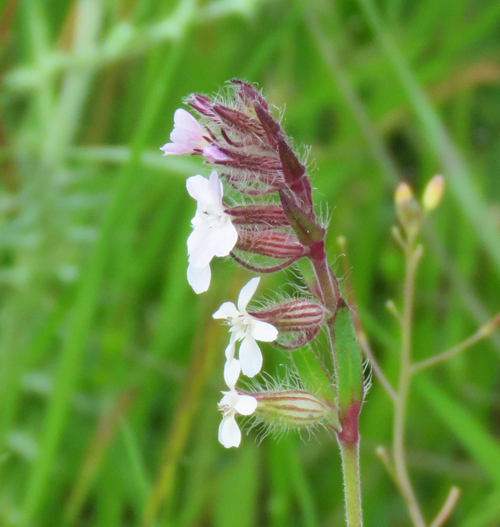 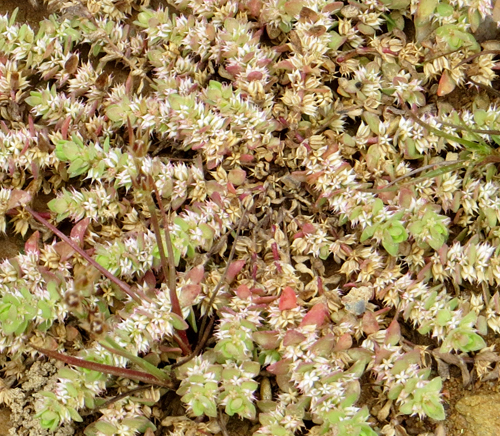 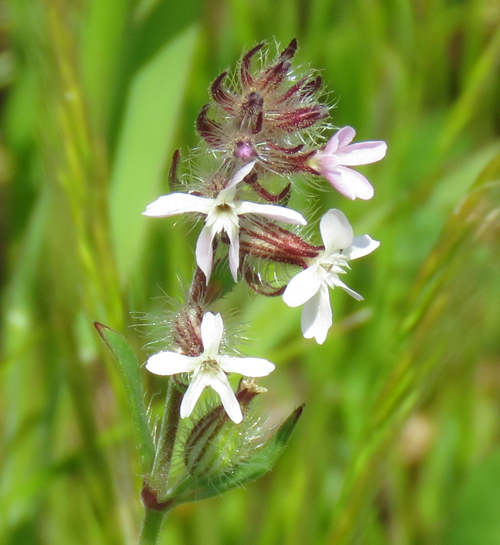 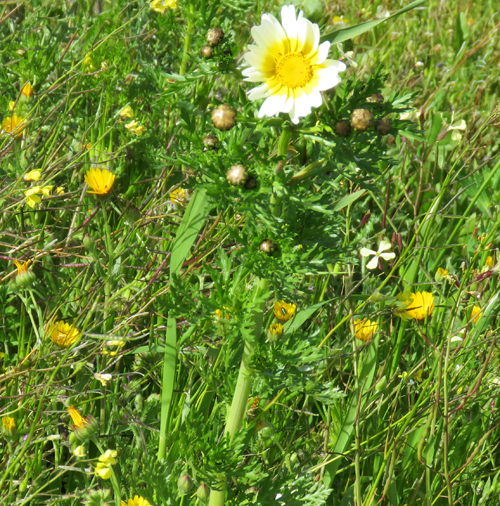 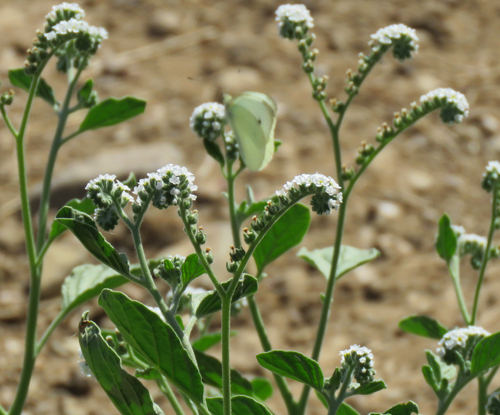 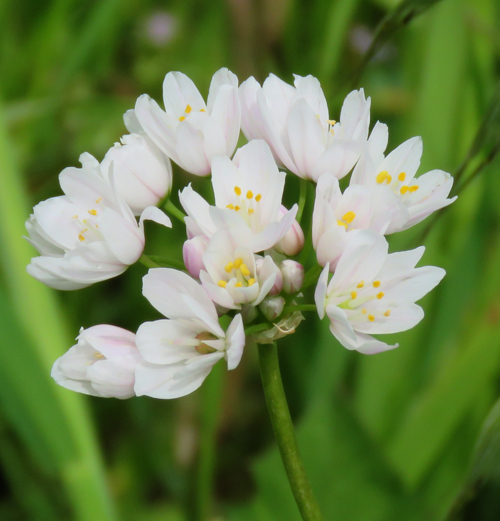 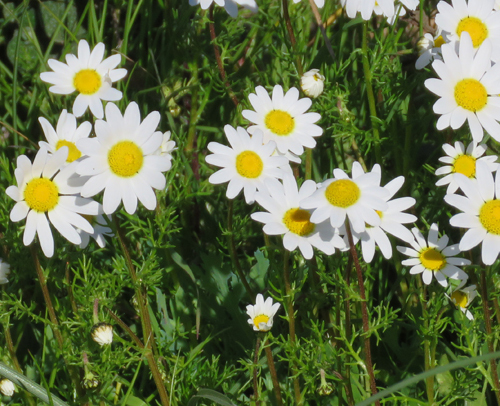 This species usually attacks legumes, composites and umbellifers. 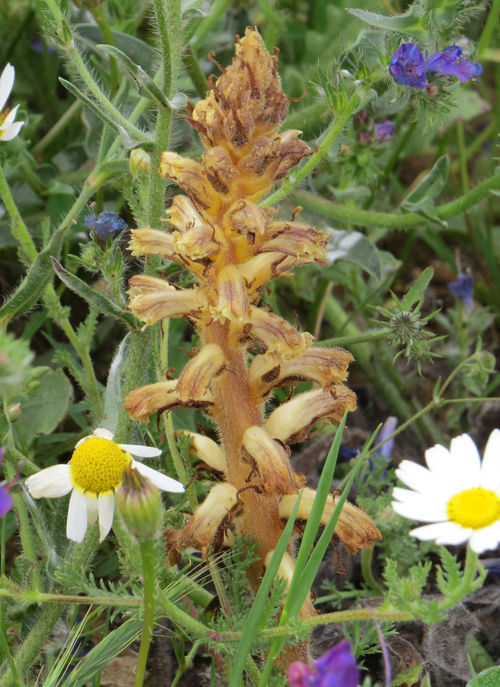 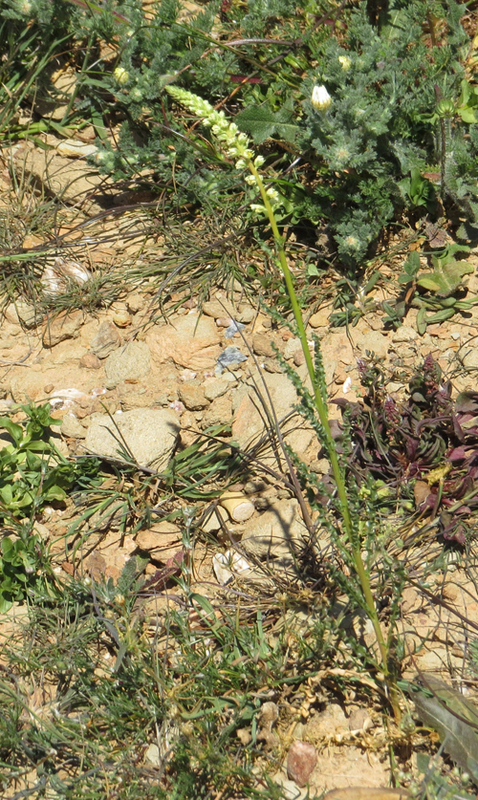 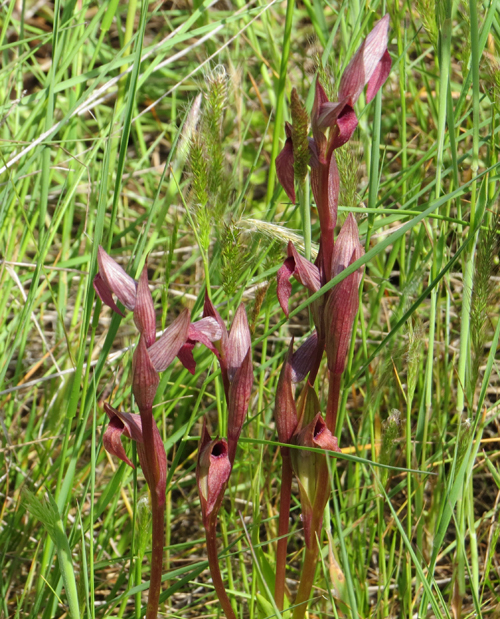 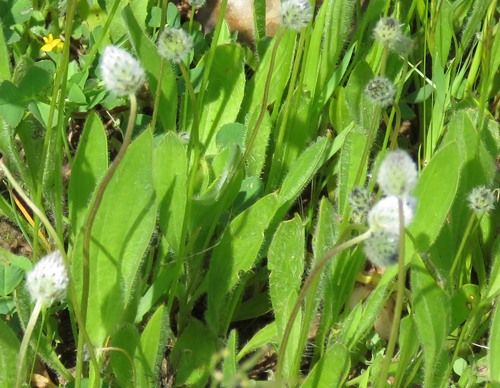 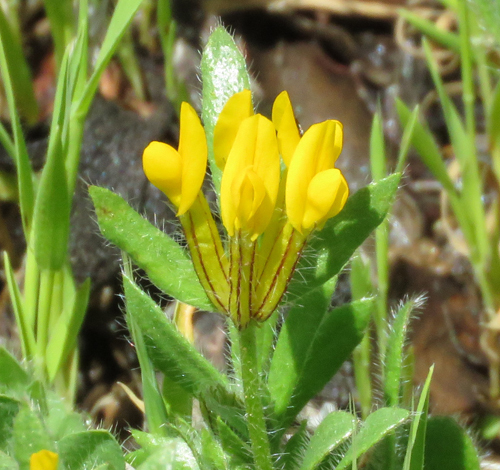 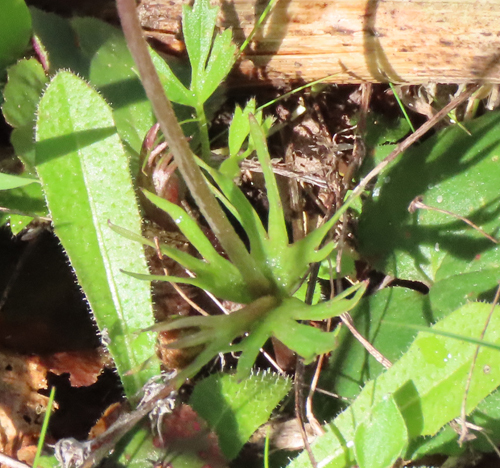 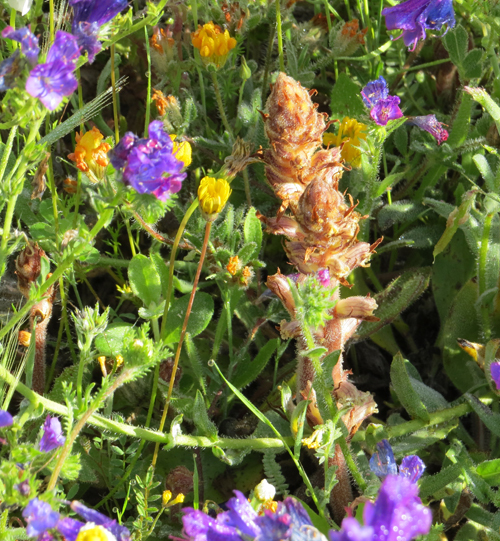 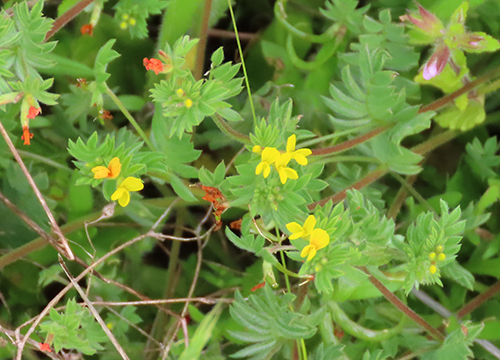 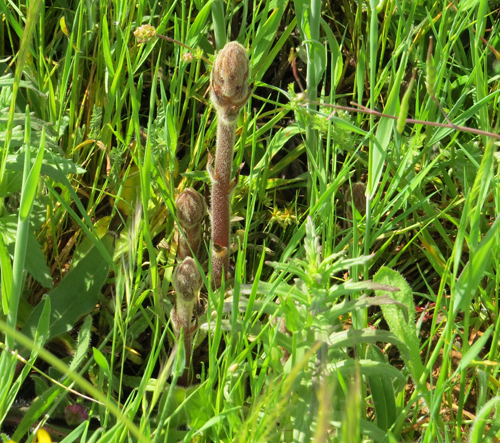 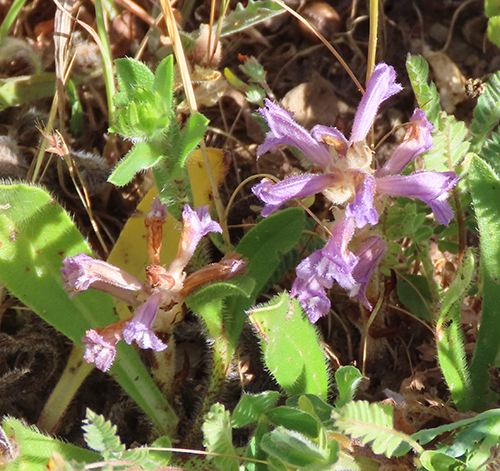 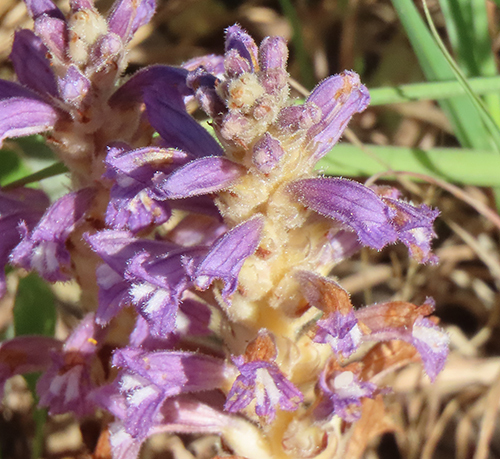 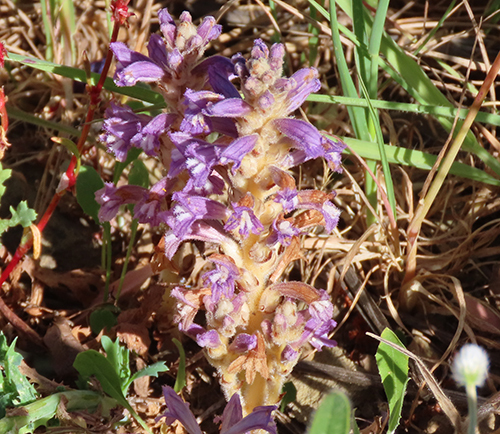 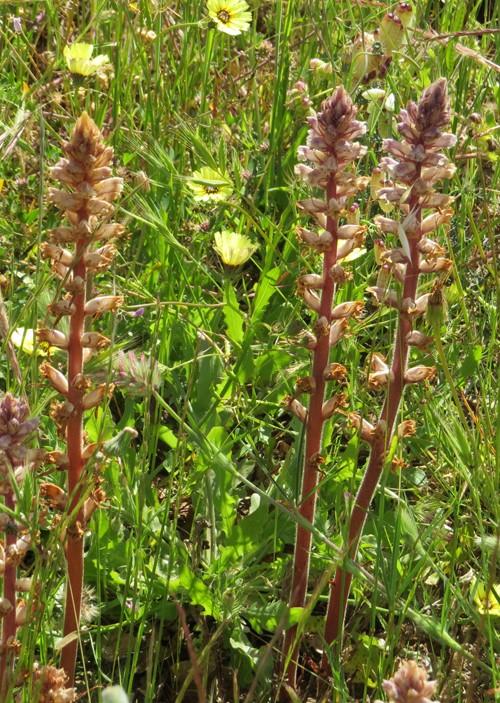 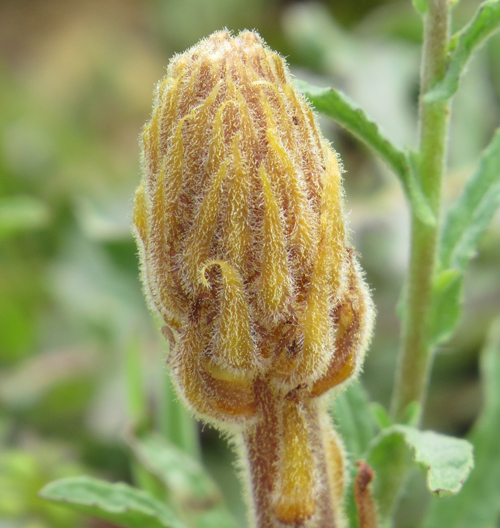 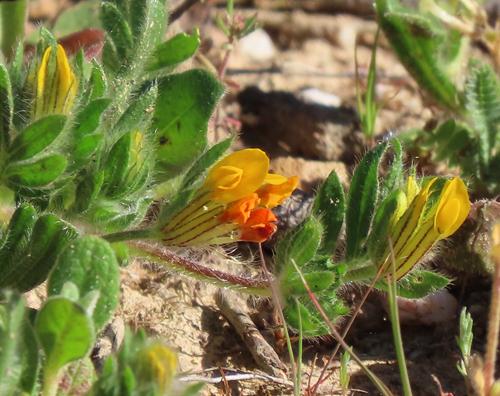 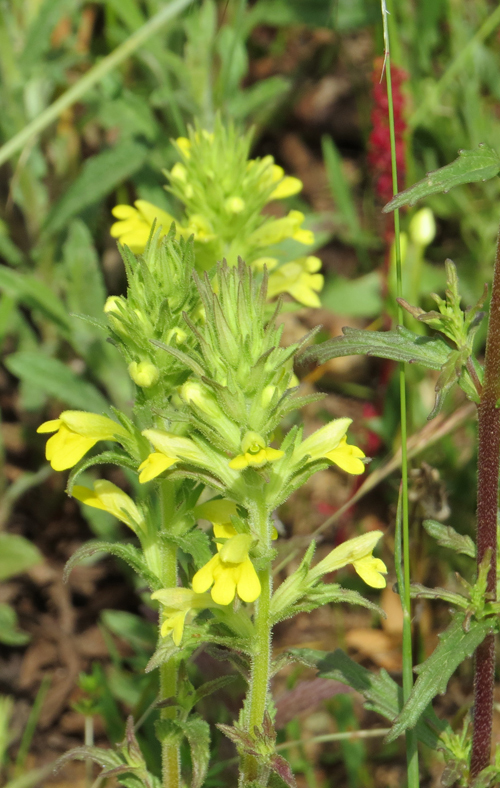 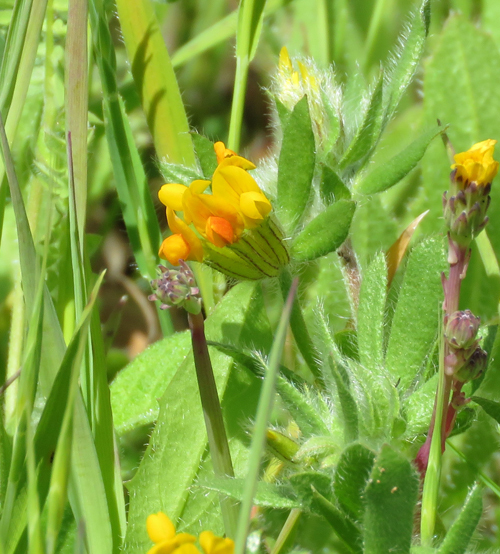 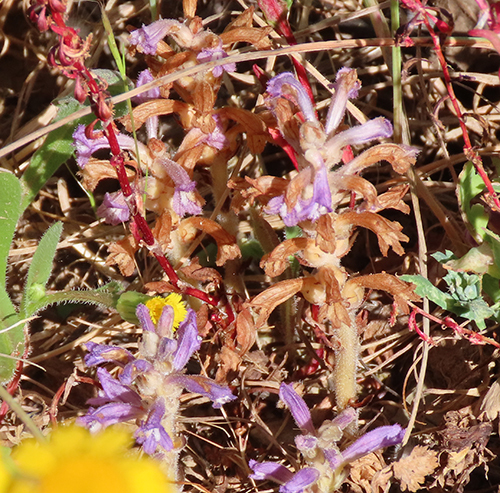 This Common broomrape is likely to be parasitising the roots of the yellow legume seen in the photograph. 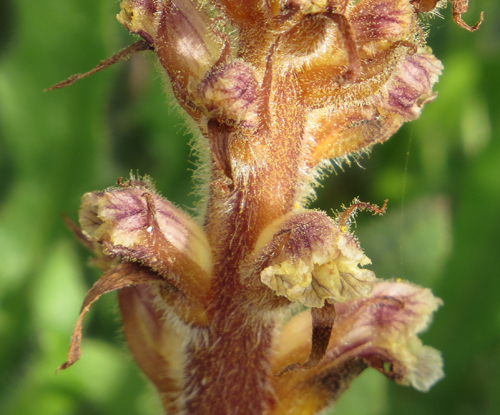 Hemp Broomrape is a plant without any chlorophyll that lives by parasitising other plants to obtain all its food requirements. 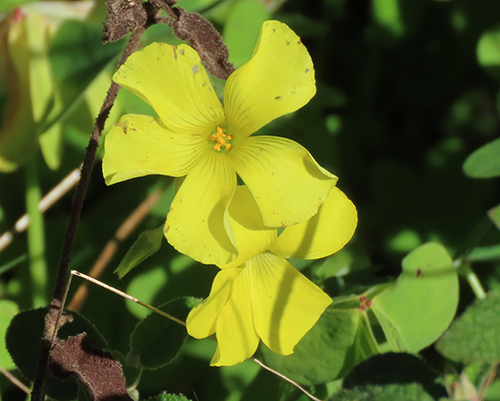 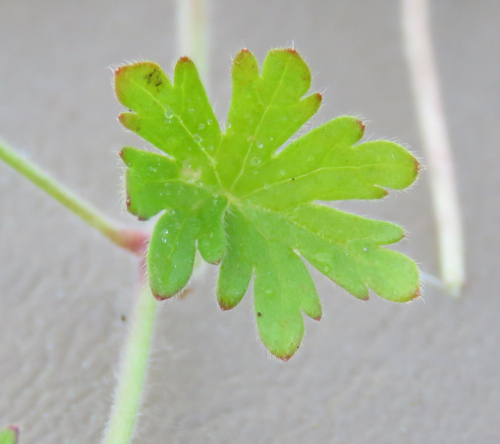 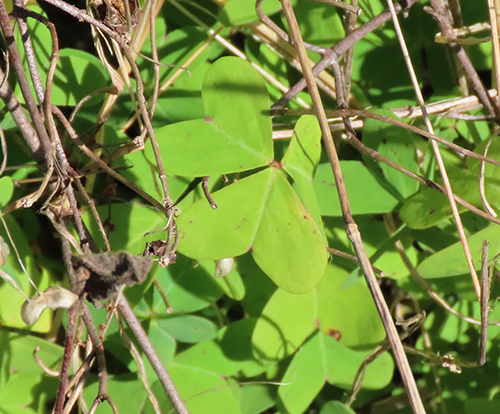 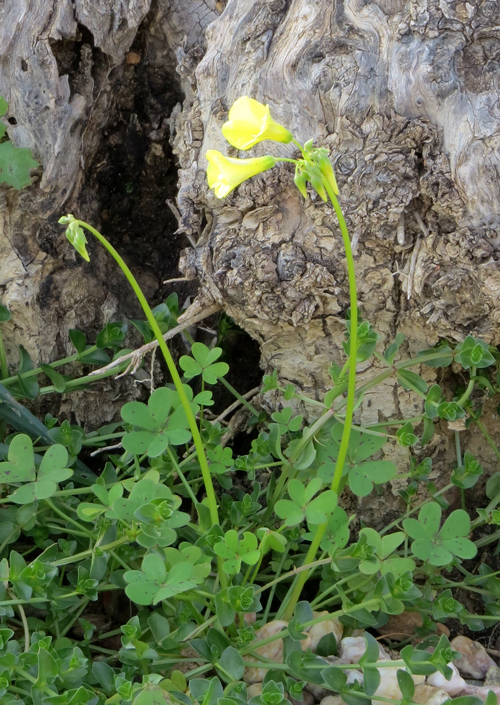 This leaf shape is typical of Oxalis. 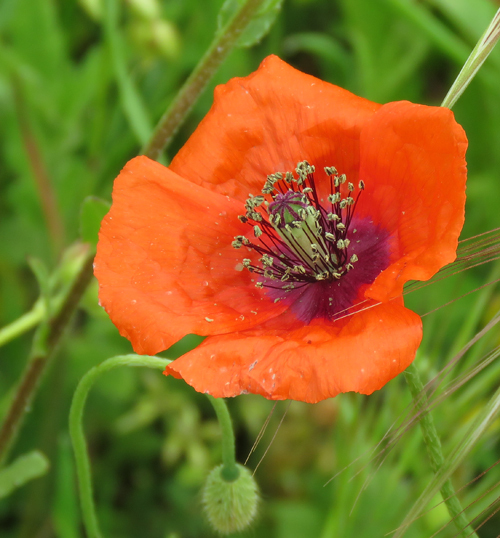 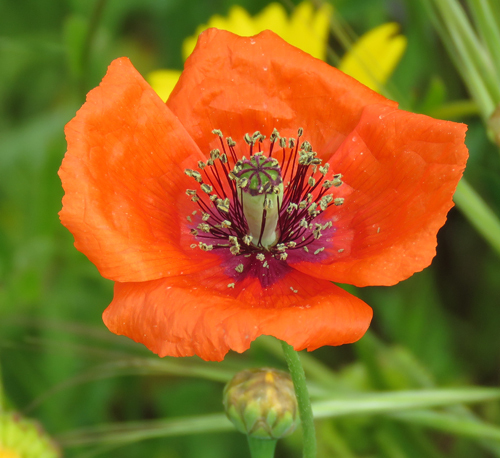 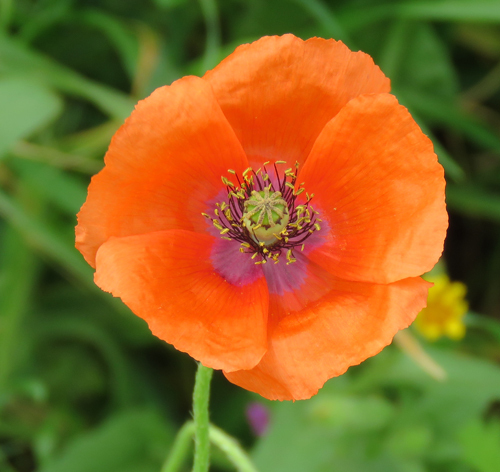 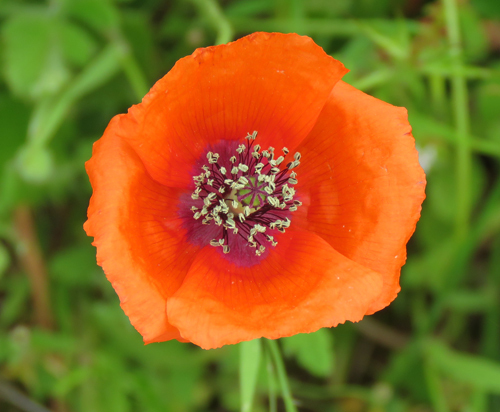 Long-headed Poppies are orange in colour. 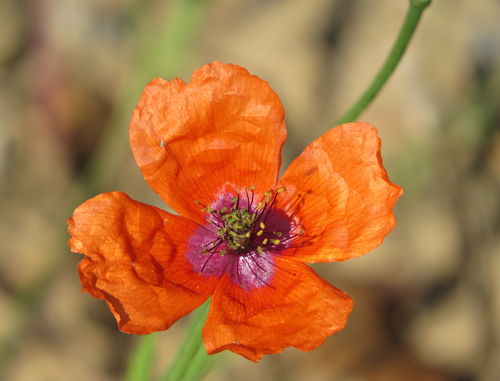 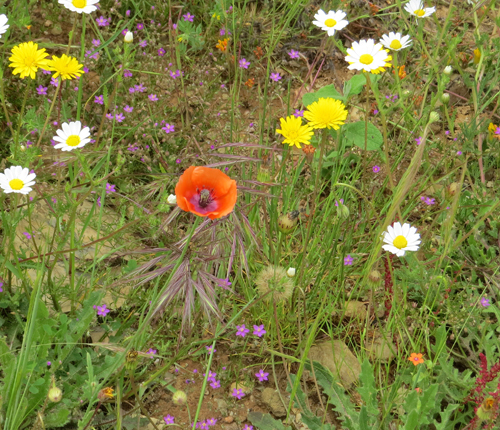 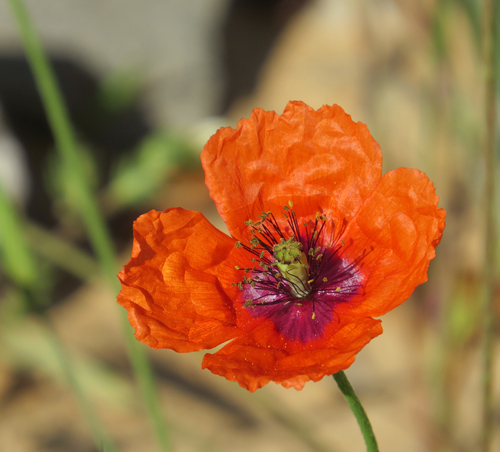 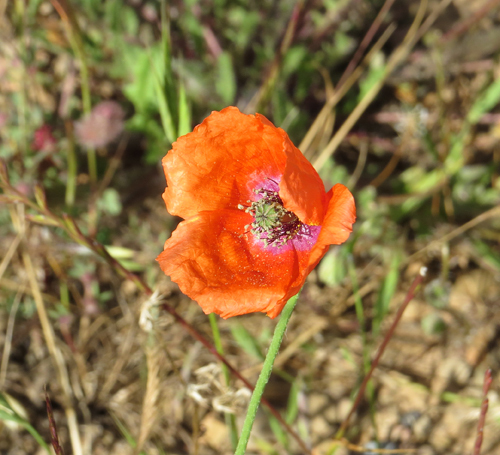 Rough Poppies have much smaller flowers than Long-headed Poppies and they are a deep red colour. 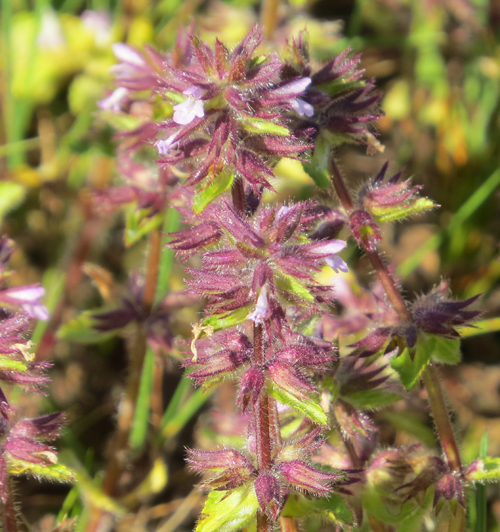 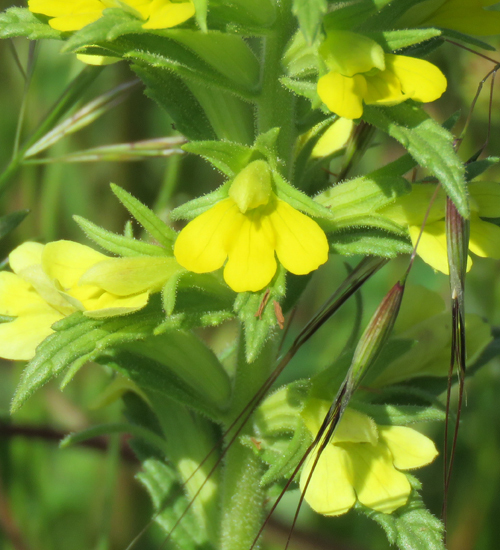 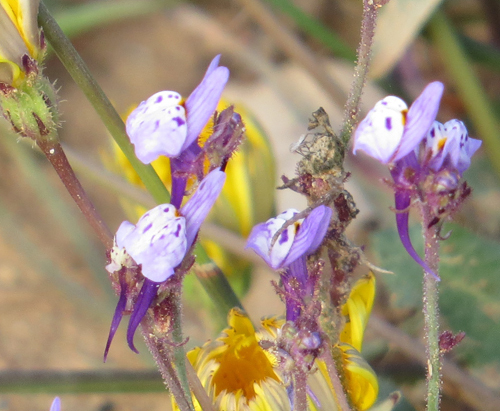 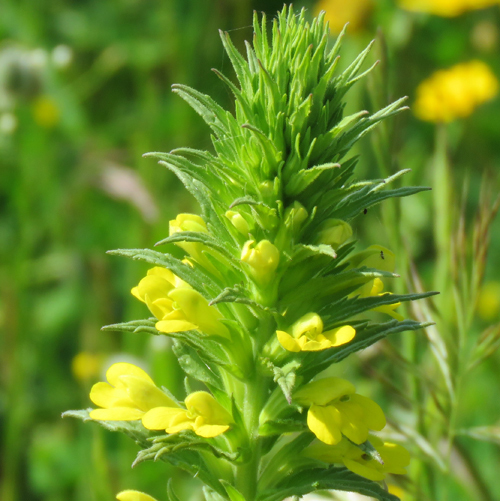 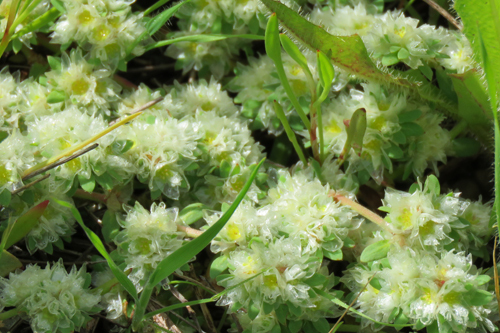 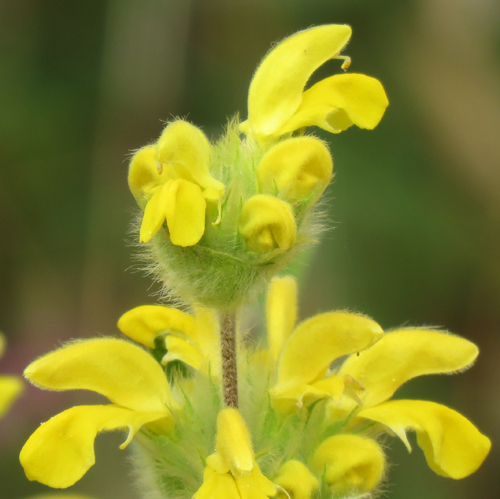 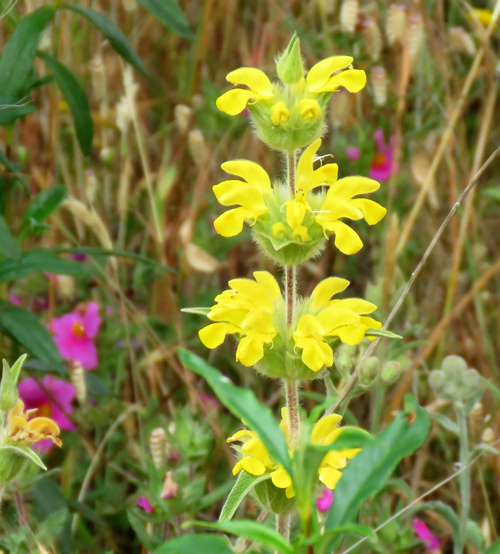 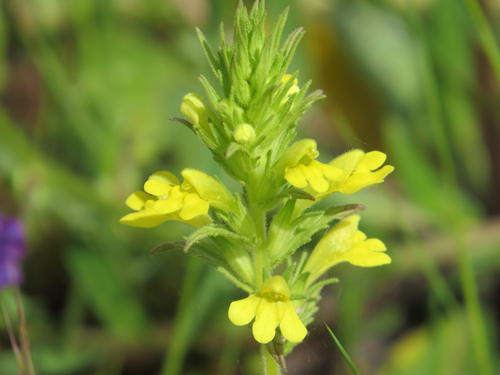 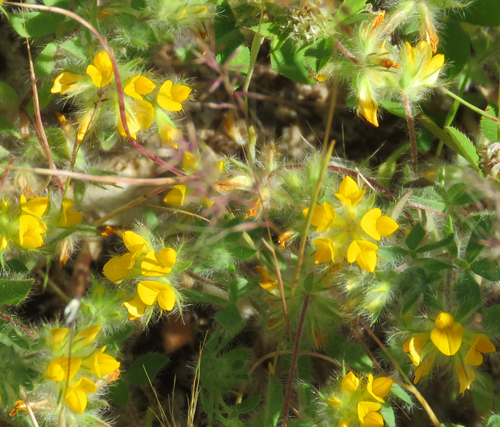 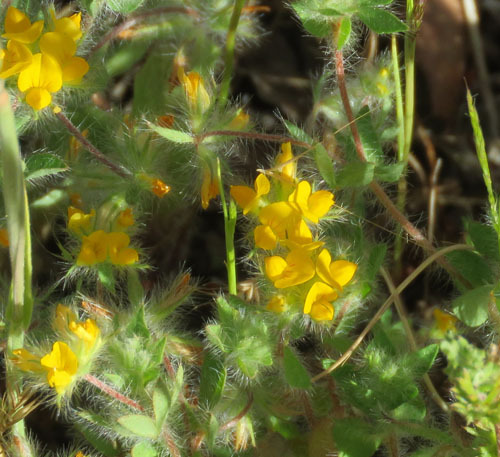 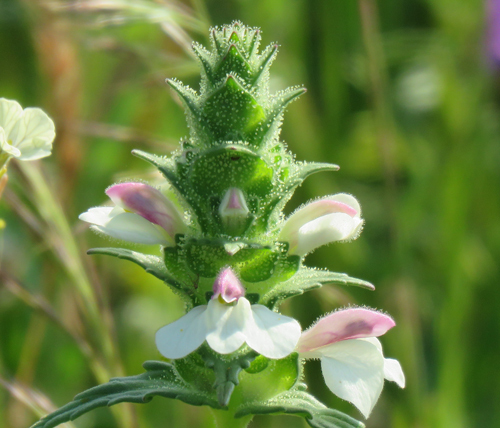 Yellow Bartsia is a semi-parasitic plant. 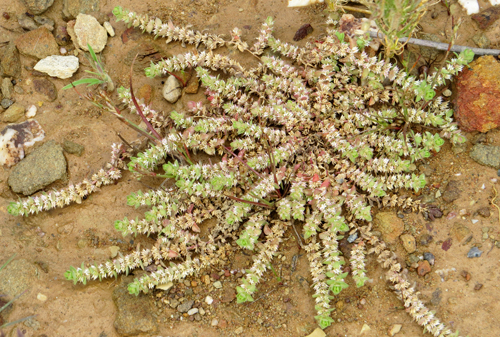 It has root-like organs known as haustoria that it uses to obtain nutrients from the roots of other species of plant. 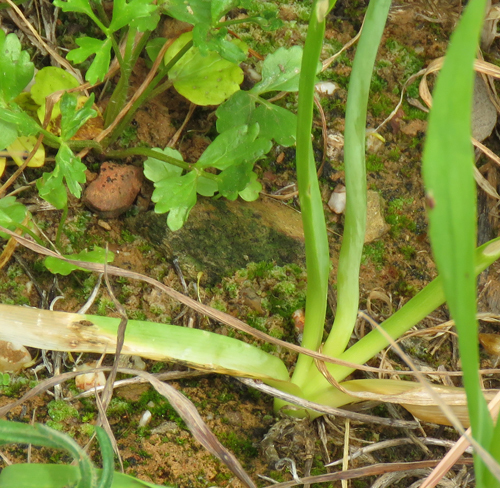 As it is a green plant with chlorophyll, it is also able to make its own food using photosynthesis. 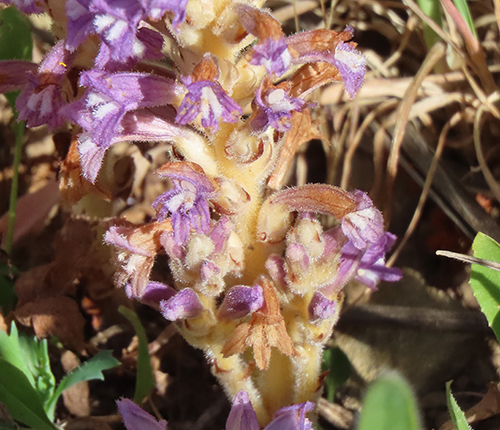 It is a member of the broomrape family. 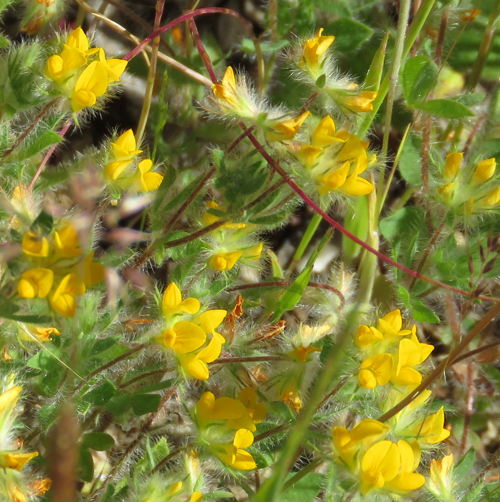 Group of Yellow bartsia plants. 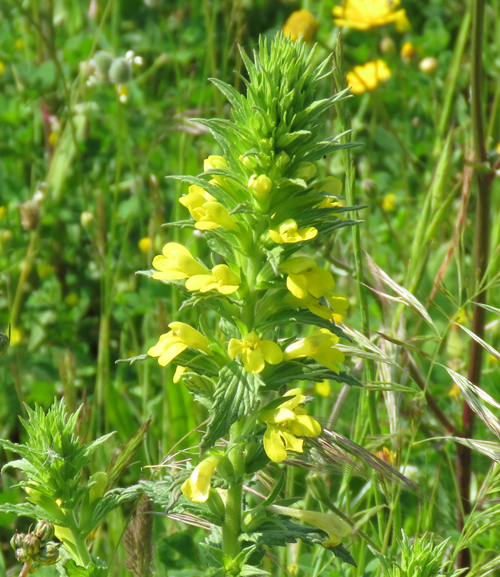 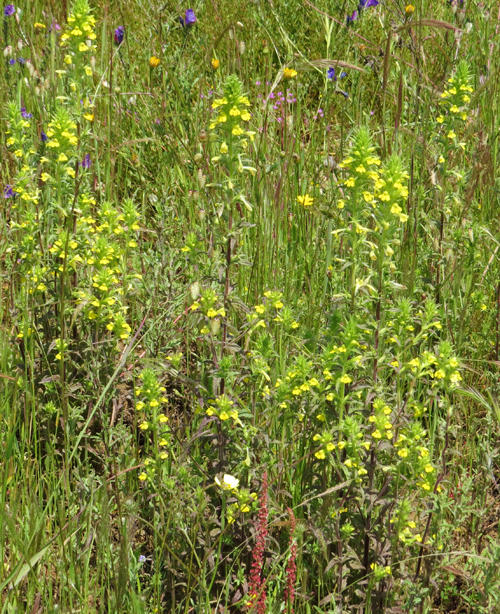 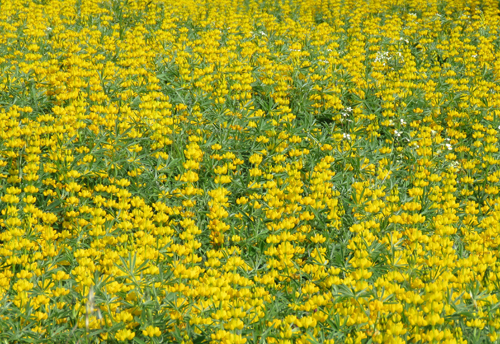 Meadow drift including Yellow Bartsia. 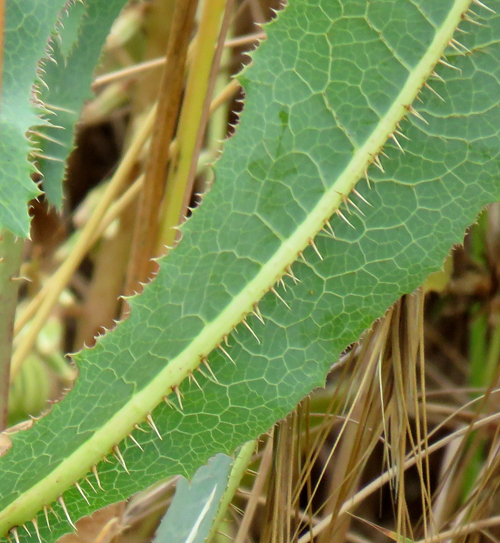 Leaves of Hare's Foot Plantain. 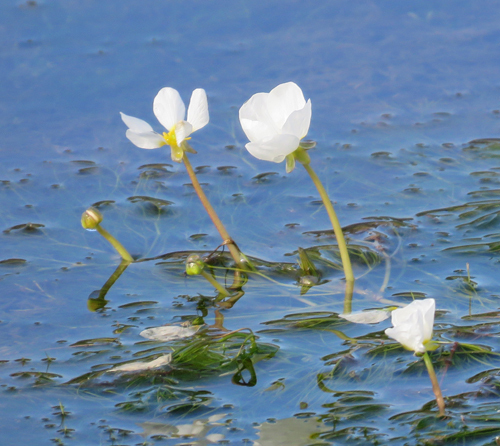 This aquatic plant has submerged and floating leaves. 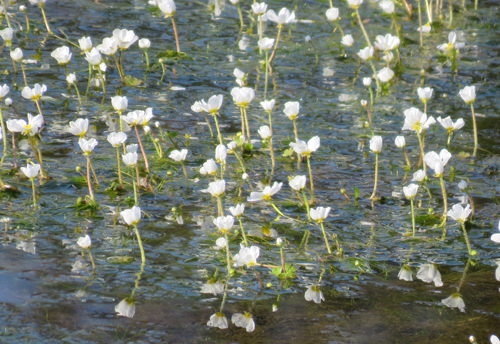 This photograph shows the long, flowing submerged leaves (when water level is higher). 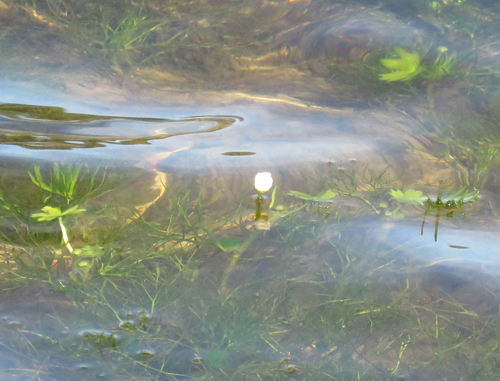 This photo shows both the floating leaves at the surface and the long, filamentous submerged leaves under the water. 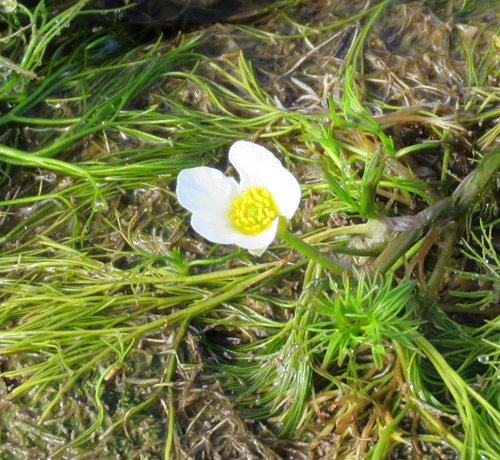 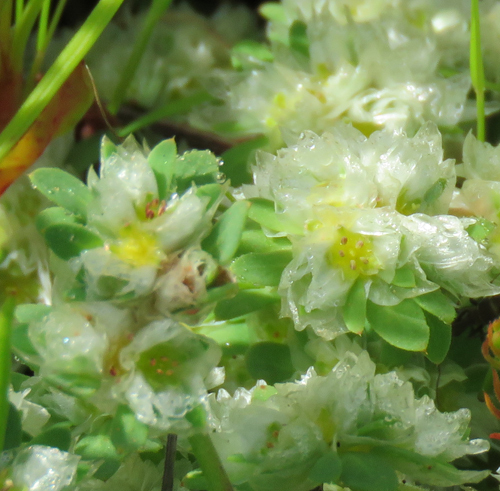 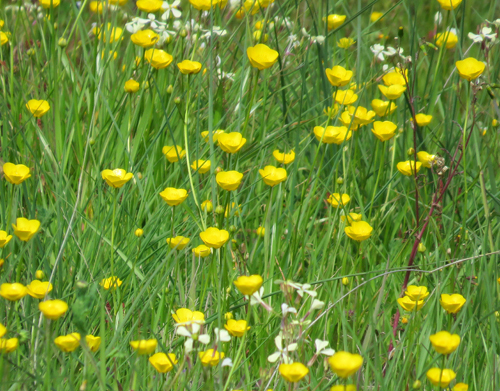 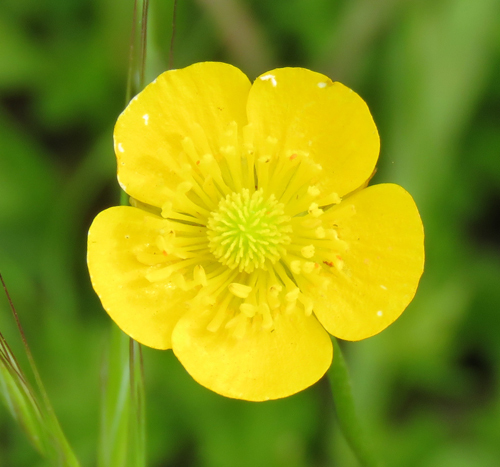 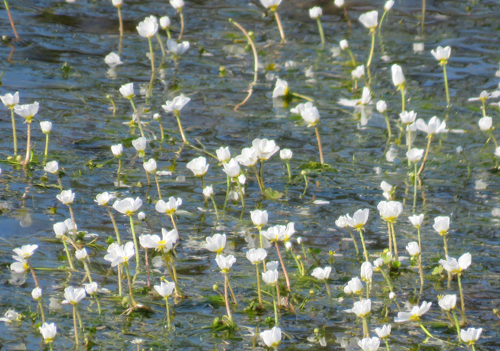 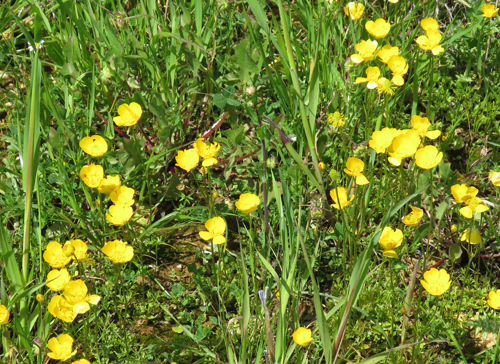 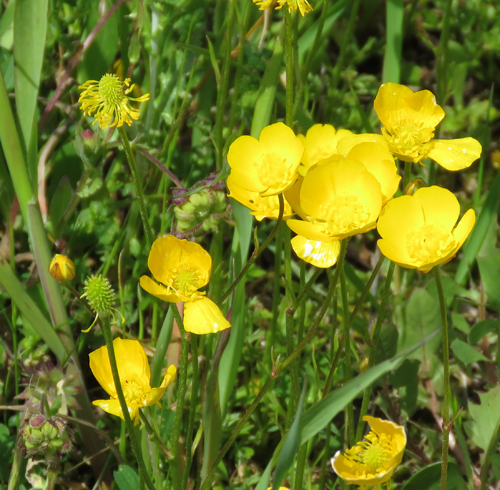 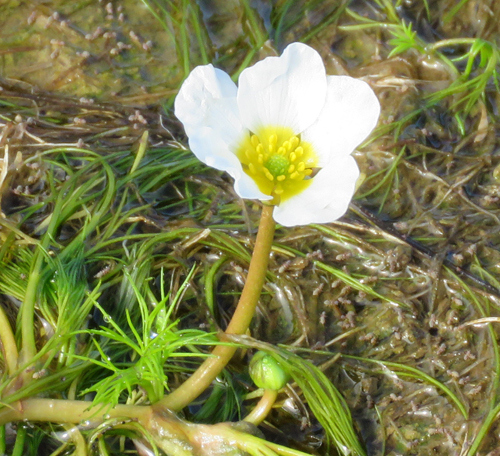 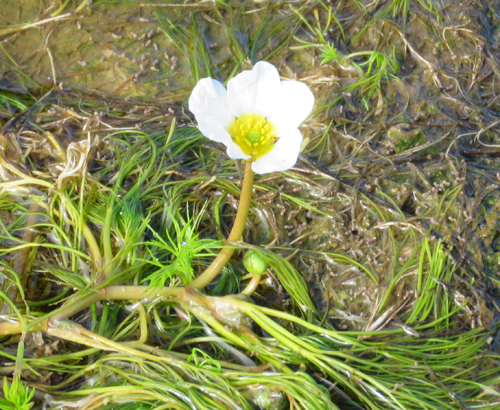 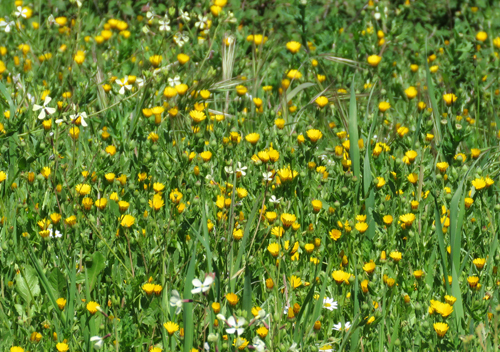 The Stream Water-Crowfoot is a member of the Buttercup family. 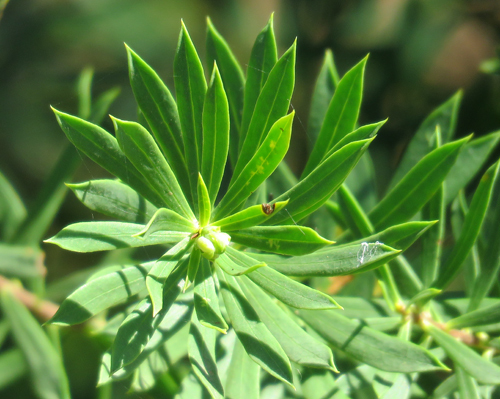 The basal lobes of the leaves characteristically turn upwards. 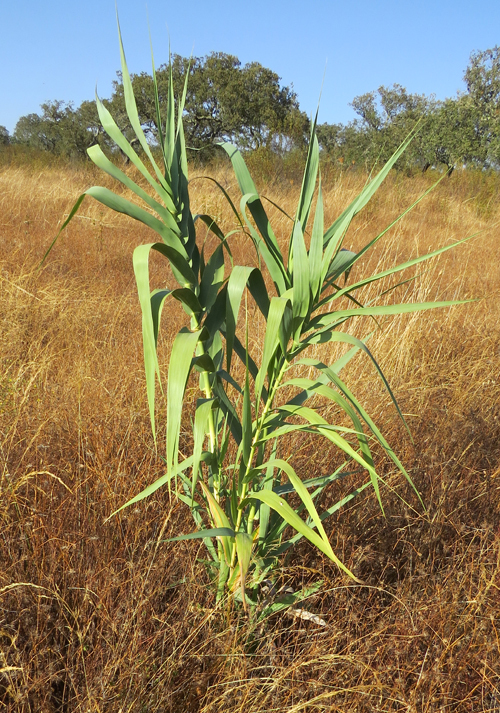 A tall plant - up to 120cm (4 feet). 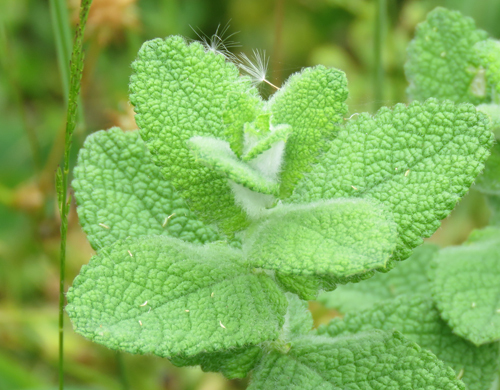 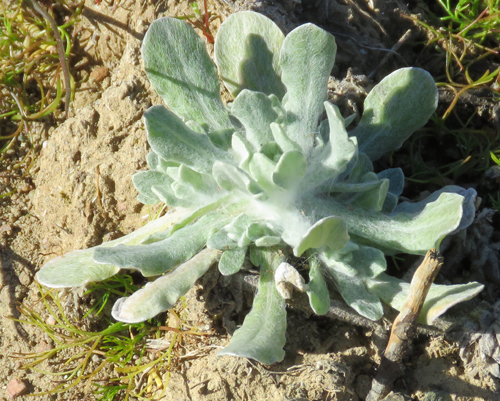 It is presumed that the Northern Dock is native to Portugal. 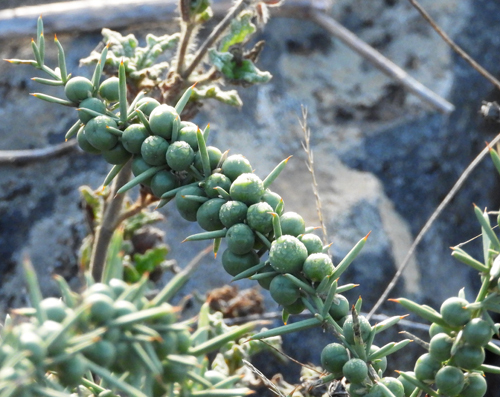 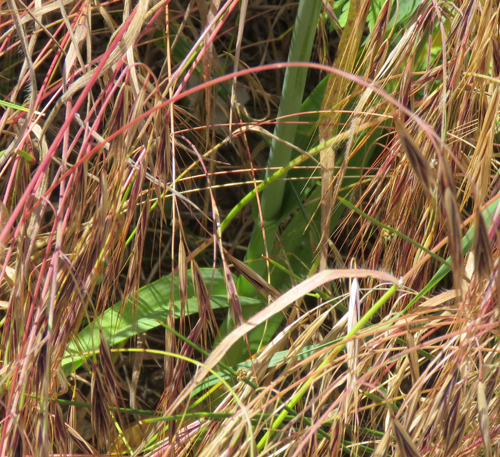 Note coiled seed pod on centre left of photograph. 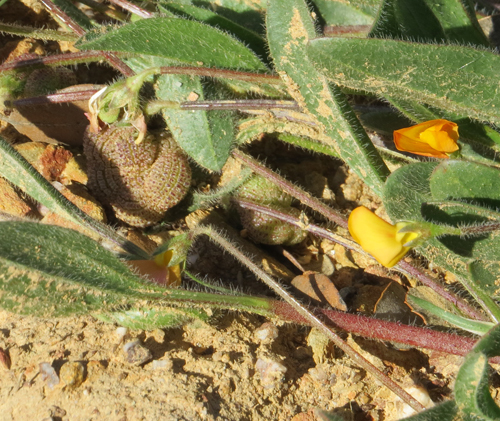 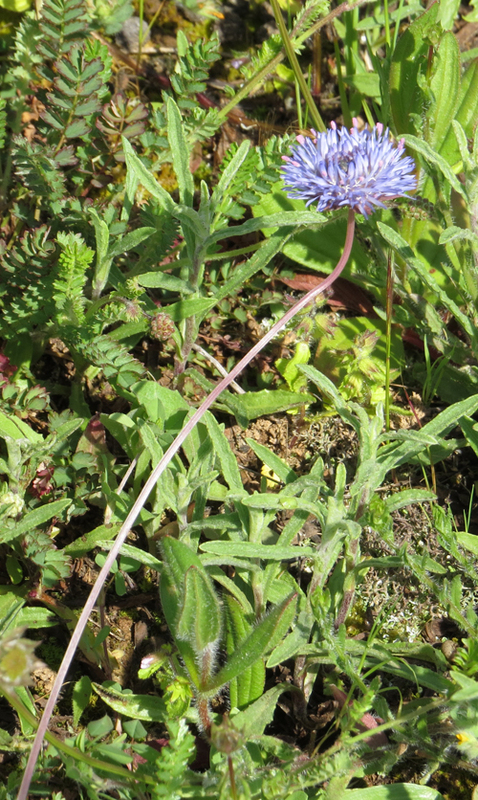 Note coiled seed pod on bottom right of photograph - which supposedly resembles a caterpillar. 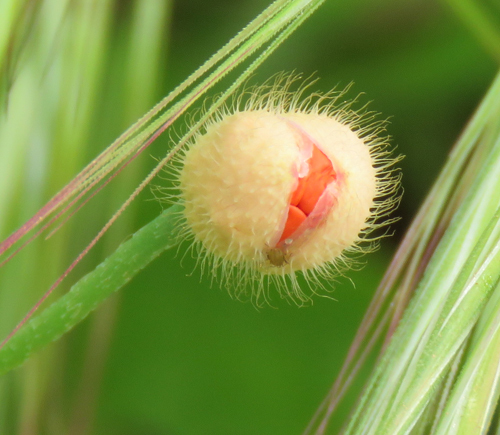 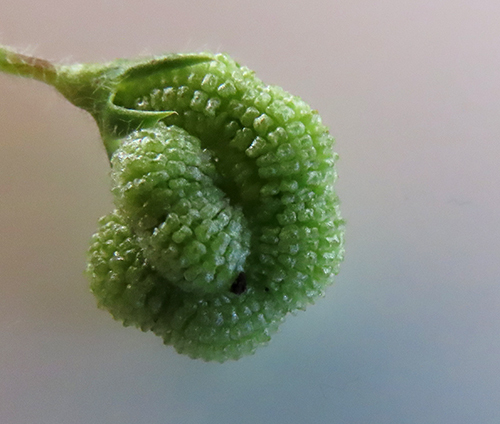 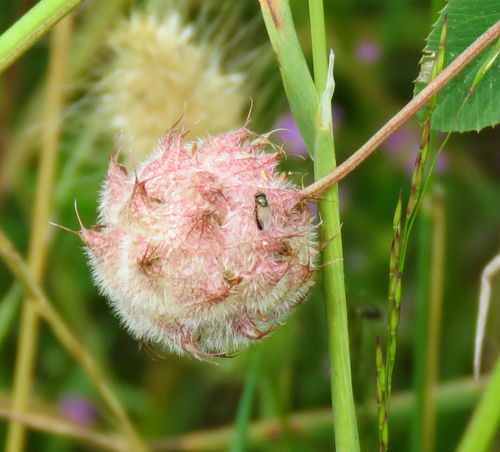 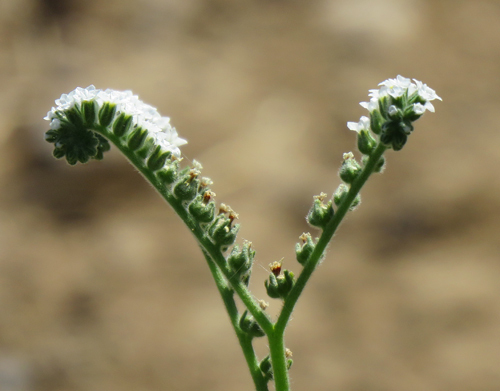 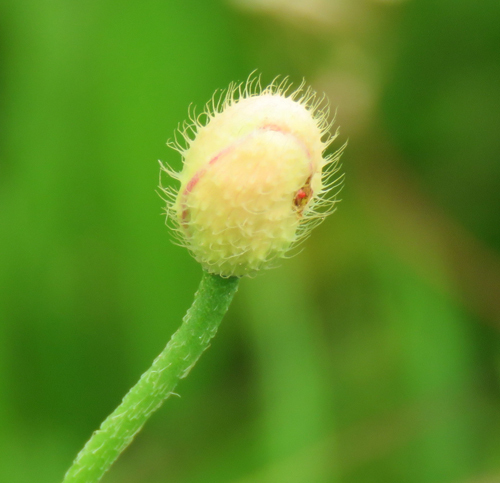 The resemblance of this plant's seed pod to a Caterpillar gives it its English common name. 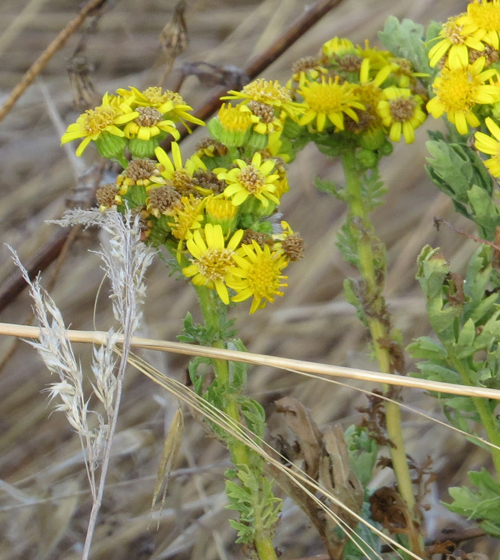 Common Ragwort flowers are an important nectar source for butterflies such as Small Coppers. 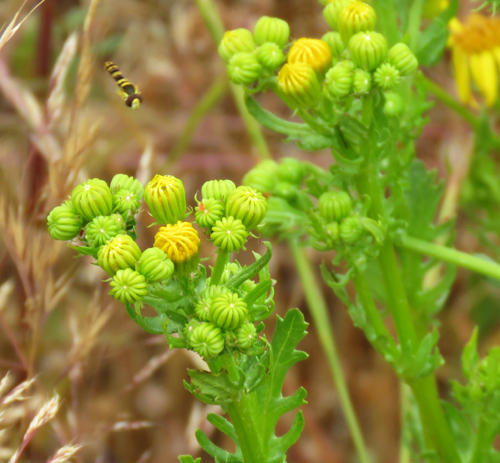 Cinnabar Moth caterpillars feeding on Common Ragwort. 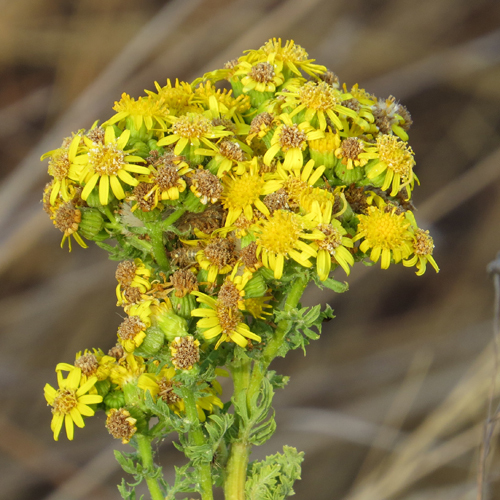 These caterpillars become toxic to other animals when they eat the poisonous ragwort plants which gives them protection from predators. 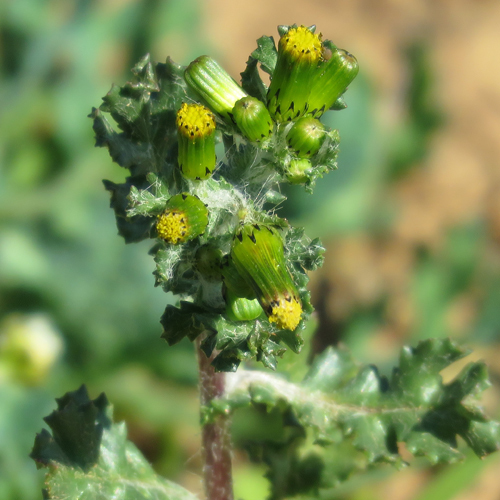 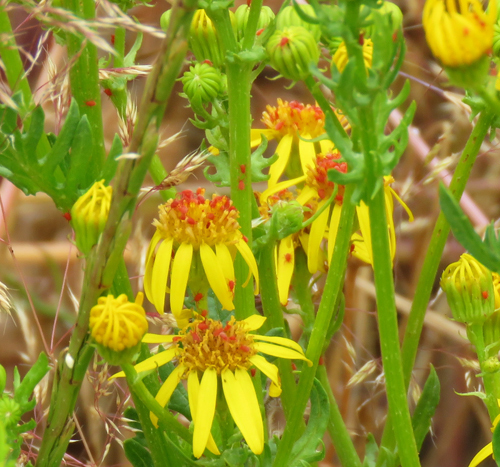 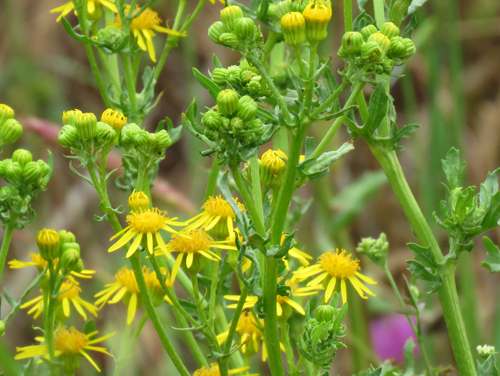 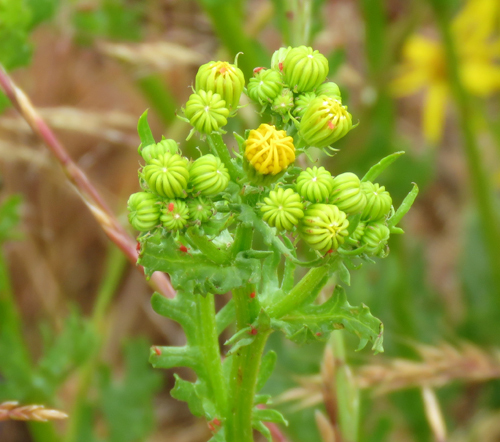 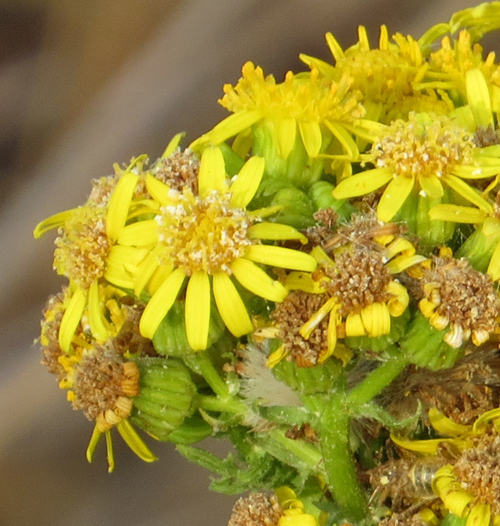 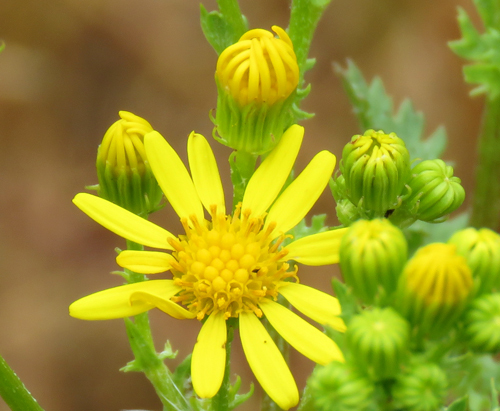 Common Ragwort covered in red mites which feed on the flowers. 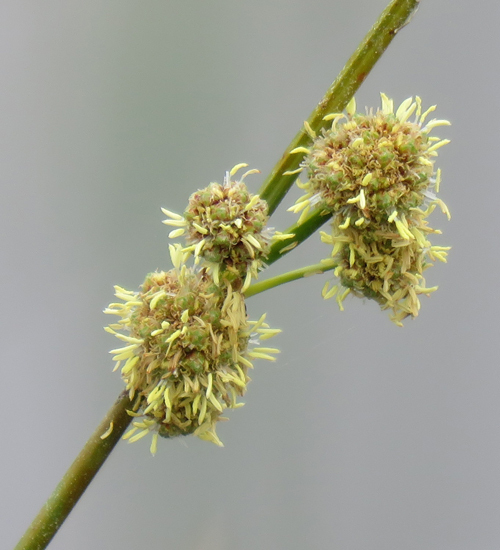 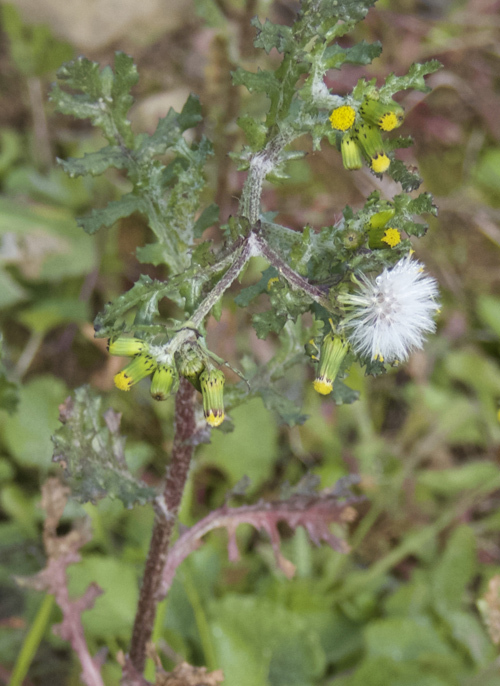 Seed head of Groundsel. 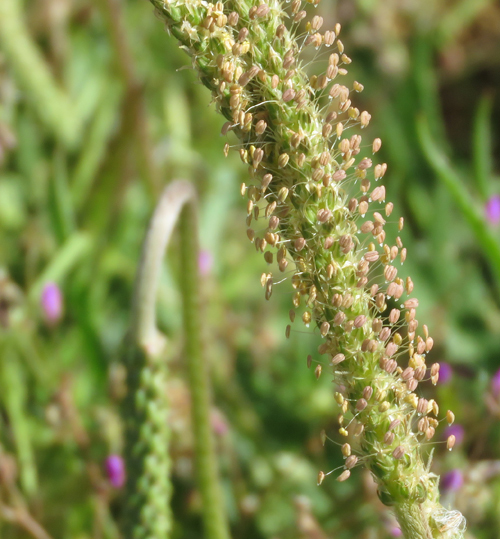 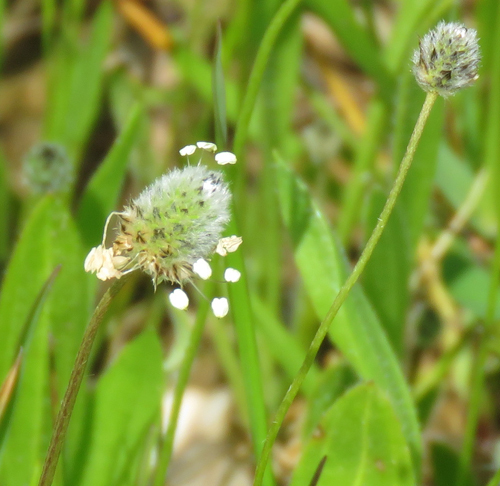 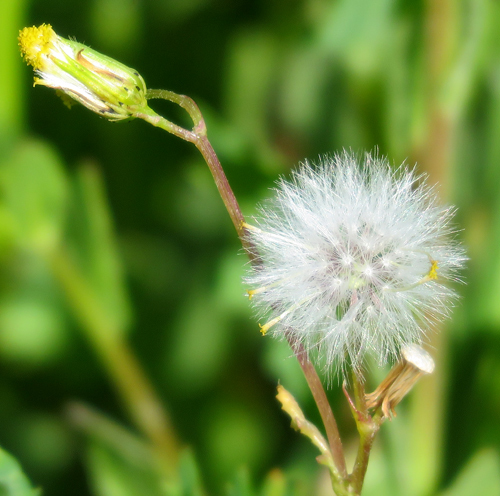 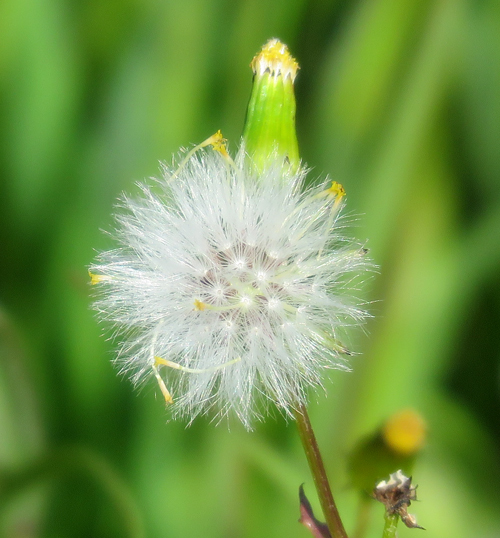 The seeds will be dispersed by the wind or any animals brushing past the plant. 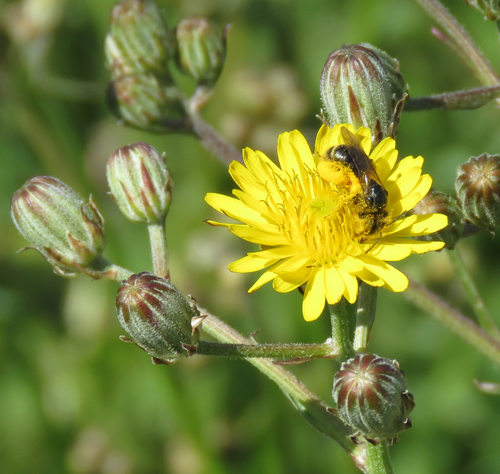 Bee collecting pollen from Smooth Sow-Thistle flower. 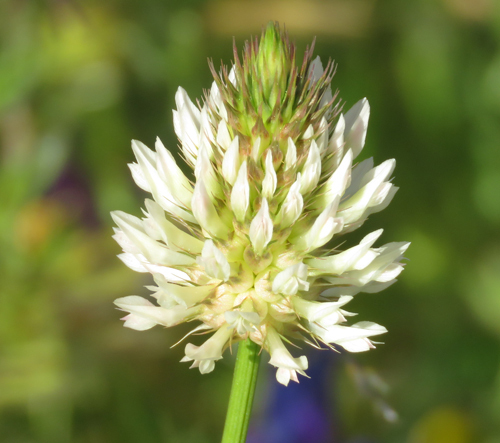 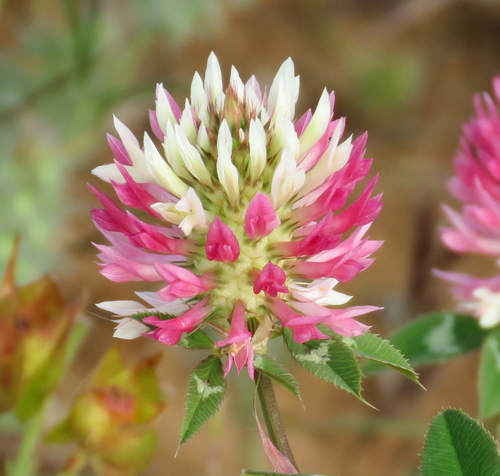 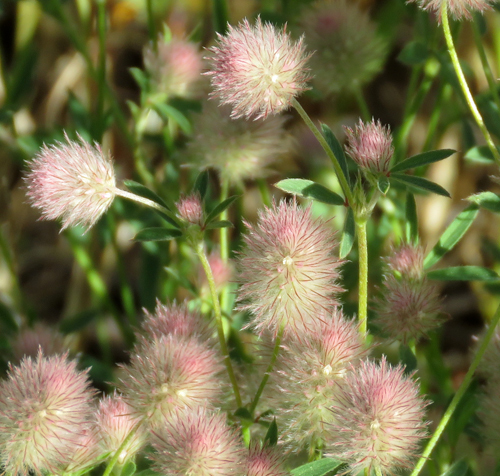 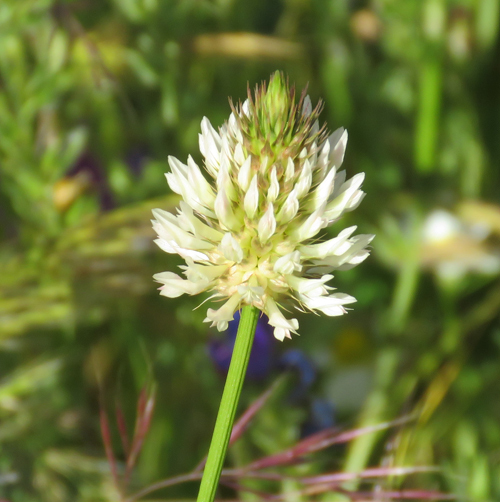 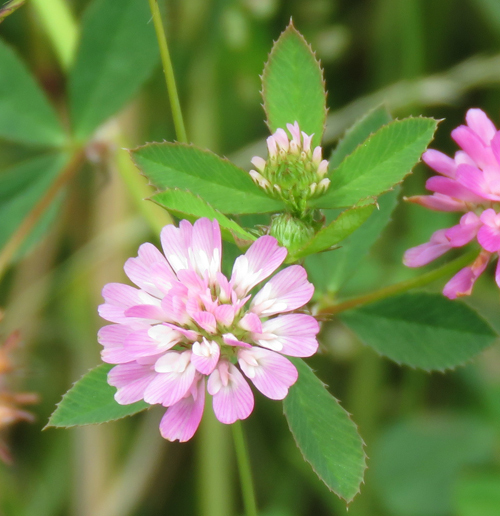 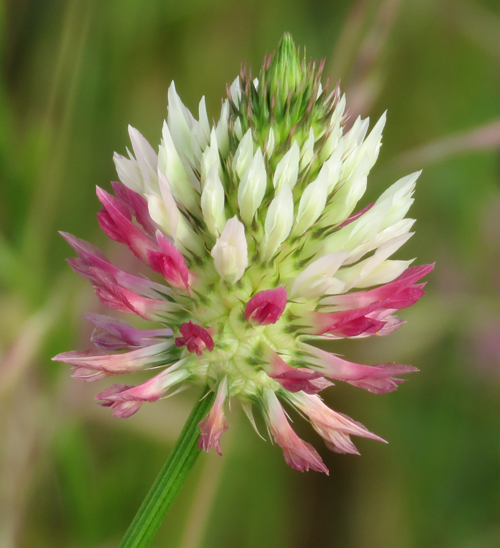 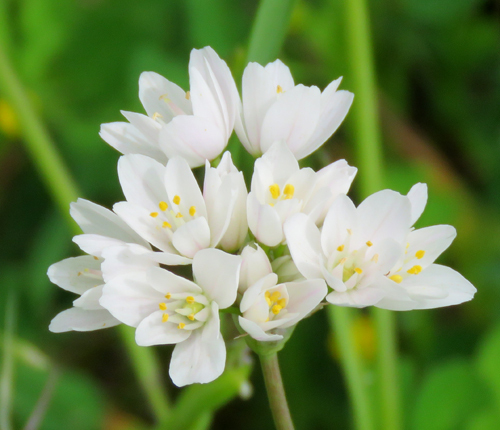 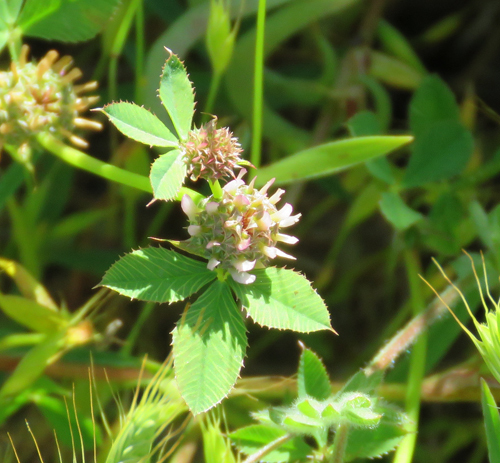 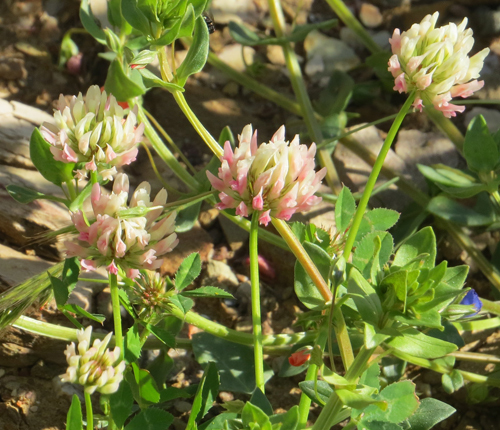 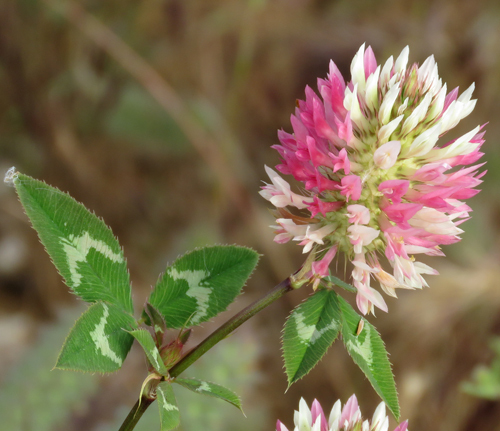 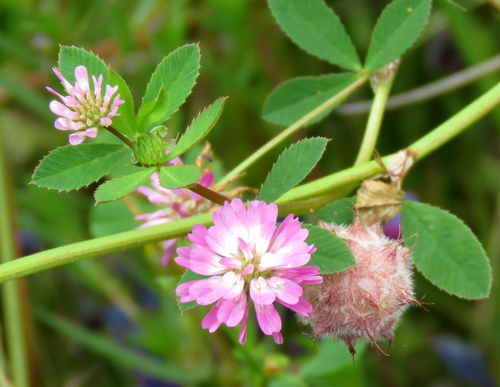 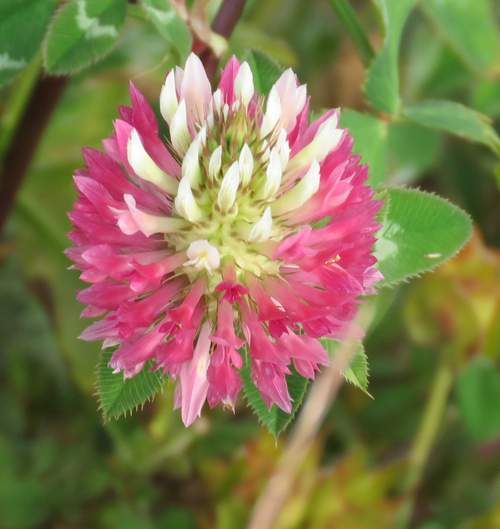 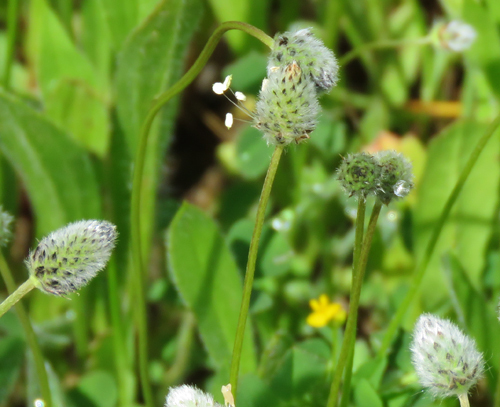 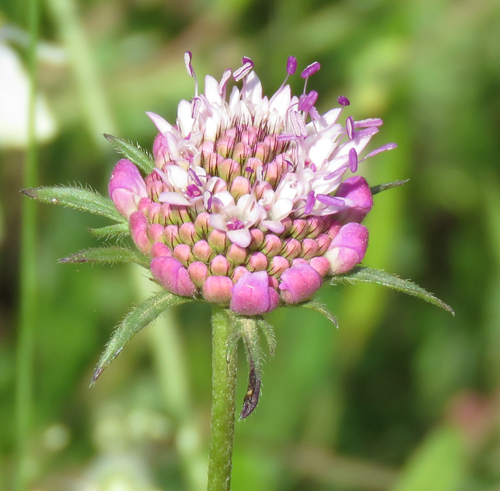 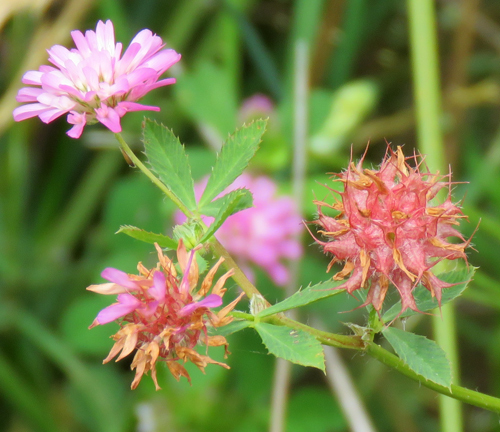 The English name is based on the fact that the flowers are reversed, that is to say upside down when compared to other species of clover. 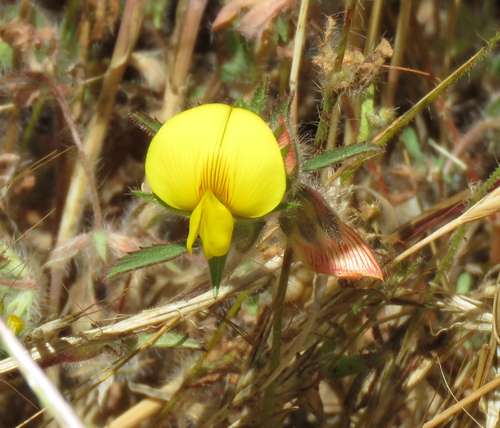 This species is not Native to Portugal. 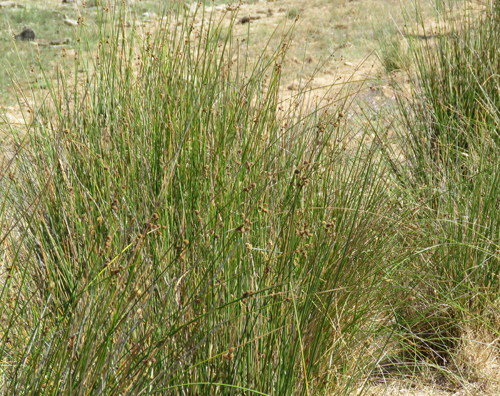 It is an introduced Exotic species. 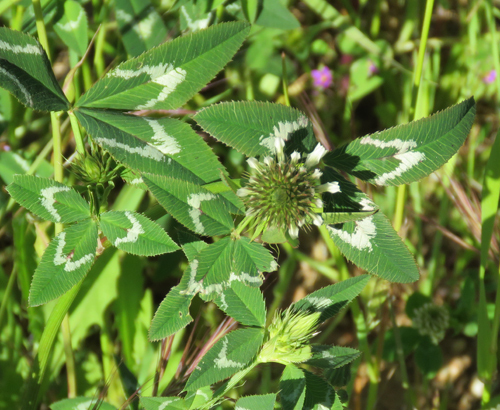 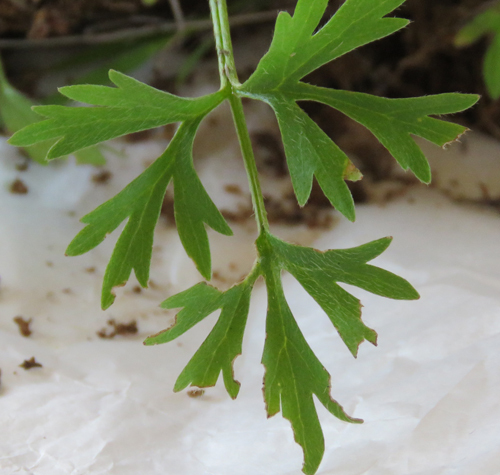 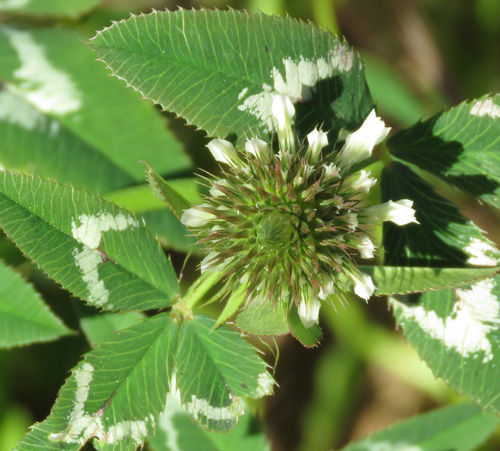 Diagnostic White 'W'-shaped marking on pointed, arrow-shaped, leaves. 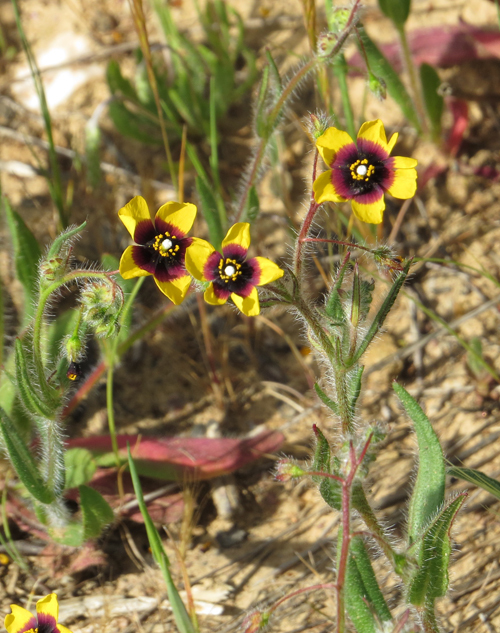 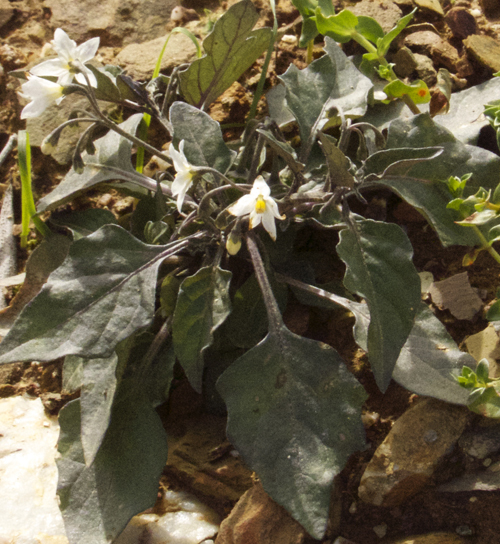 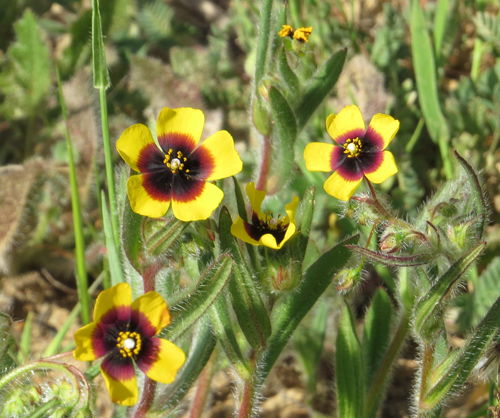 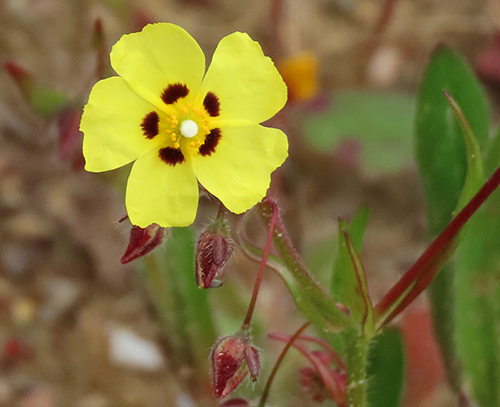 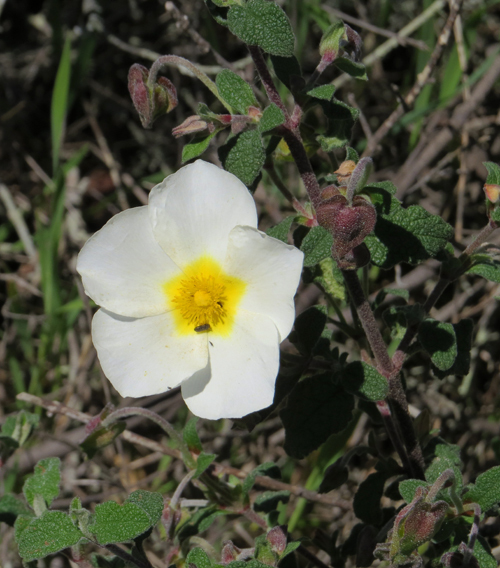 The flowers of the Spotted Rock Rose are highly variable. 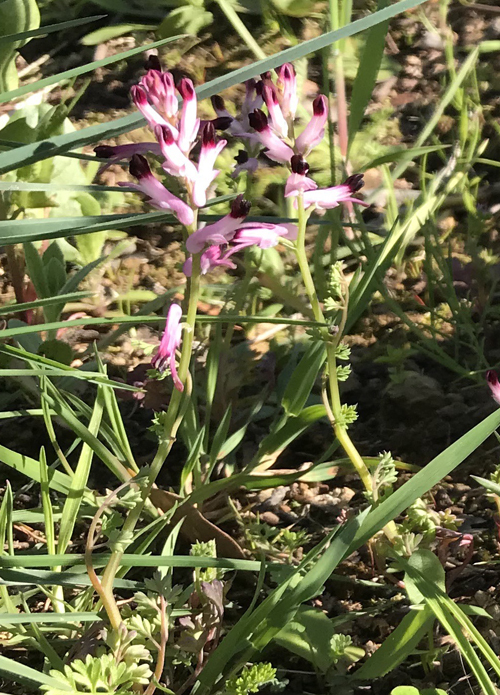 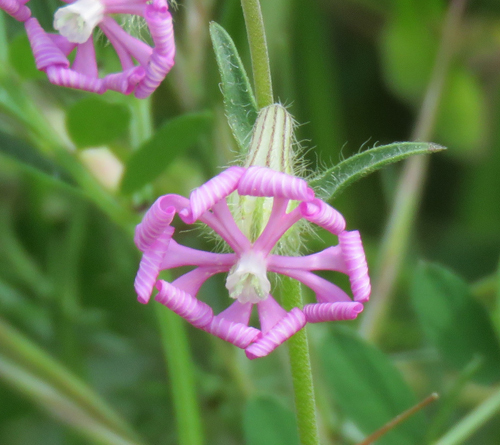 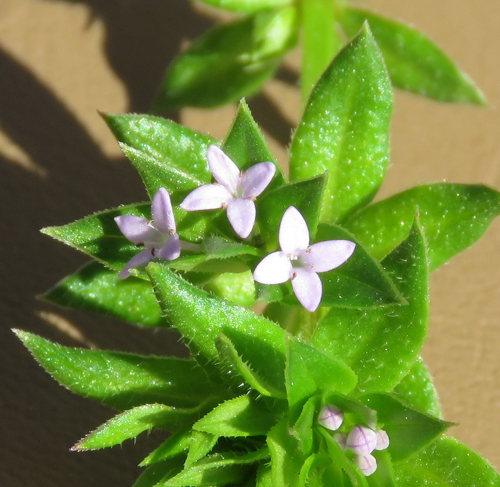 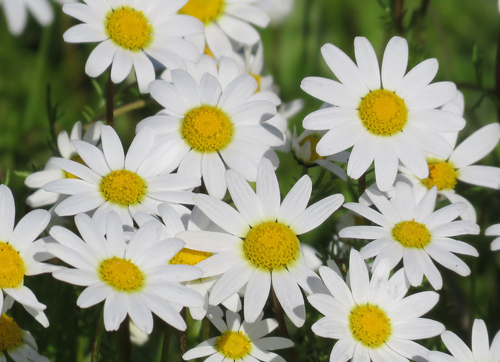 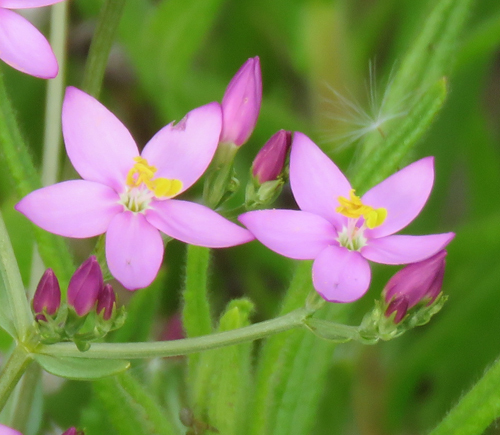 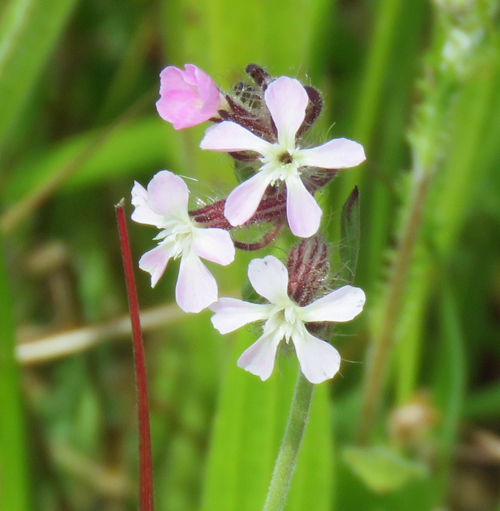 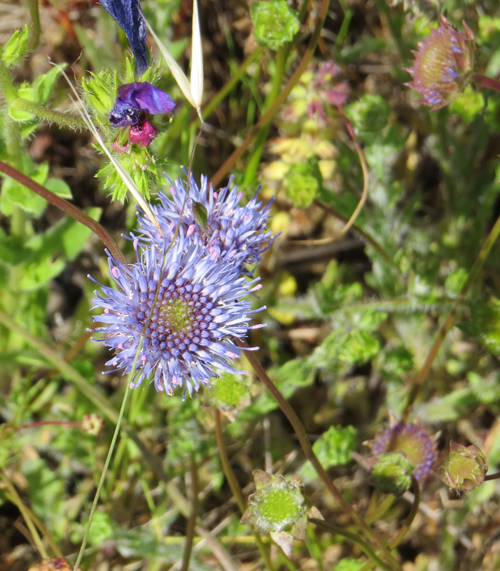 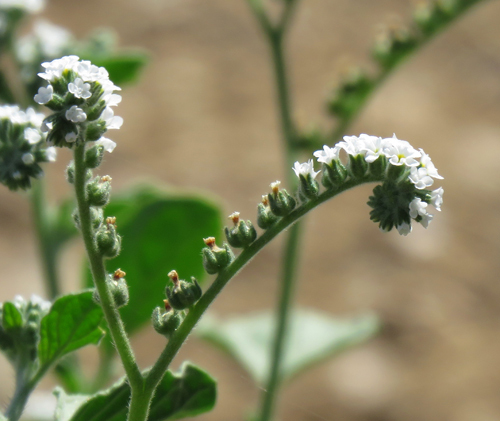 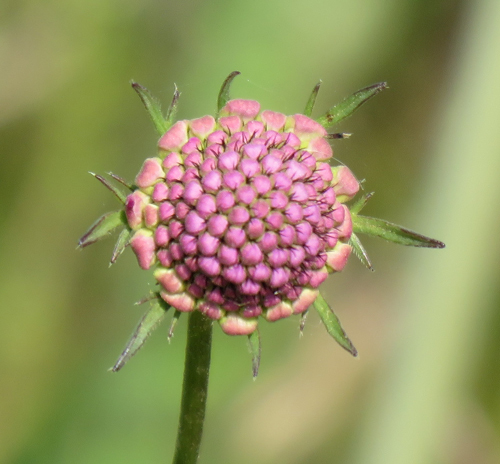 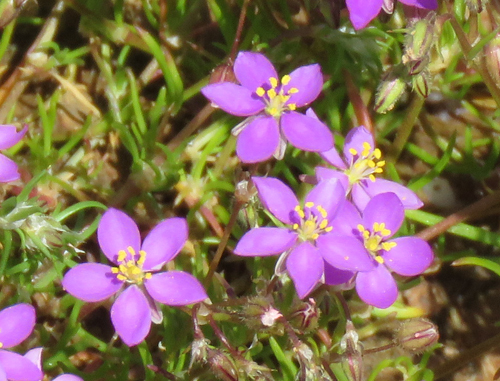 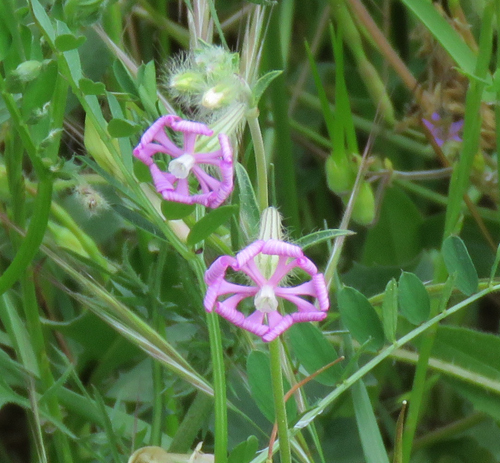 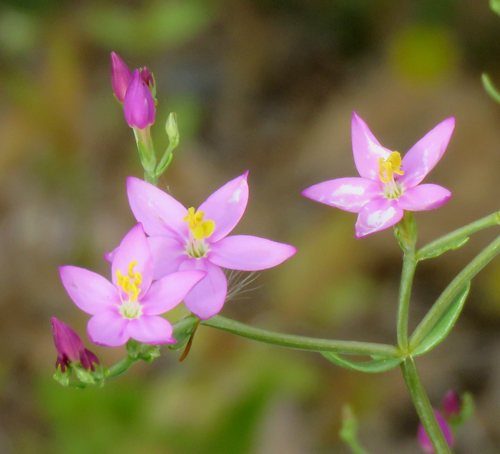 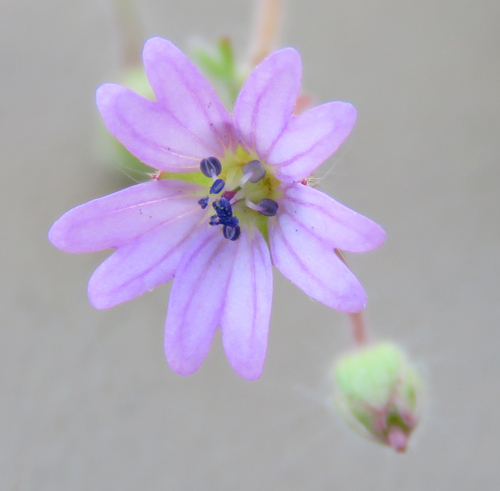 These flowers have very small spots at the base of the petals. 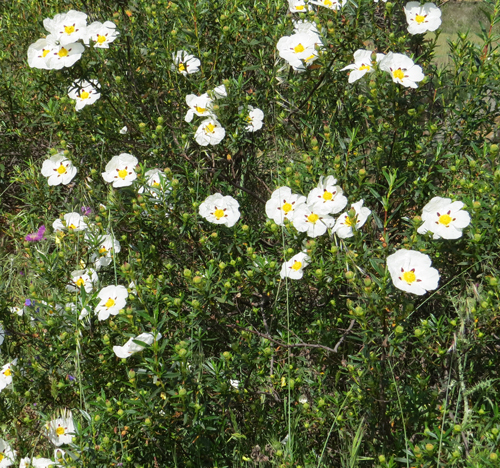 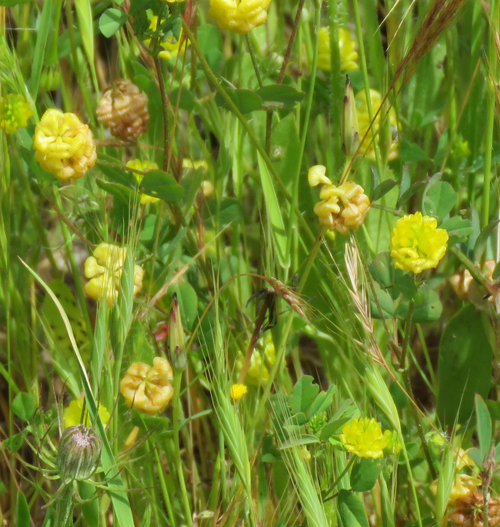 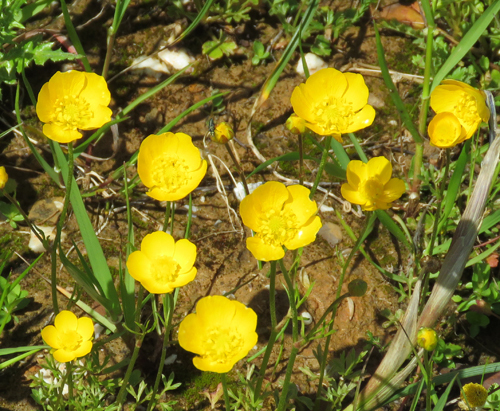 All these flowers are Spotted Rock Rose. 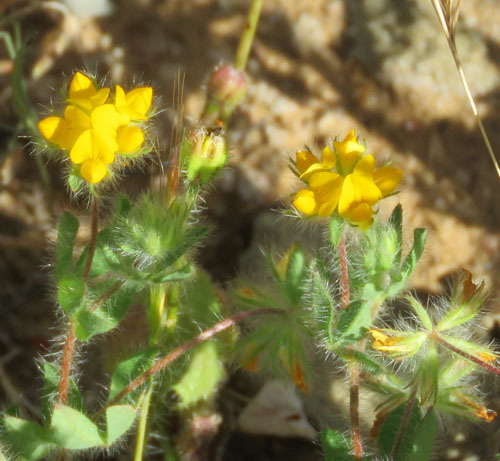 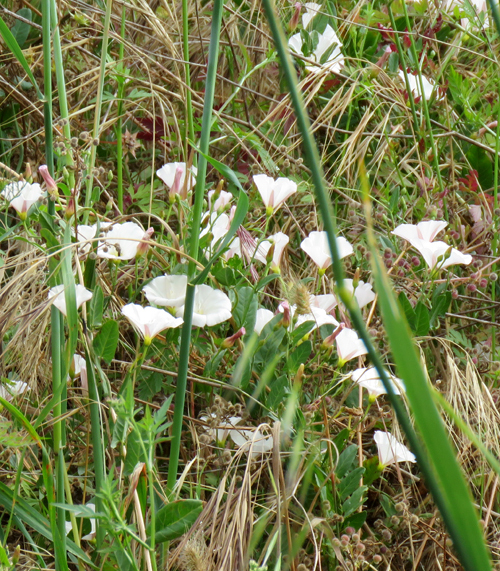 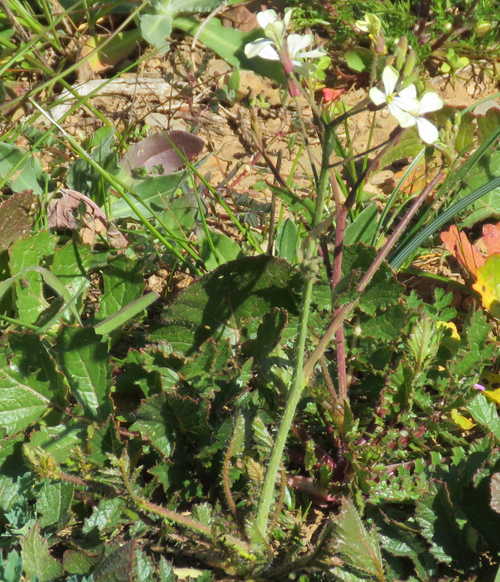 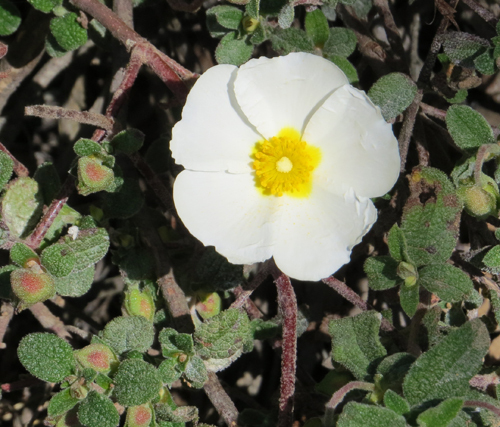 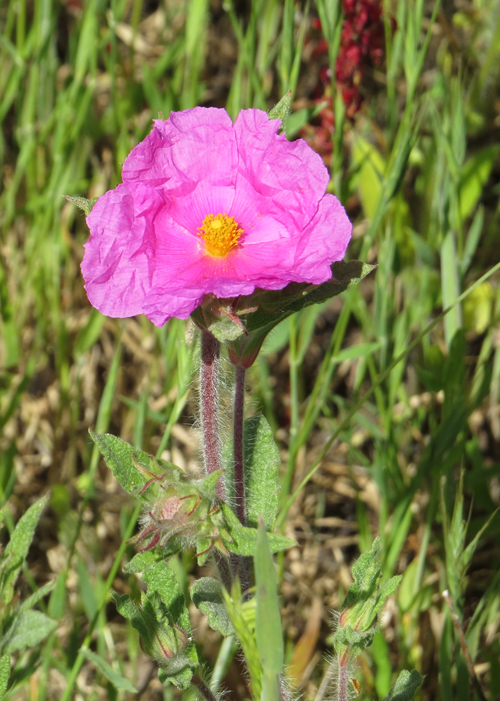 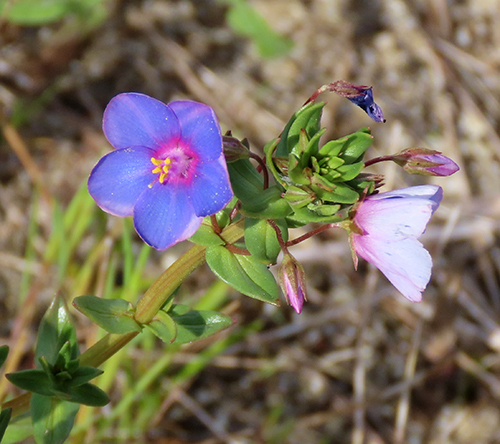 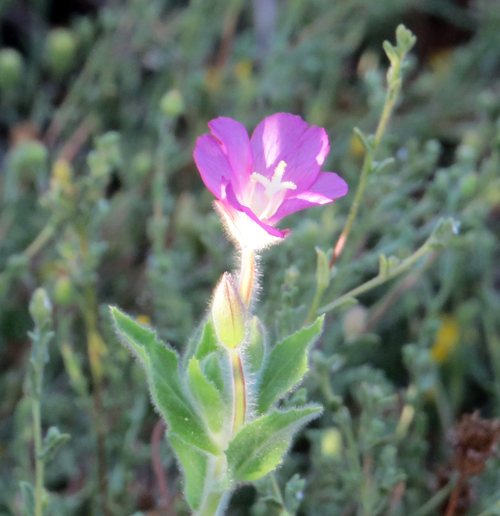 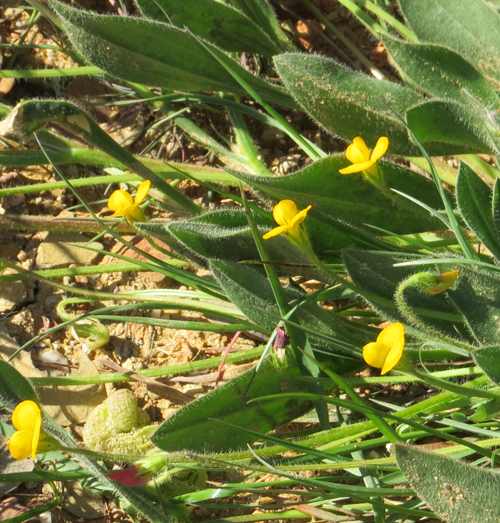 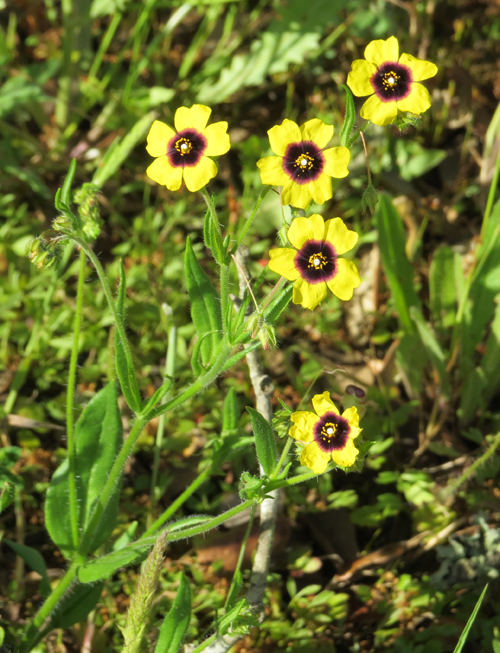 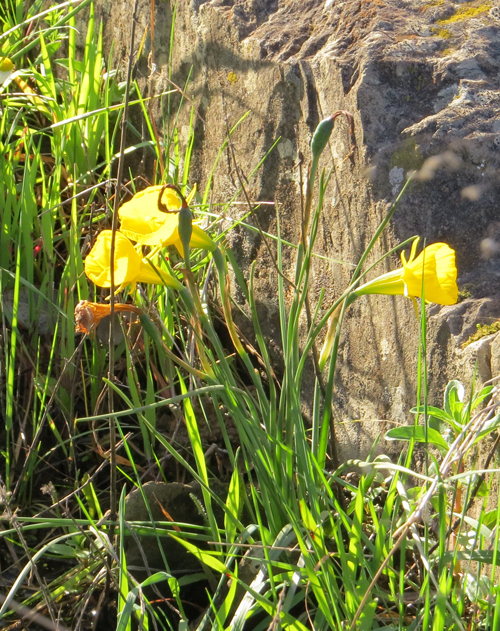 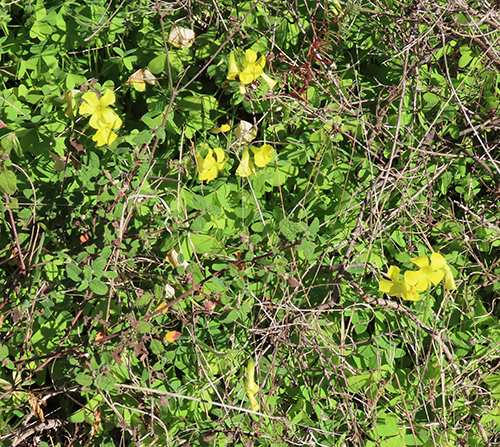 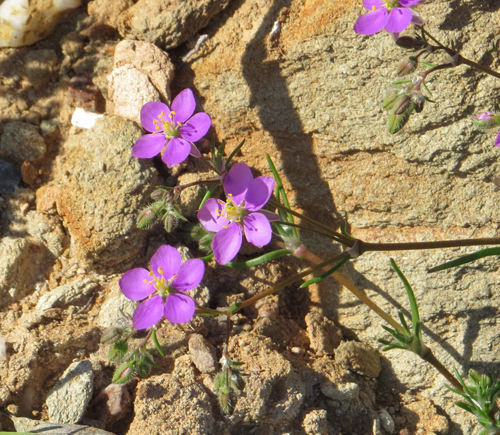 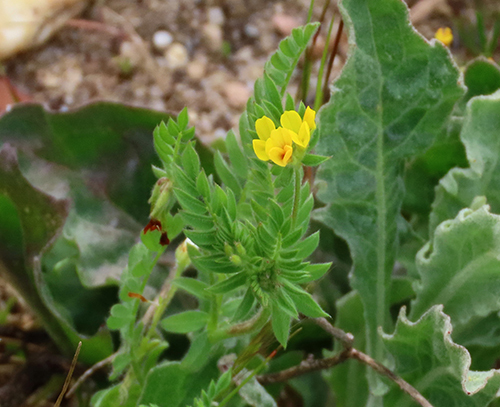 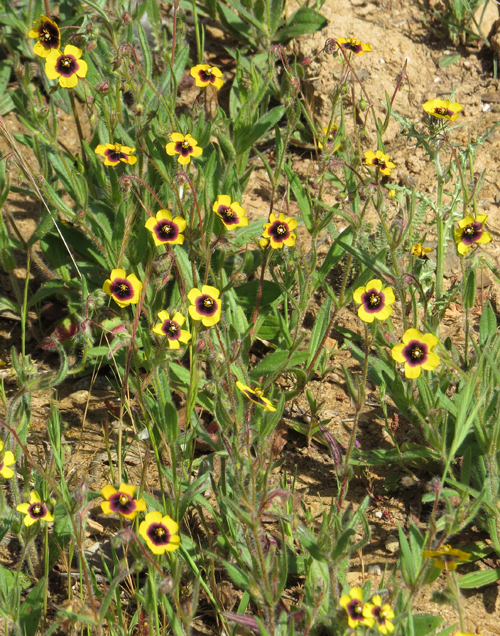 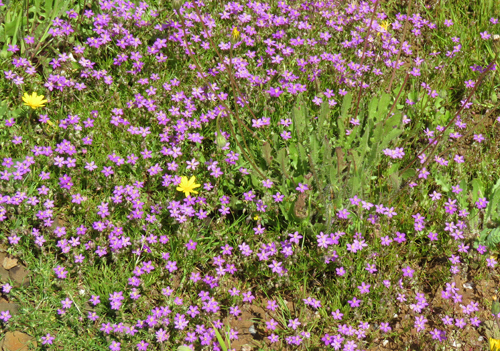 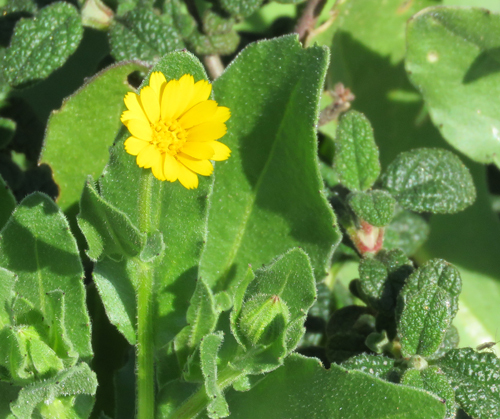 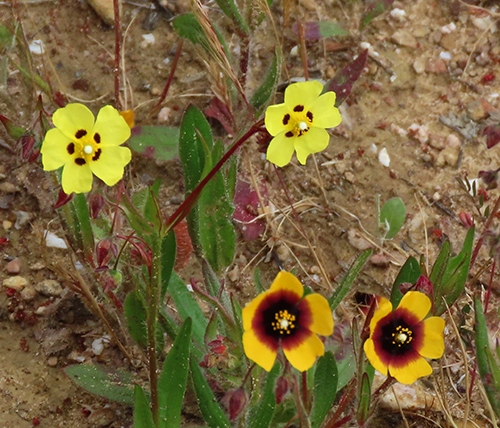 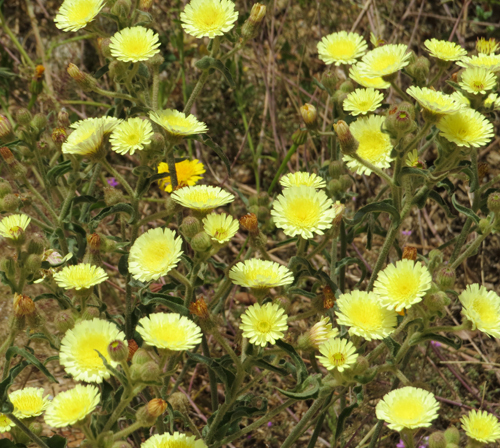 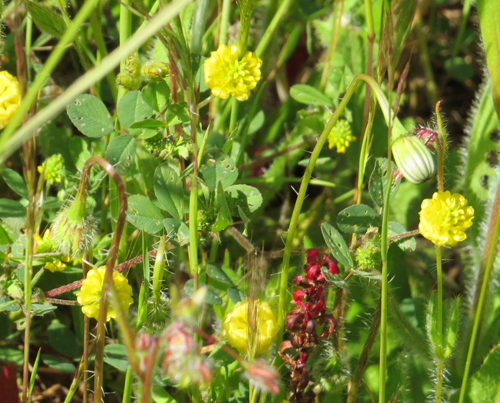 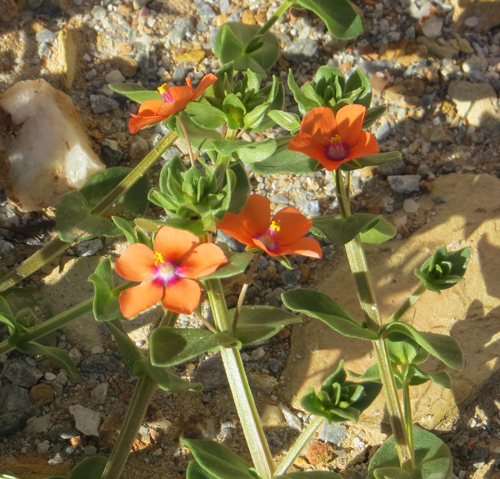 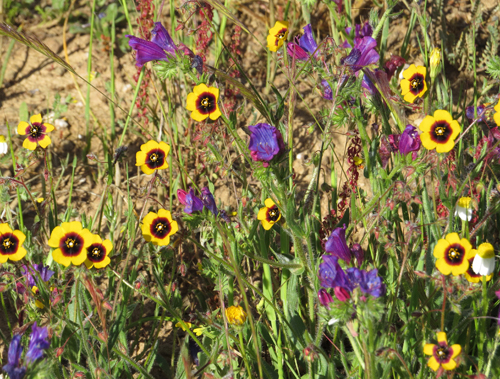 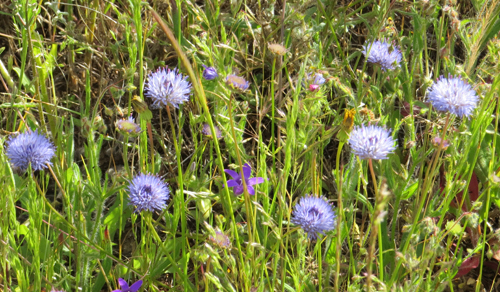 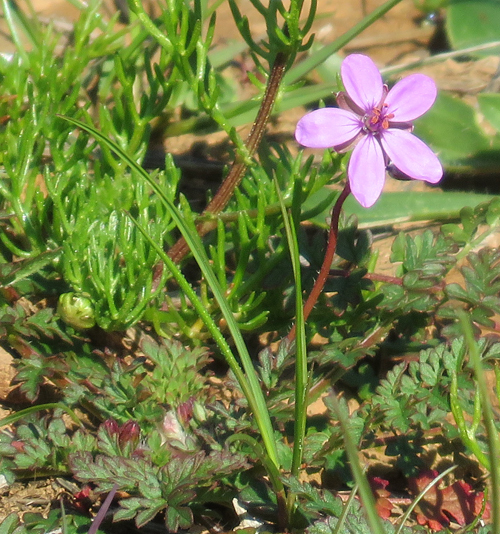 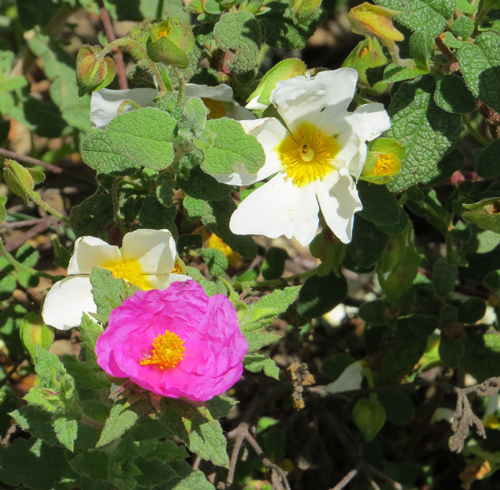 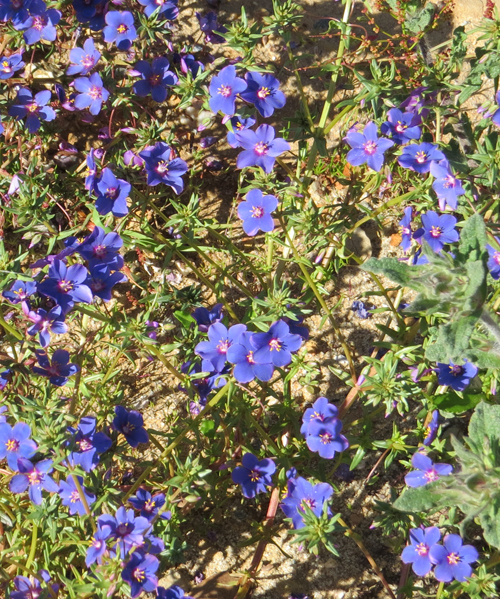 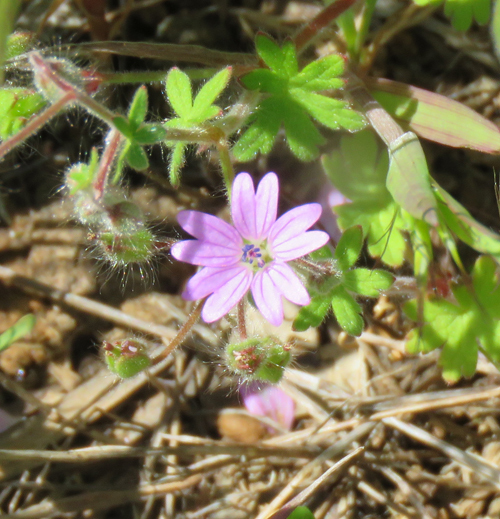 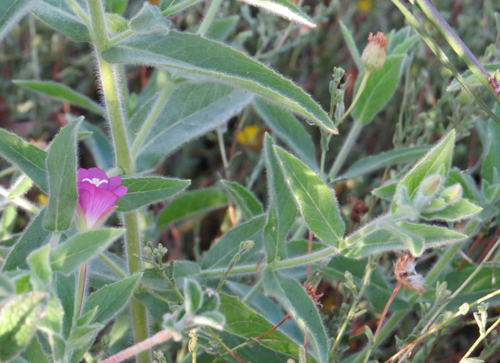 Spotted Rock Rose among variety of other flower species. 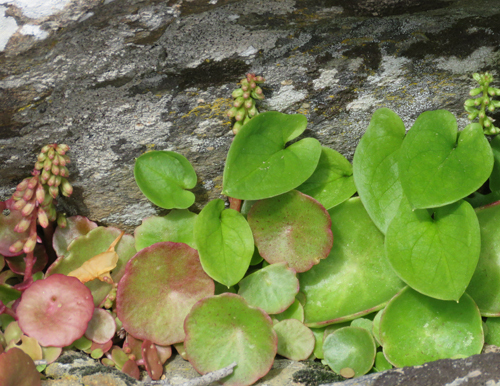 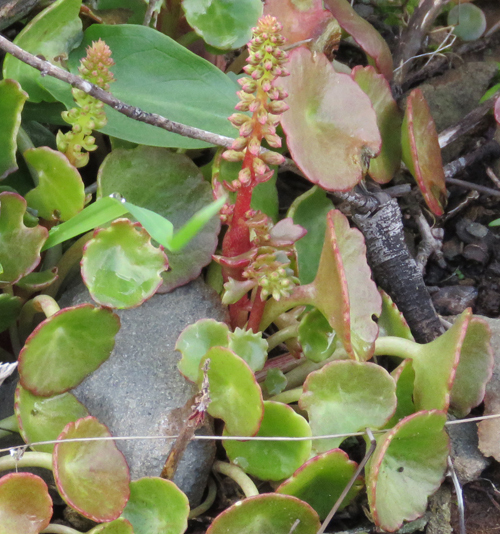 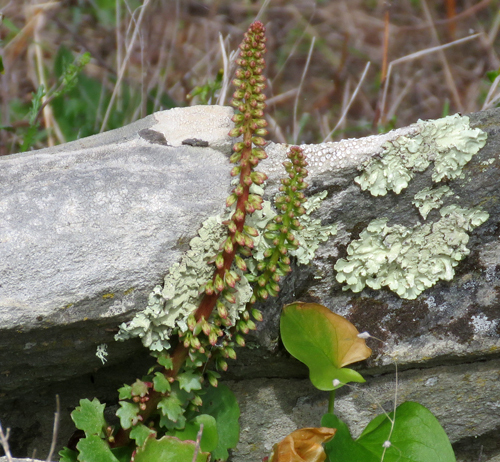 Navelwort typically grows in rocks and old walls. 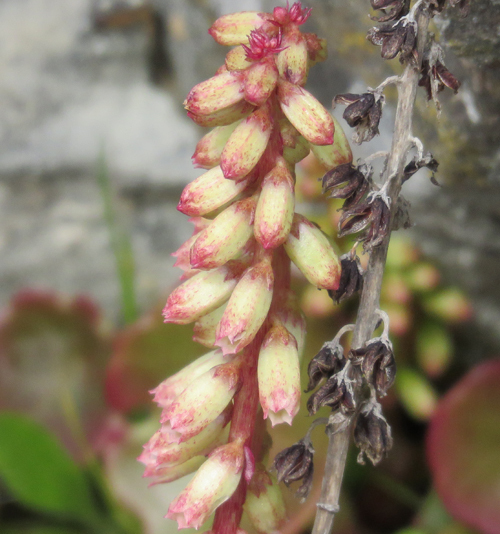 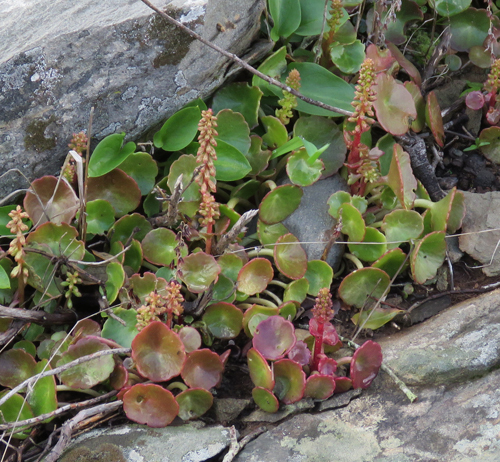 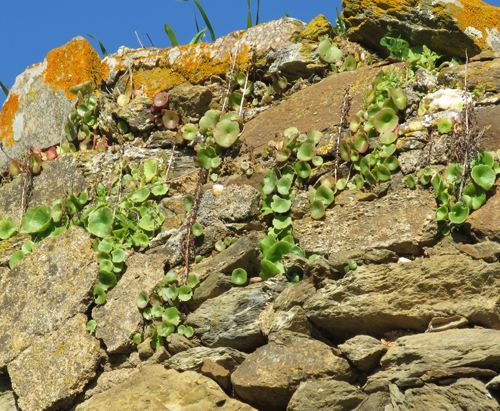 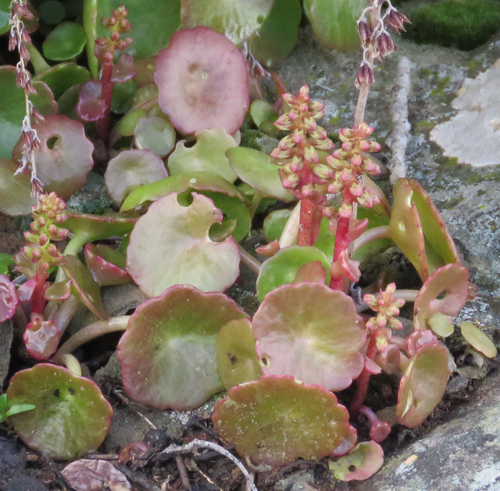 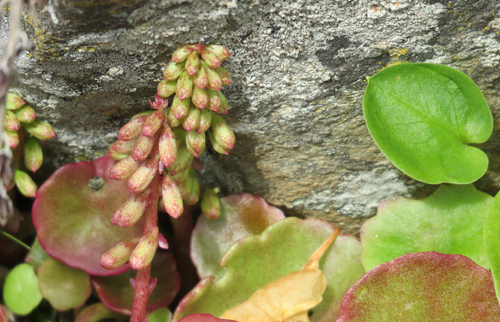 Navelwort growing on top of Windmill ruin. 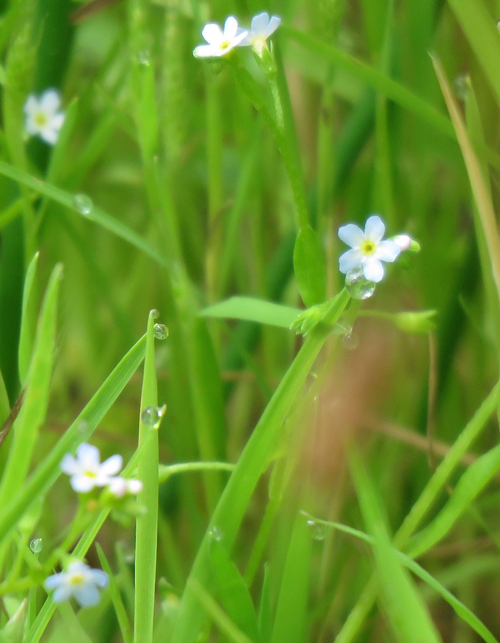 68 Woody Sandwort Minuartia geniculata ?? 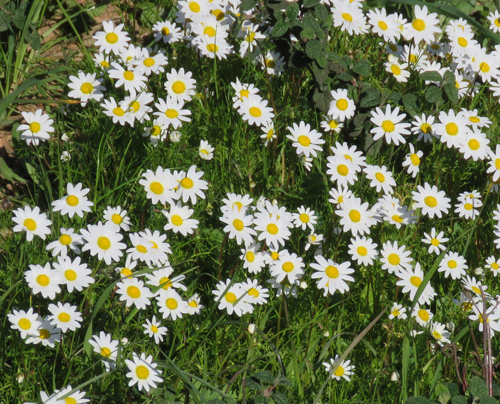 March to ?